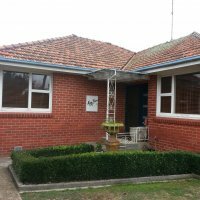 Phone Lance on: 0488 937 837 or our office on (03) 5339 9524 for any further information. 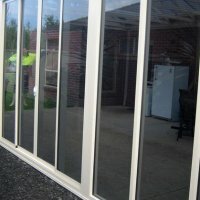 FREE NO OBLIGATION QUOTE'S - WE COME TO YOU. 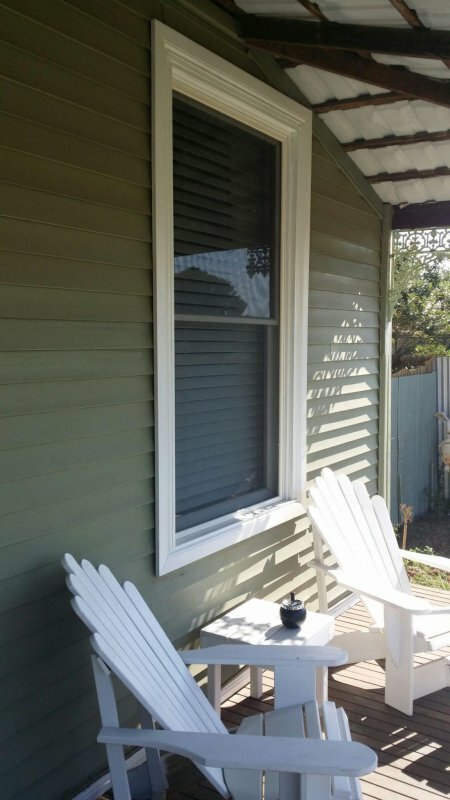 Scroll down, click to enlarge. 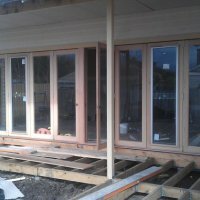 Award winning builder Heath Kimber - Double glazed aluminium windows and doors. 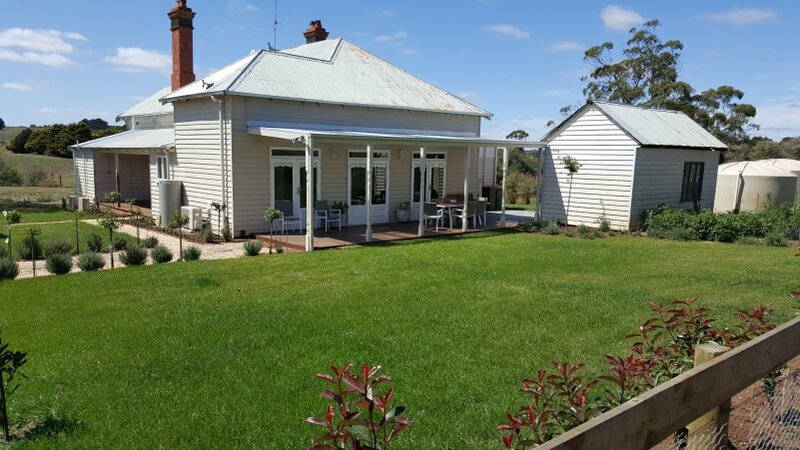 Ballarat, Daylesford, Kyenton, Woodend. 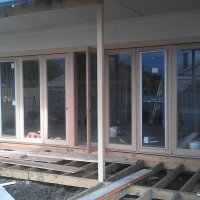 Windows and doors, getting it right. 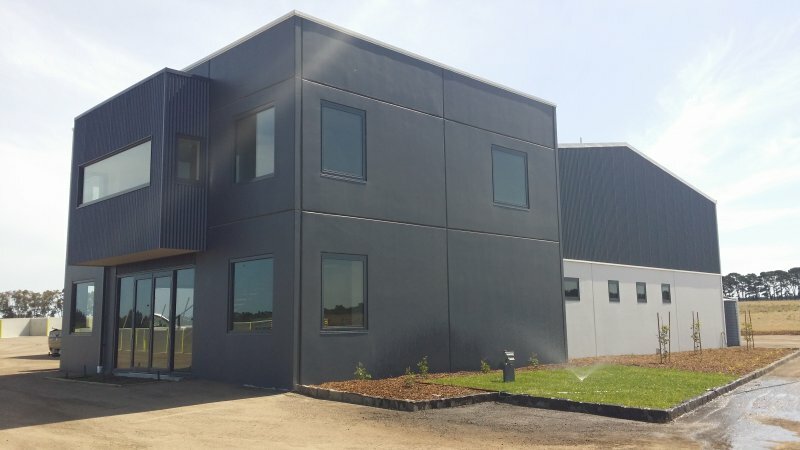 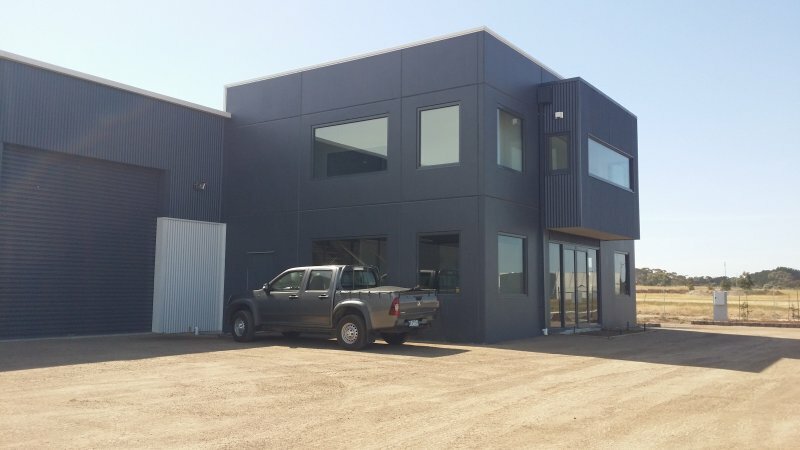 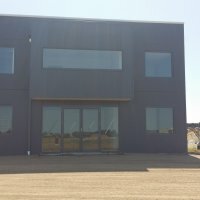 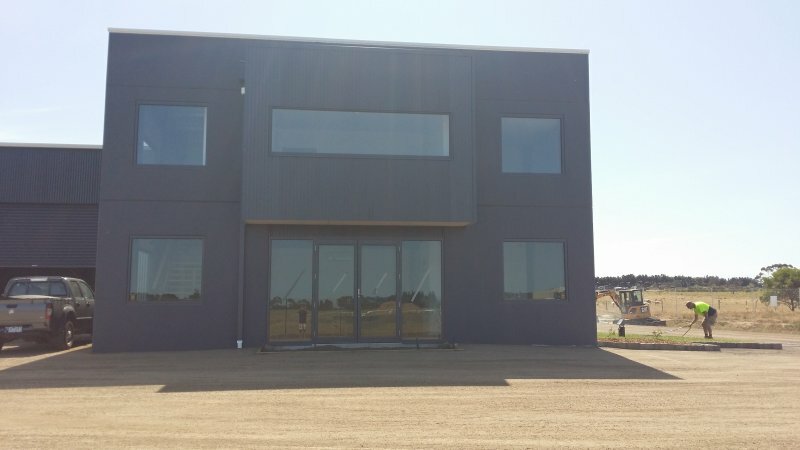 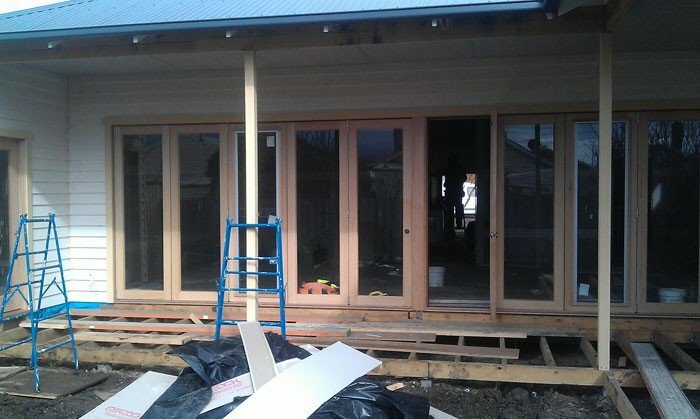 Top Ballarat Builder " Hayden Bromley " - 4 panel stacking door and semi commercial windows. 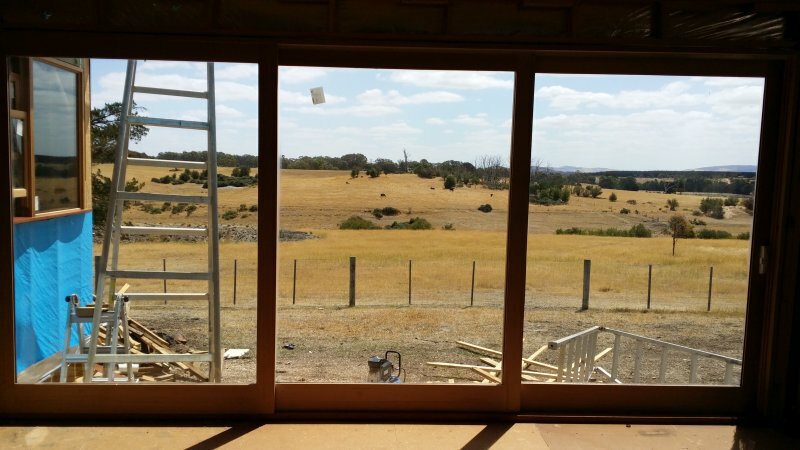 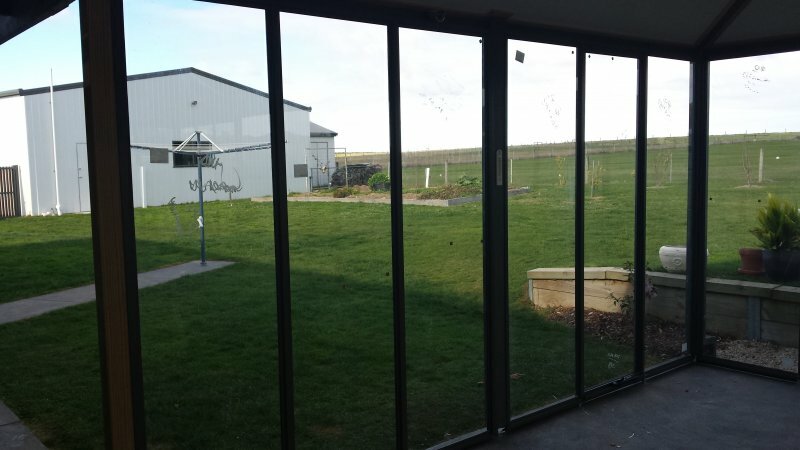 Ballarat Kyneton, Daylesford Woodend - Windows and Doors double glazed energy efficient. 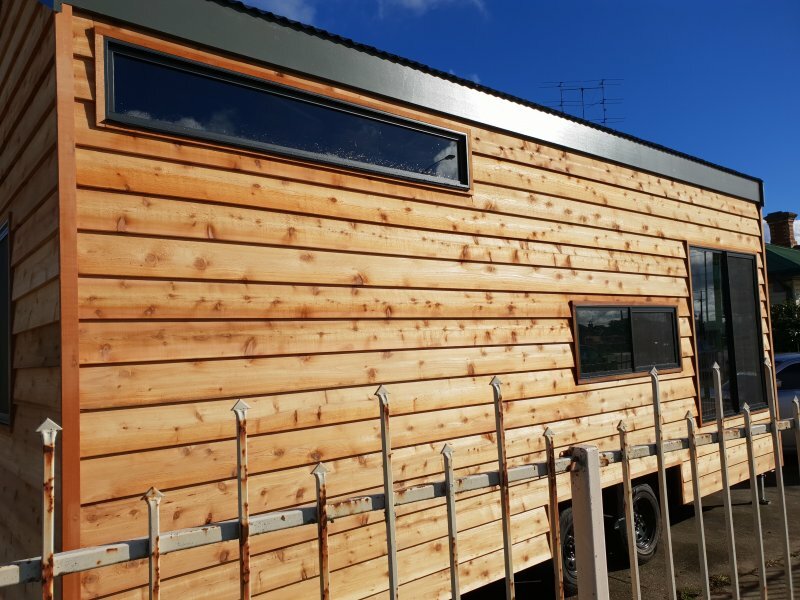 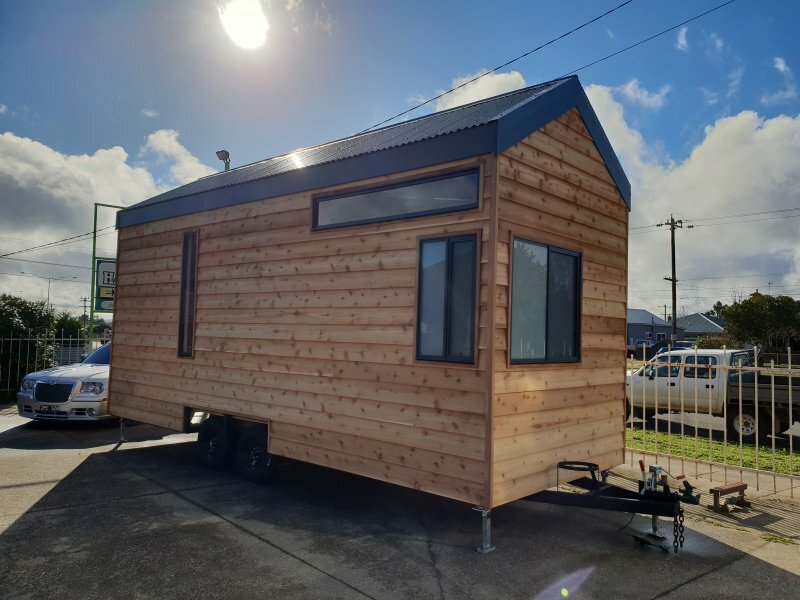 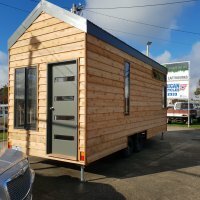 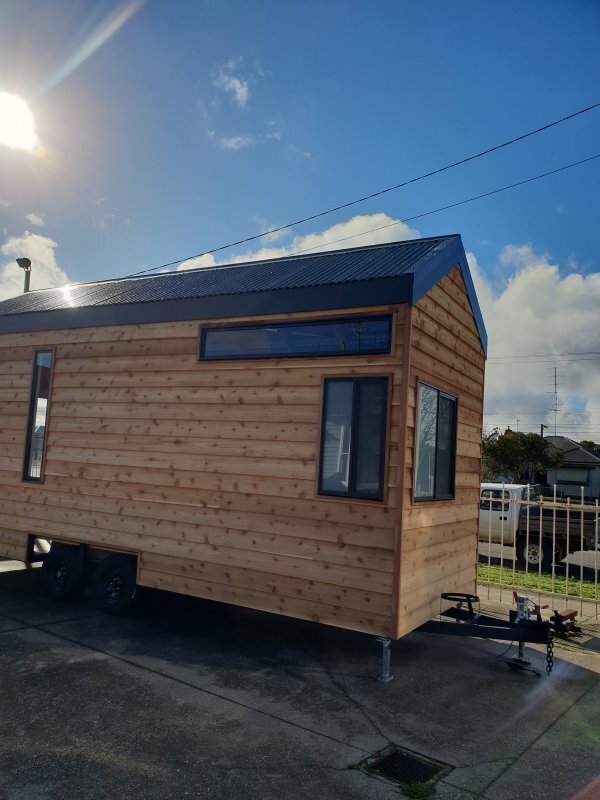 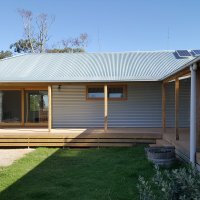 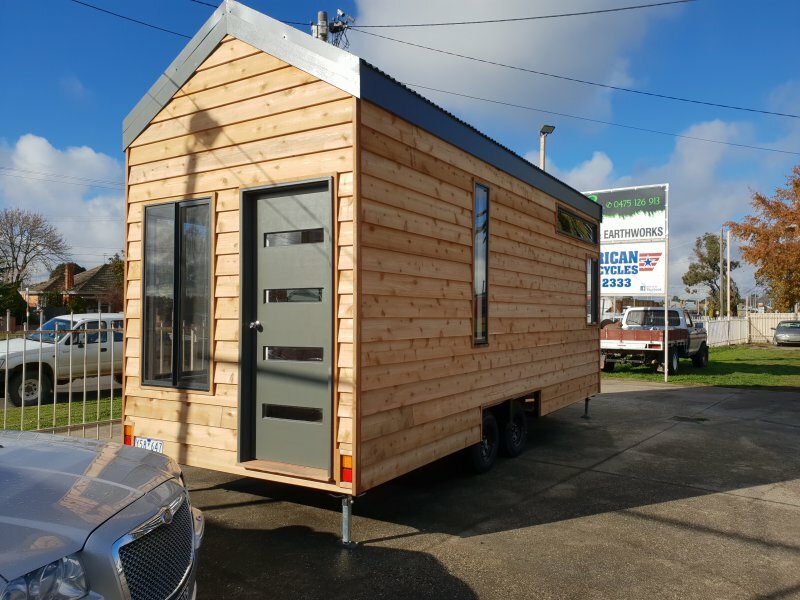 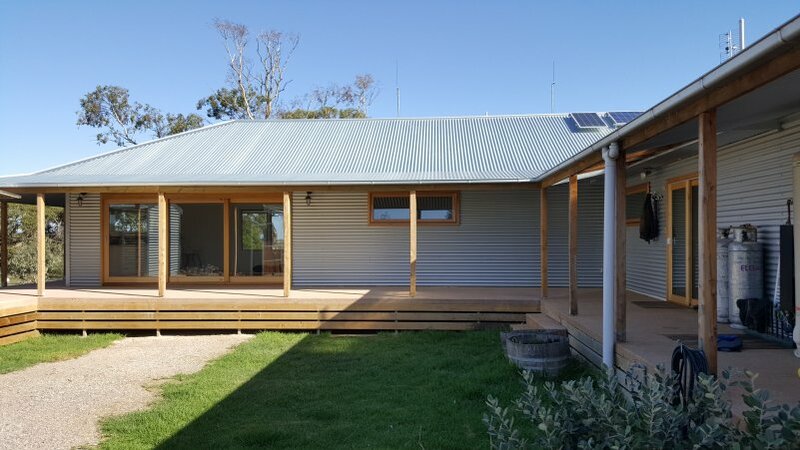 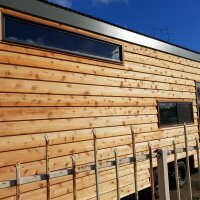 Ash Quiddington one of Ballarats most versatile and progressive builders a specialist in Building Tiny Homes - 0423 366 872 - Ballarat, Kyneton, Daylesford, Woodend, Geelong Victoria. 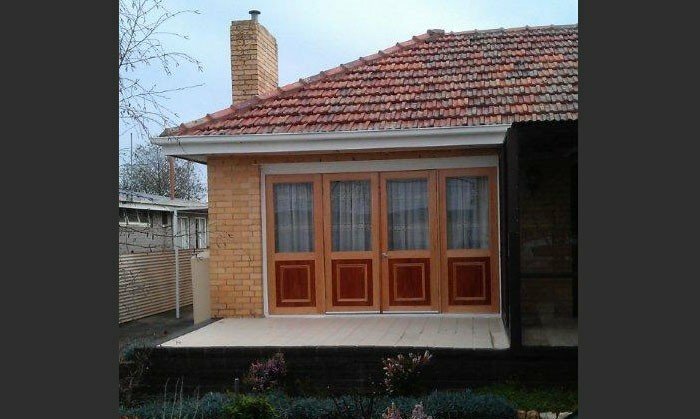 such a great use of space. 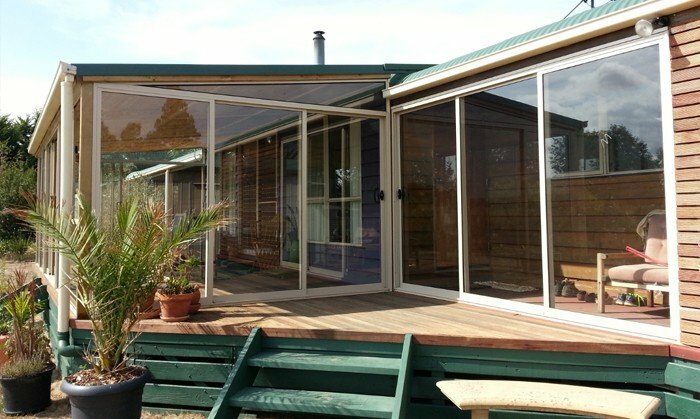 The options for these type of portable homes are only limited by the clients imagination. 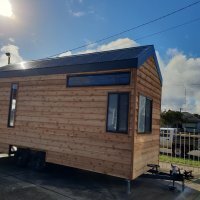 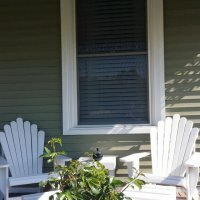 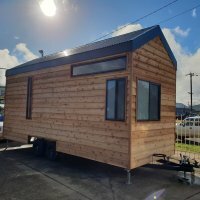 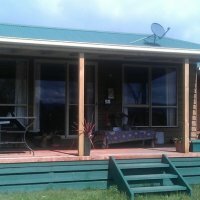 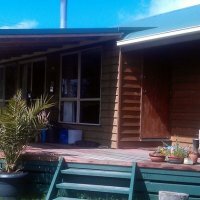 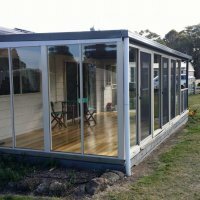 portable homes, caravan options. 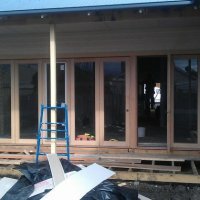 Ensurabuild 0419 377 871 - Scott O'Donohue - one of Ballarat prestigious builders - mid way through a great extension pre primed timber windows and doors to suit a traditional look. 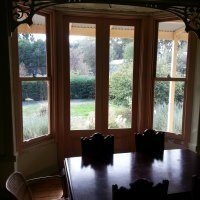 Ballarat, Woodend, Kyneton, Daylesford. 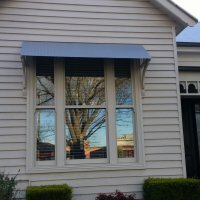 Renowned Ballarat builder Cam Palmer building - timber double glazed awning windows, period style for classic appearance. 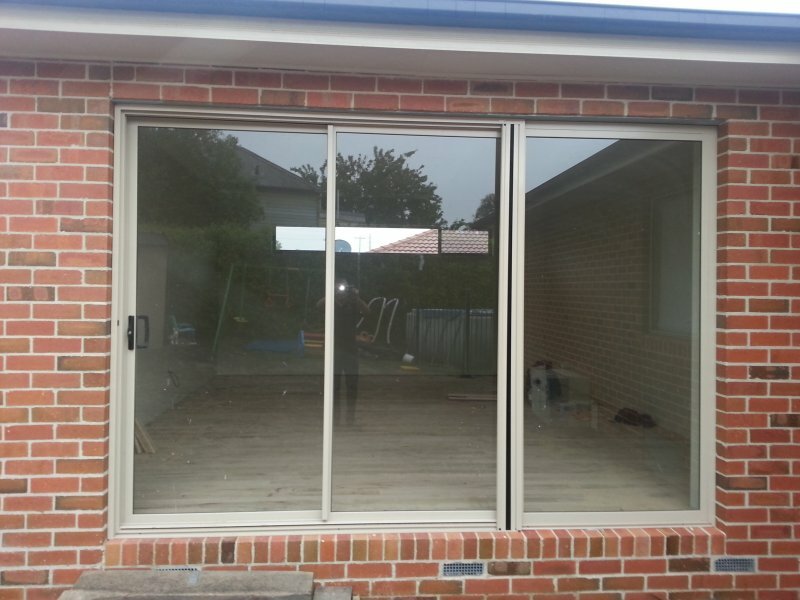 A great patio infilled with Aluminium stacking windows, double glazed, completed by Prendergast Constructions. 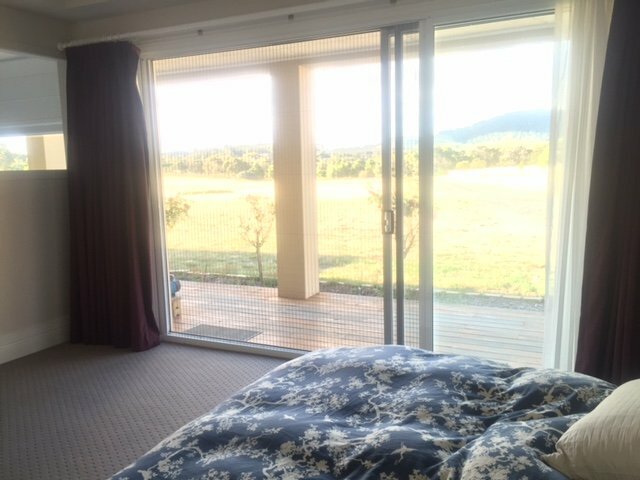 making the room usable all year around while keeping the view. 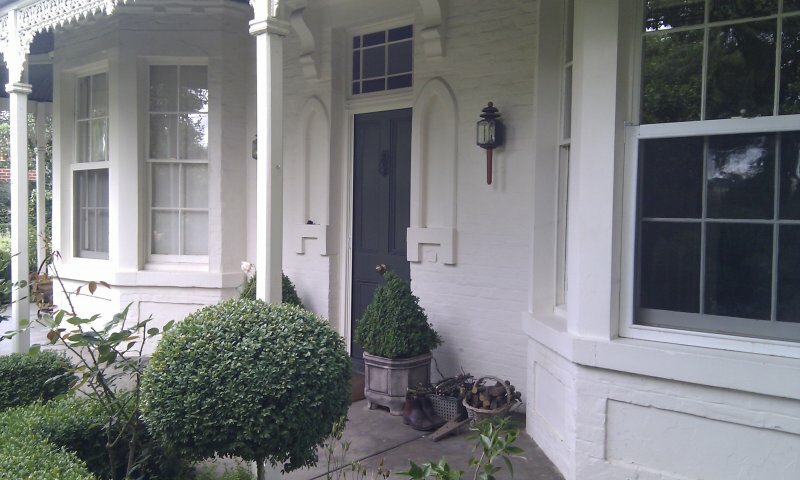 Daylesford, Woodend, Ballarat, Kyneton. 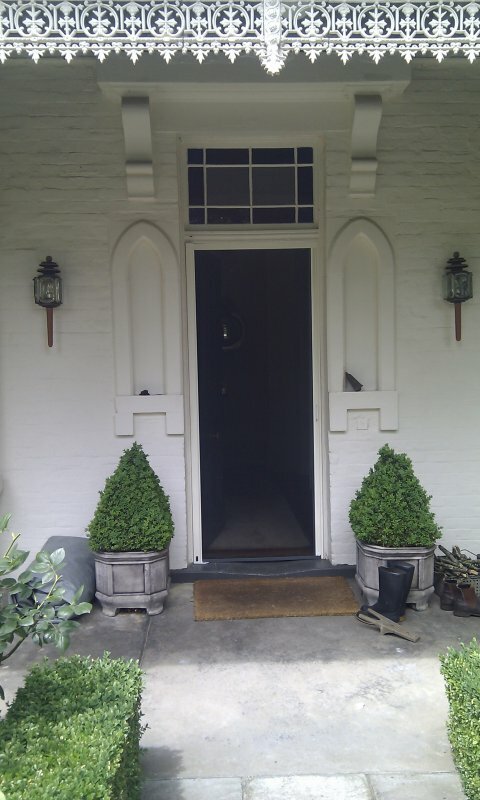 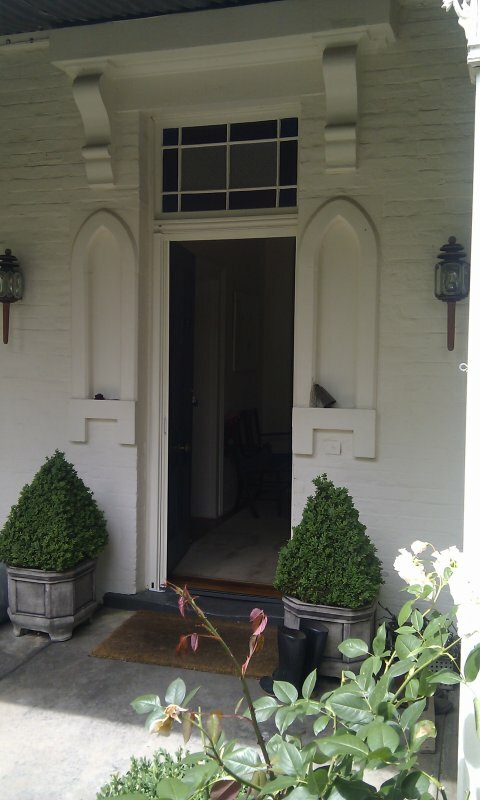 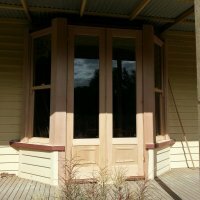 Timber windows and doors - period style doors always instyle. 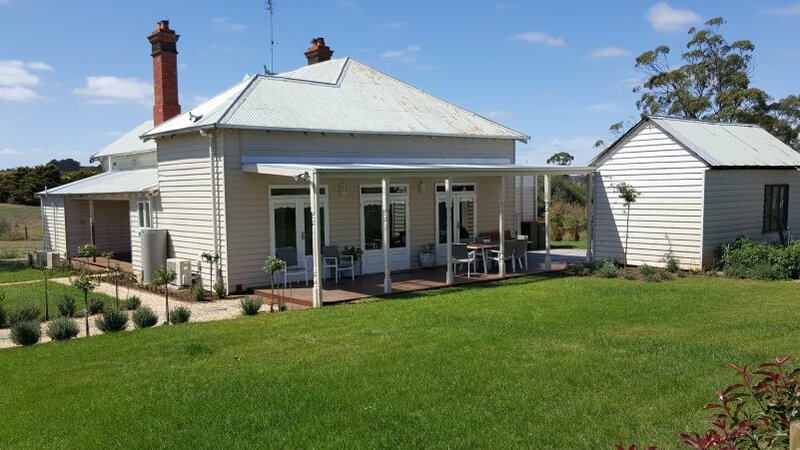 Ballarat, Clunes, Daylesford, Woodend, Kyneton. 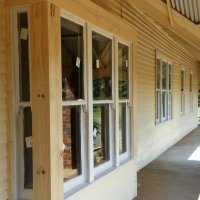 Wooden windows and doors. 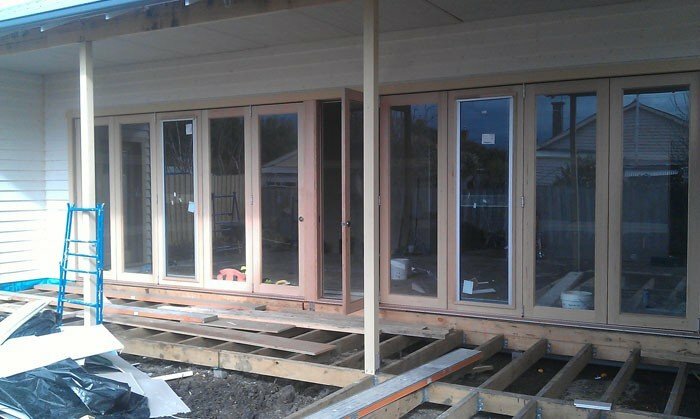 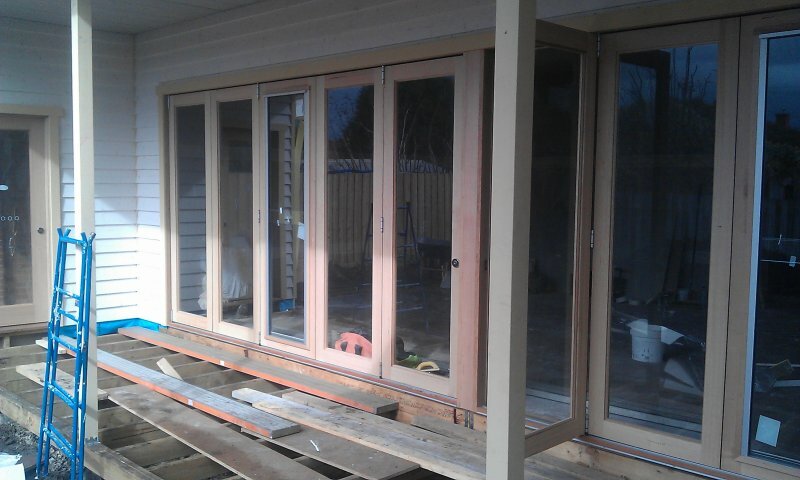 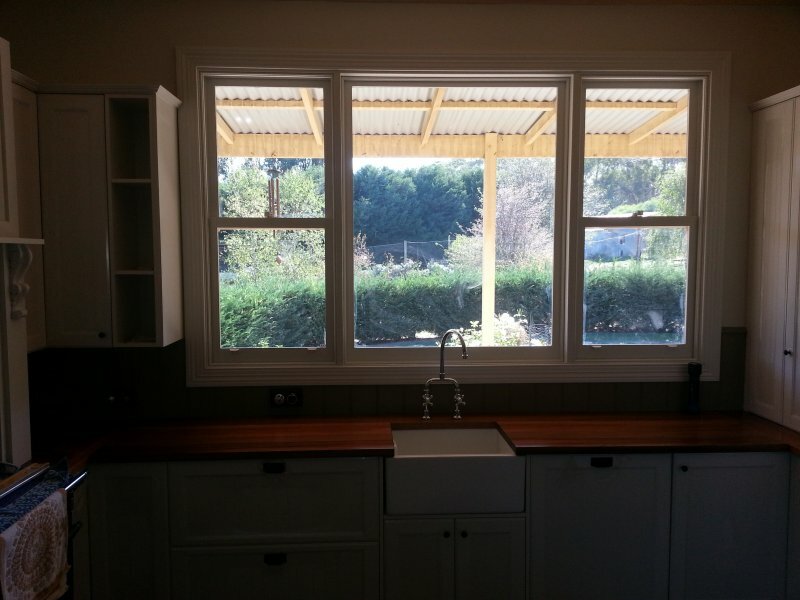 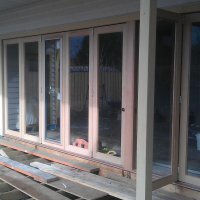 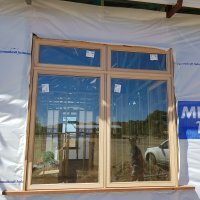 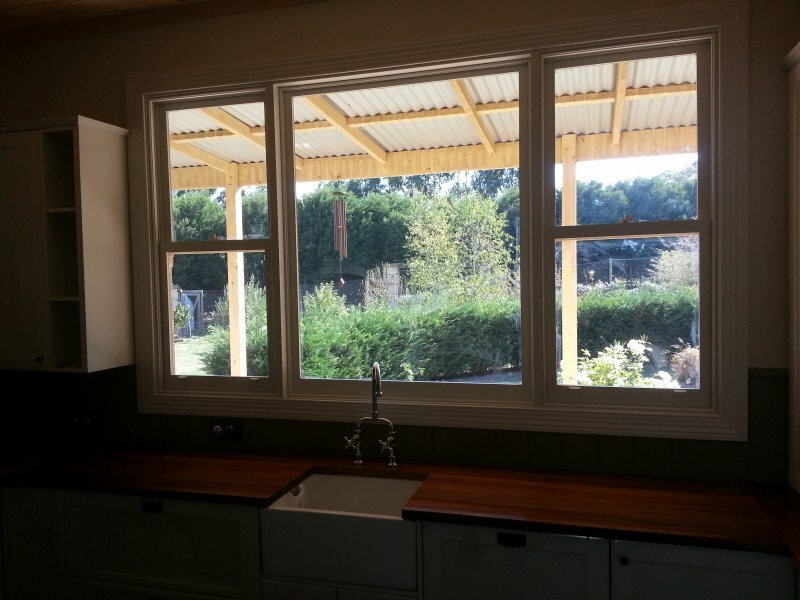 Daylesford timber windows, sliding doors and bi-fold servery window. 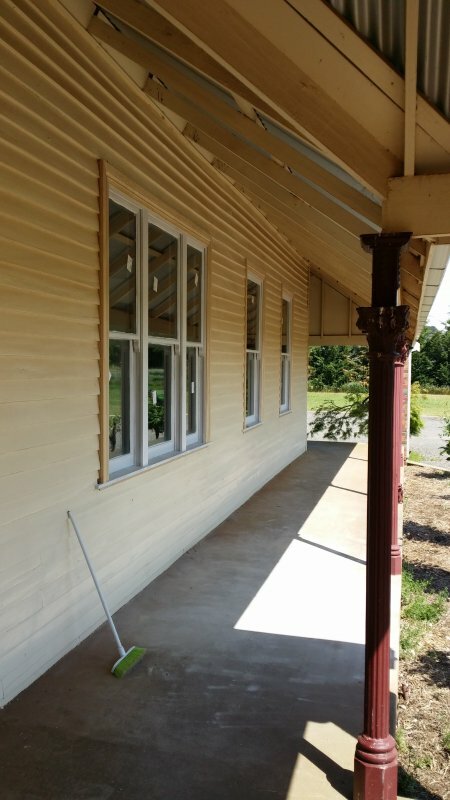 KDHW stained. 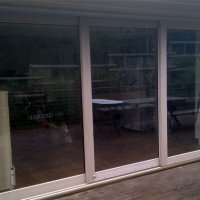 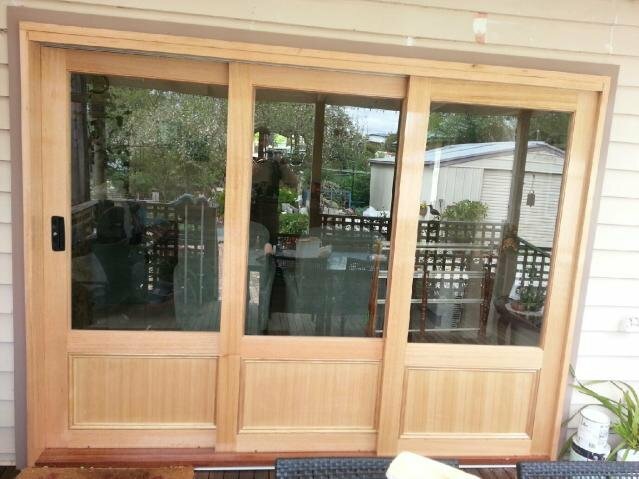 Single door retractable screens, neat and stylish with out the hassles of traditional hinged flydoors. 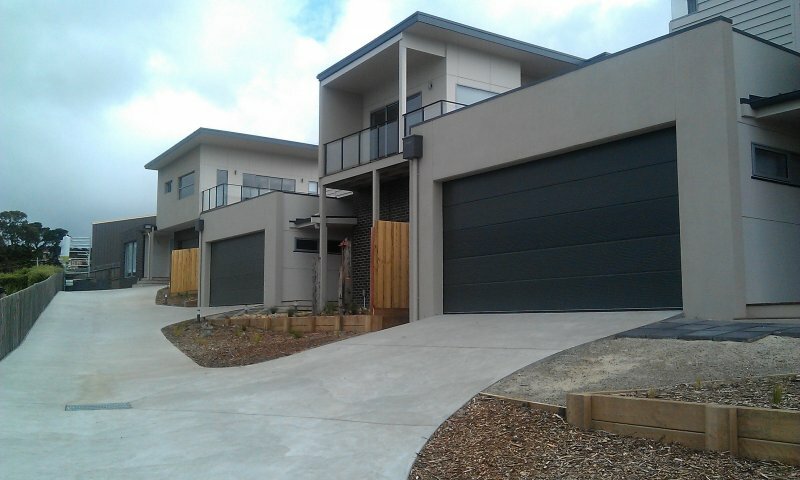 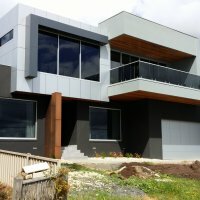 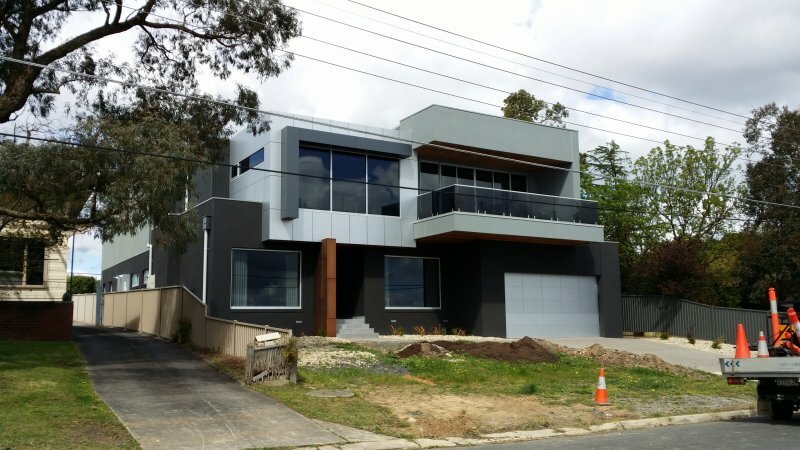 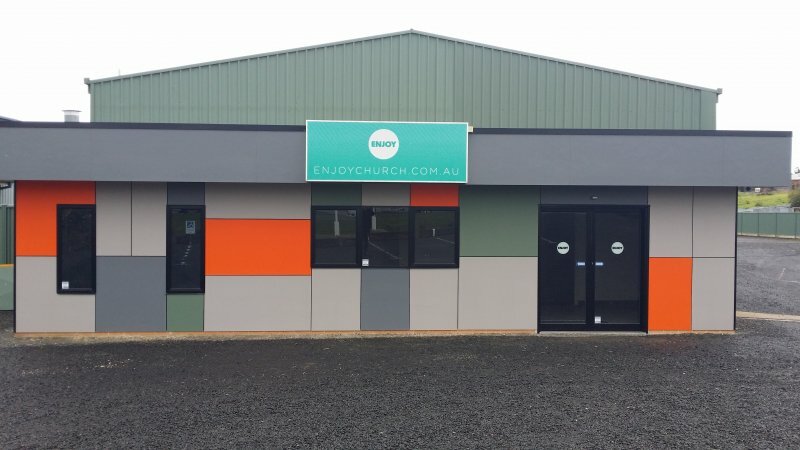 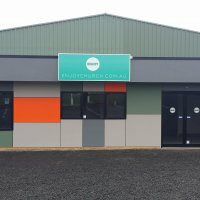 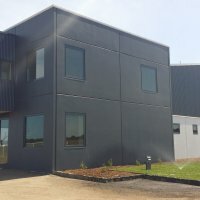 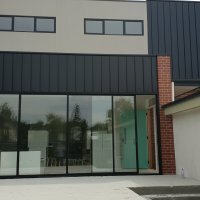 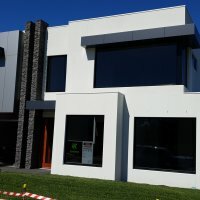 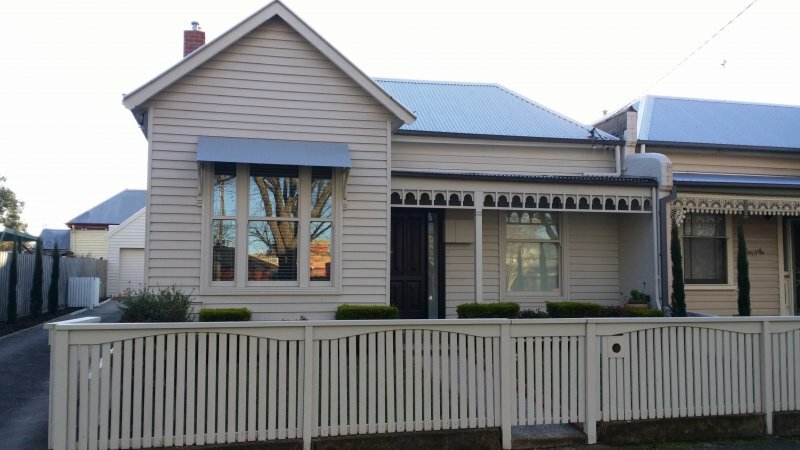 New build Ballarat. 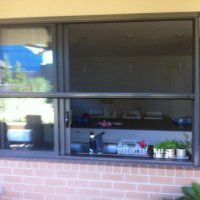 Double glazed grey tint, semi commercial and commercial windows and doors. 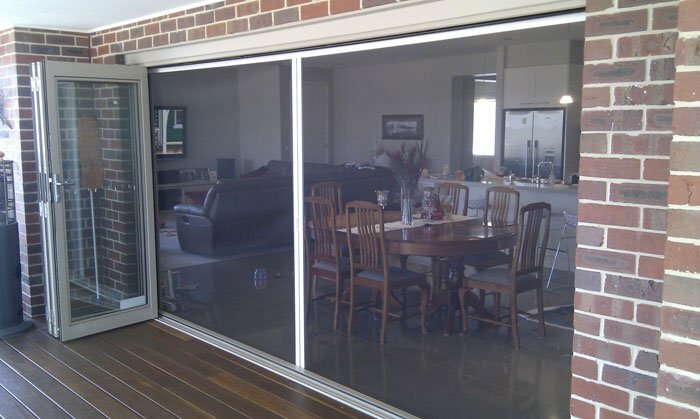 Aluminium stacking door, this is an ideal way to create an indoor / outdoor room. 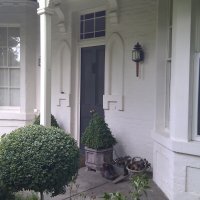 Ballarat Kyneton, Daylesford, Woodend. 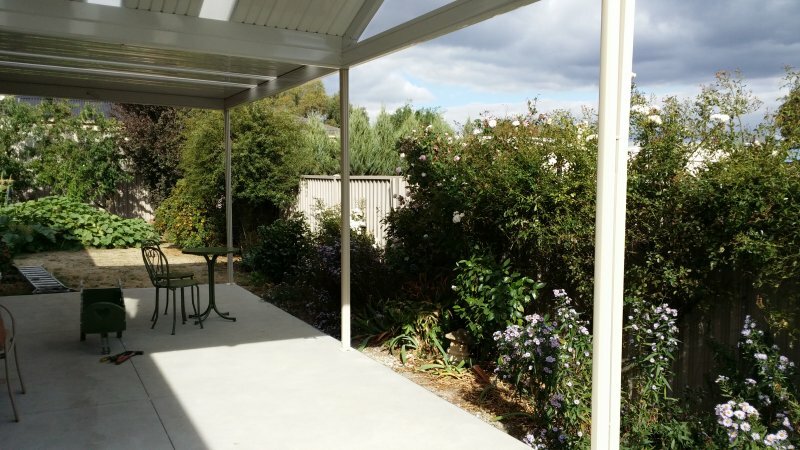 Pergola in fill Ballarat / Daylesford. 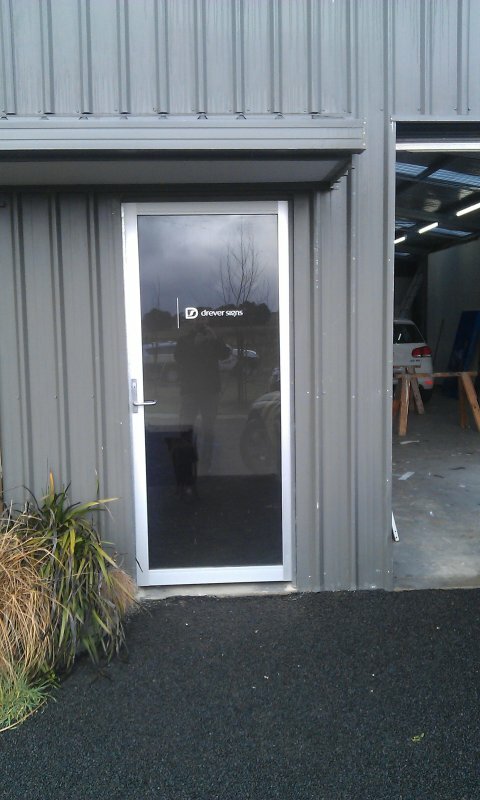 6800mm wide Large stacking door - Hayden Bromley building - double glazed. 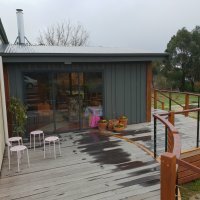 Ballarat, Kyneton, Woodend, Daylesford. 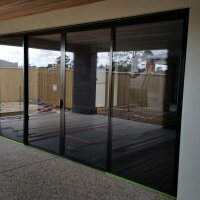 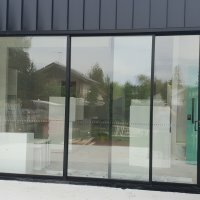 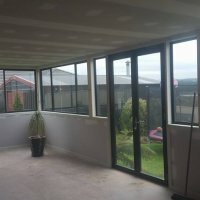 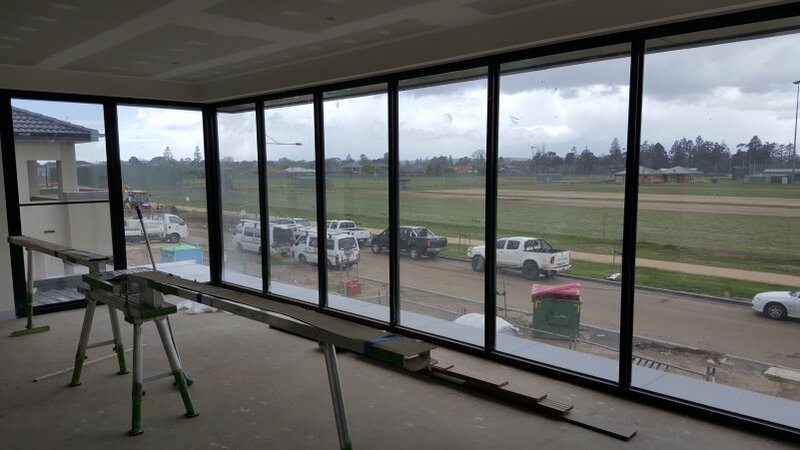 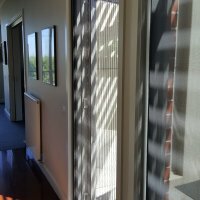 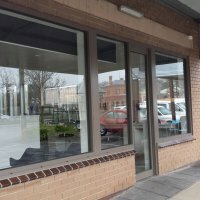 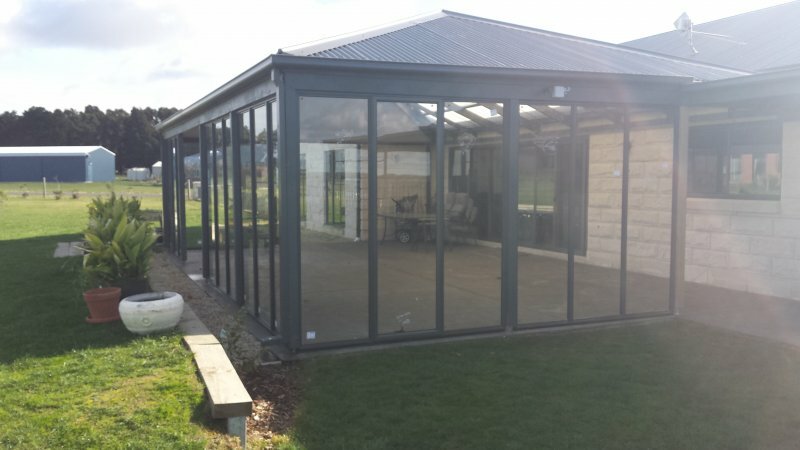 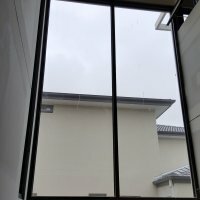 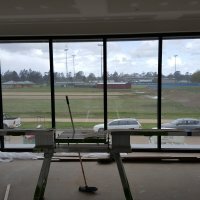 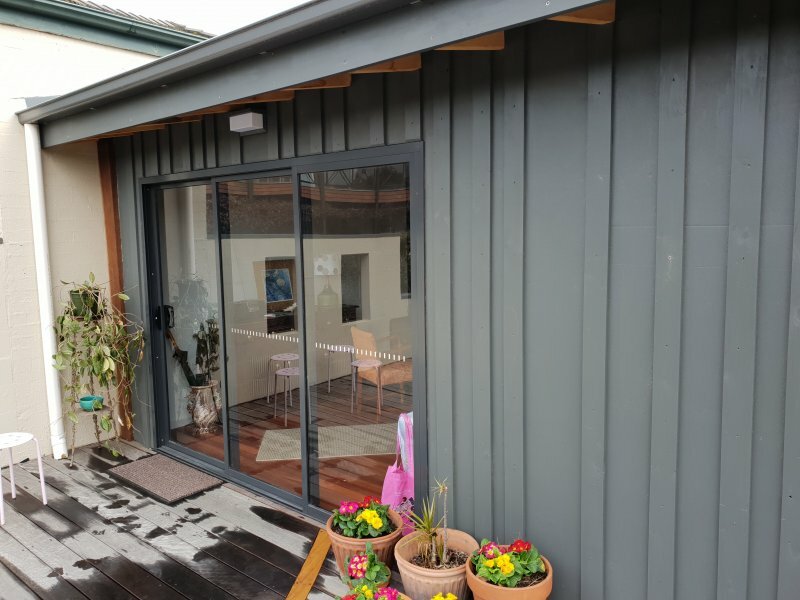 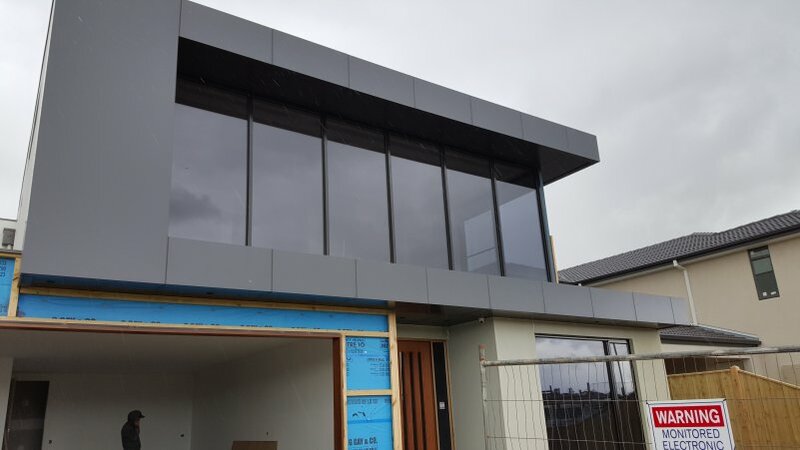 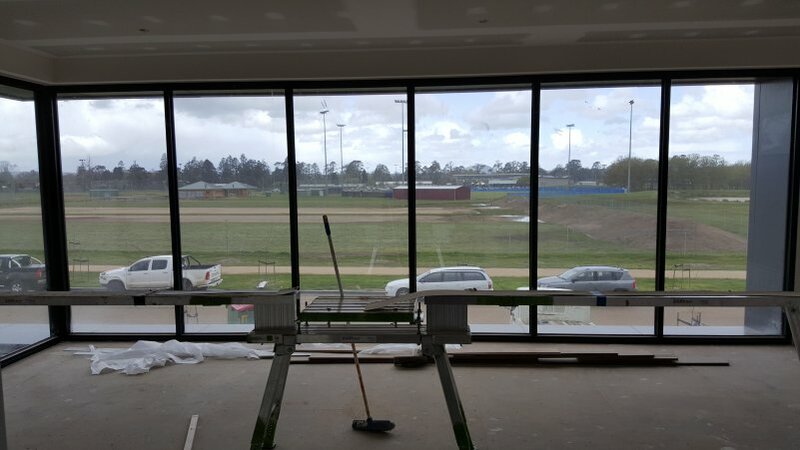 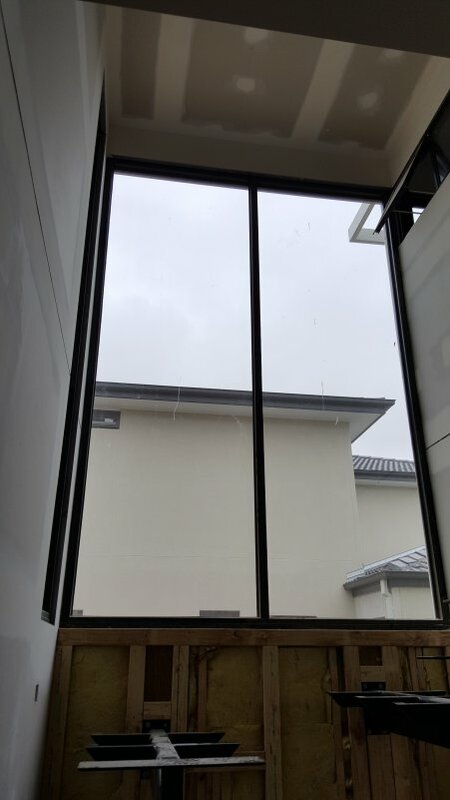 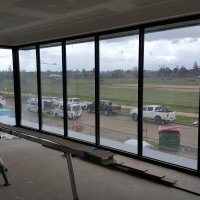 Commercial window room - super grey glass - Ballarat, This enclosure has been receiving some very positive reviews from our client and passers by. 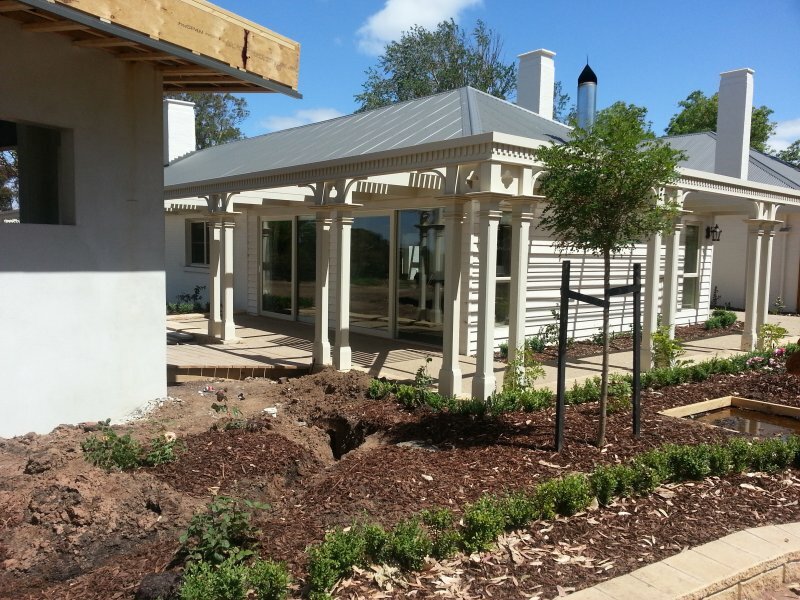 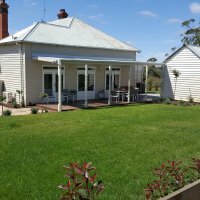 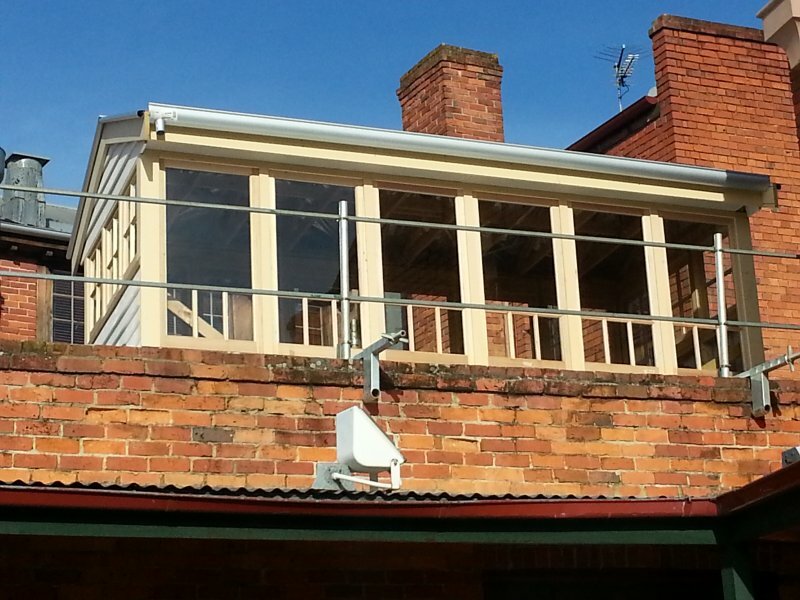 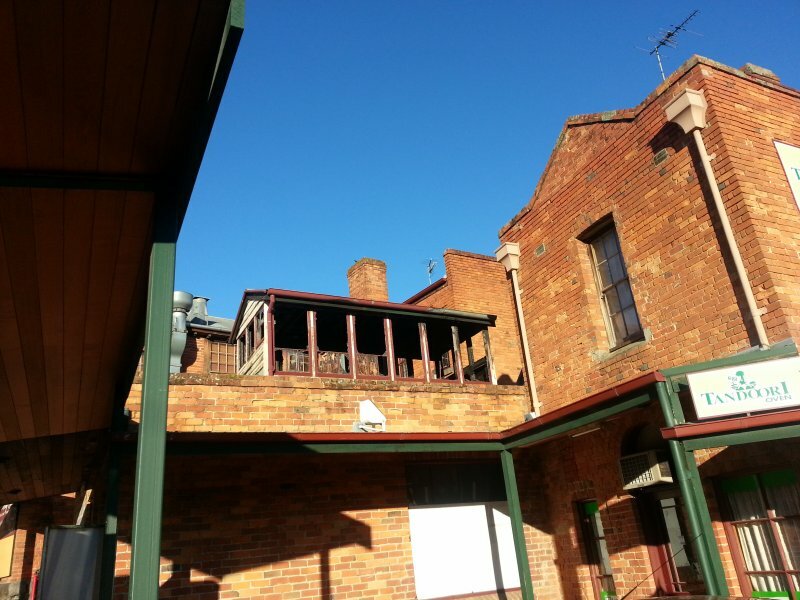 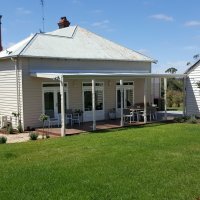 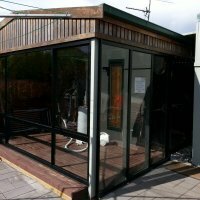 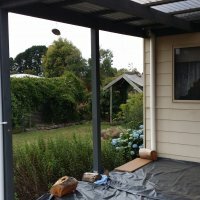 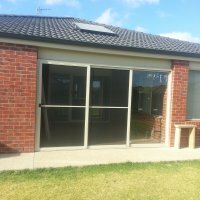 Pergola and Alfresco infill Supplied and Installed by WESTERN VICTORIA WINDOWS Ballarat. 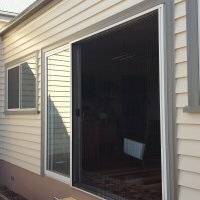 Sliding stacking doors and fixed windows. 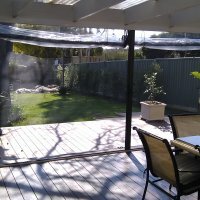 Customer reviews about this style of pergola infill that enables openable options in summer and complete weather protection in winter are well received. 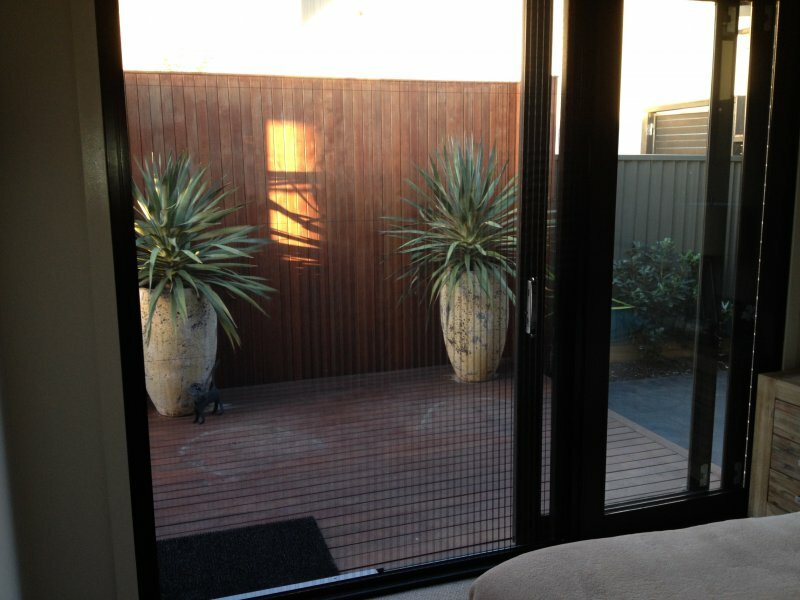 Retractable insect screen on timber stacking doors Ballarat. 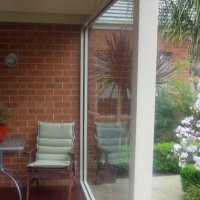 Geelong. 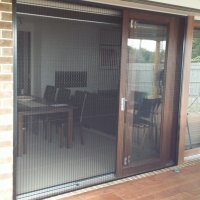 Retractable screen on a stacking door. 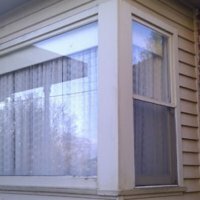 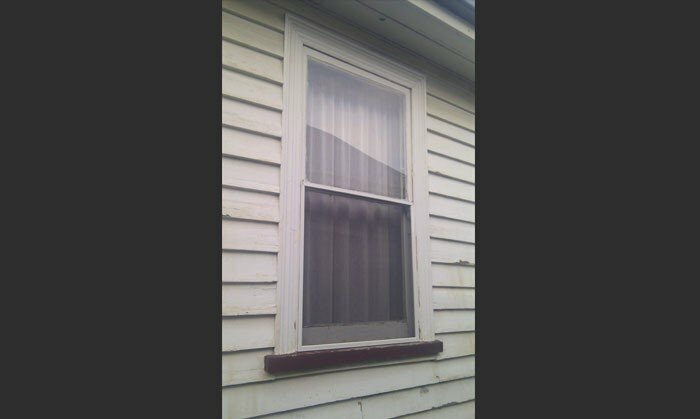 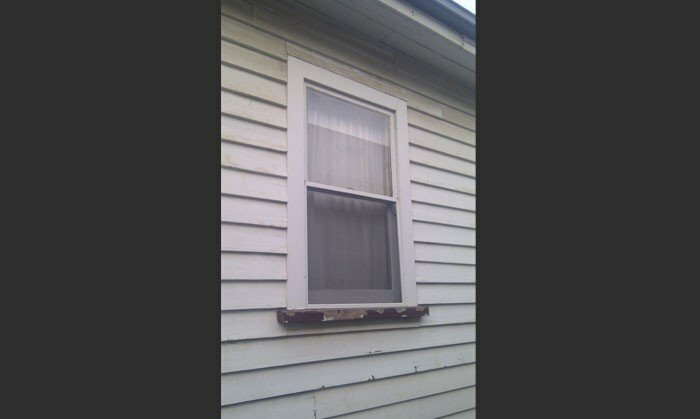 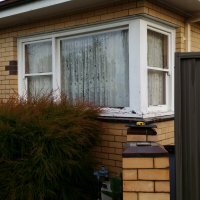 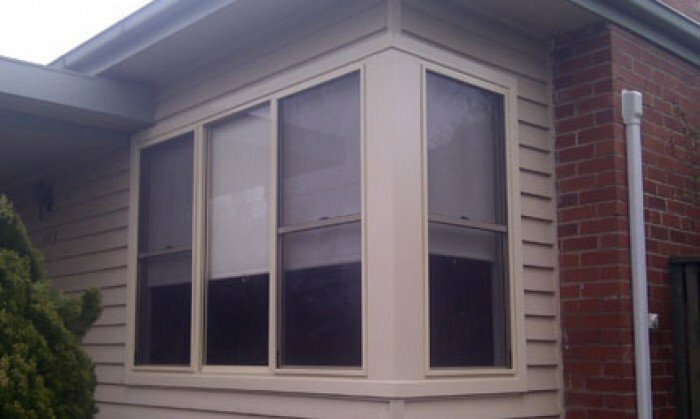 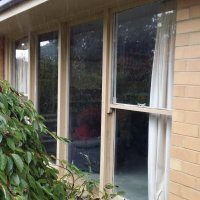 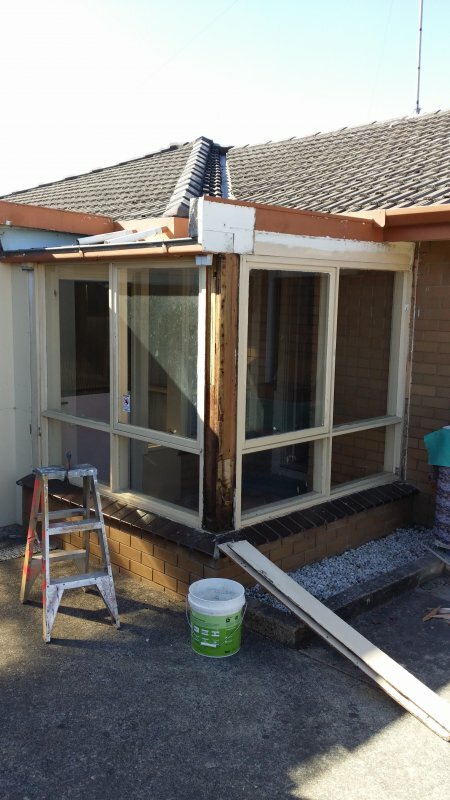 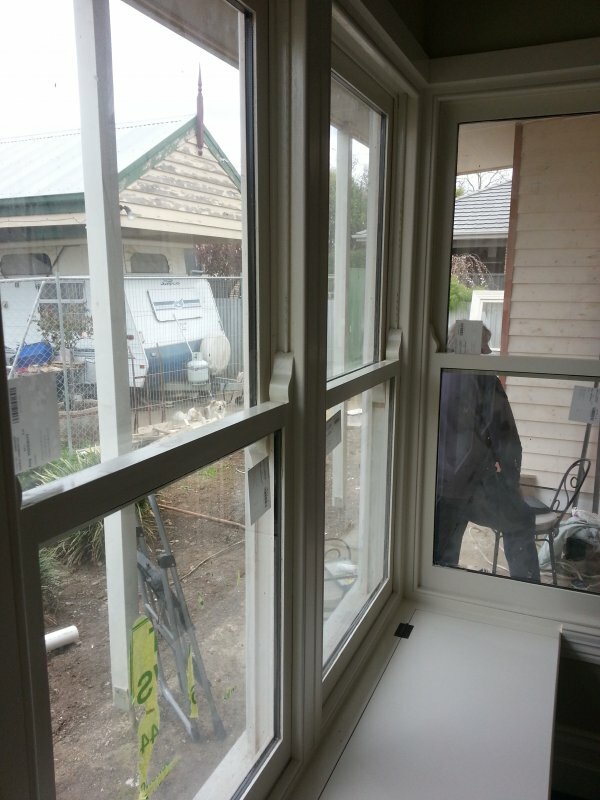 Window replacement Ballarat, old timber double hung windows were removed for semi-commercial aluminium windows with grey tint glass. 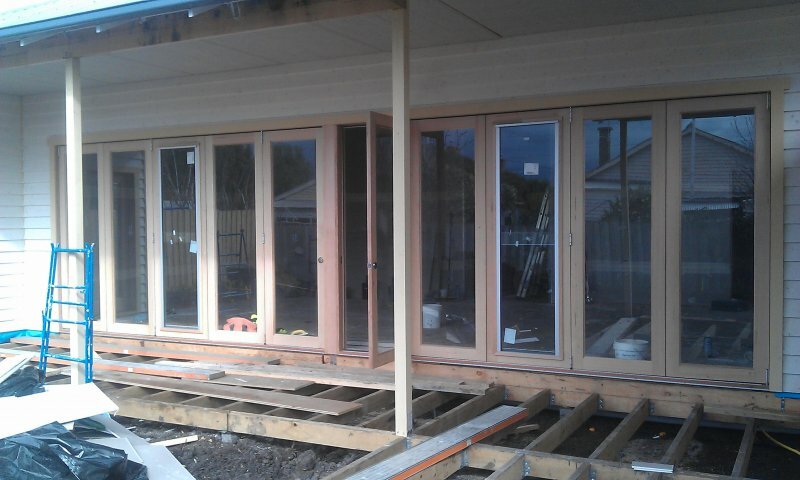 Timber Stacking Door installed in Kyneton. 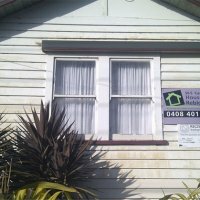 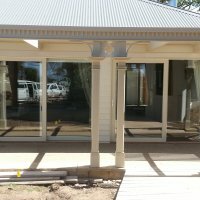 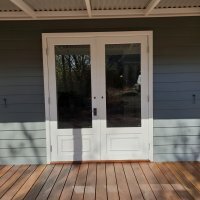 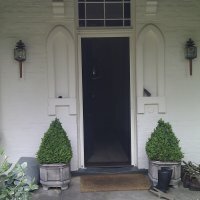 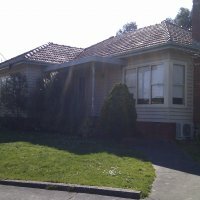 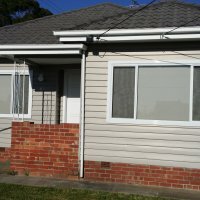 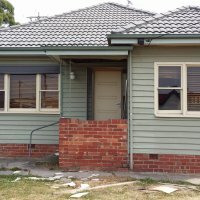 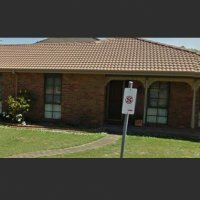 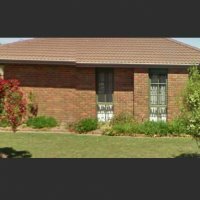 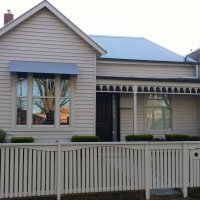 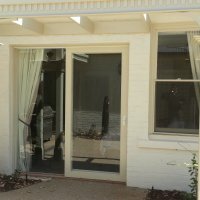 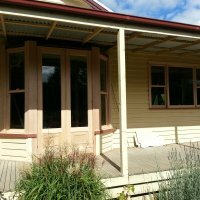 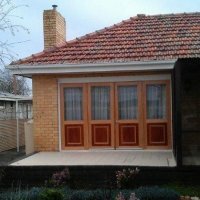 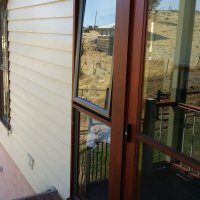 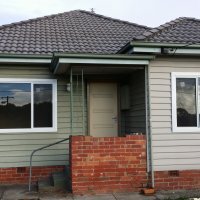 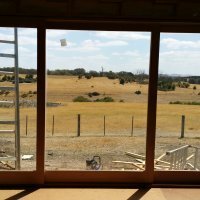 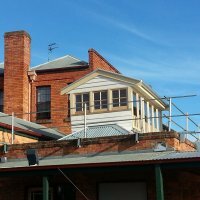 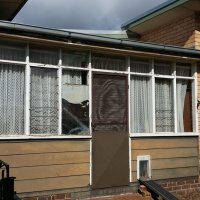 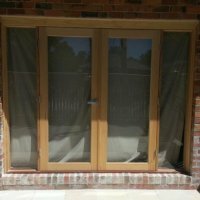 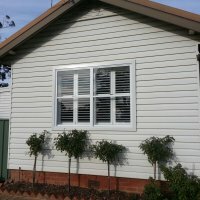 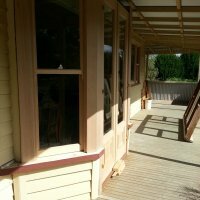 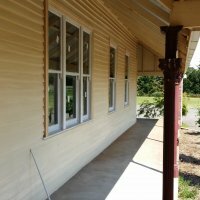 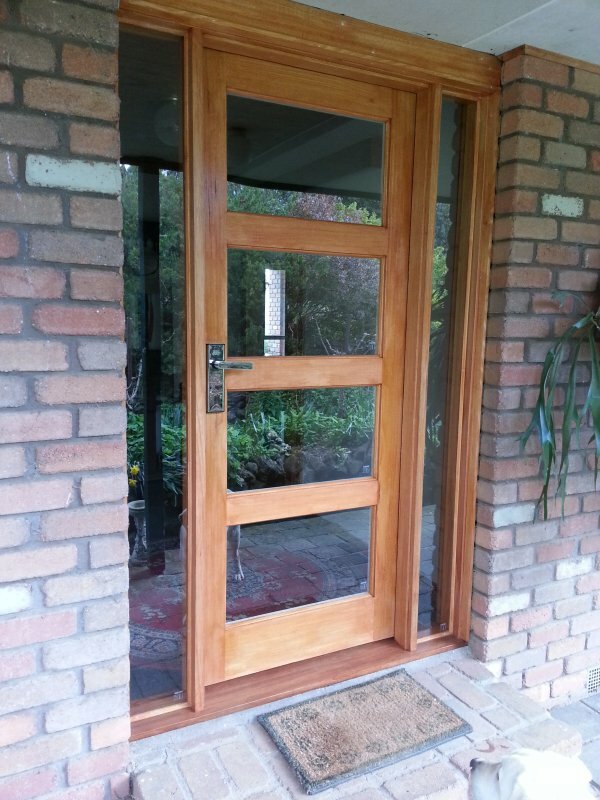 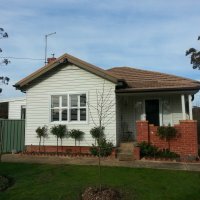 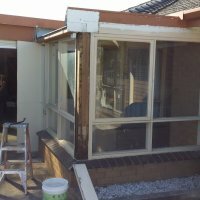 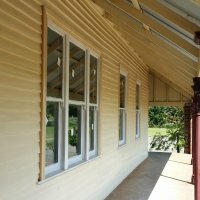 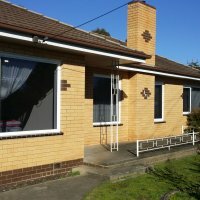 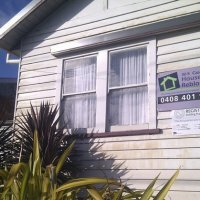 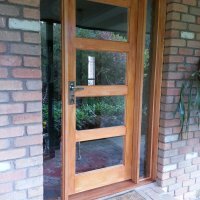 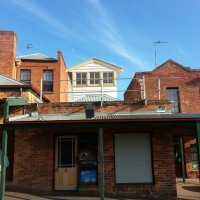 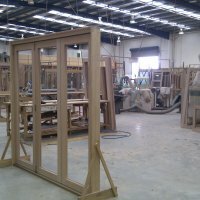 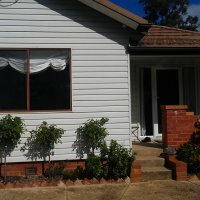 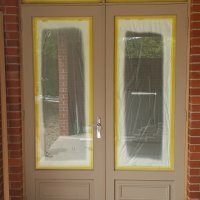 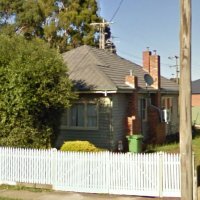 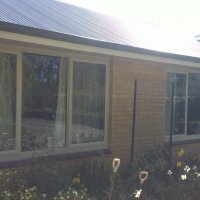 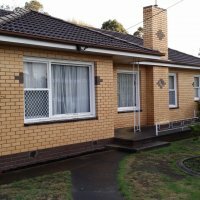 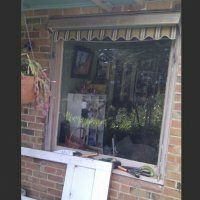 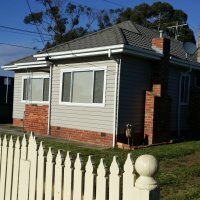 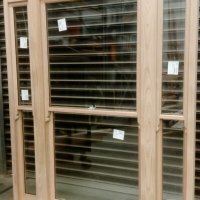 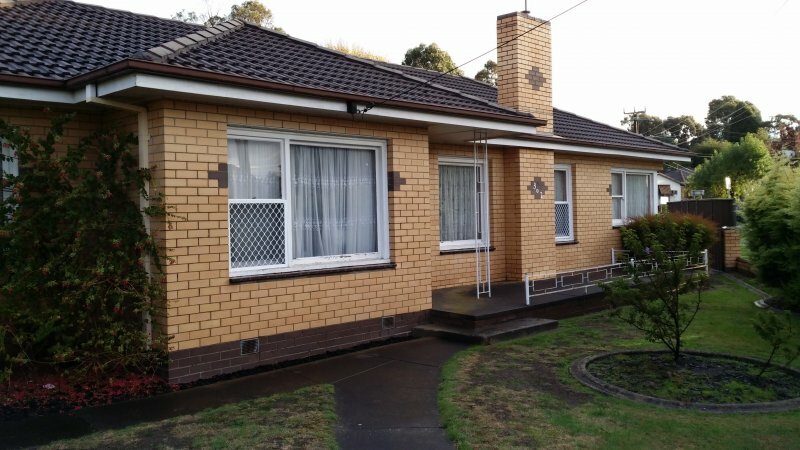 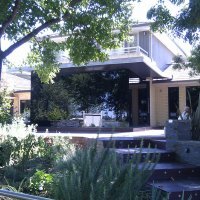 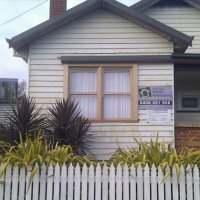 During replacement - Period style windows and doors Ballarat. 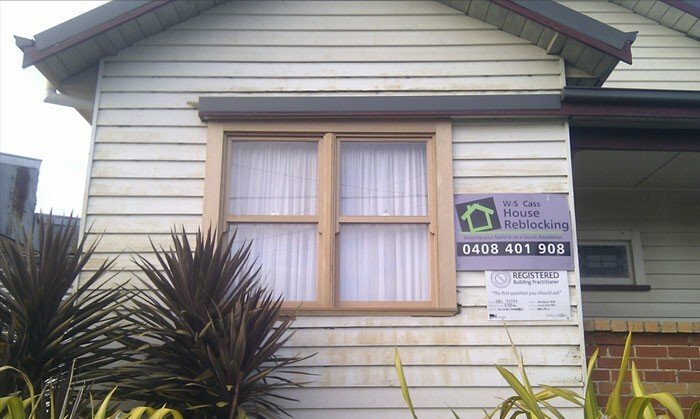 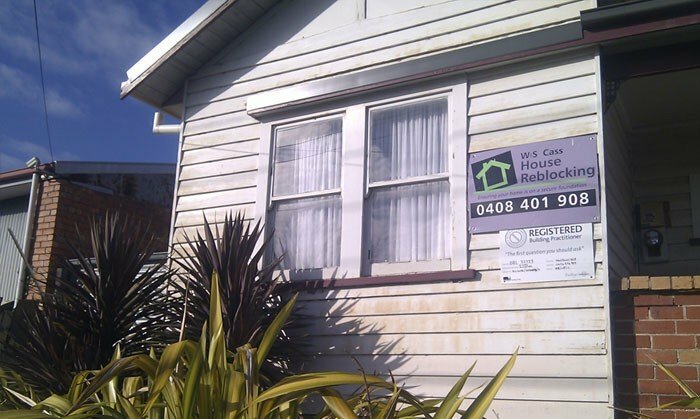 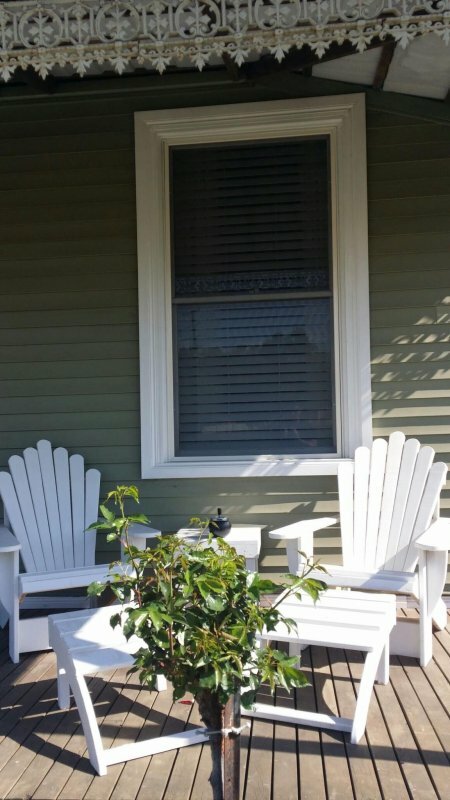 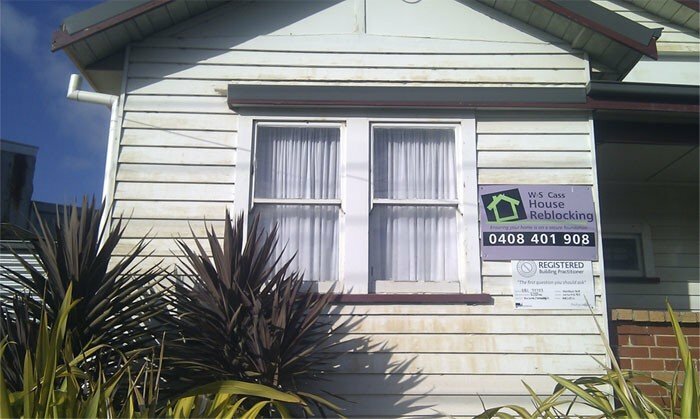 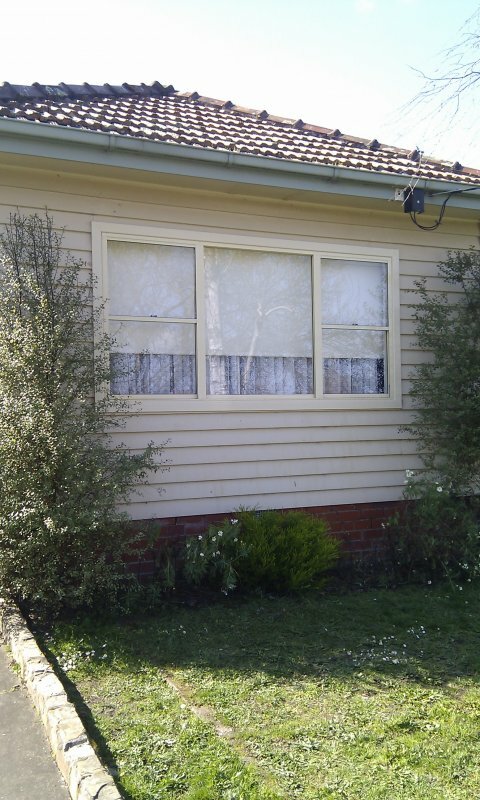 Window replacement - old timber windows were replaced with modern Aluminium Double Hung windows - black. 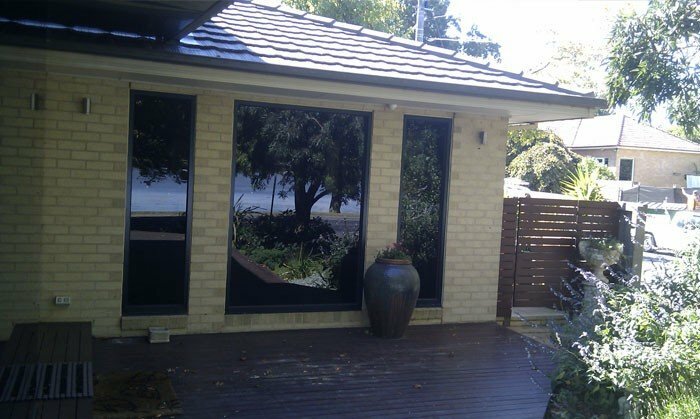 This enhanced the front facade of the home giving it a modern feel while still keeping with the original design. 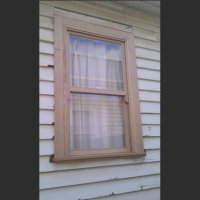 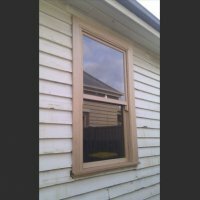 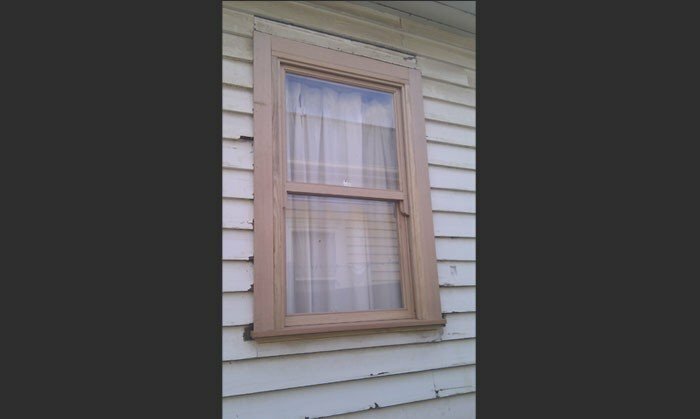 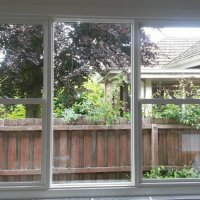 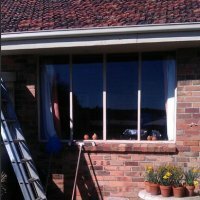 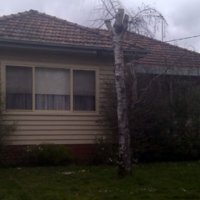 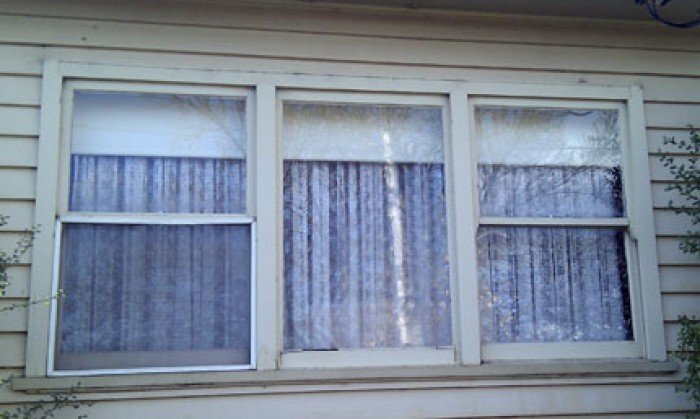 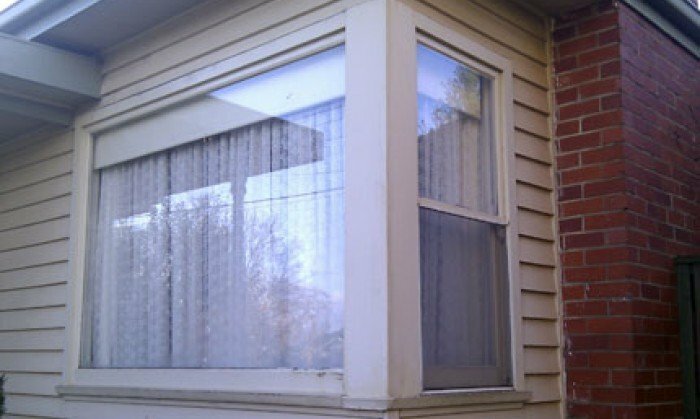 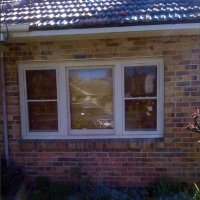 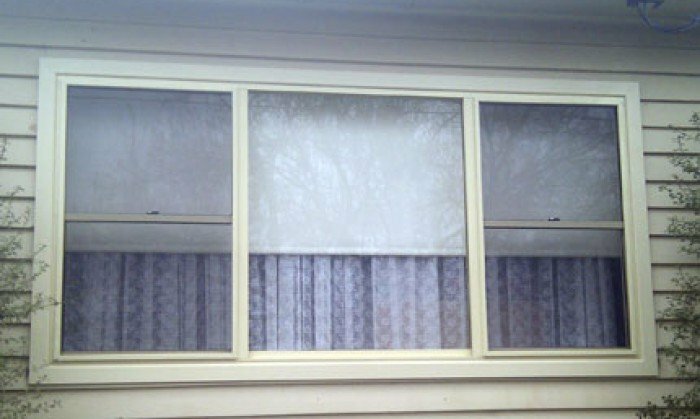 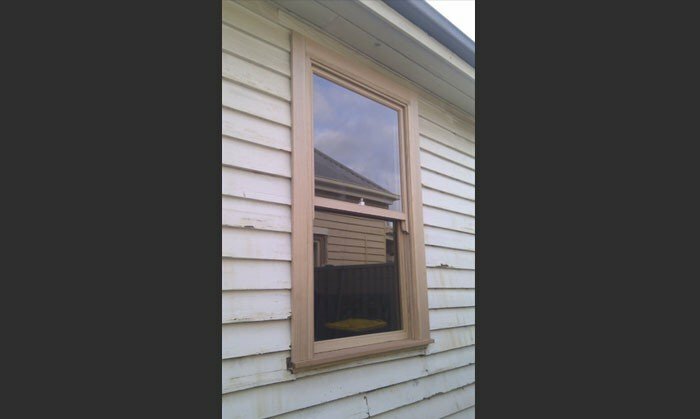 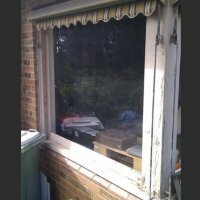 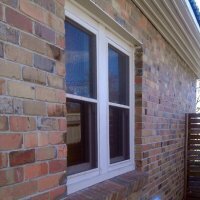 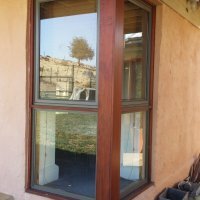 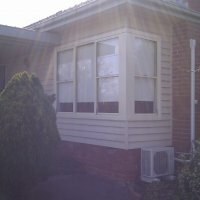 Double Hung replacement windows Ballarat. 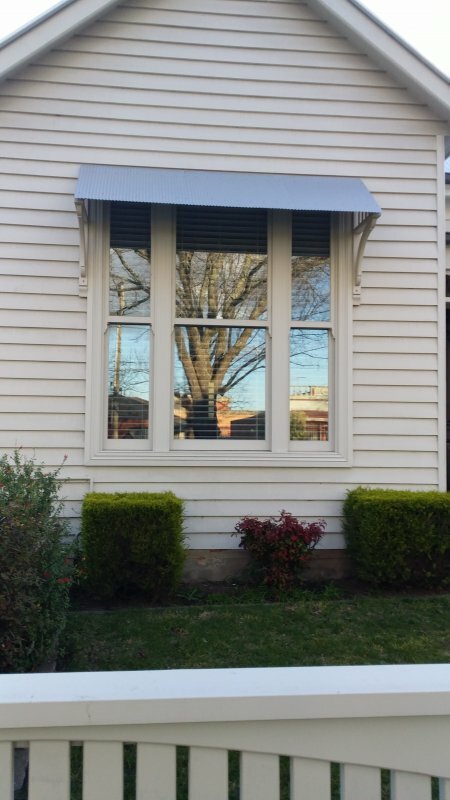 Period style timber window replaced in Ballarat, counter balanced for improved air flow. 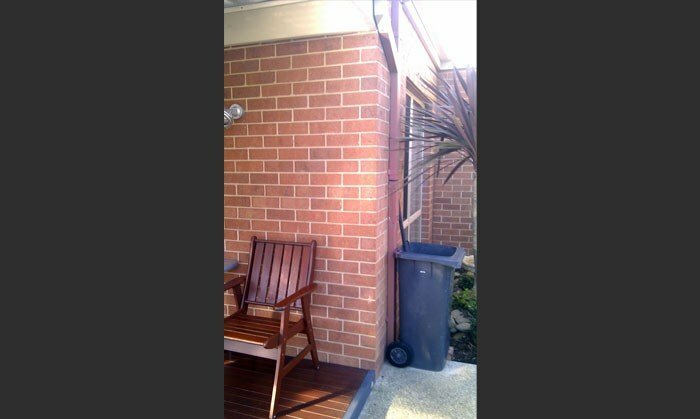 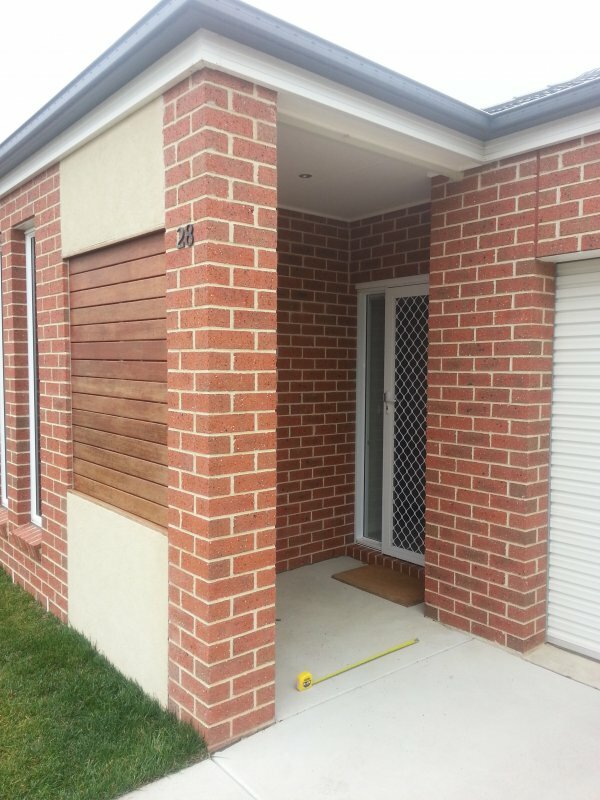 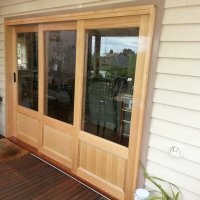 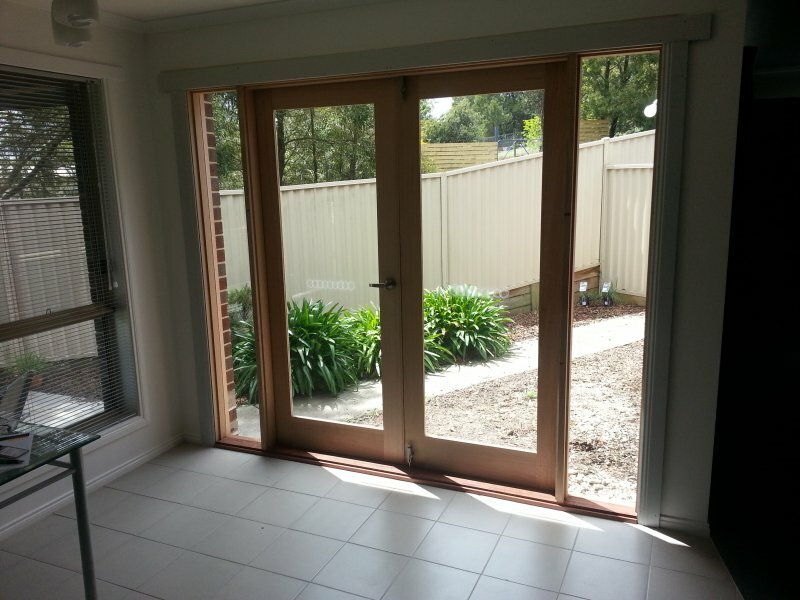 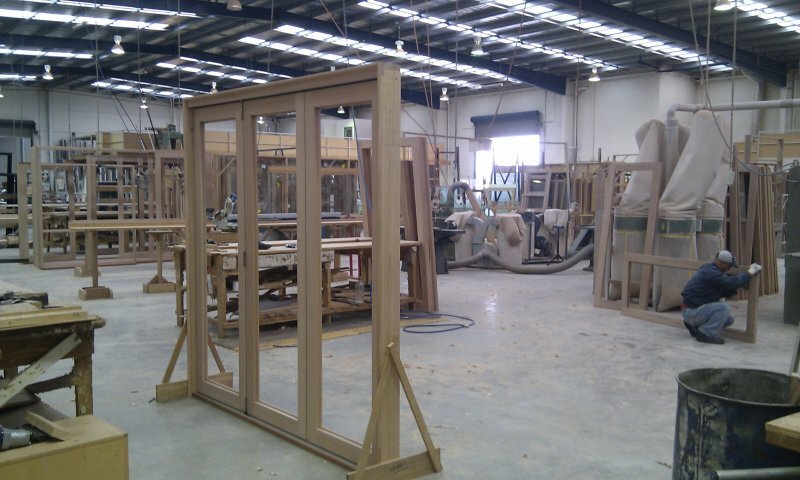 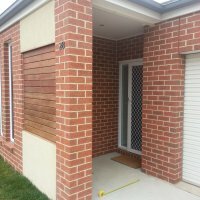 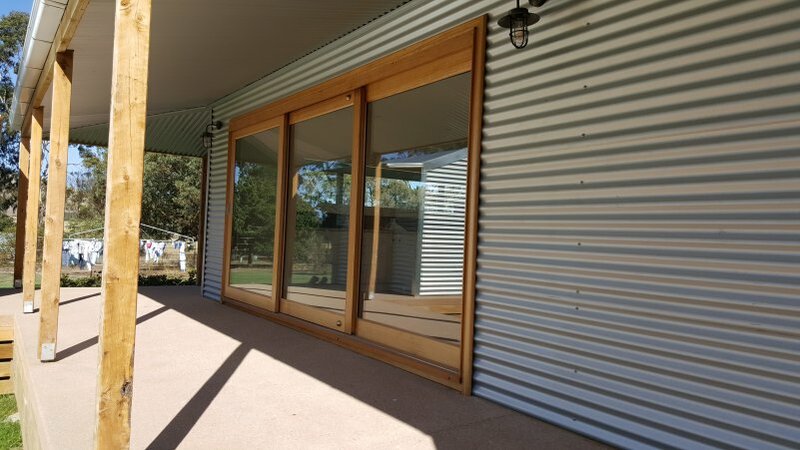 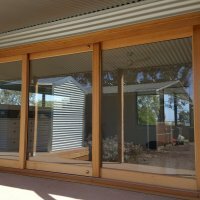 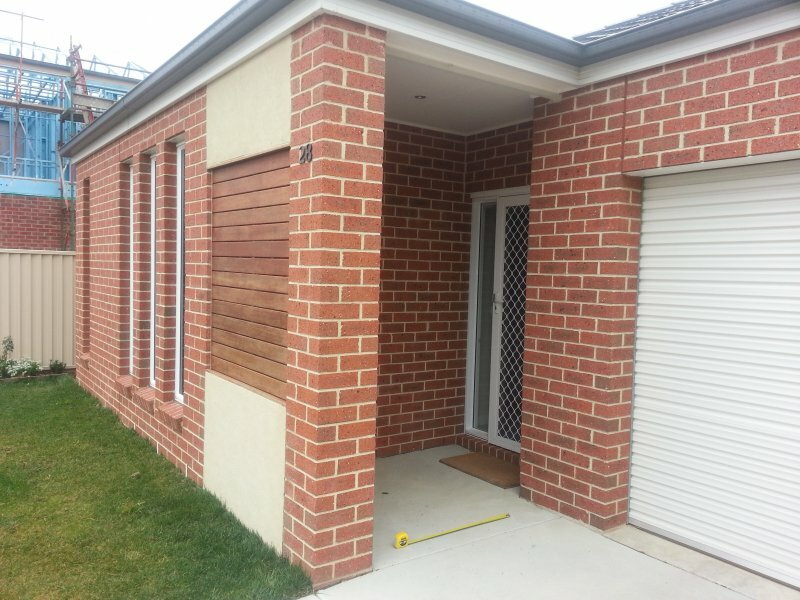 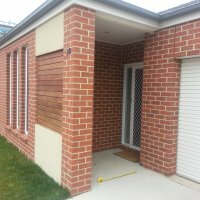 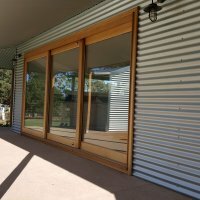 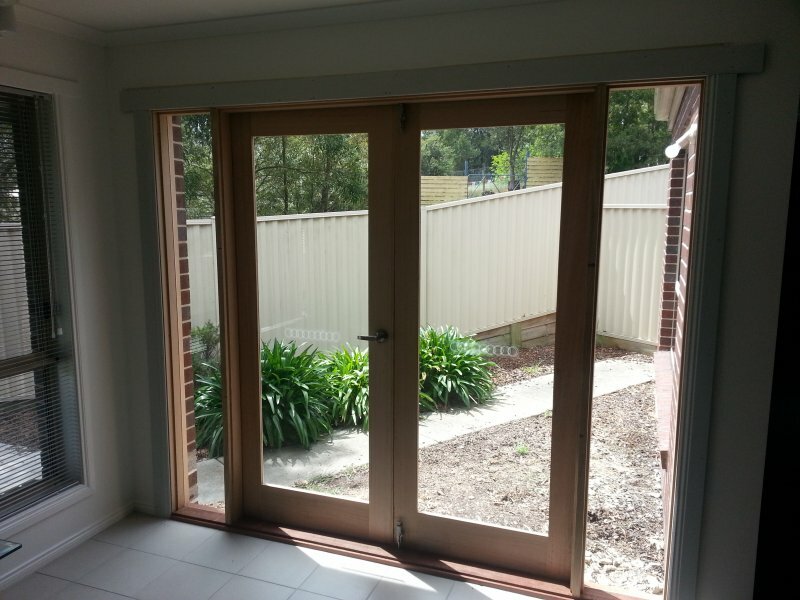 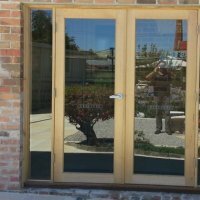 Geelong - Ballarat - Melbourne Retractable Flydoor for Timber Stacking Doors. 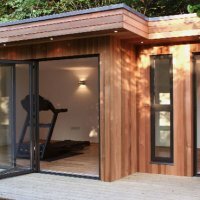 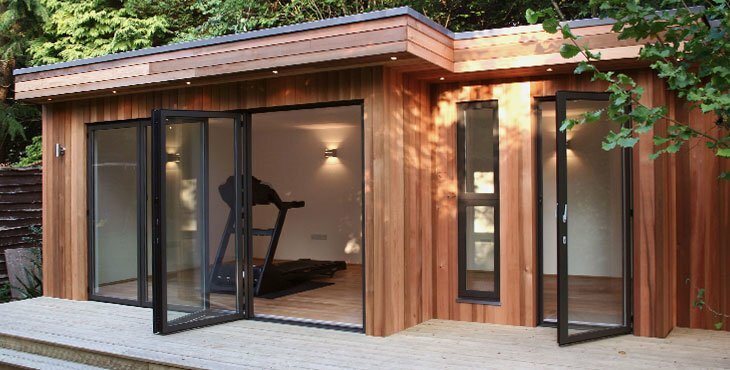 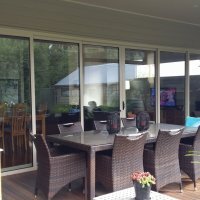 We can either fit our retractable insect screens / flydoors to our own range of Timber / Wooden or Aluminium Windows and Doors. 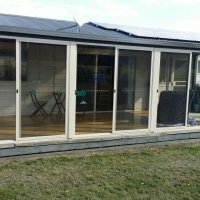 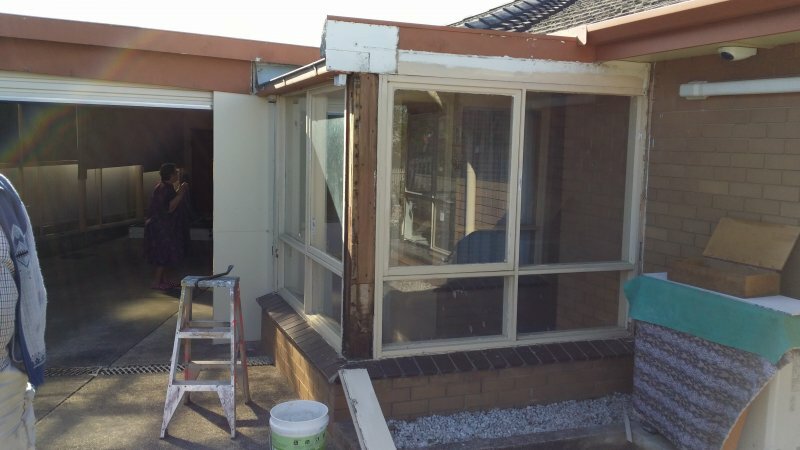 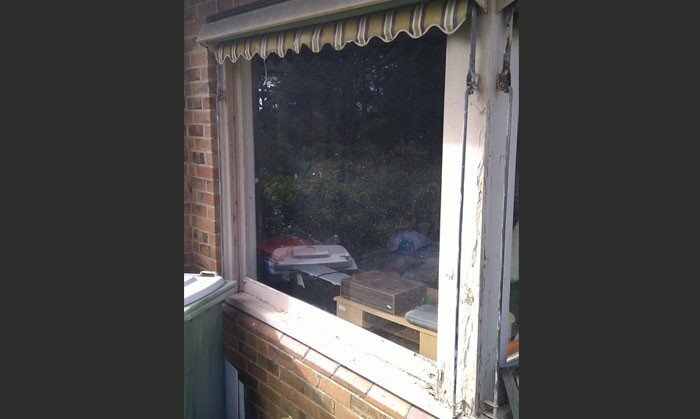 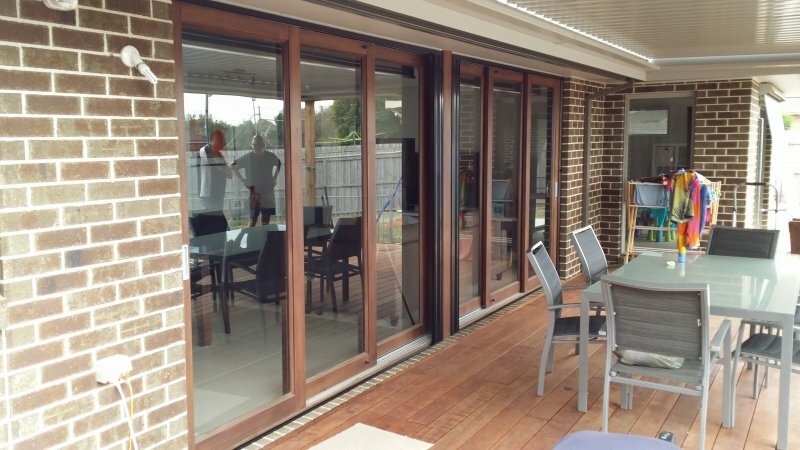 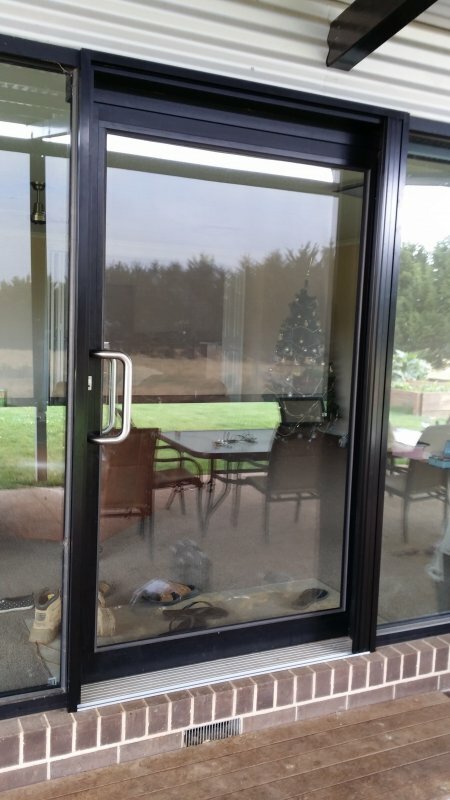 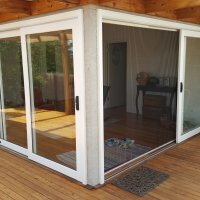 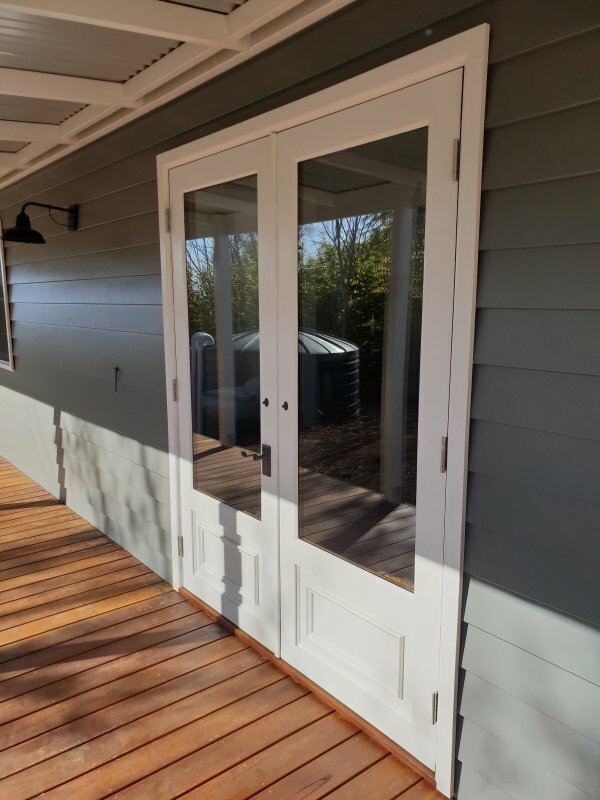 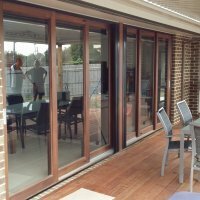 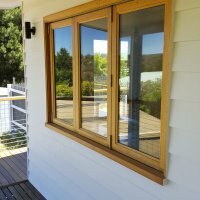 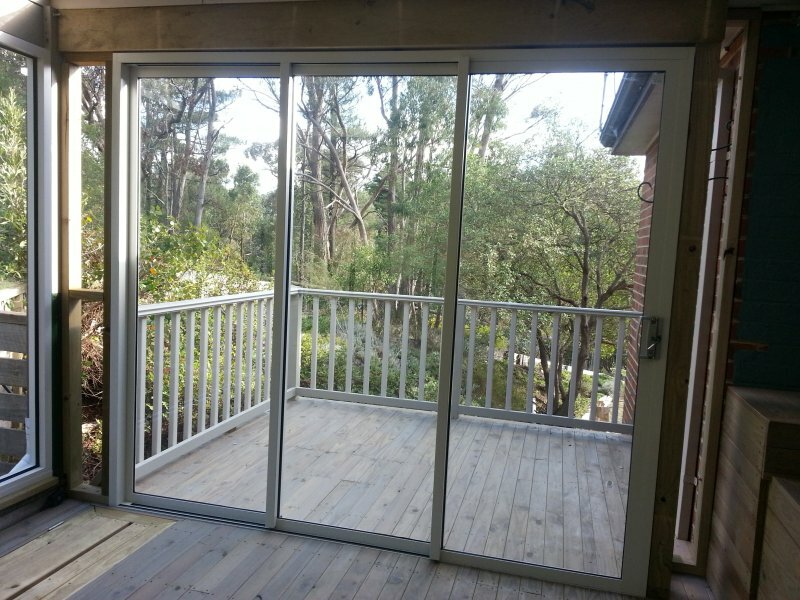 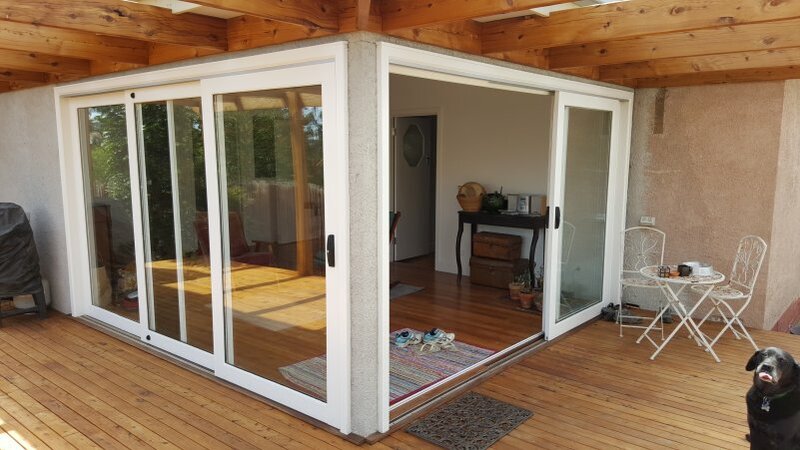 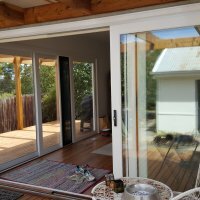 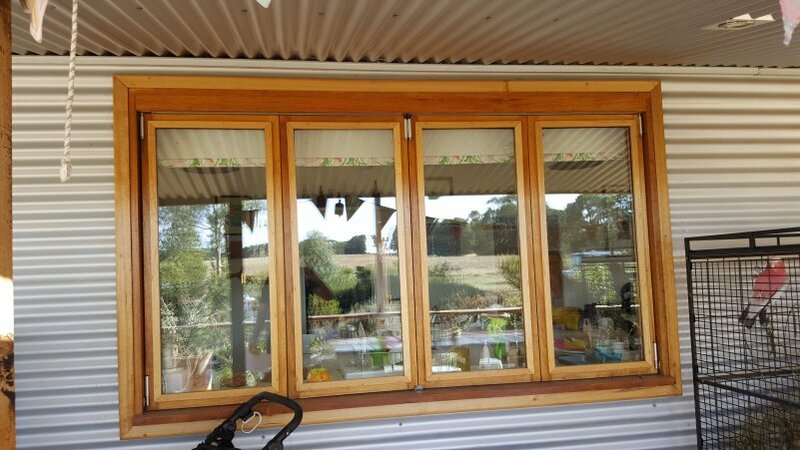 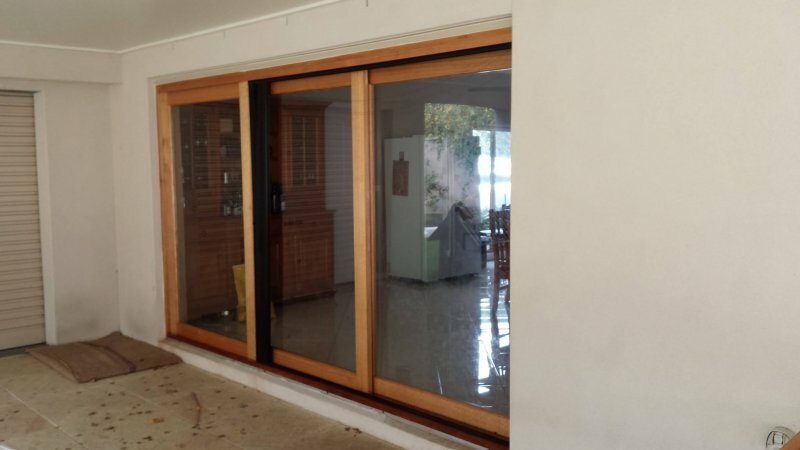 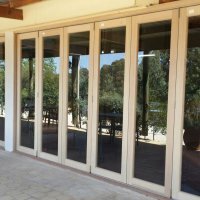 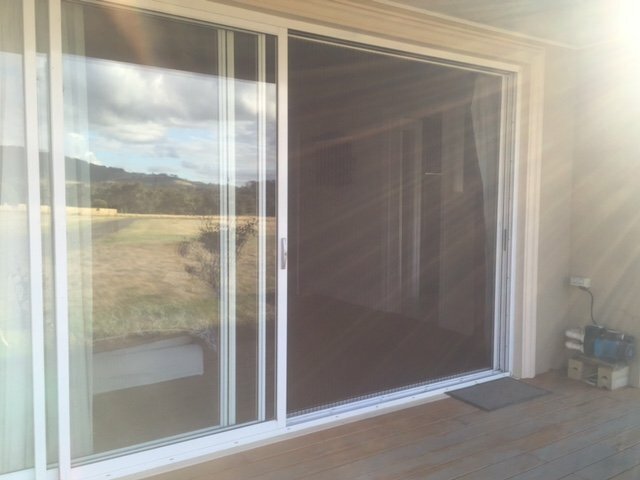 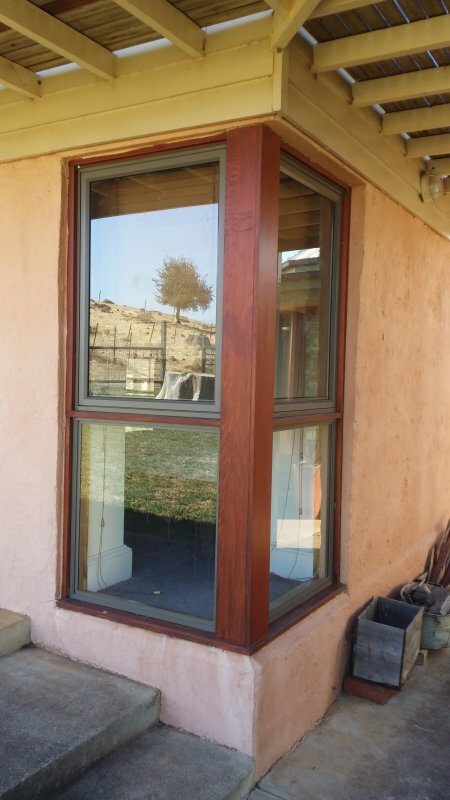 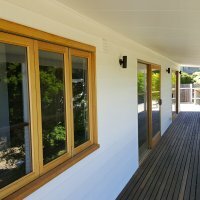 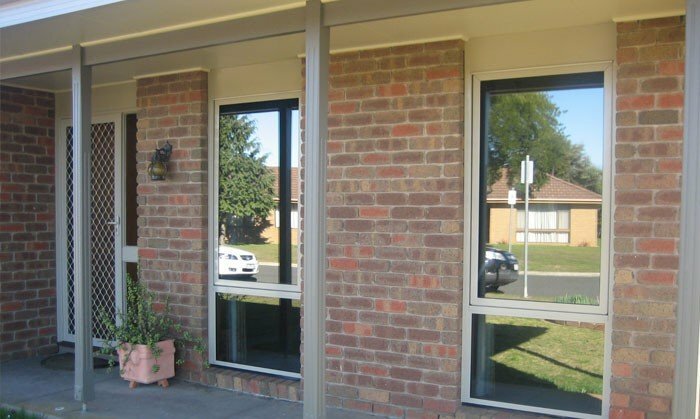 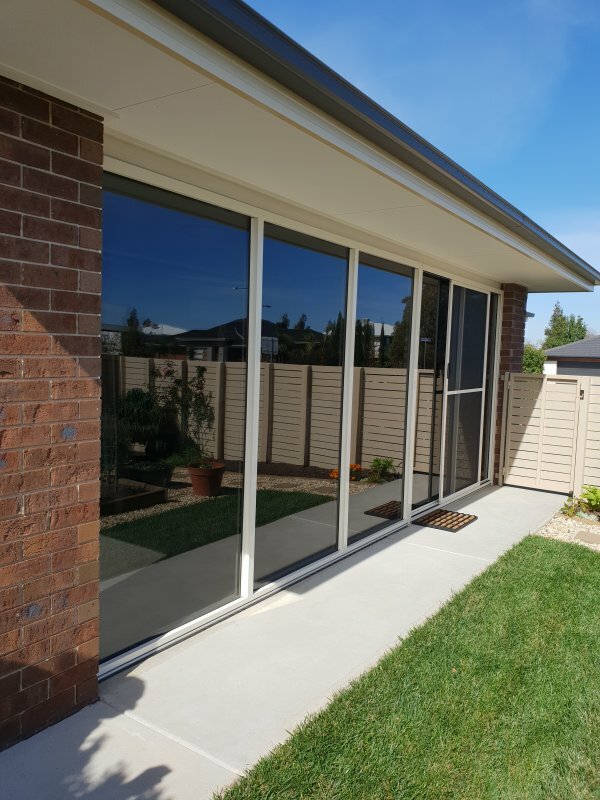 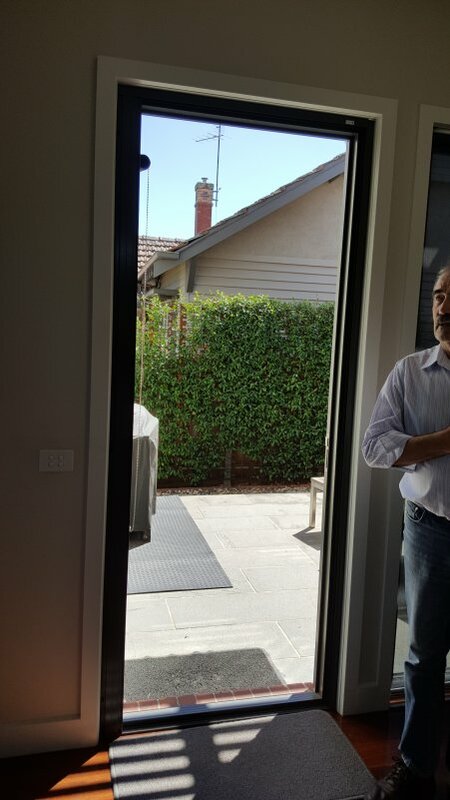 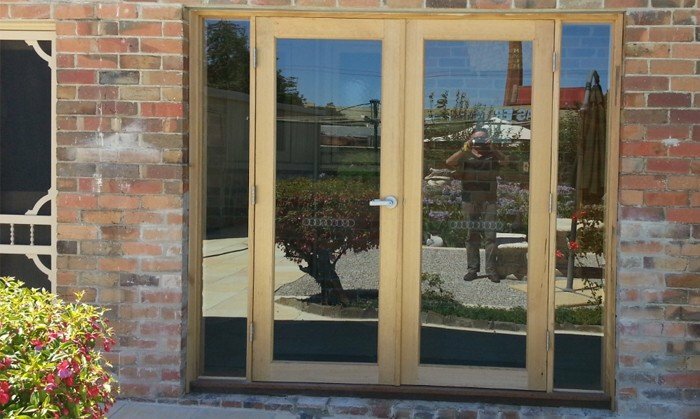 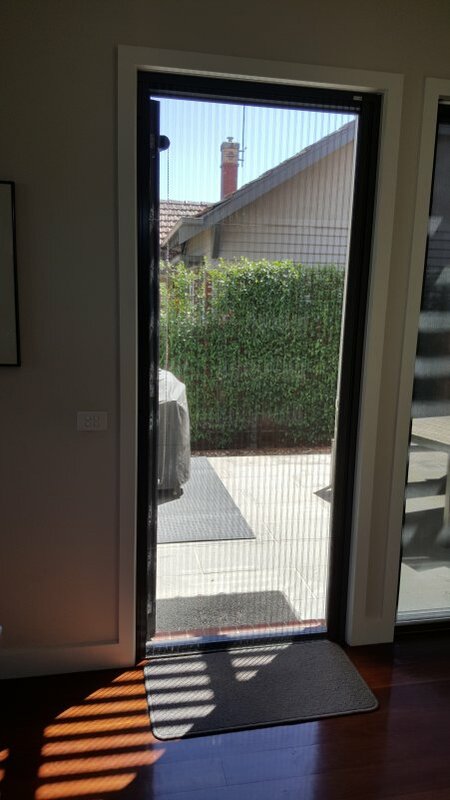 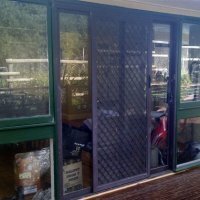 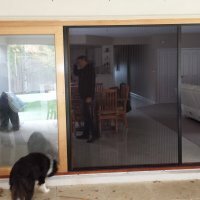 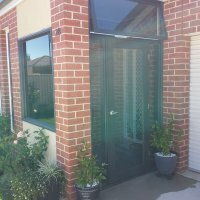 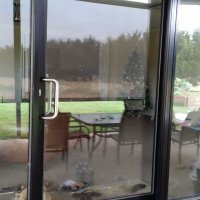 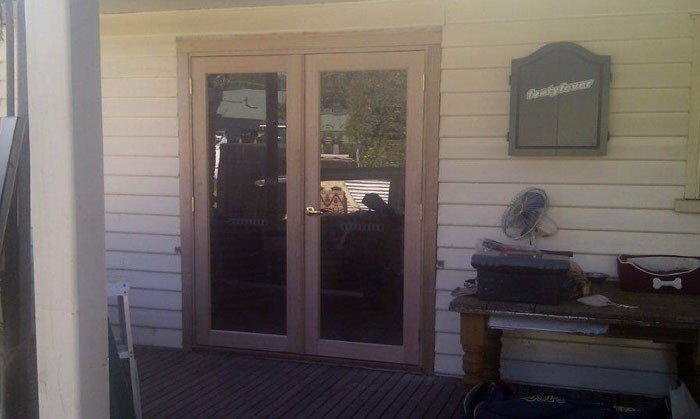 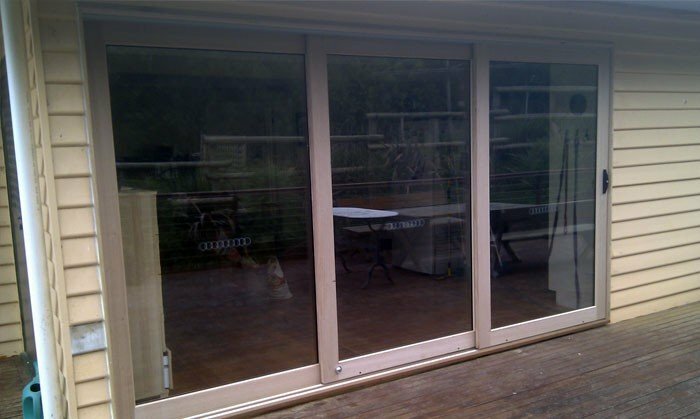 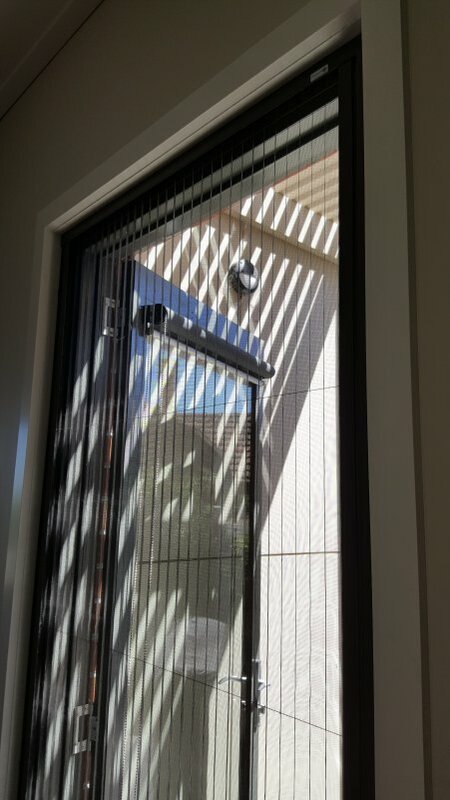 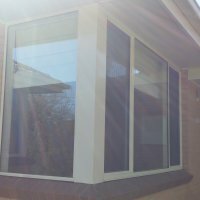 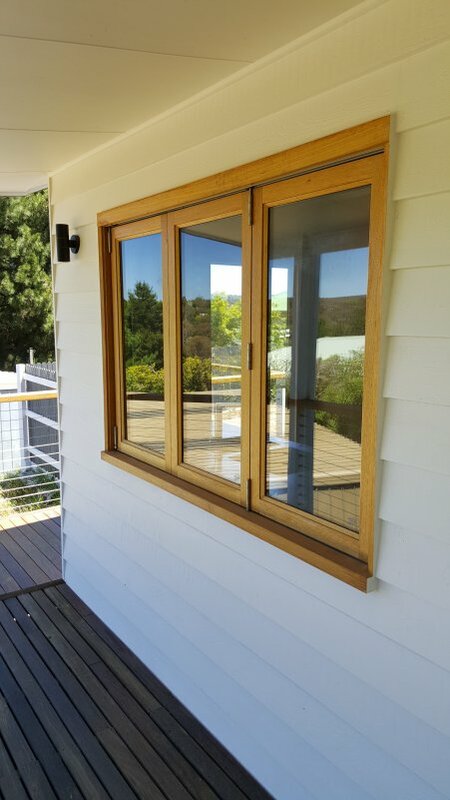 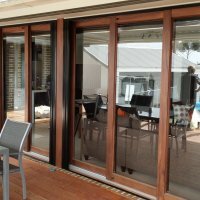 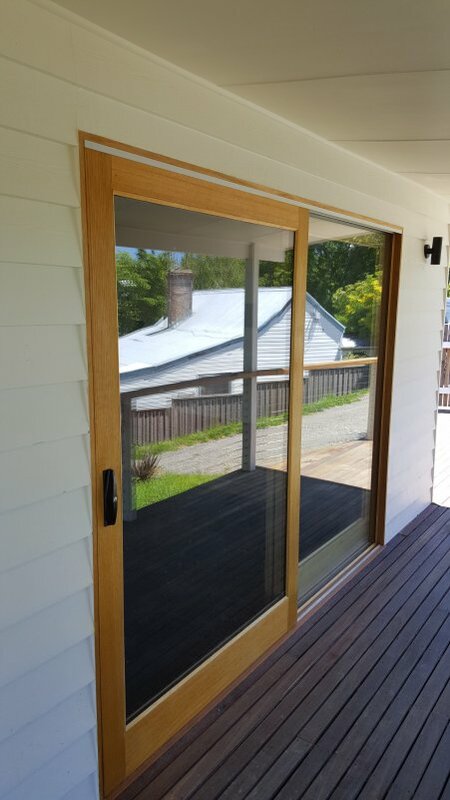 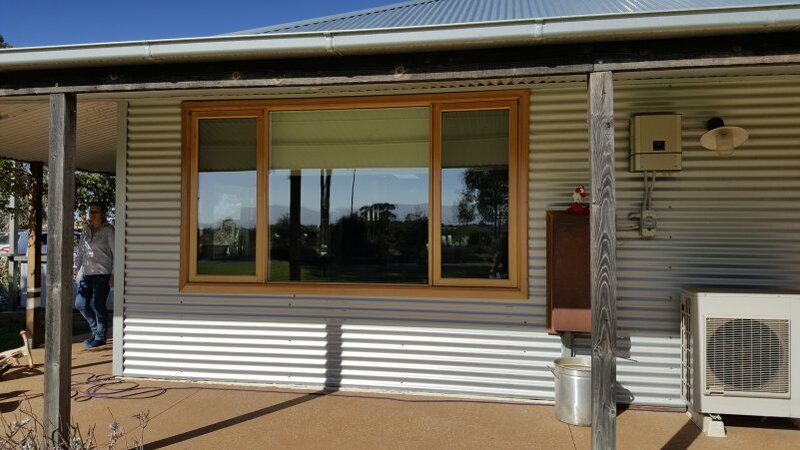 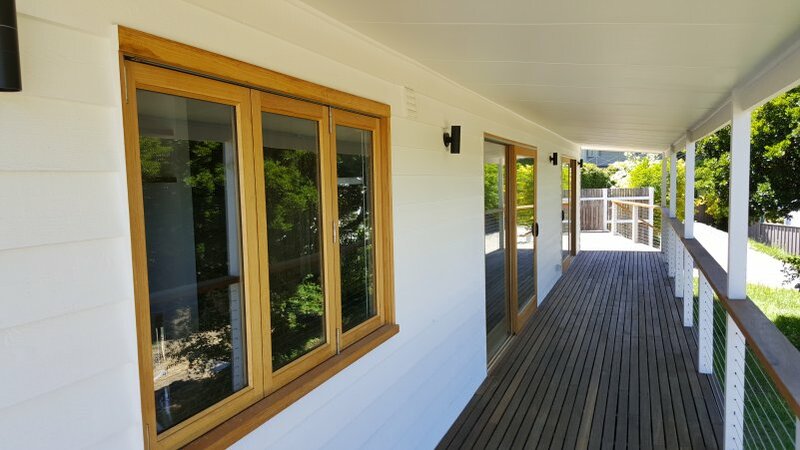 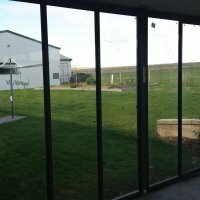 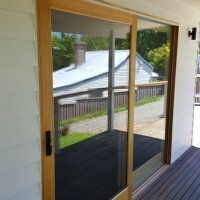 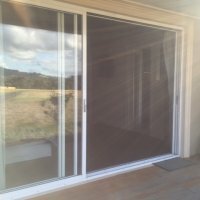 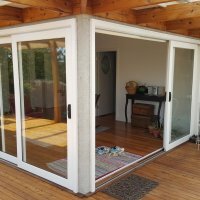 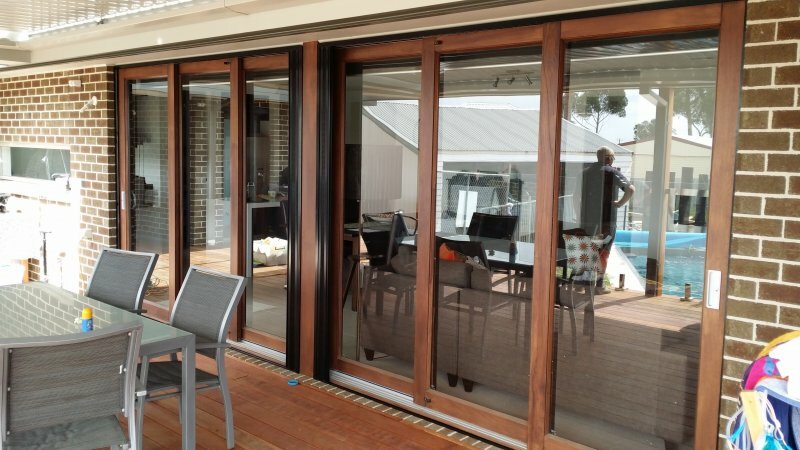 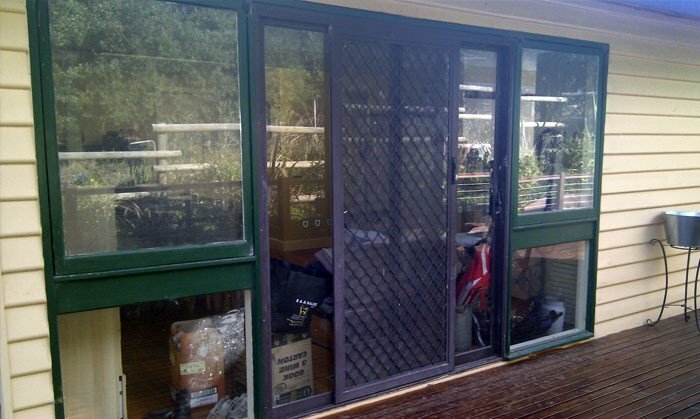 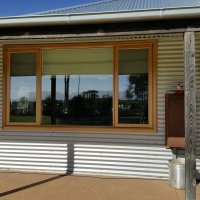 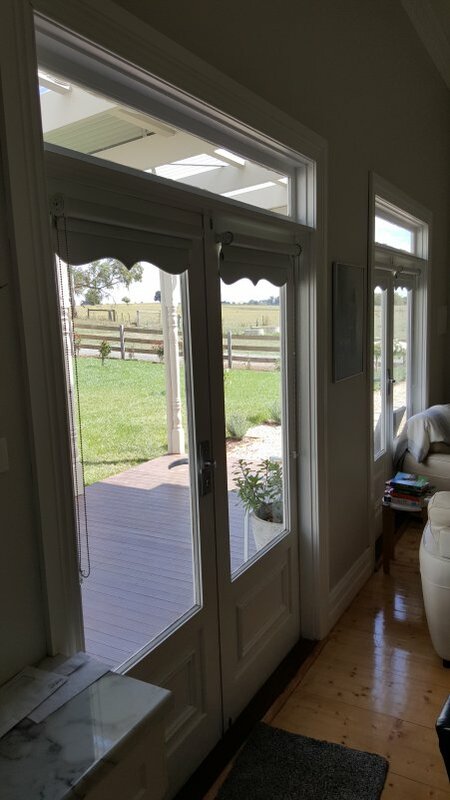 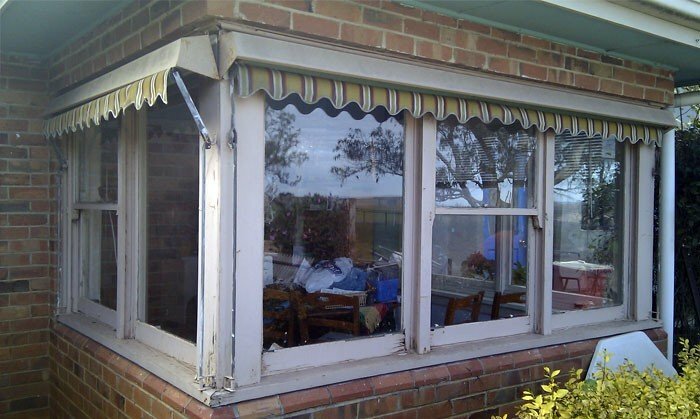 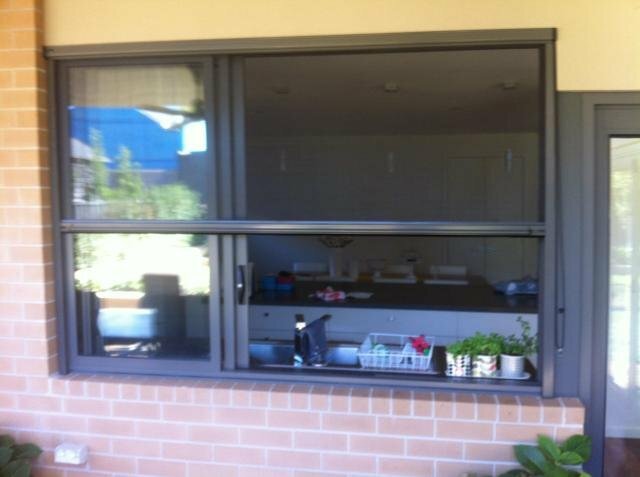 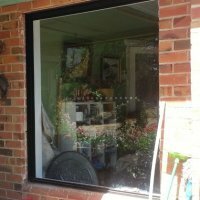 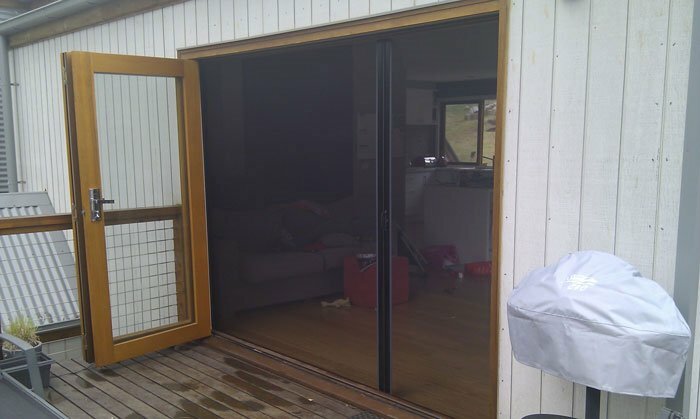 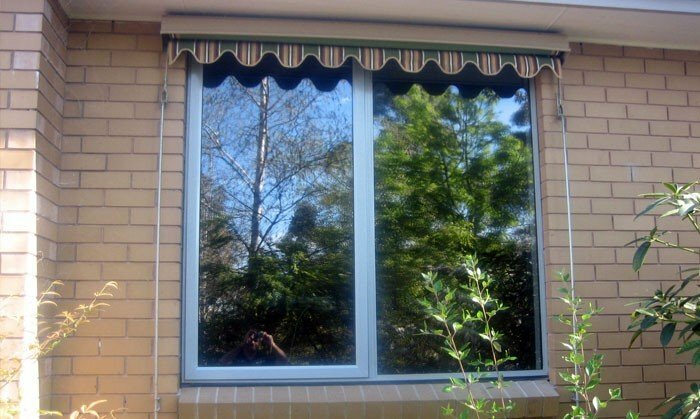 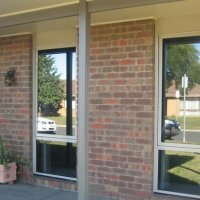 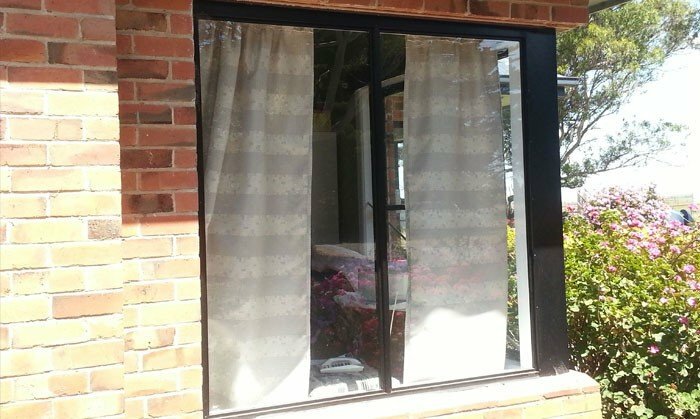 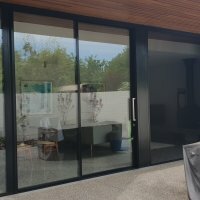 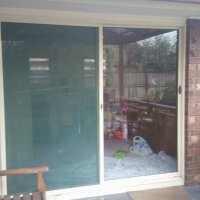 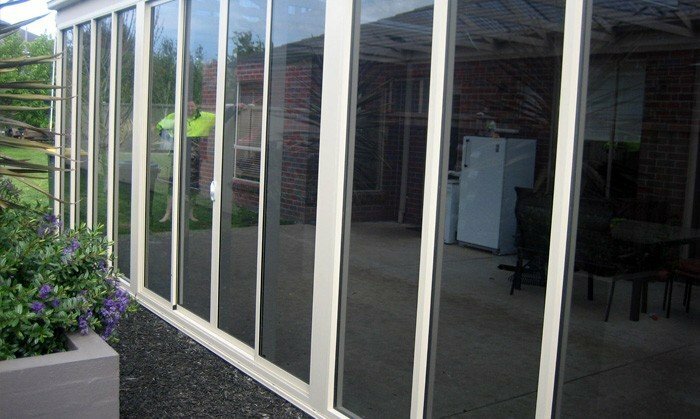 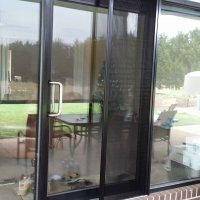 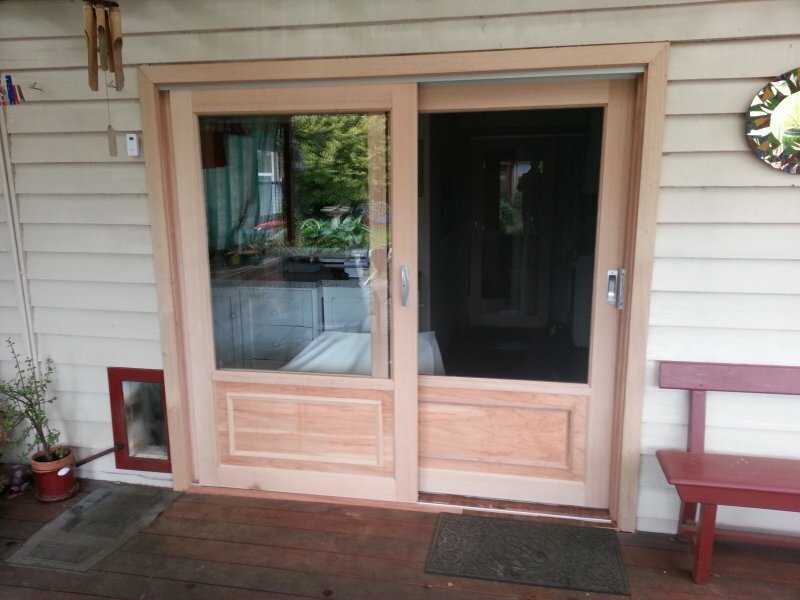 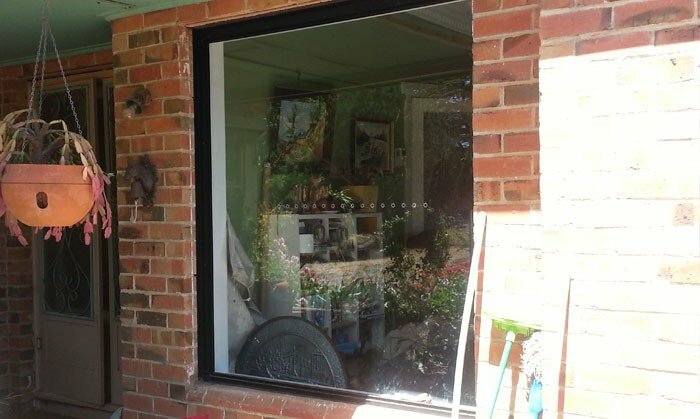 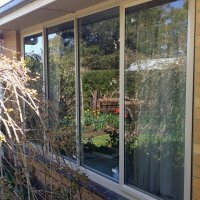 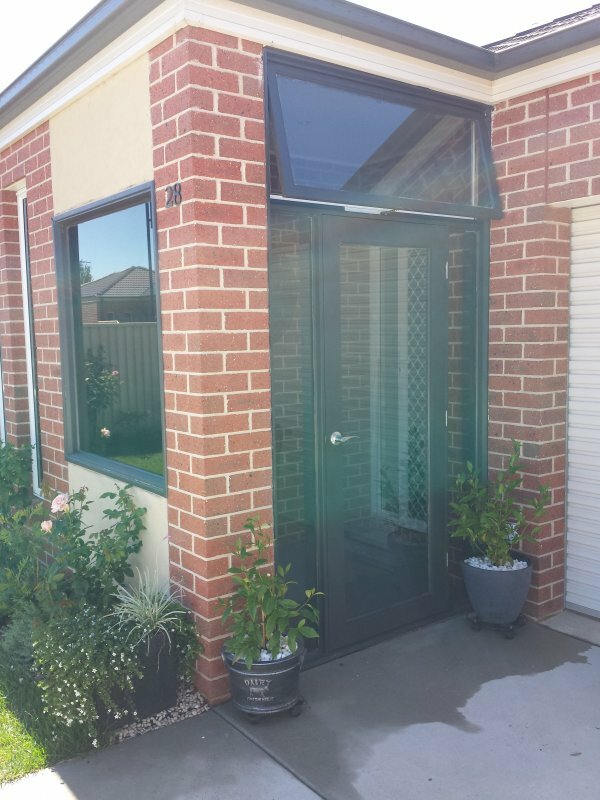 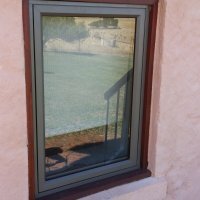 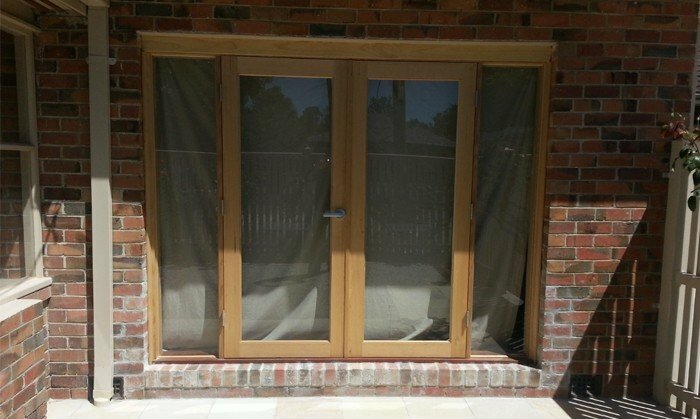 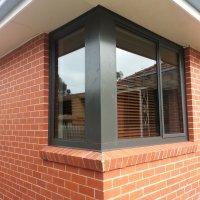 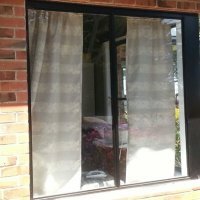 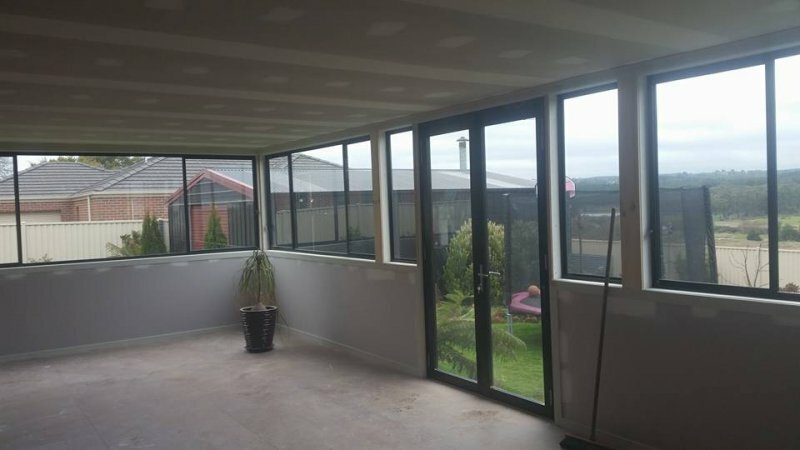 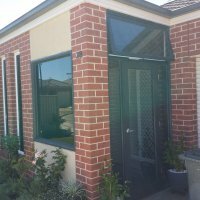 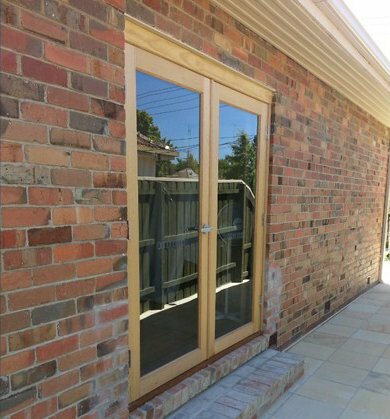 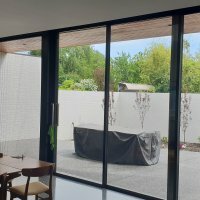 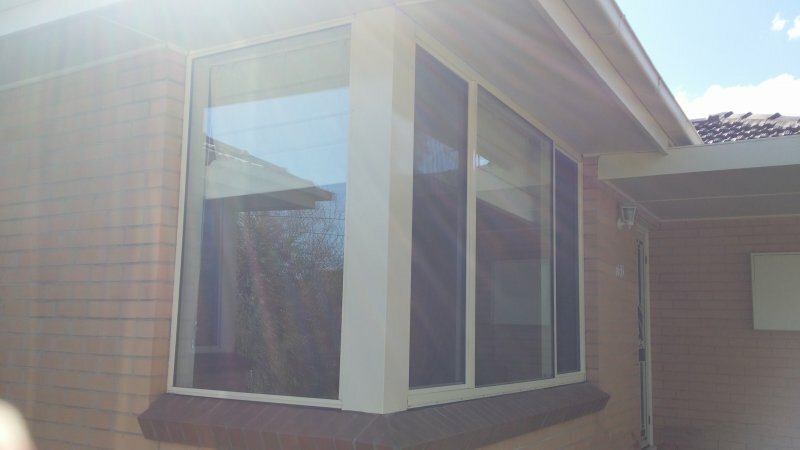 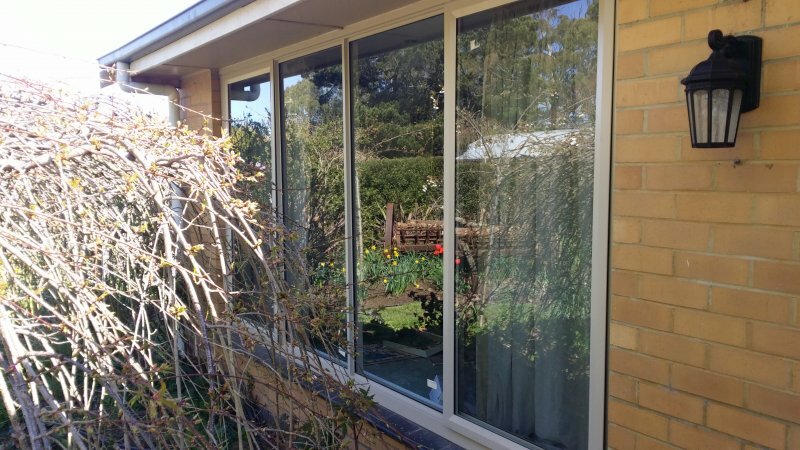 If you already have your windows and doors installed we can come out and fit our retractable insect / flydoor screens to existing windows and doors, we service Ballarat Geelong and Melbourne. 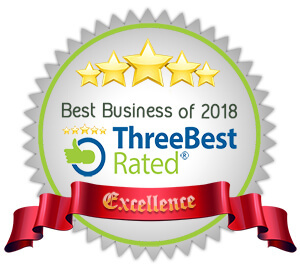 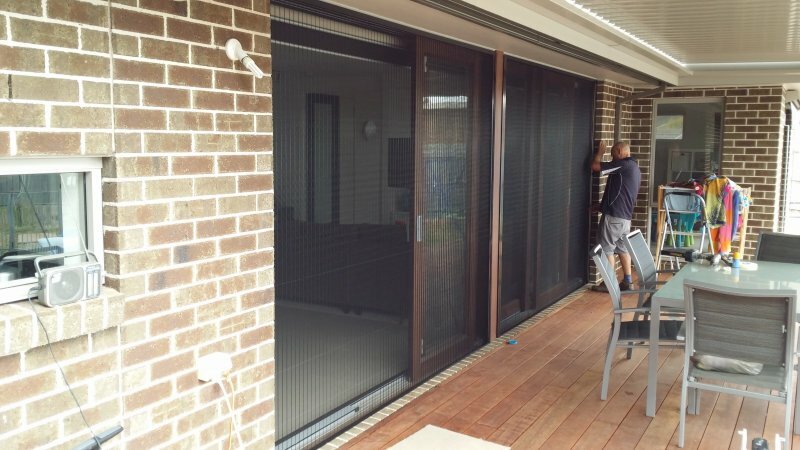 We provide free quotes that include measure, supply and installation using our professional team, this gives our customers a warranty on the products performance and ensures a stress free experience. 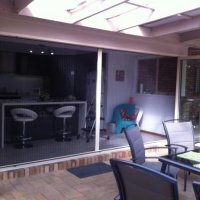 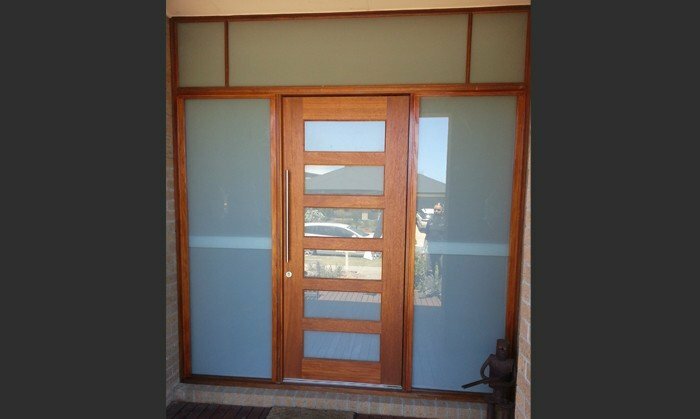 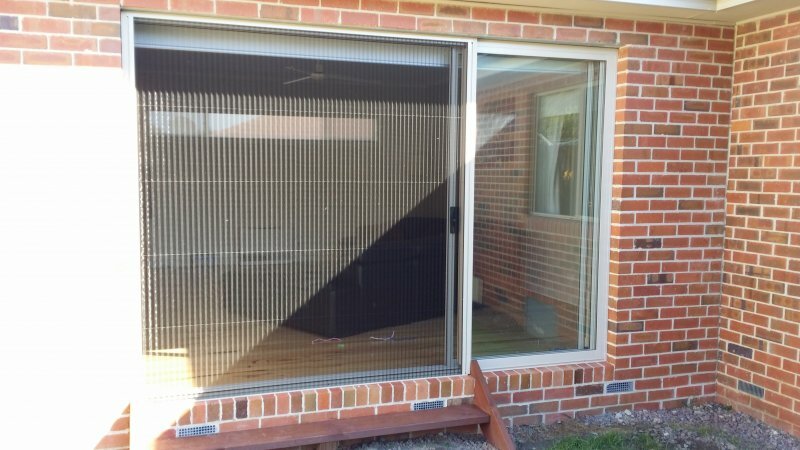 Retractable insect screens / flydoors - Geelong Ballarat and Melbourne - call for your free measure and quote. 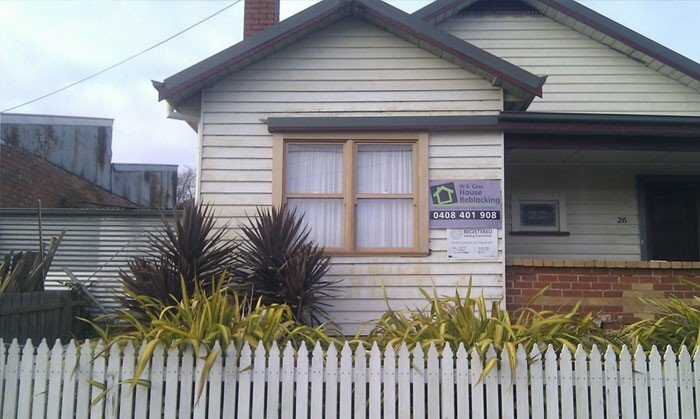 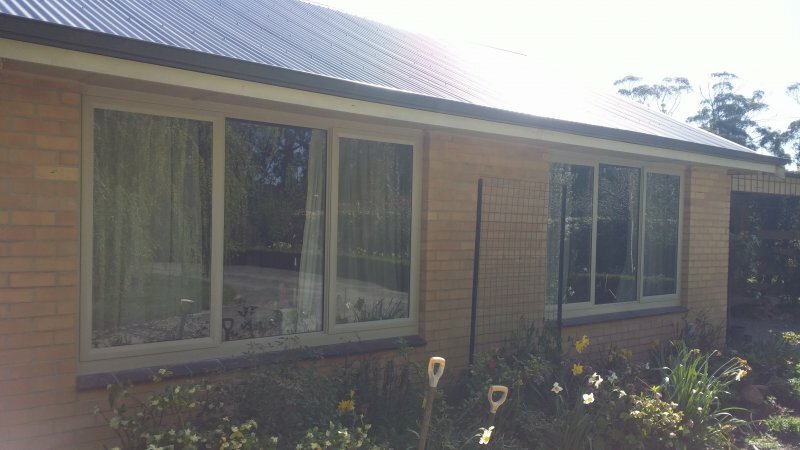 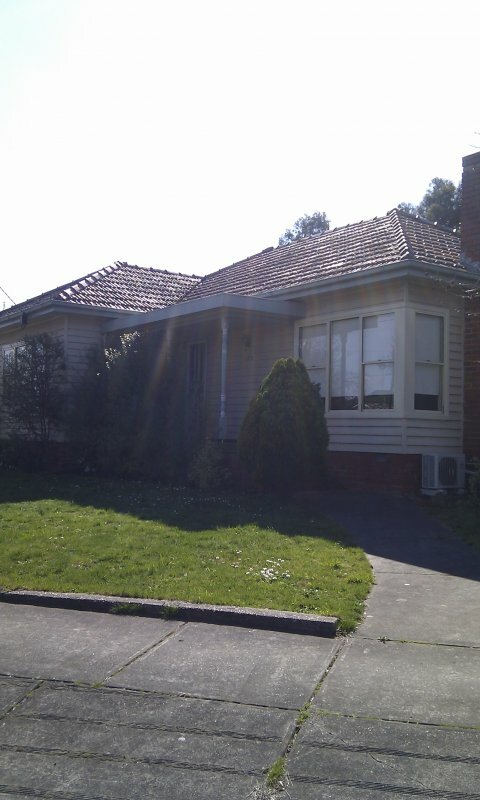 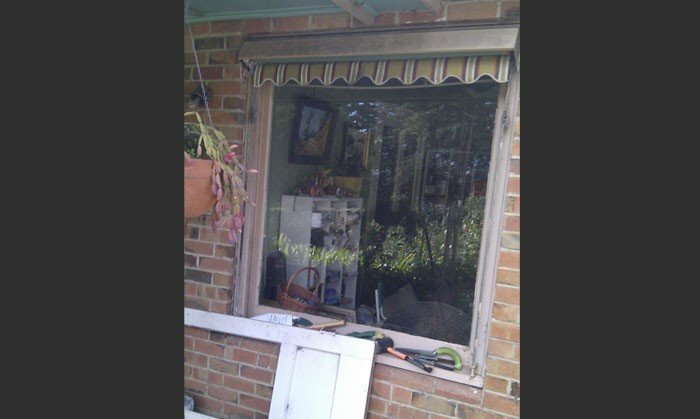 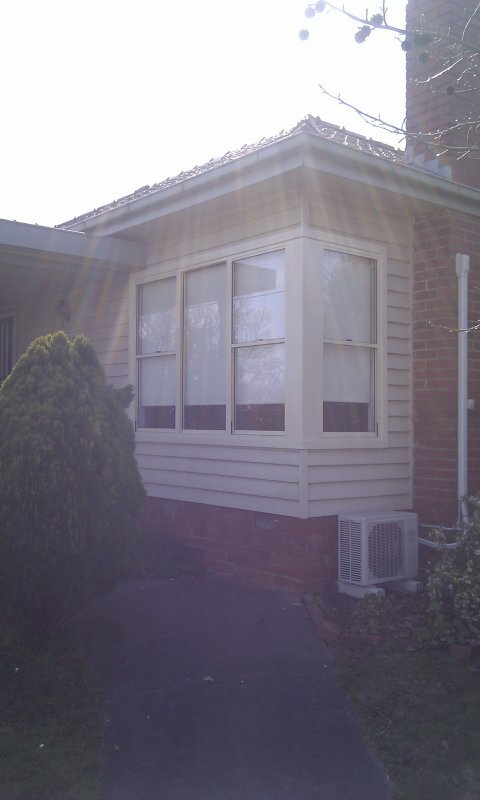 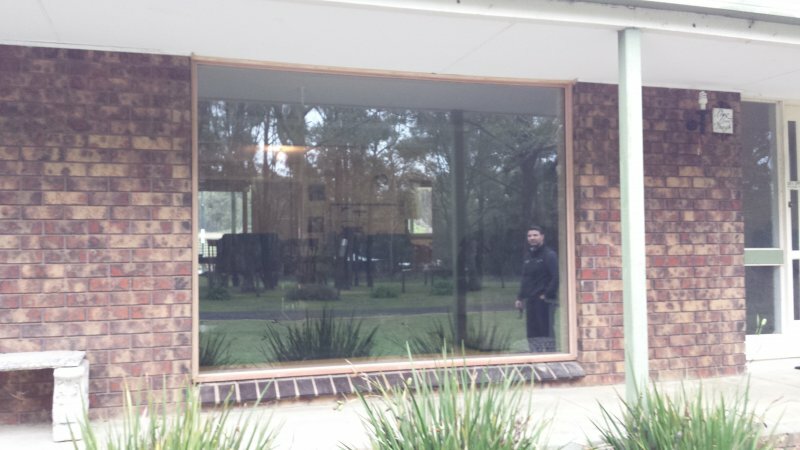 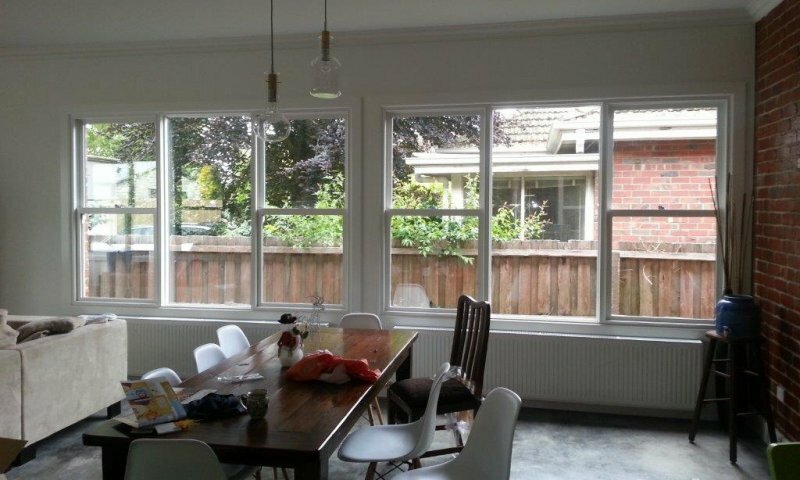 Ballarat window replacement, timber double hung windows replaced with new aluminium awining windows and sliding door. 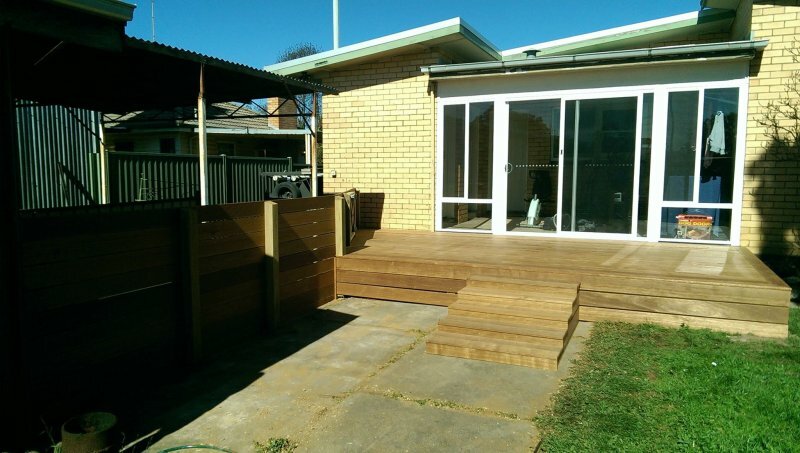 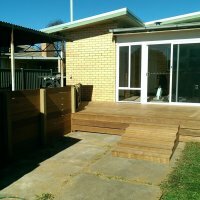 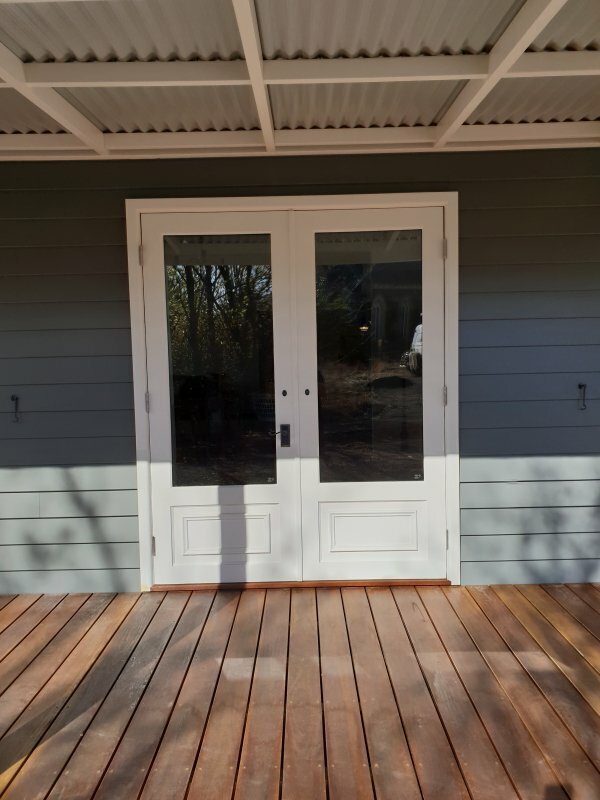 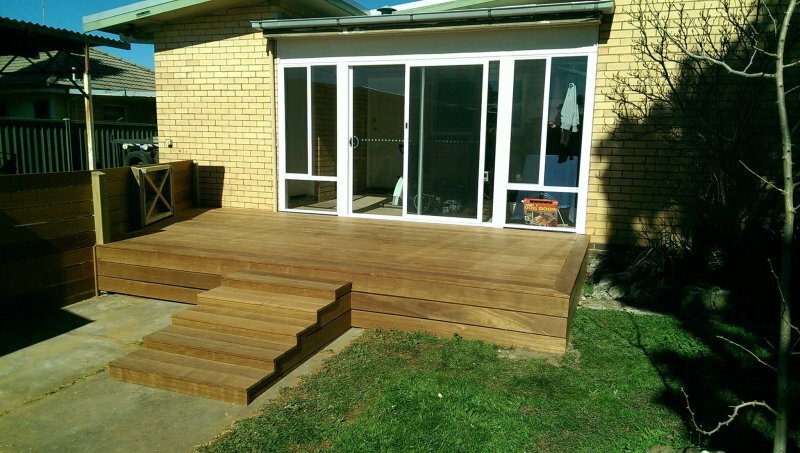 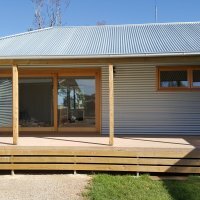 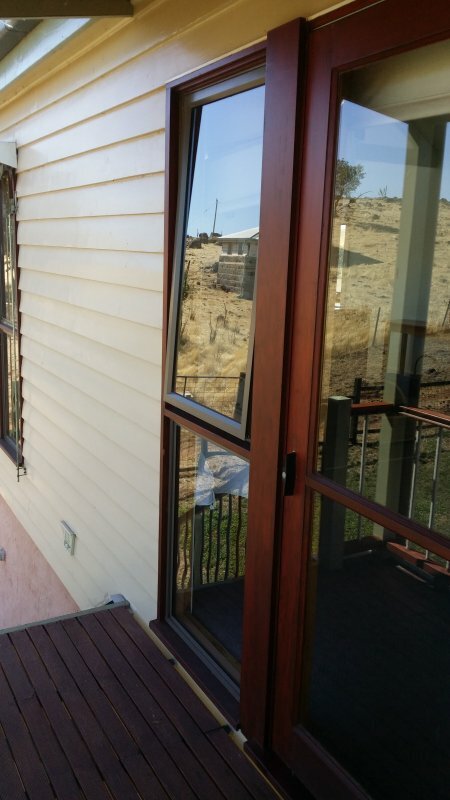 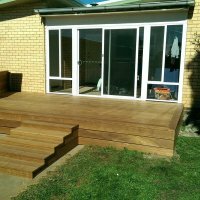 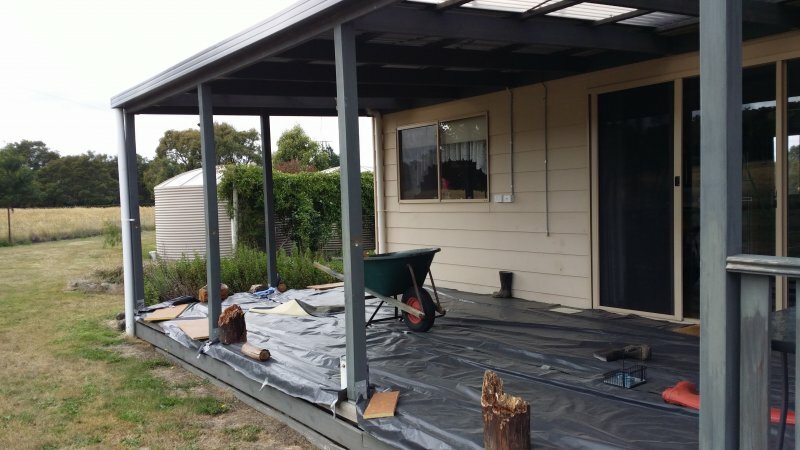 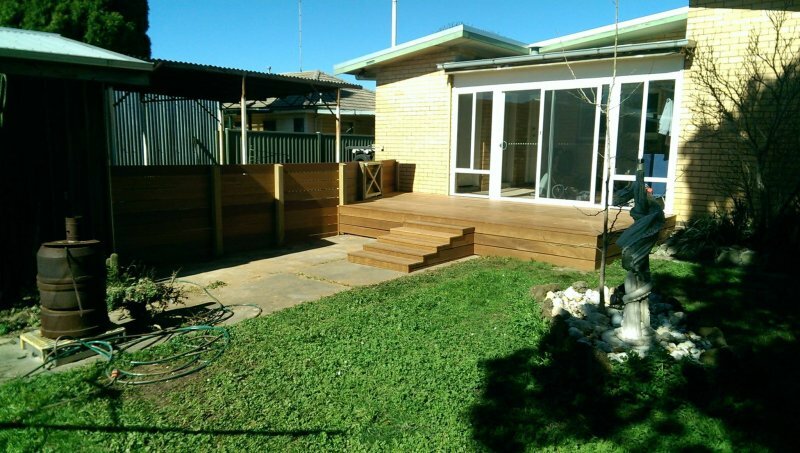 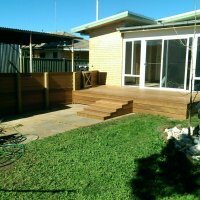 Replacement window and Sliding Door in Wendouree with Merbau decking - Deck done by Trevor Howard Building 0418 525 197 - Ballarat. 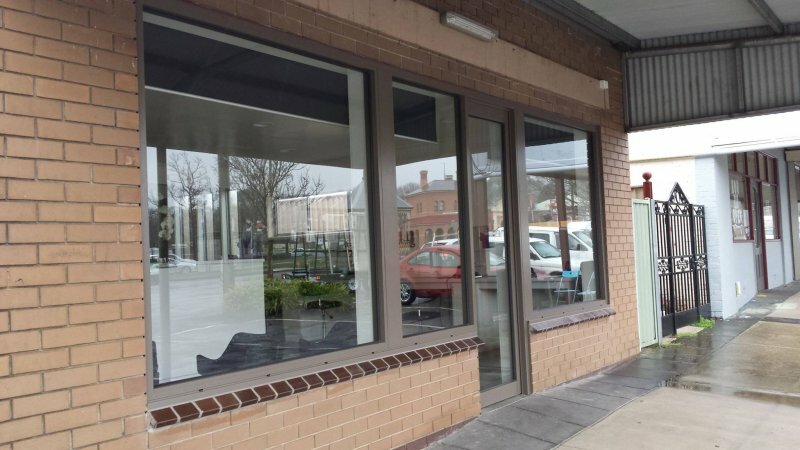 Hairdressers in Creswick, new modern shop front windows. 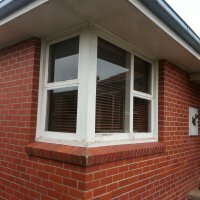 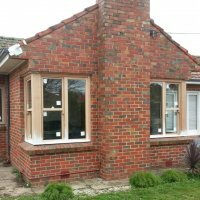 Aluminium Double Hung Window replacement Creswick - Aluminium Architrave fitted to external surround to keep the period look. 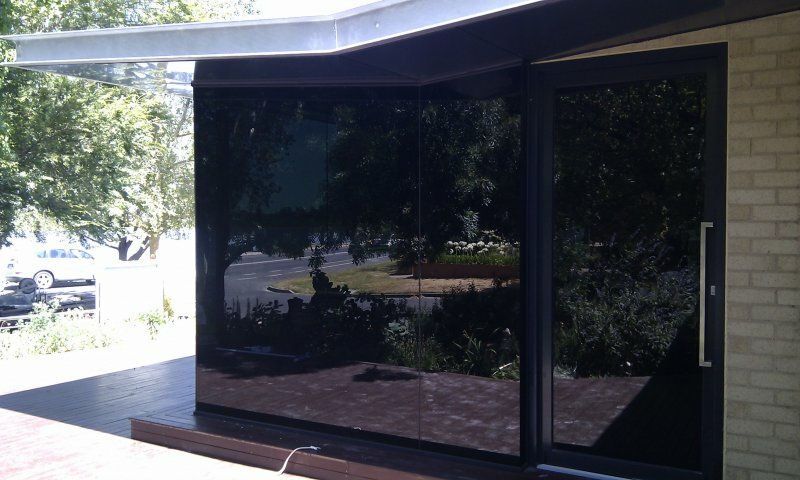 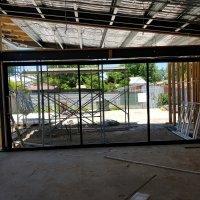 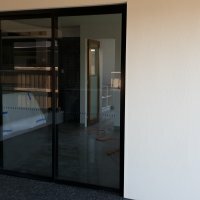 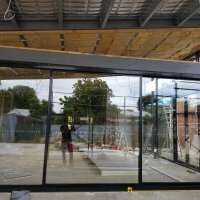 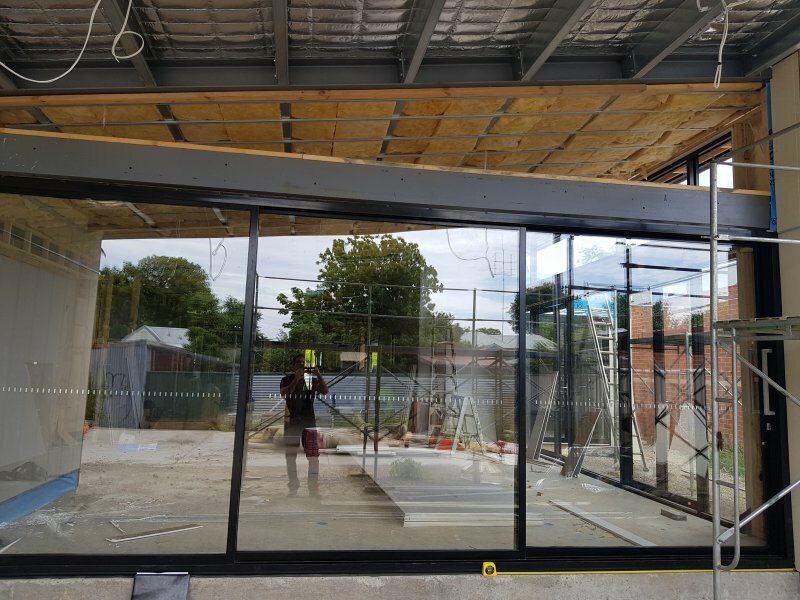 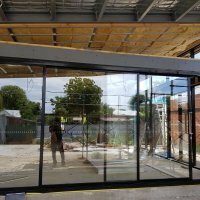 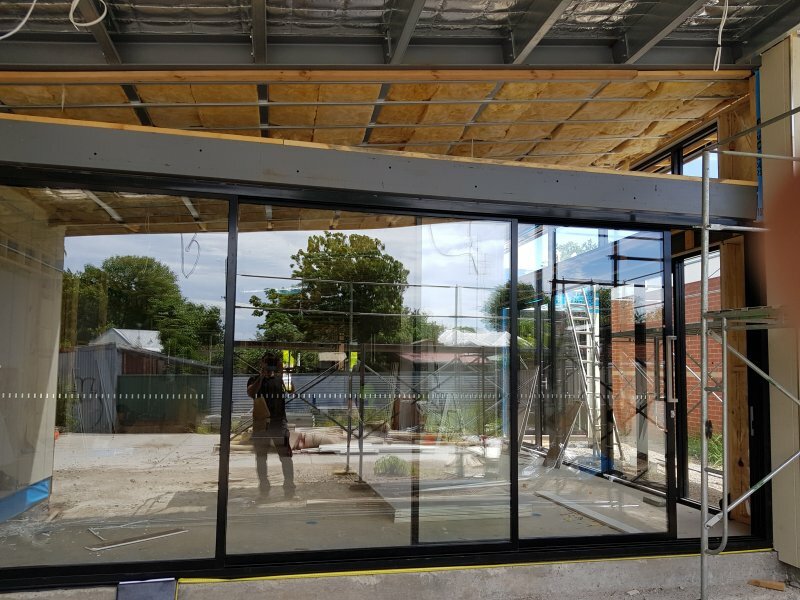 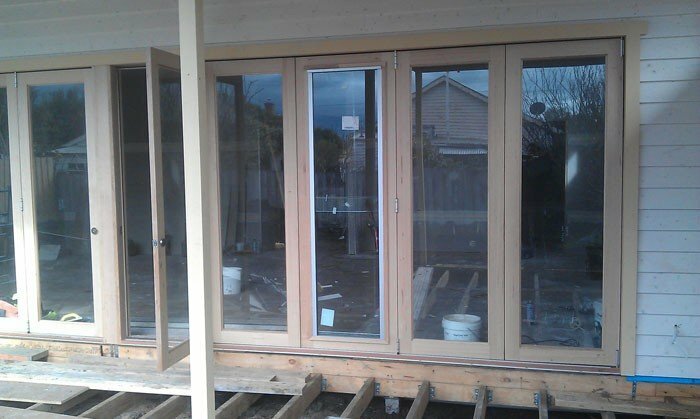 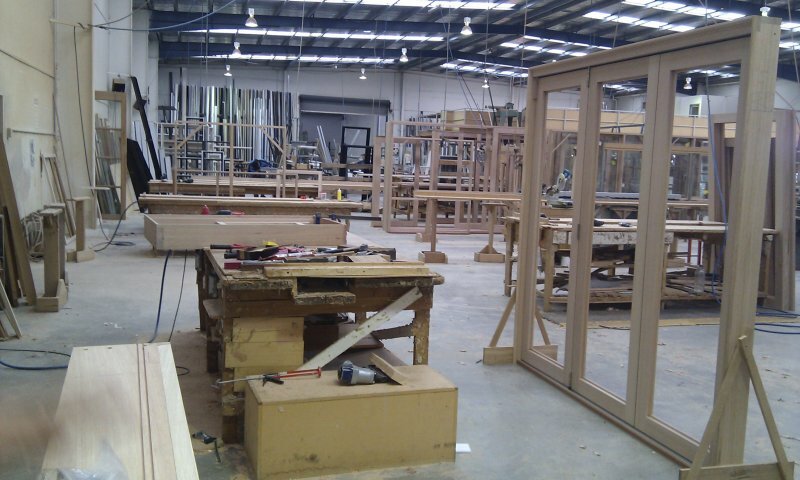 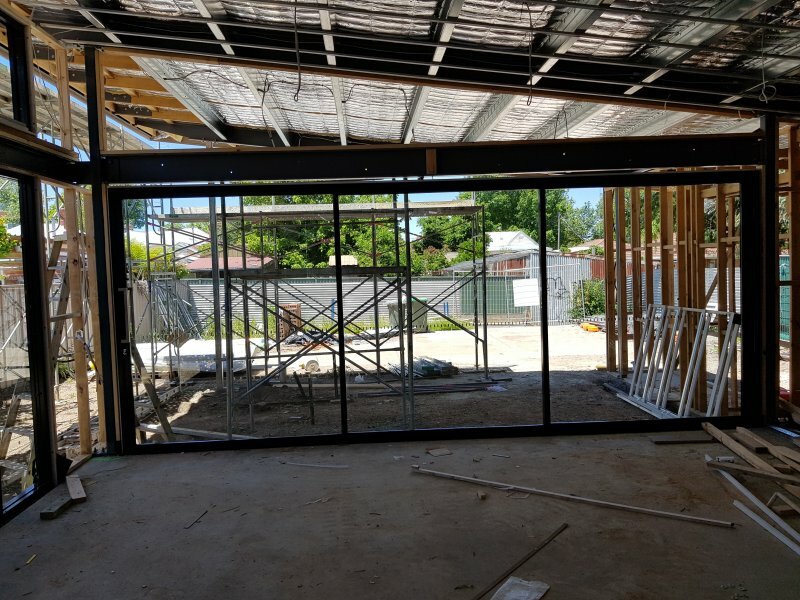 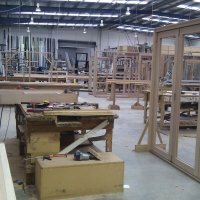 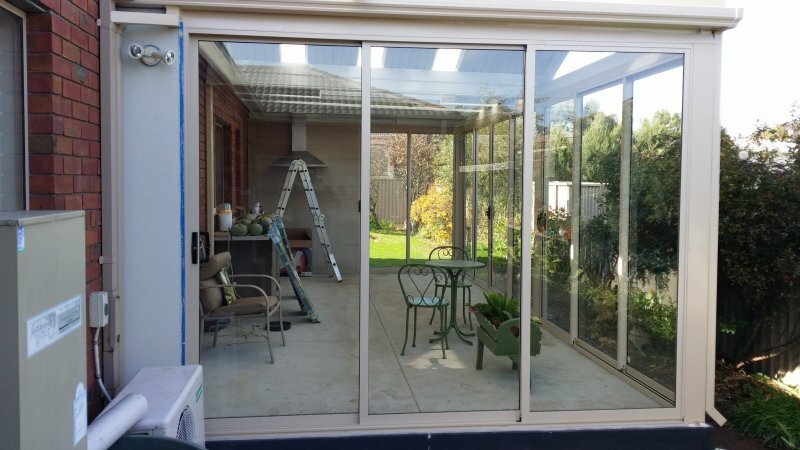 Geelong Bi-Fold door - During construction. 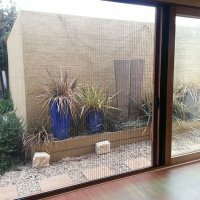 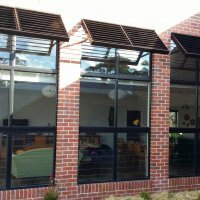 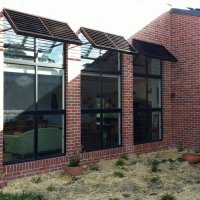 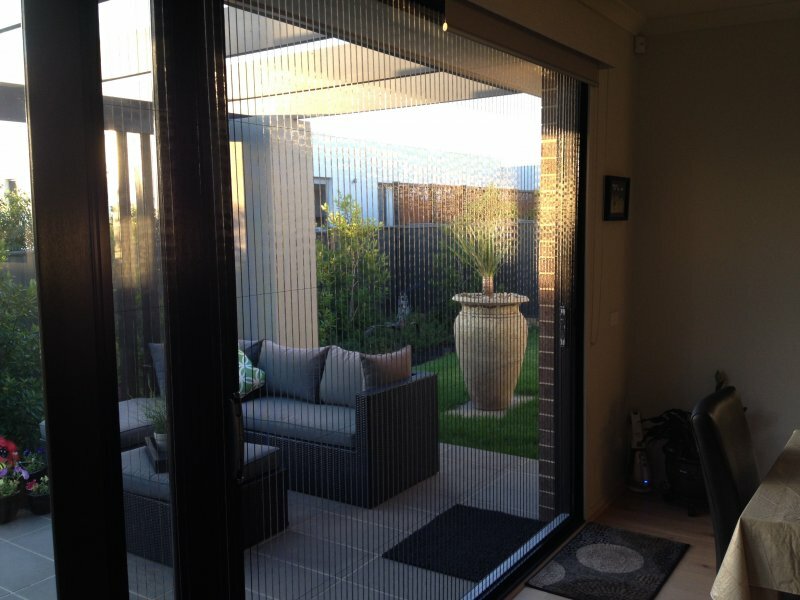 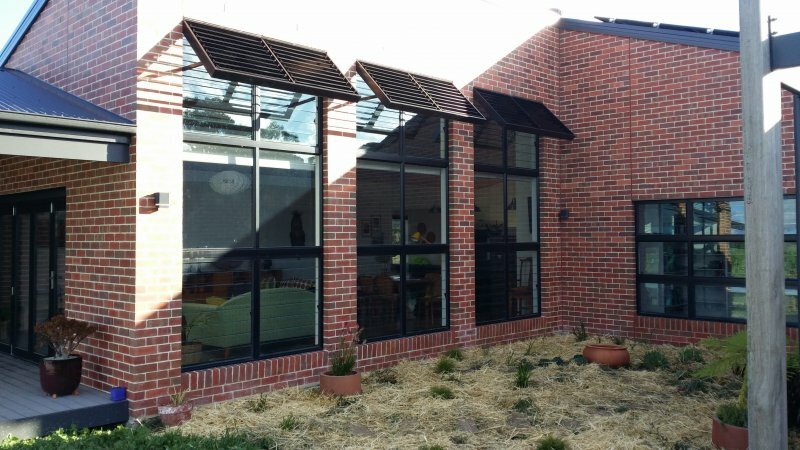 Retractable insect screens Geelong. 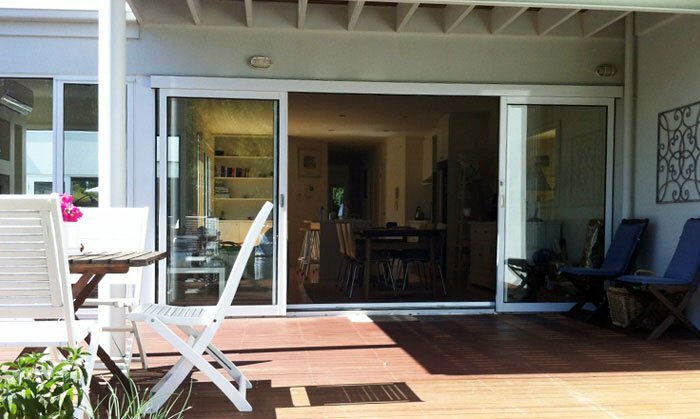 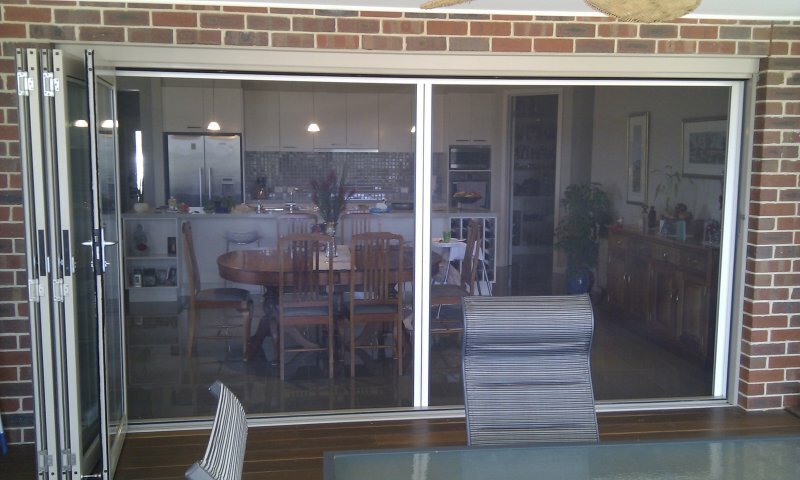 Retractable flyscreens are the perfect way to compliment a large opening Bi-Fold Door. 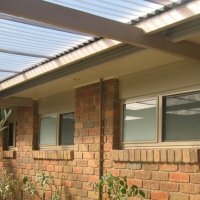 These products are also ideal for Pergola infills or Alfresco infills. 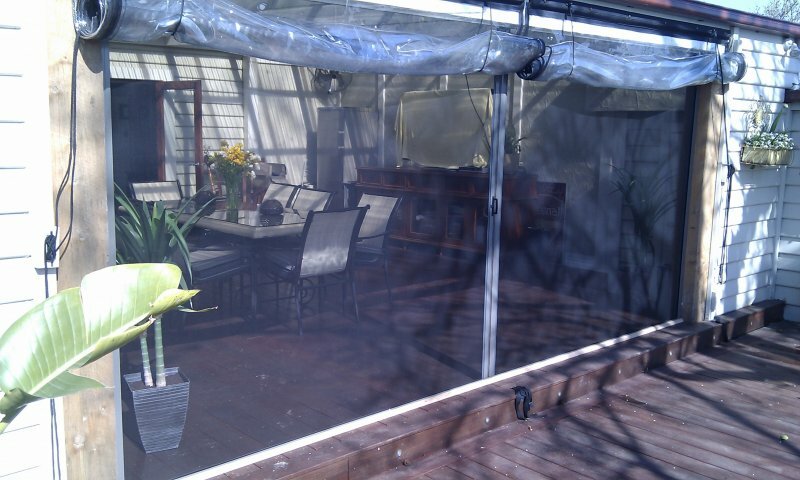 with or without our retractable flyscreenscreens they give an indoor / outdoor living space that is hard to match. 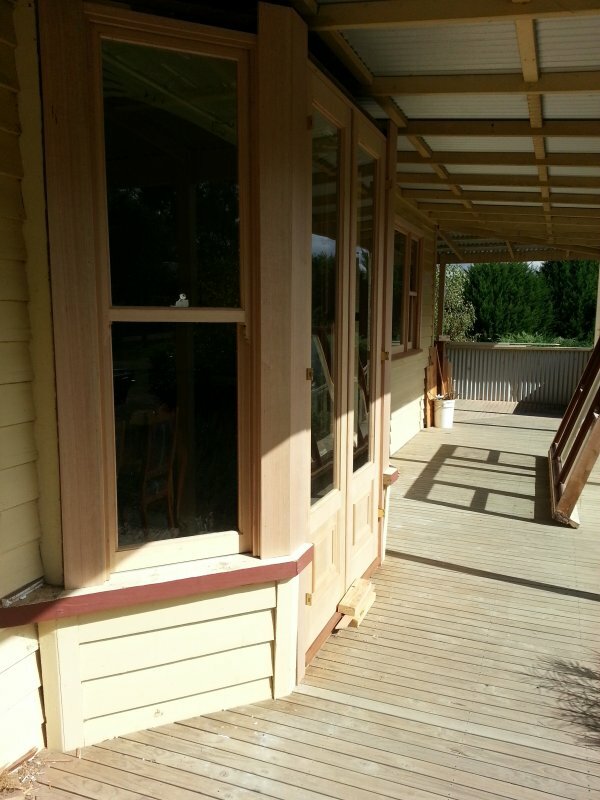 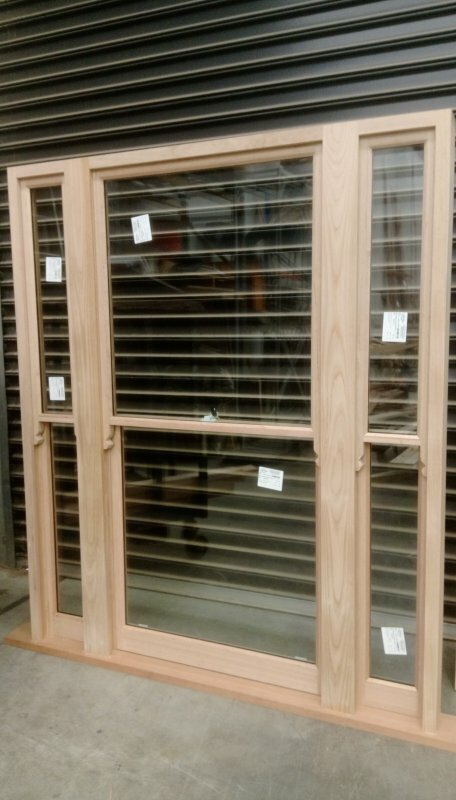 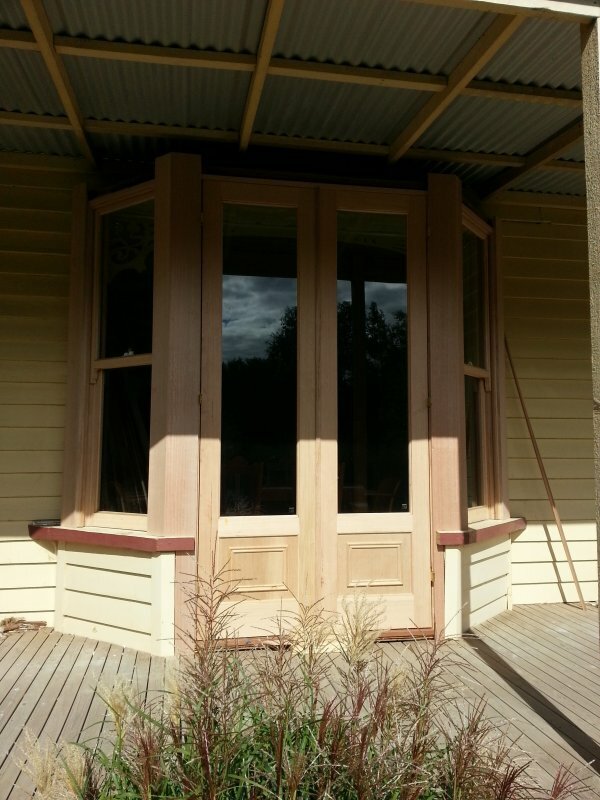 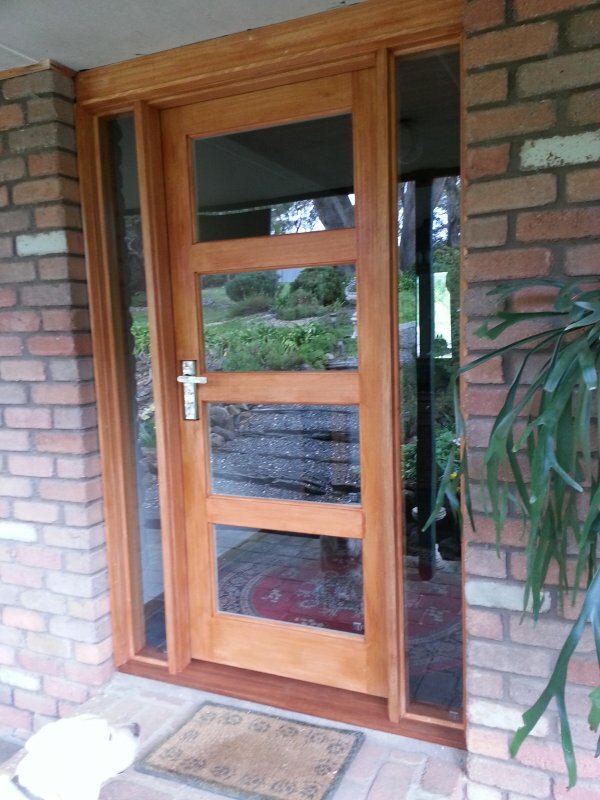 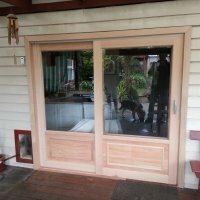 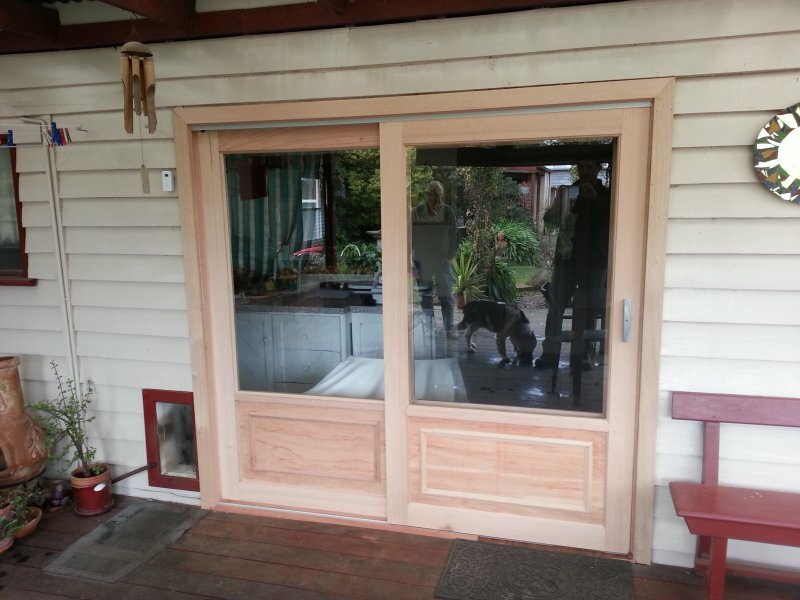 Timber stacking door and traditional double hung window - Ballarat. 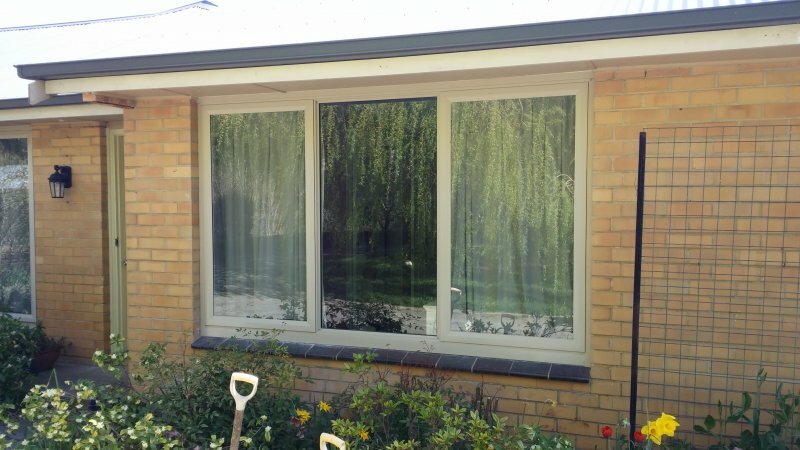 Replacement job in Ballarat Timber double hung windows replaced with sliding windows with external aluminium architraves, the new look gives the house a neat finish with no ongoing maintenance. 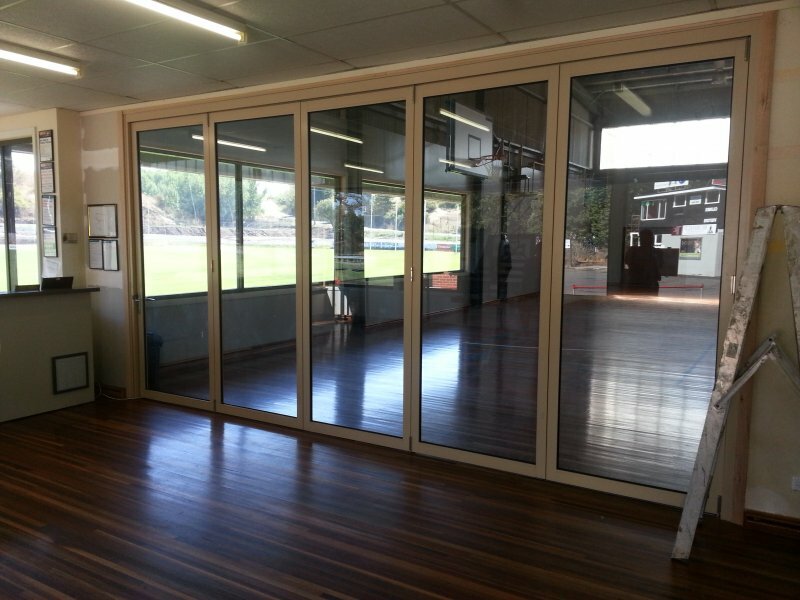 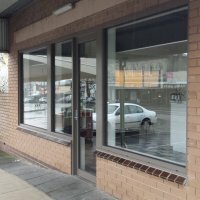 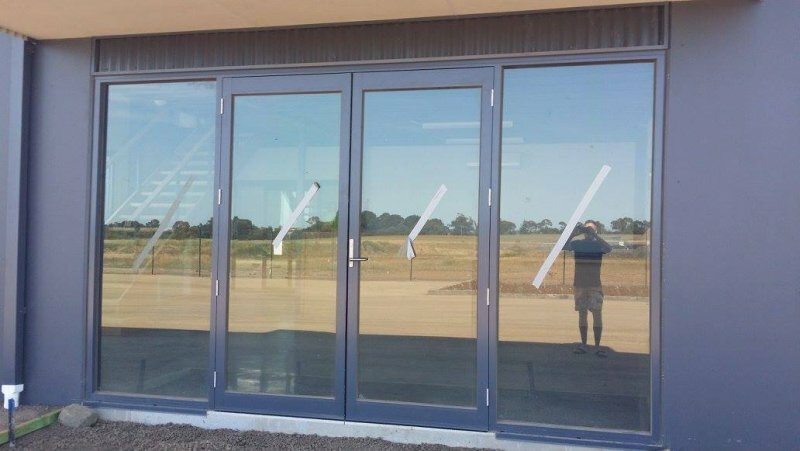 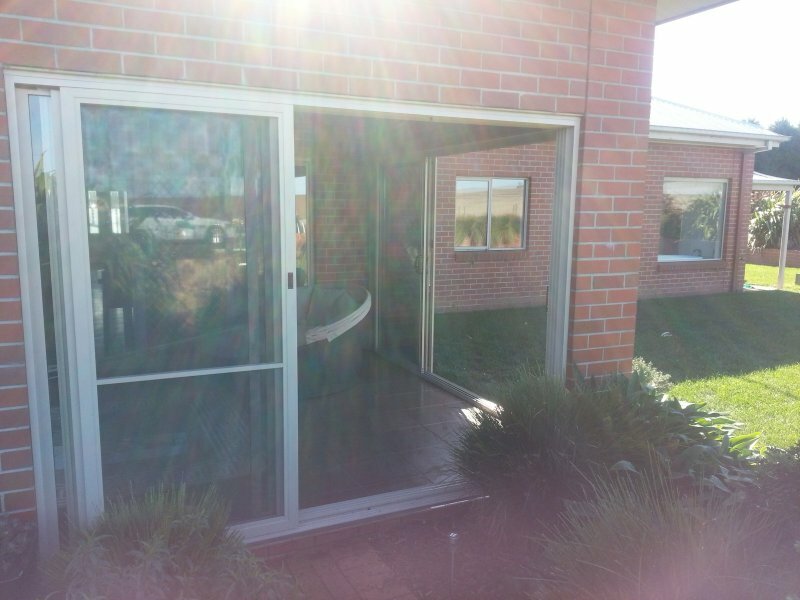 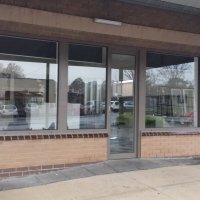 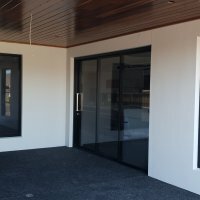 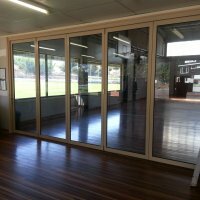 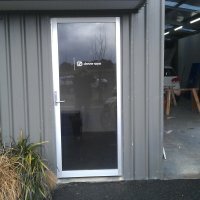 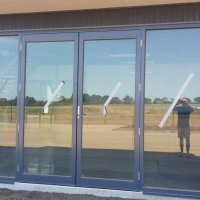 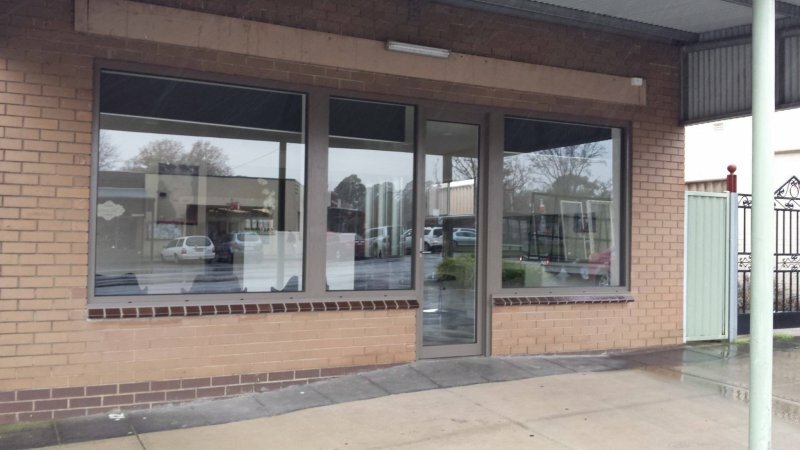 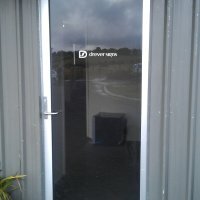 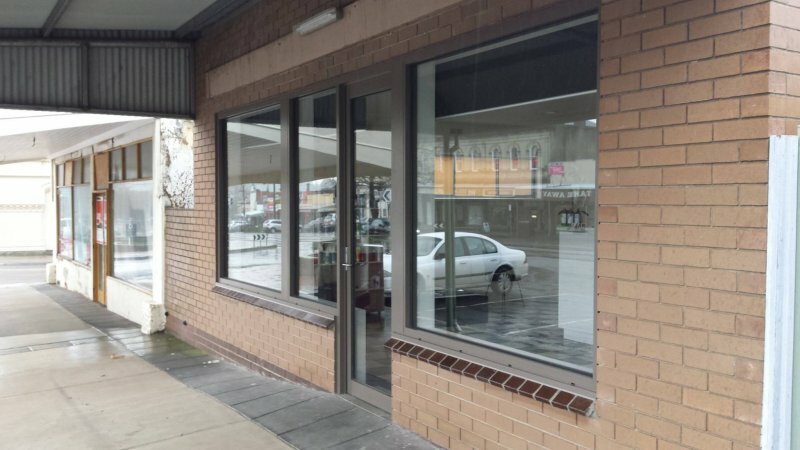 Commercial windows Ballarat, stacking doors all fitted with retractable screen. 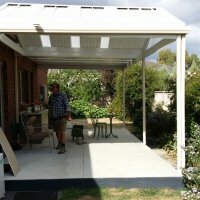 Pergola infill Ballarat. 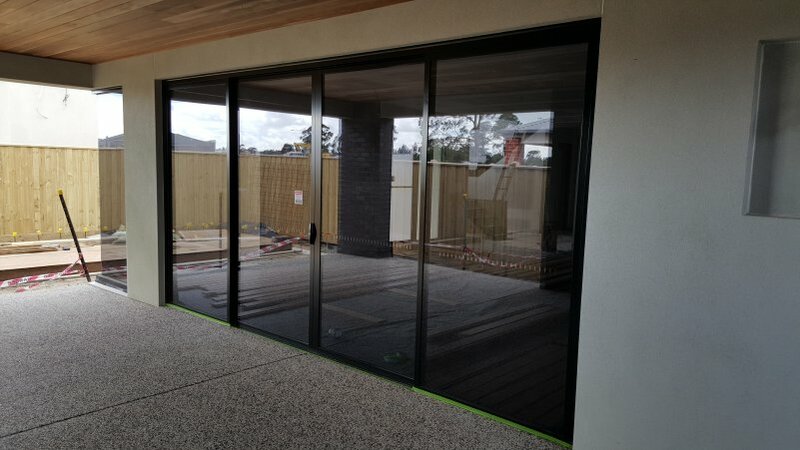 Aluminium Stacking Sliding Doors were used so the area could be closed in winter and opened up in summer. 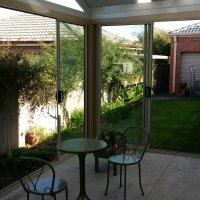 Patio and Pergola infills are very popular giving home owners the ability to use the area all year round. 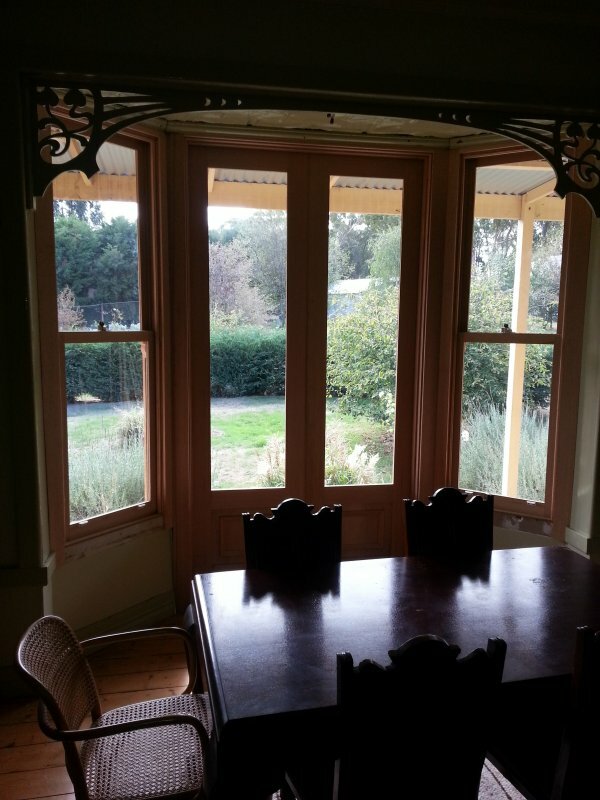 Ballarat Geelong, Melbourne. 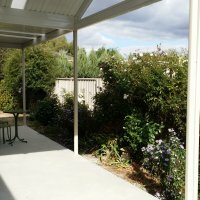 Customer reviews about this style of pergola infill that enables openable options in summer and complete weather protection in winter are well received. 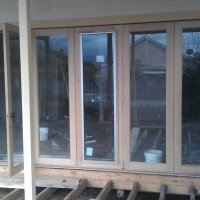 An old aluminium sliding door was removed and timber french doors and jamb with side lights were installed. 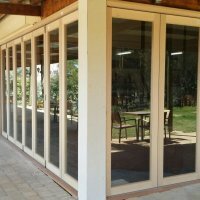 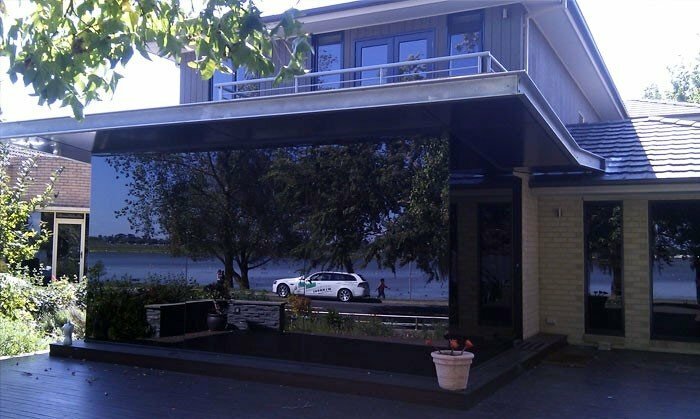 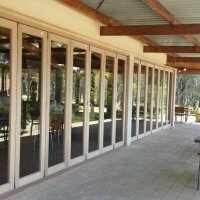 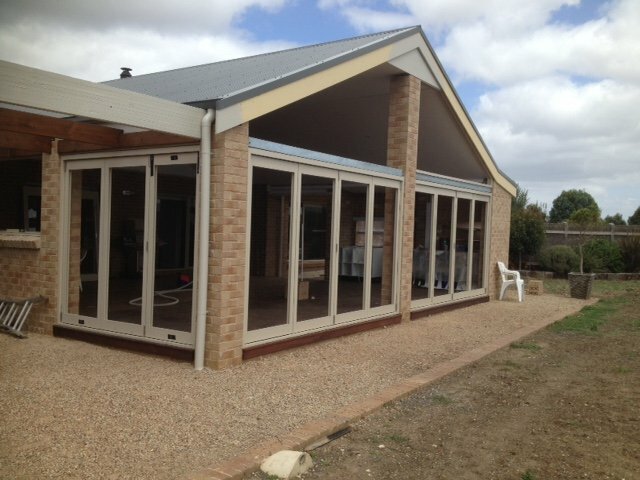 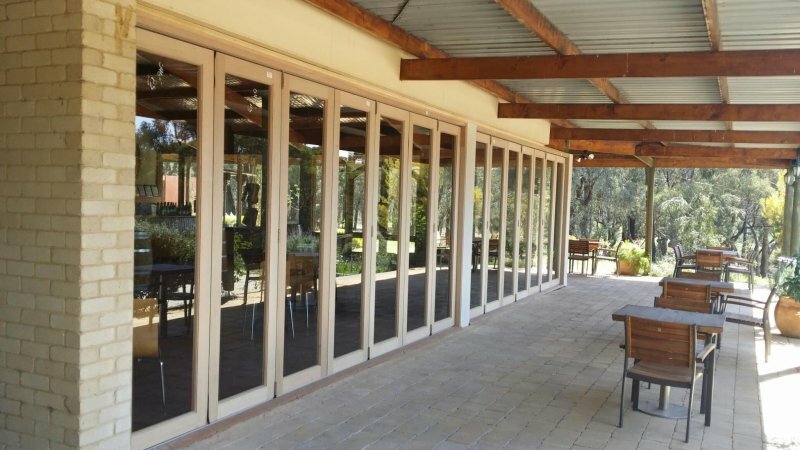 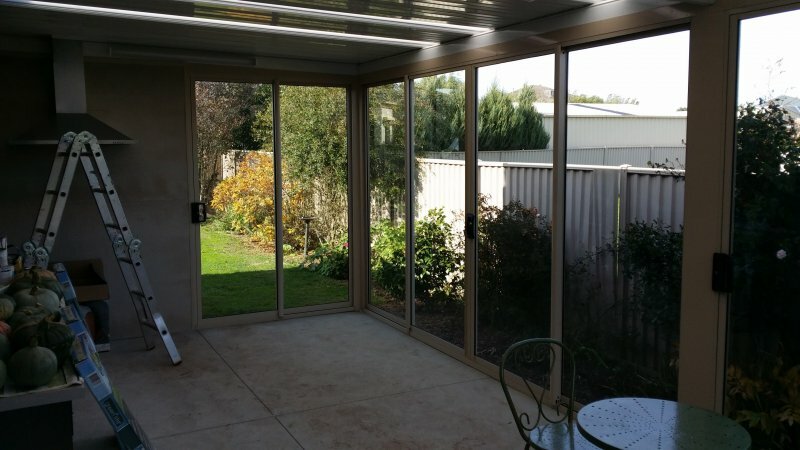 Pergola / Alfesco in-fill with Aluminium Stacking Doors and large fixed windows - Ballarat, Geelong and Melbourne. 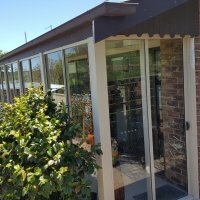 Customer reviews about this style of pergola infill that enables openable options in summer and complete weather protection in winter are well received. 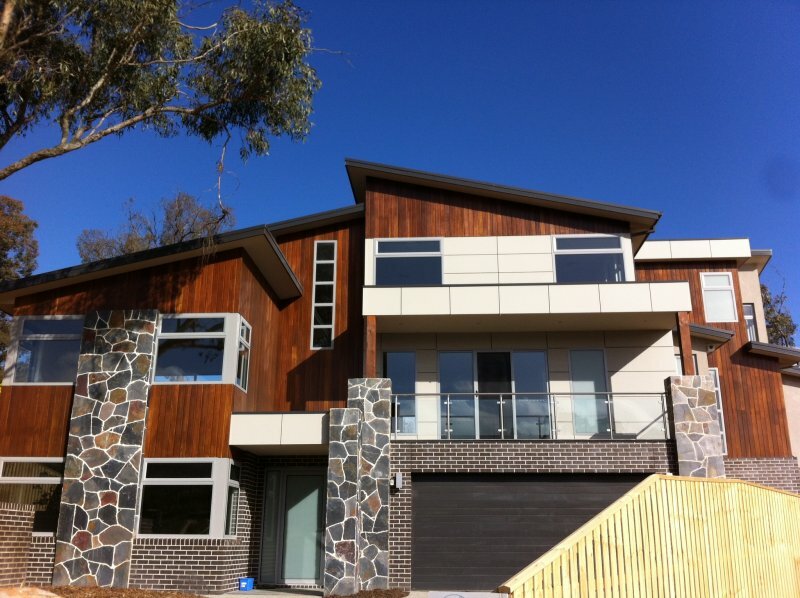 A great example of modern Aluminium Windows and Doors with a timber cladding. 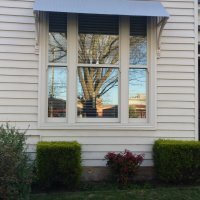 Ballarat windows. 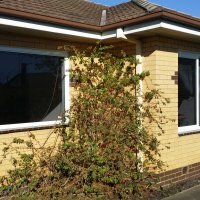 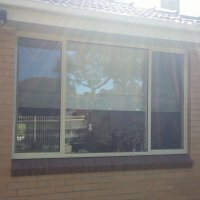 Replacement windows - Double Glazed Aluminium Sliding Windows. 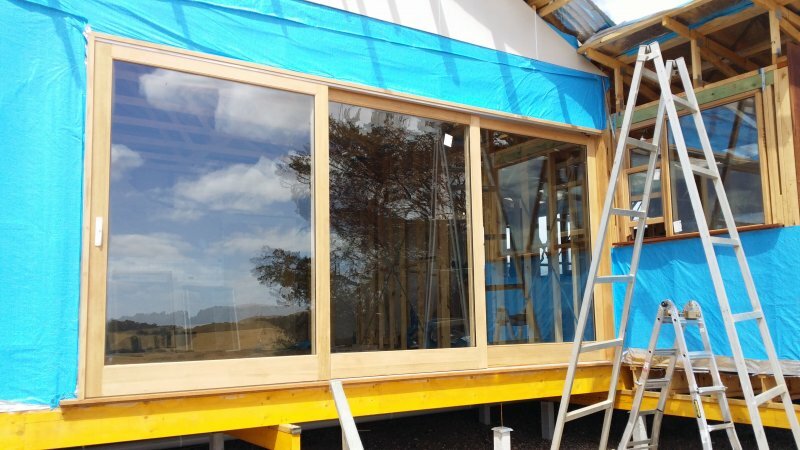 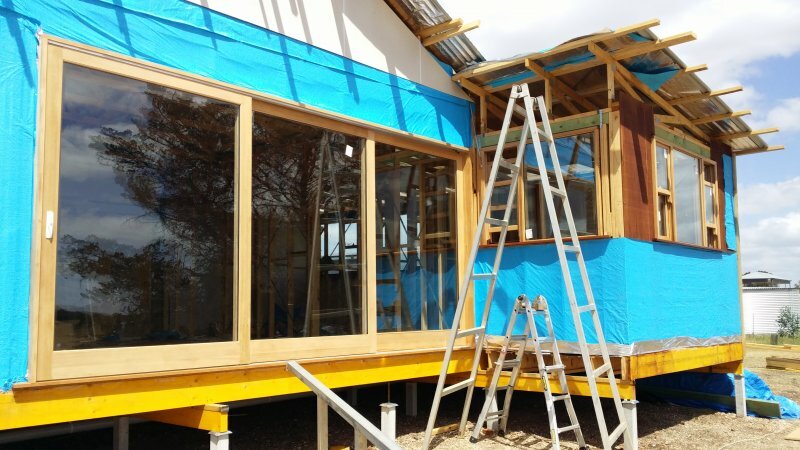 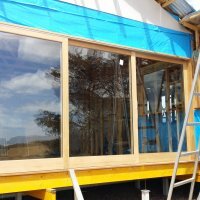 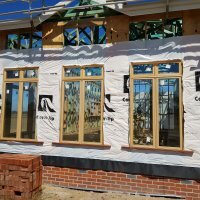 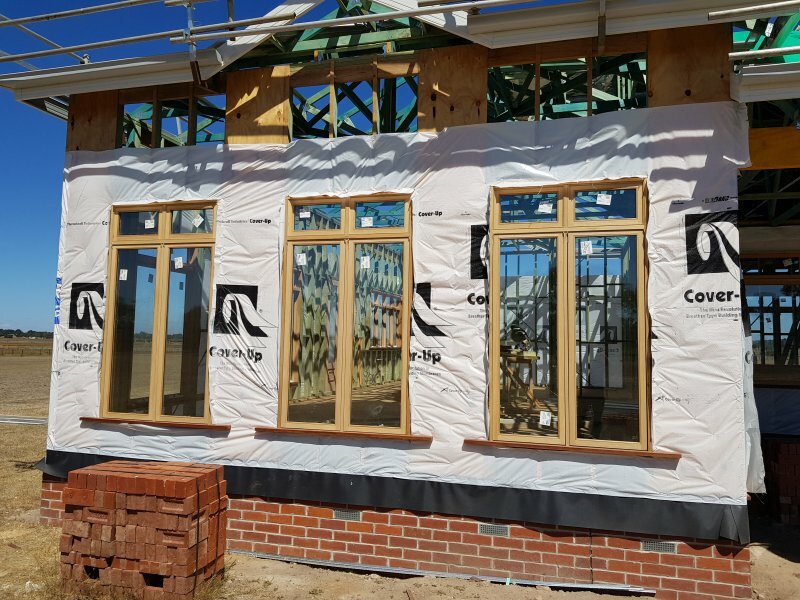 These windows change the view of the house creating a more energy efficient house while maximising air flow with sliding double glazed windows. 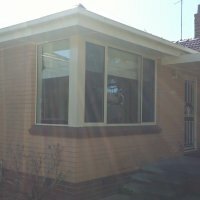 Geelong, Ballarat and surrounding areas. 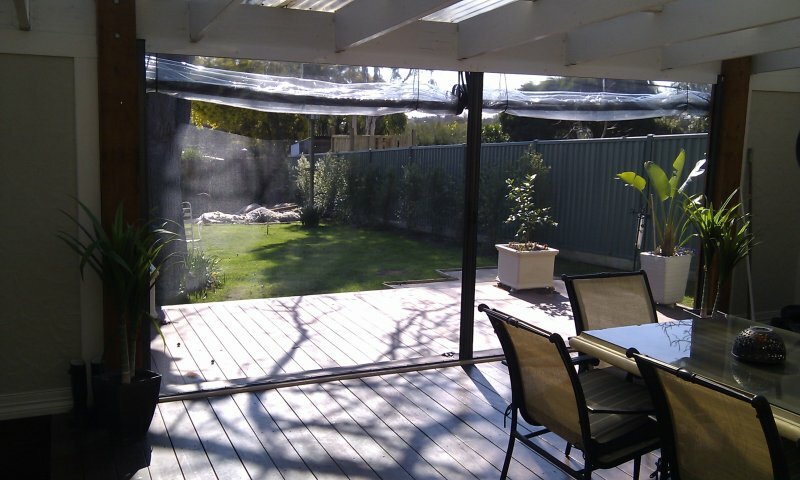 Pleated retractable screens are the ideal way to enclose an outdoor area. 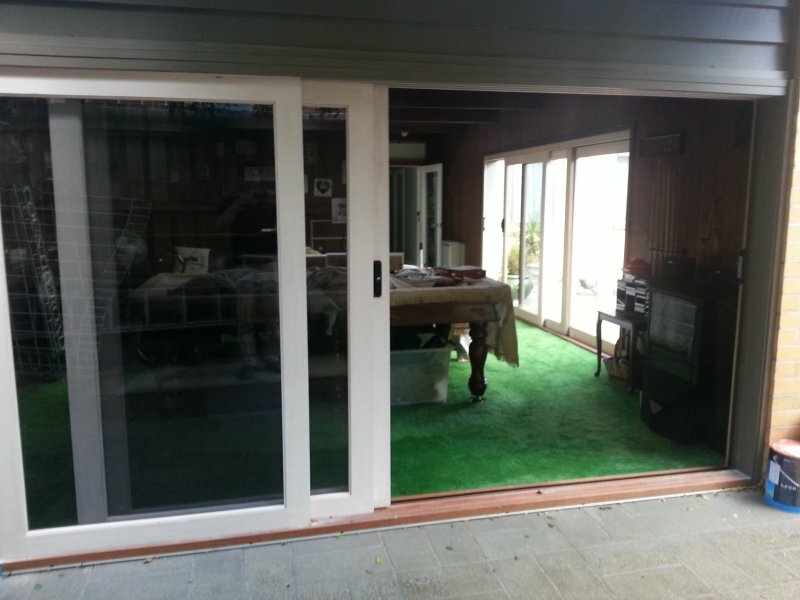 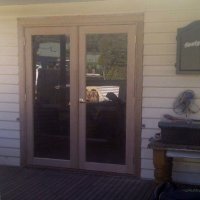 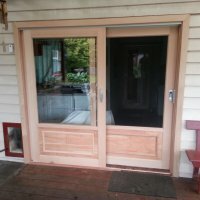 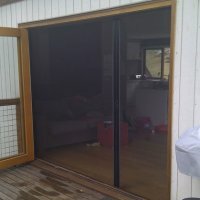 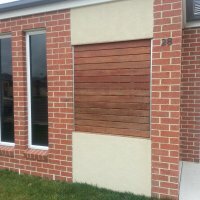 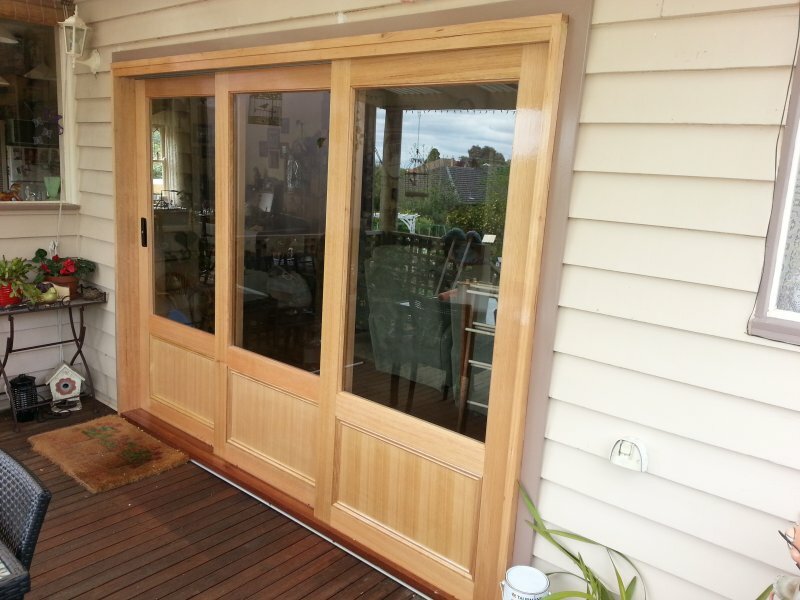 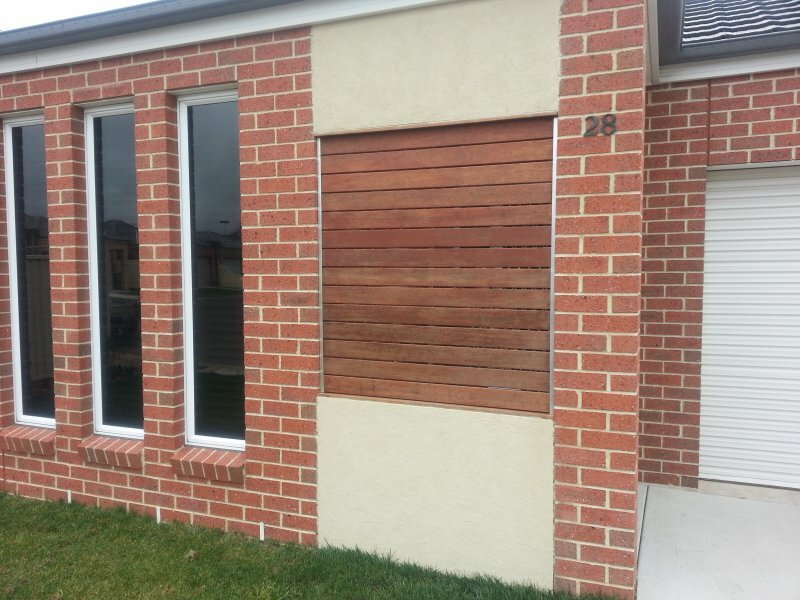 Timber stacking door complete with retractable insect screen Ballarat. 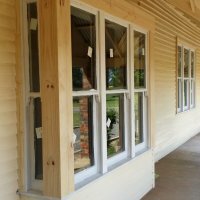 Timber period style windows - Painter has put first coat on windows. 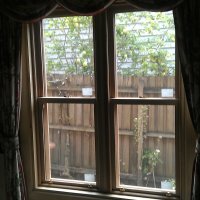 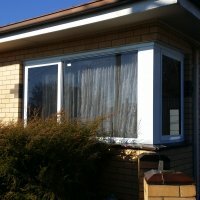 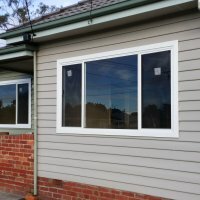 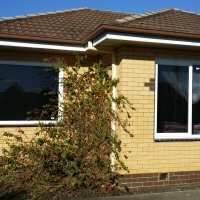 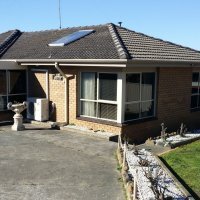 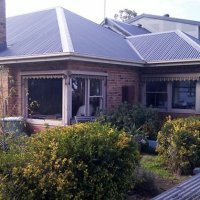 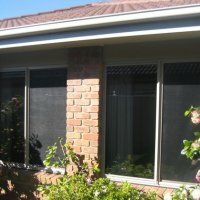 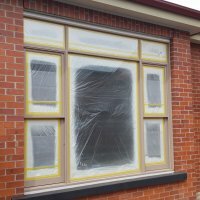 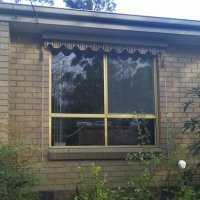 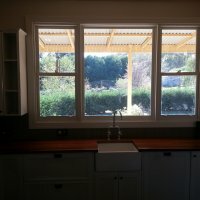 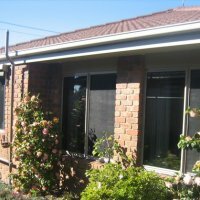 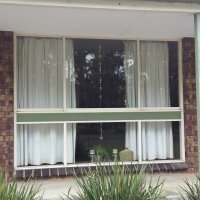 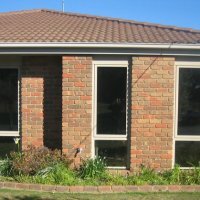 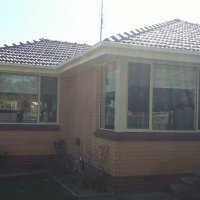 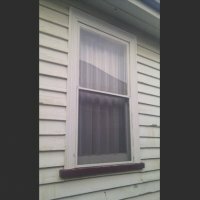 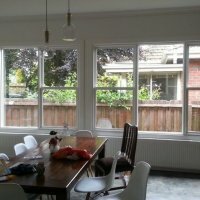 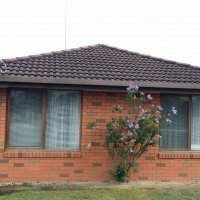 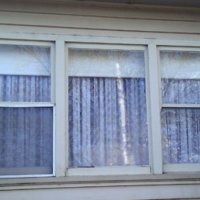 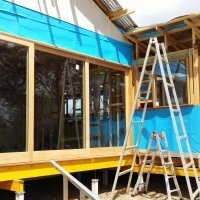 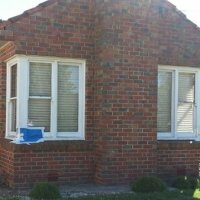 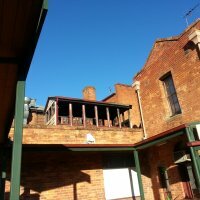 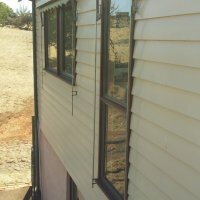 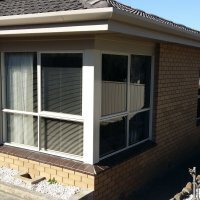 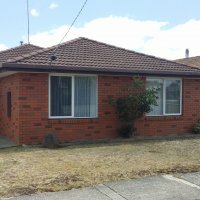 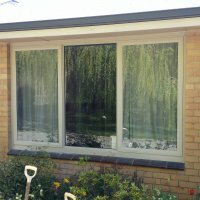 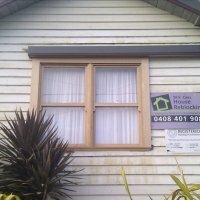 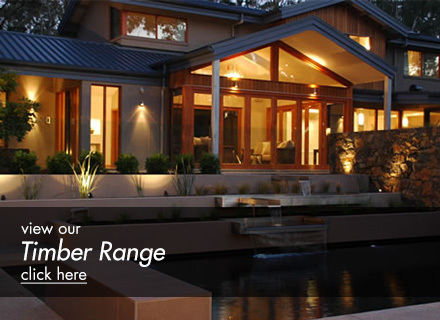 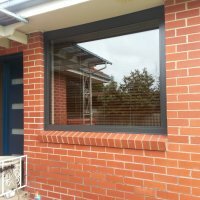 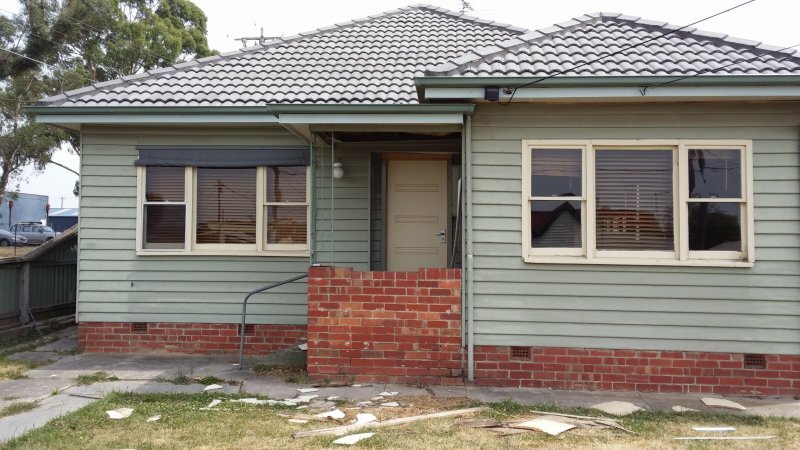 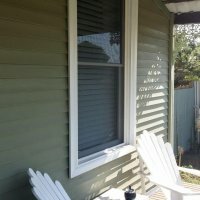 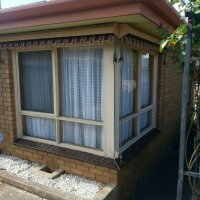 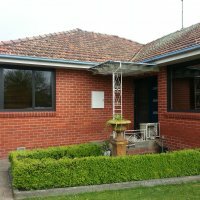 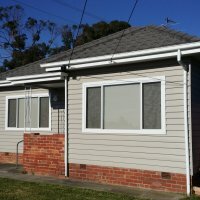 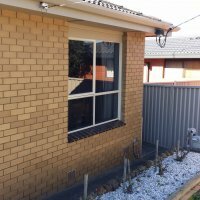 Replacement windows Ballarat, Geelong. 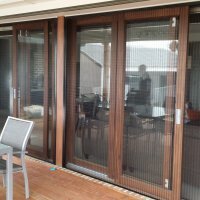 Pleated retractable screen Ballarat. 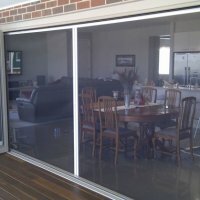 Featured on a new stacking sliding door. 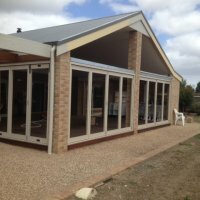 Ballarat pergola in-fill - Commercial frames enhance the look of this Ballarat pergola in-fill, they also handle strong wind conditions due to the heavy aluminium sections. 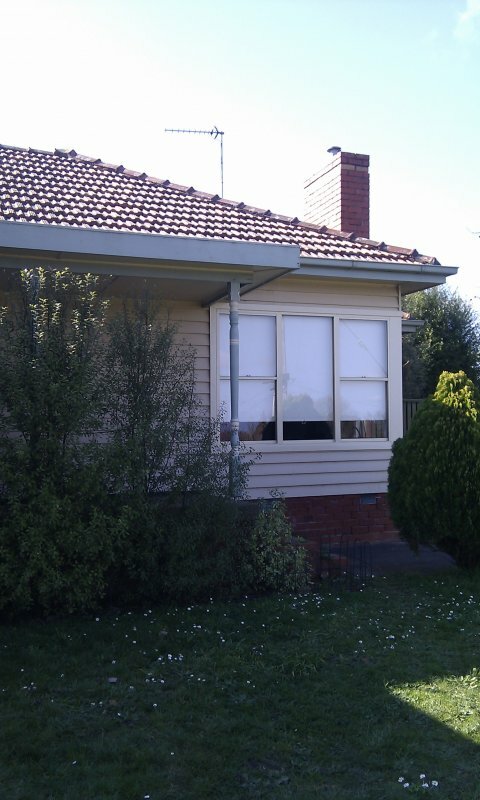 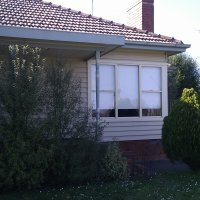 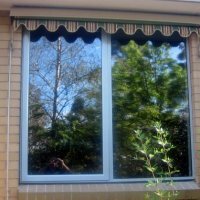 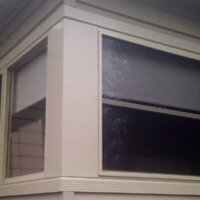 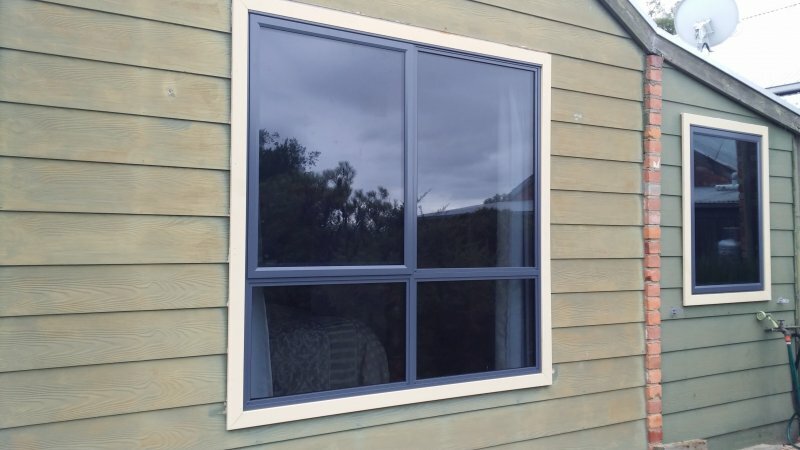 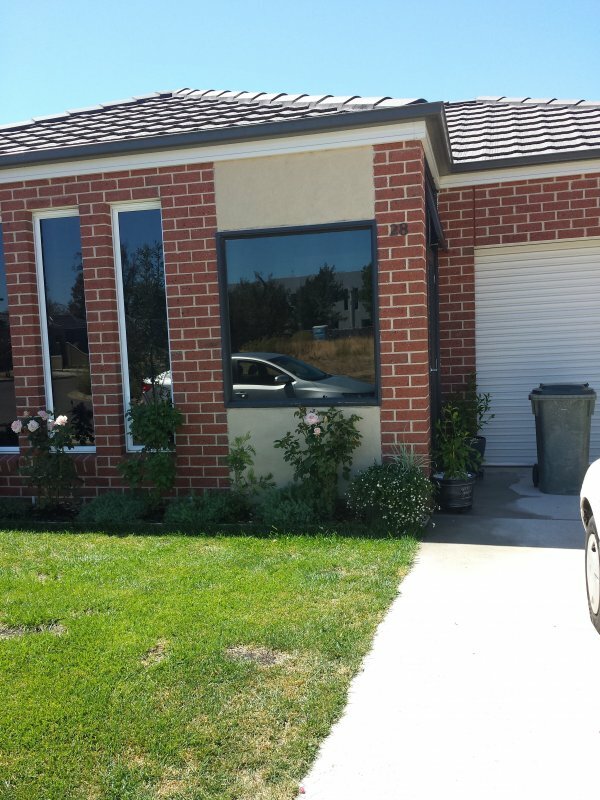 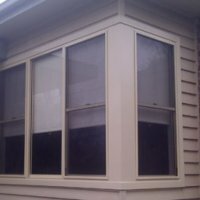 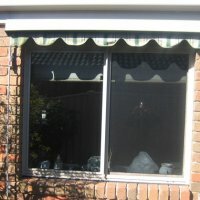 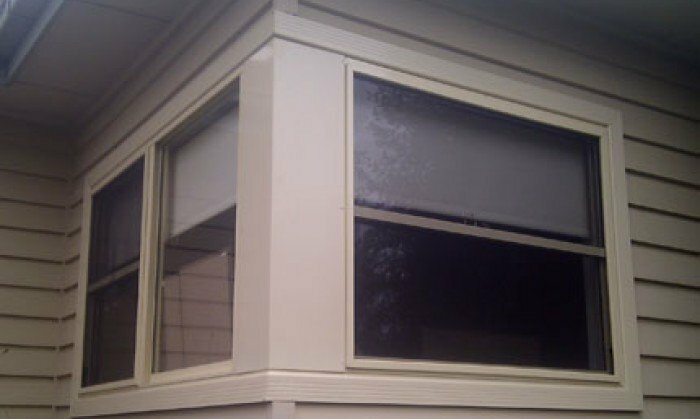 Replacement windows with Aluminium Awning Windows with Grey tint glass Ballarat. 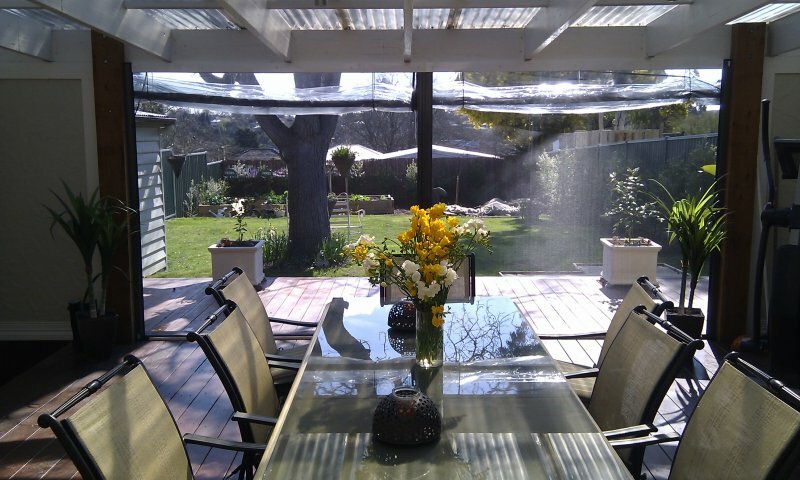 Geelong. 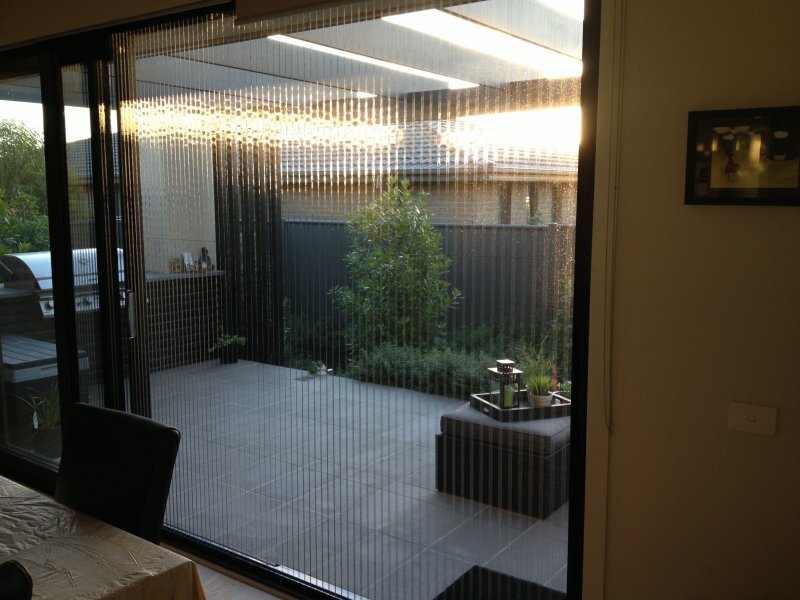 Retractable screen solution that has been used to enclose a pergola area - this option is a great alternative to screening your Bi-Fold Door or Stacking Door and still enables you to keep all the bugs and insects out, Retractable screens servicing Ballarat, Geelong and Melboure - Pleated screens also avaliable along with tight fit mesh featured in these photo's. 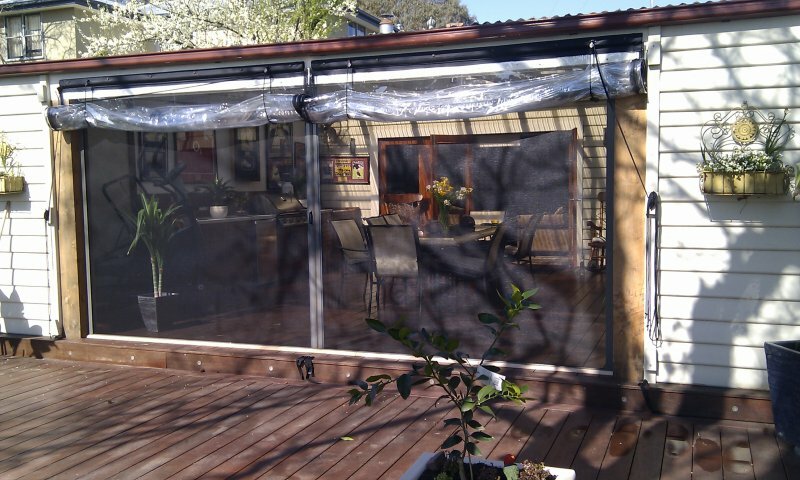 Retractable flyscreens the ideal solution. 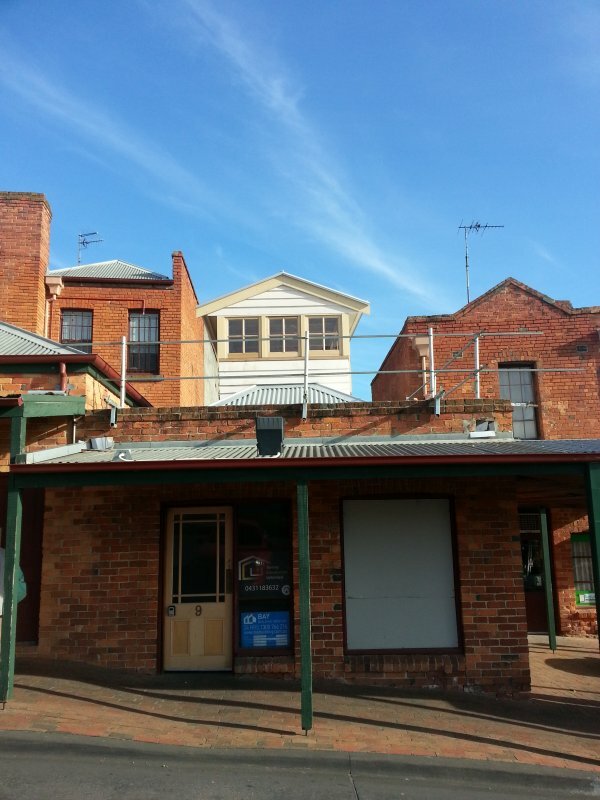 Central Ballarat - Matching a heritage listed buildings windows after fire had destroyed the original windows. 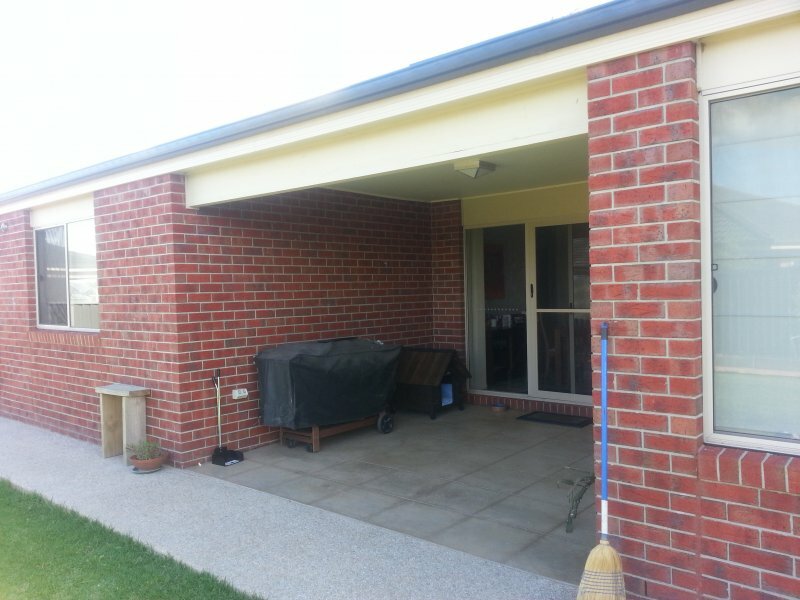 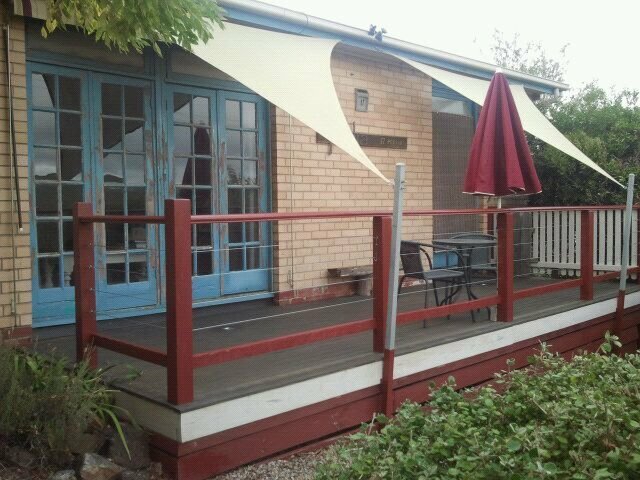 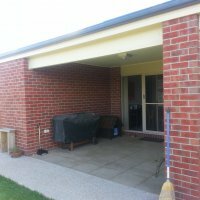 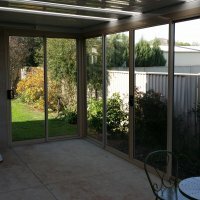 Ballarat Pergola / Alfresco infill, this was enclosed using a staking sliding door. 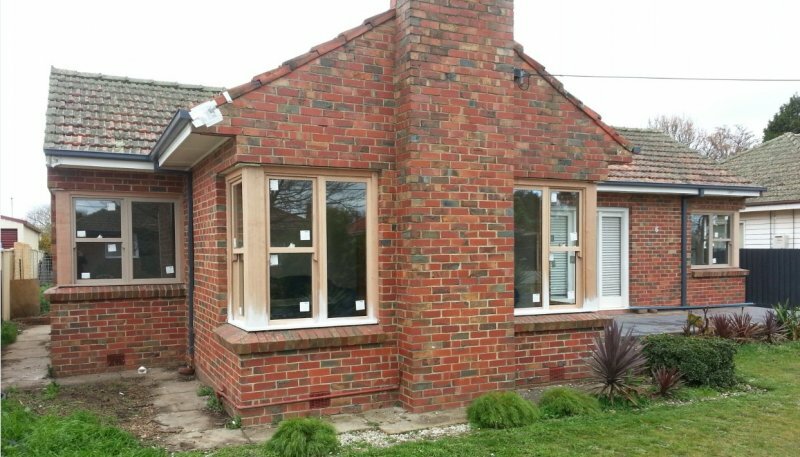 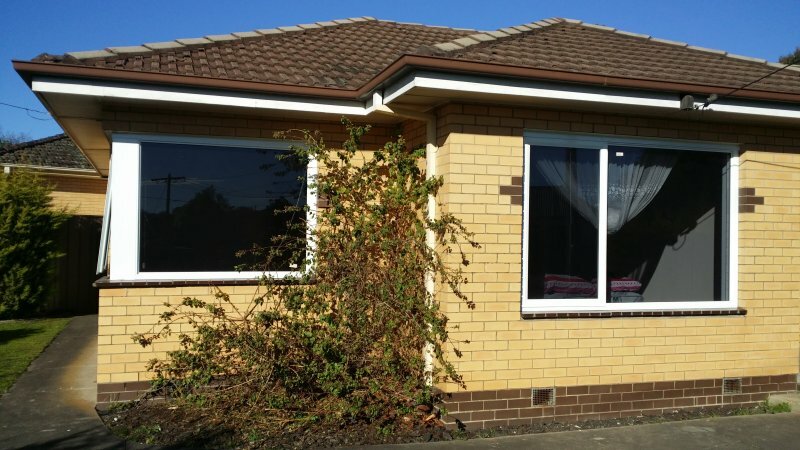 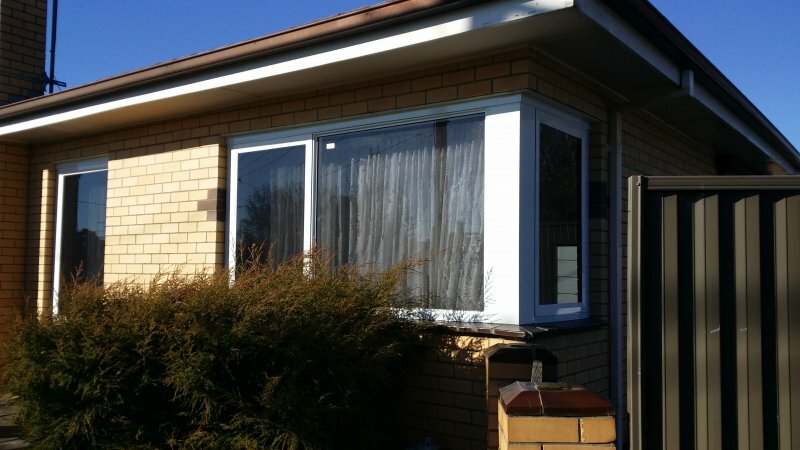 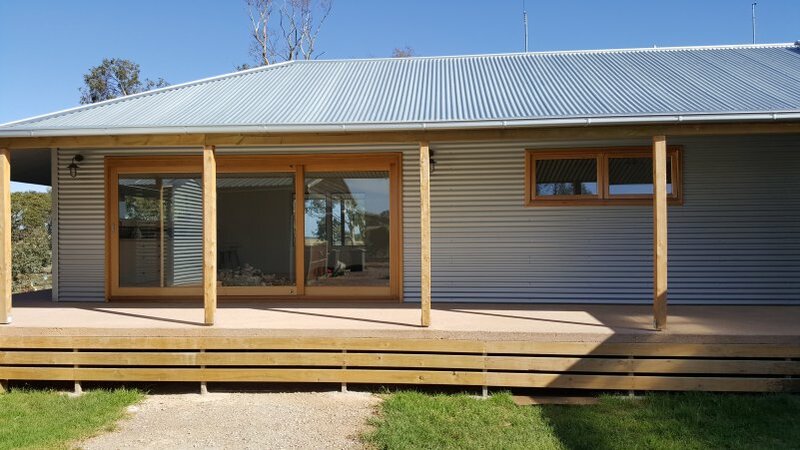 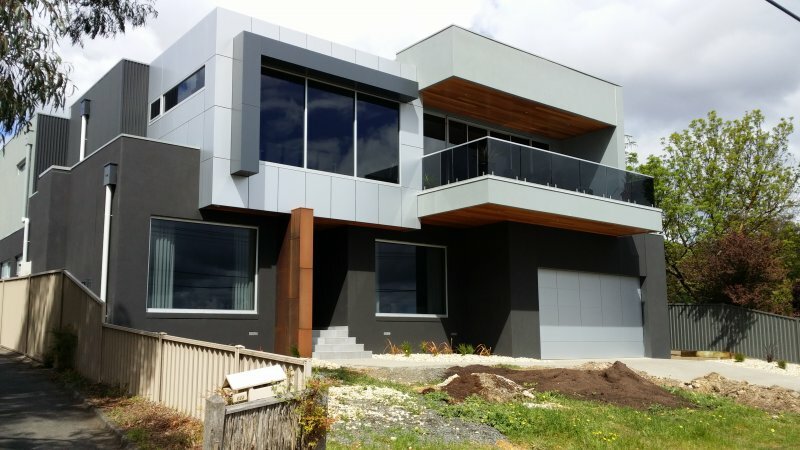 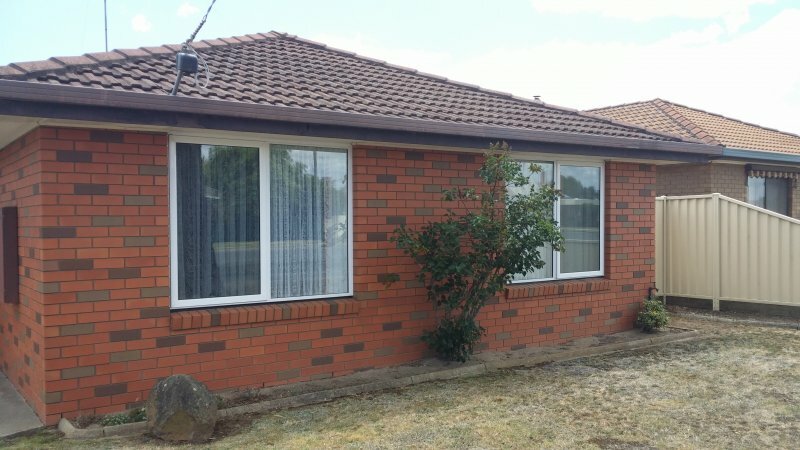 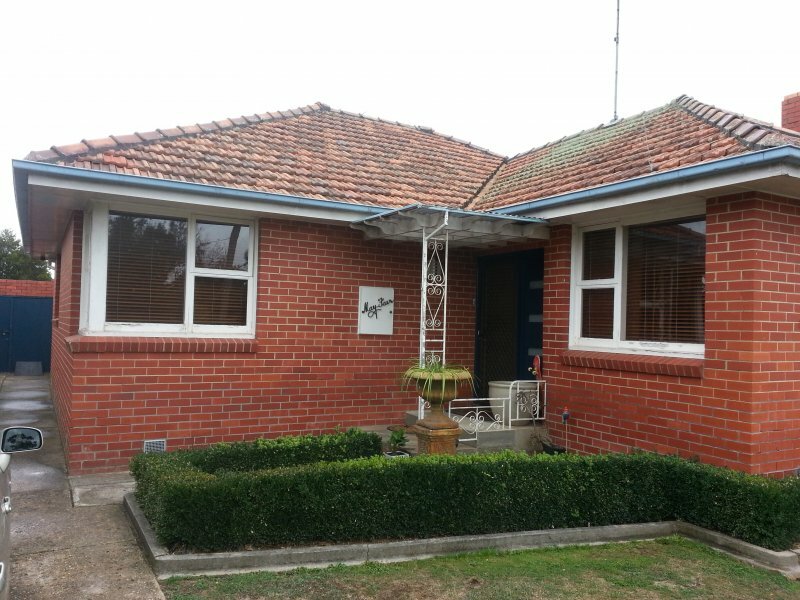 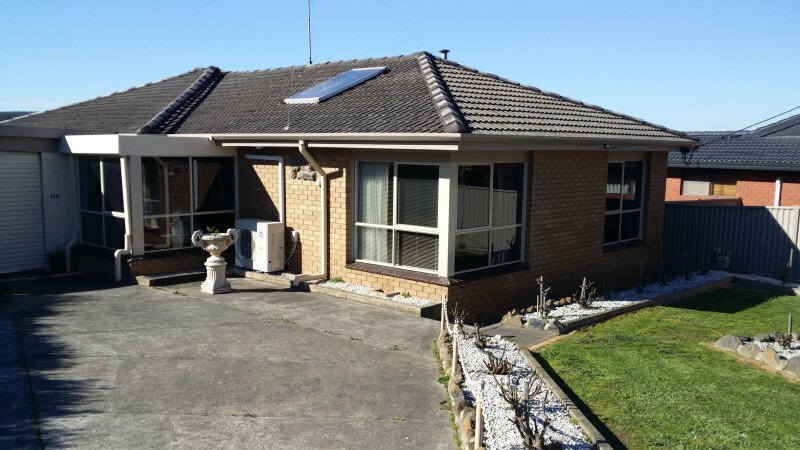 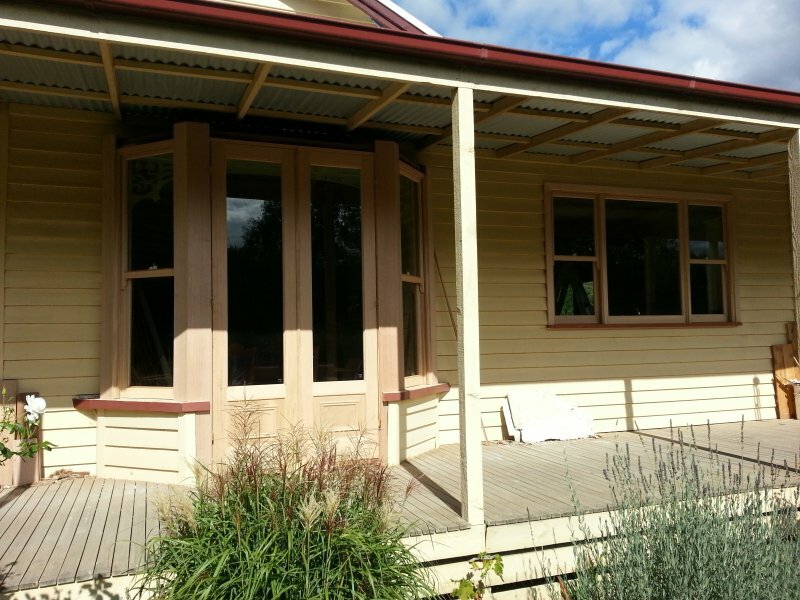 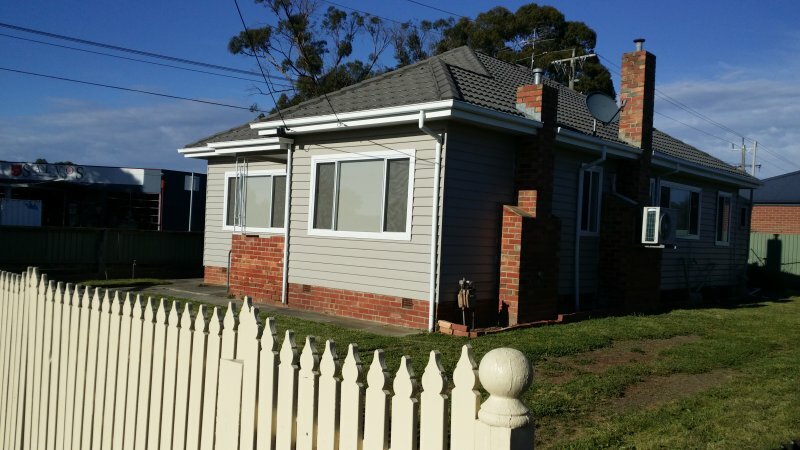 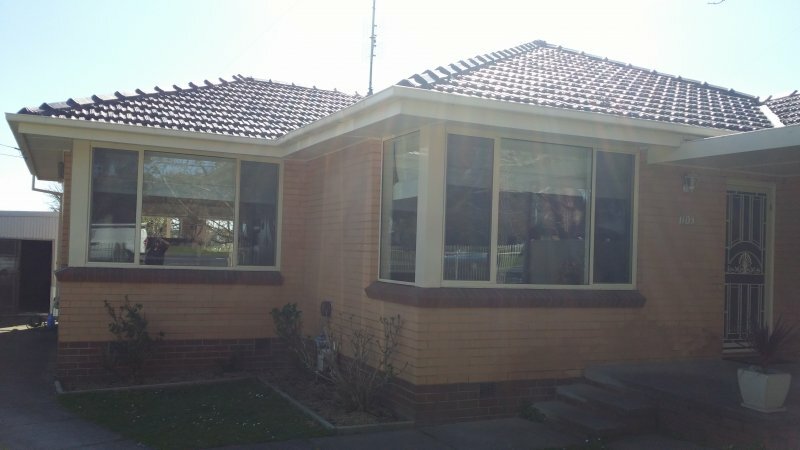 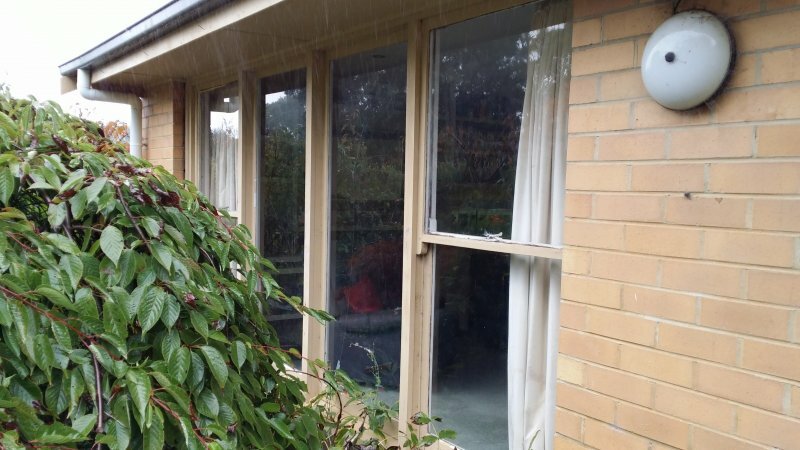 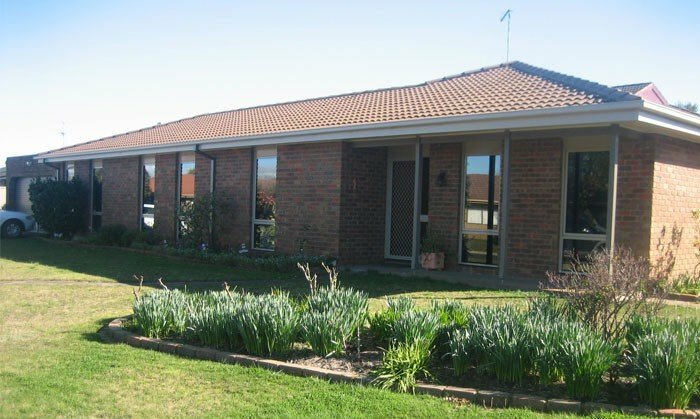 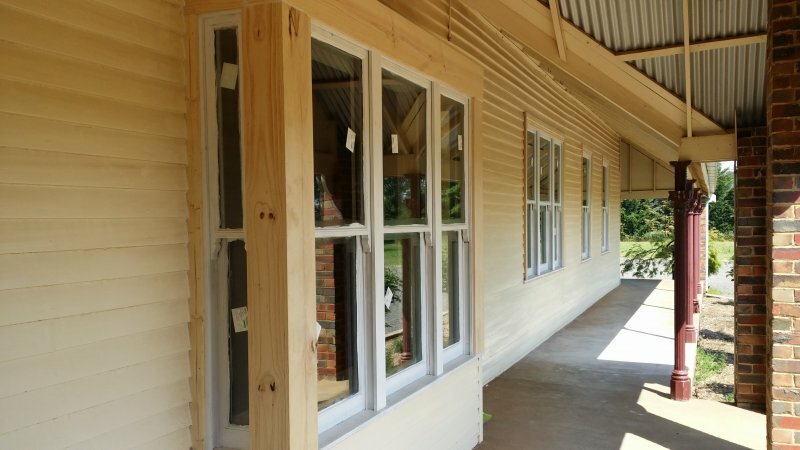 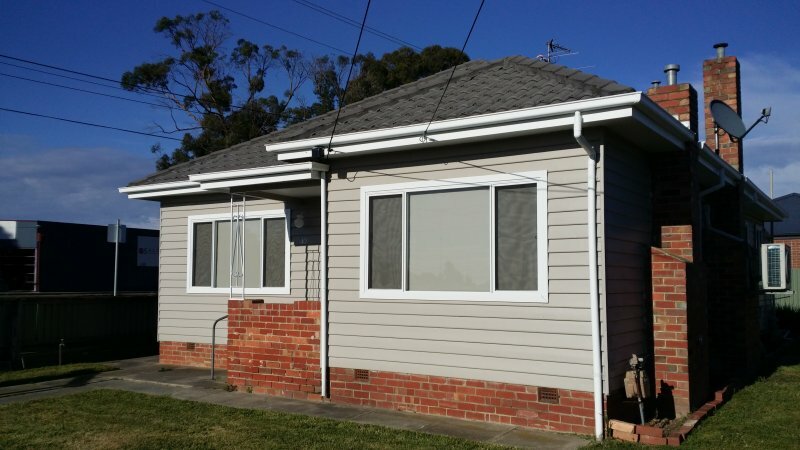 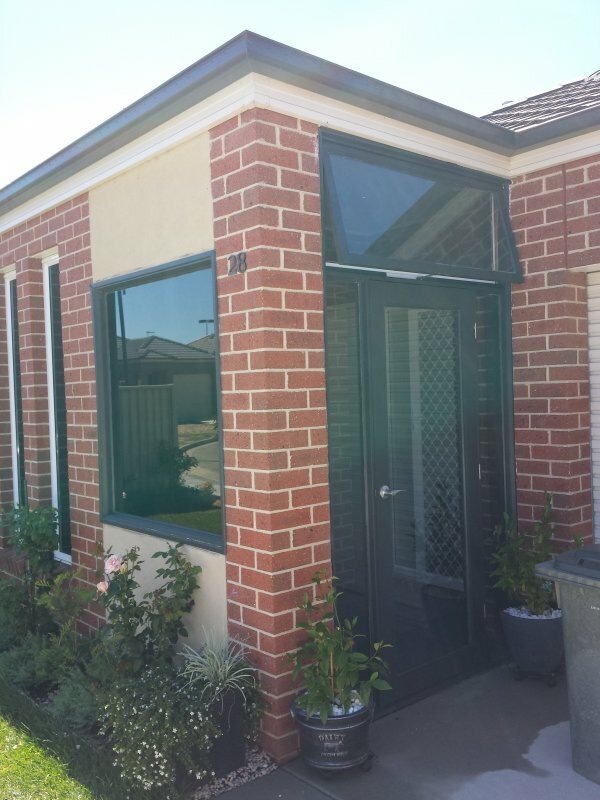 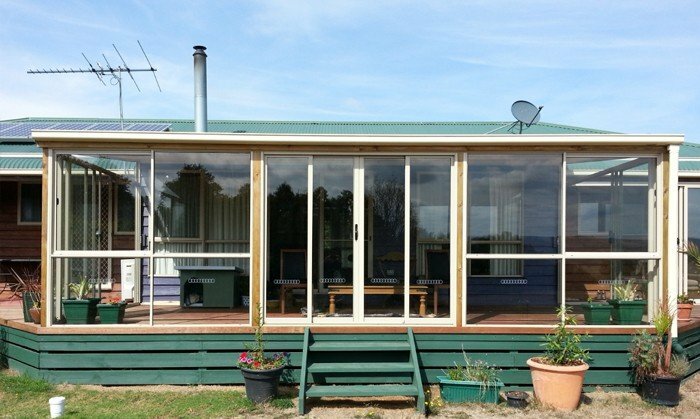 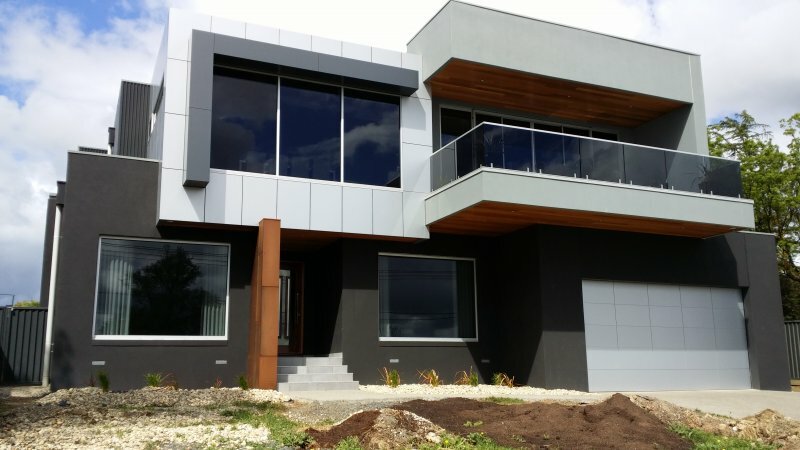 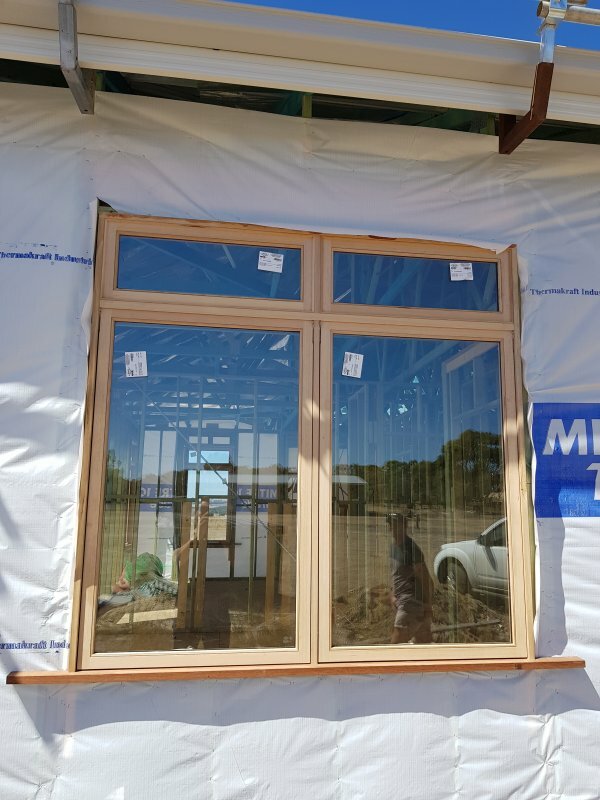 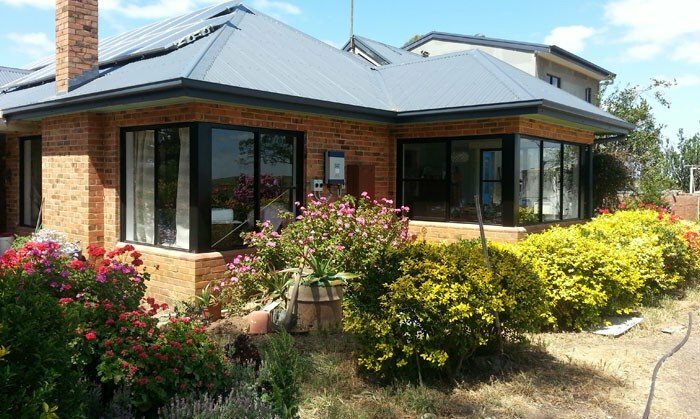 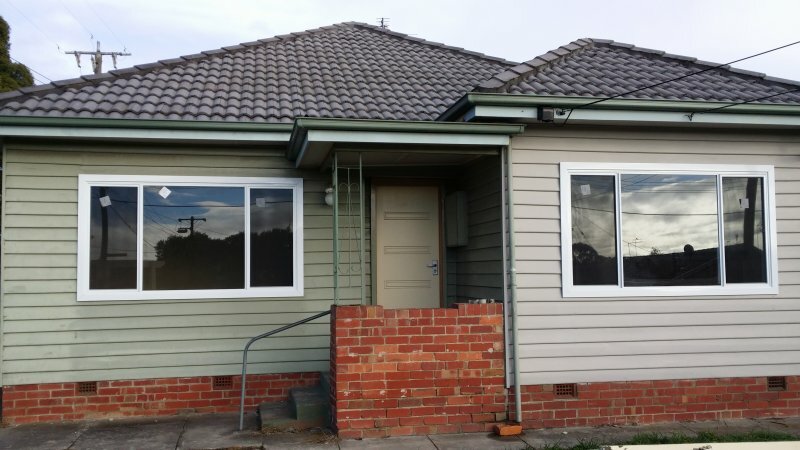 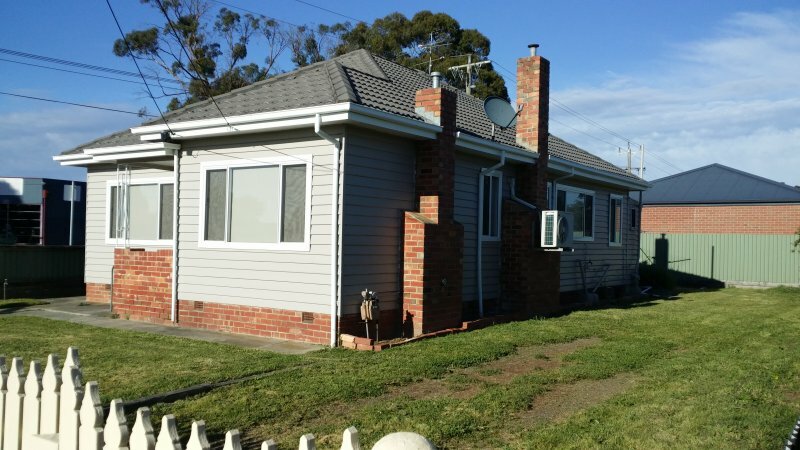 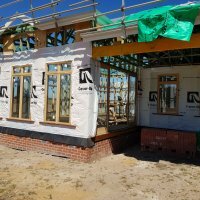 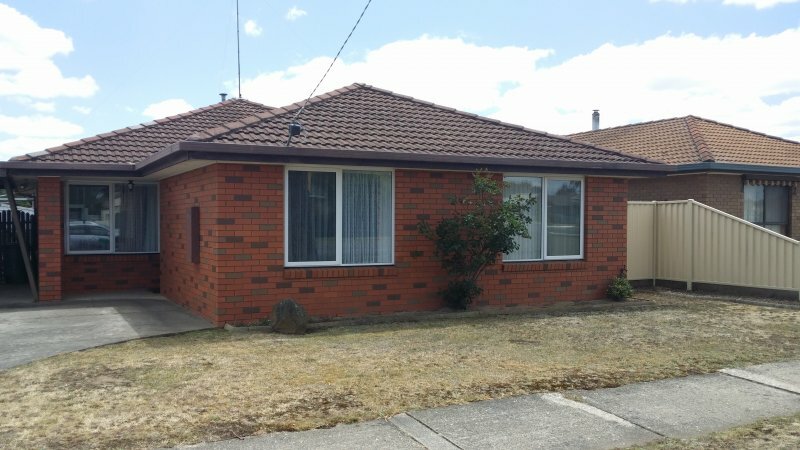 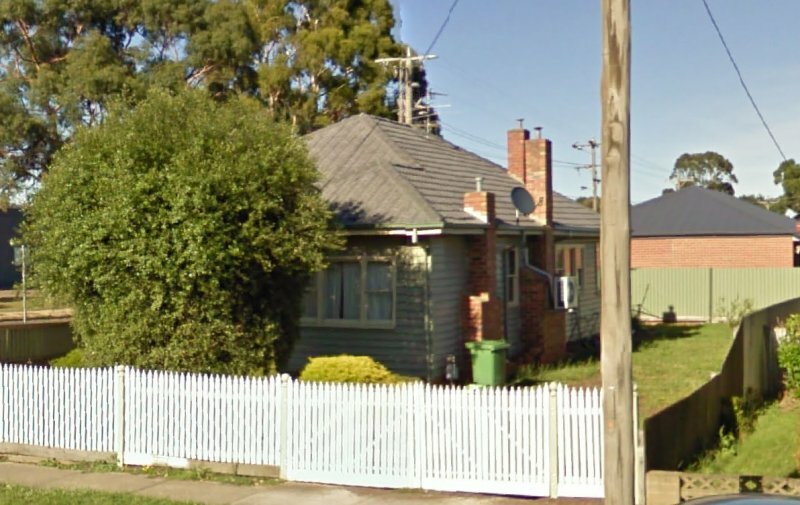 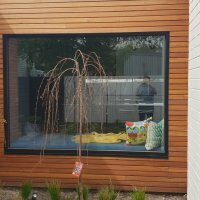 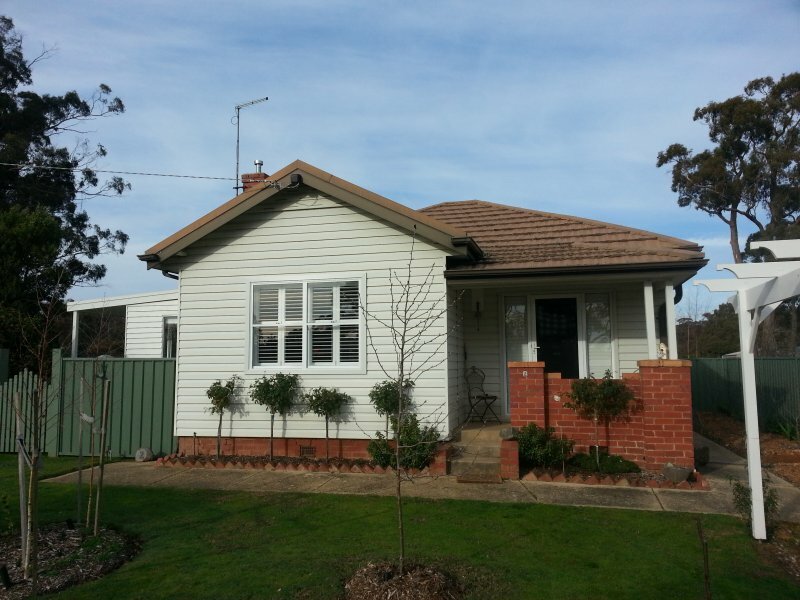 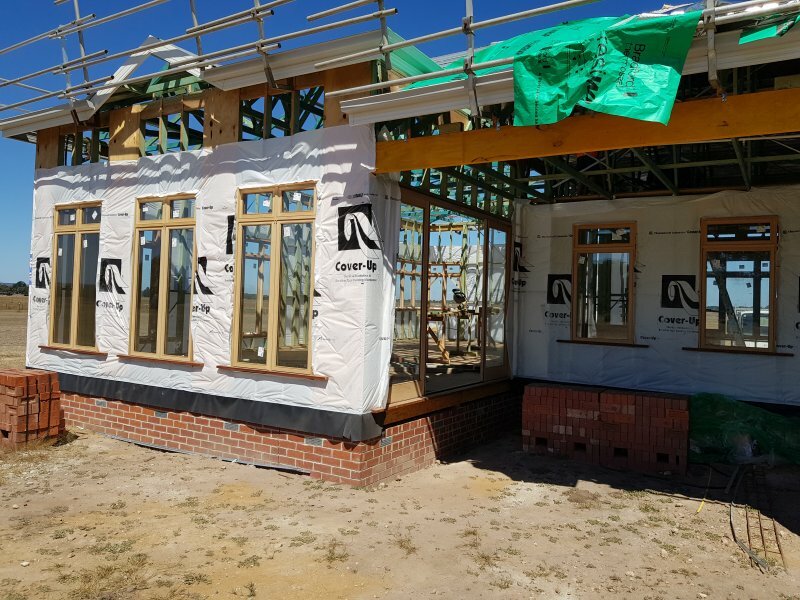 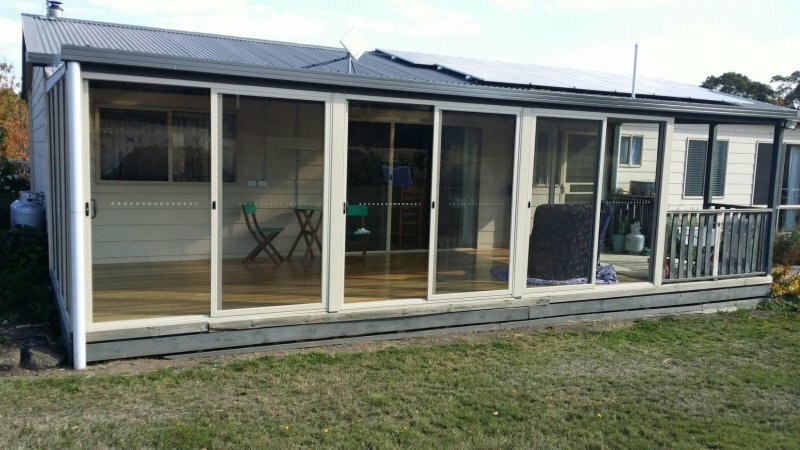 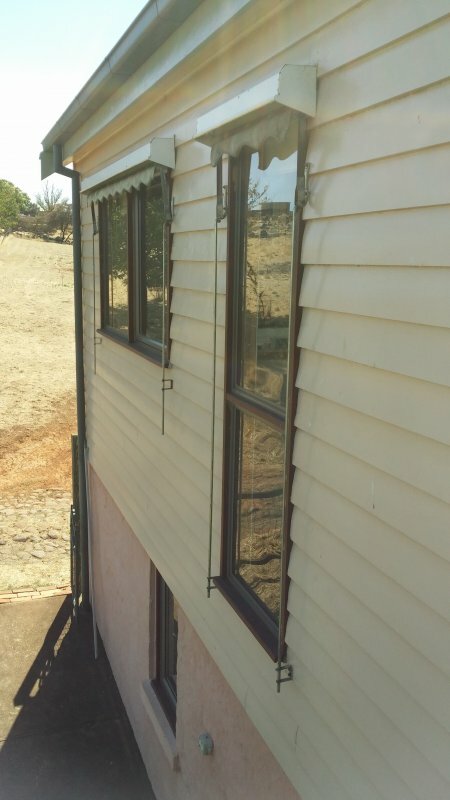 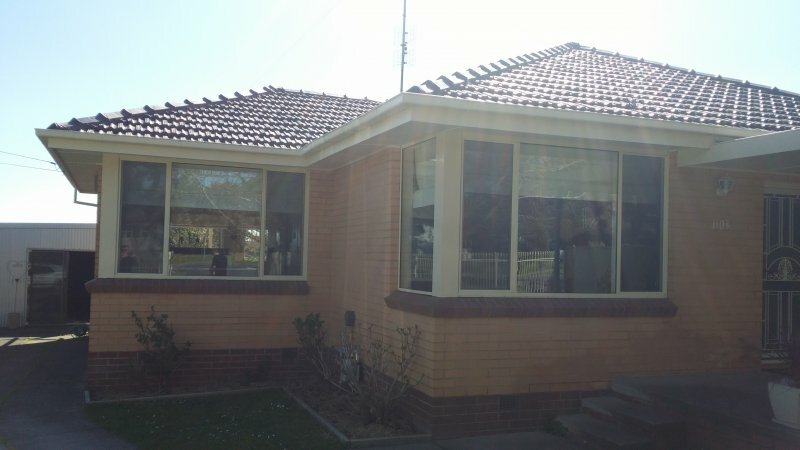 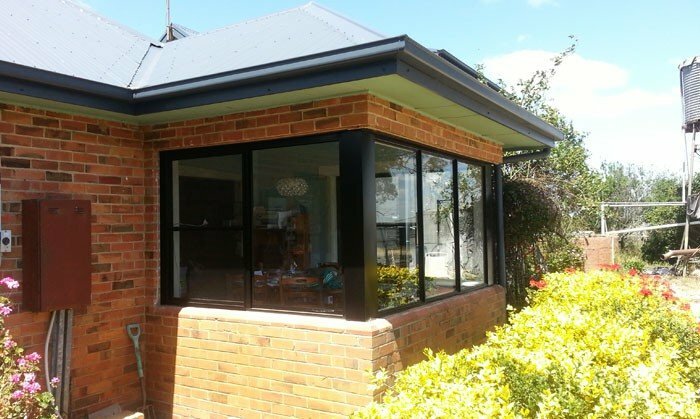 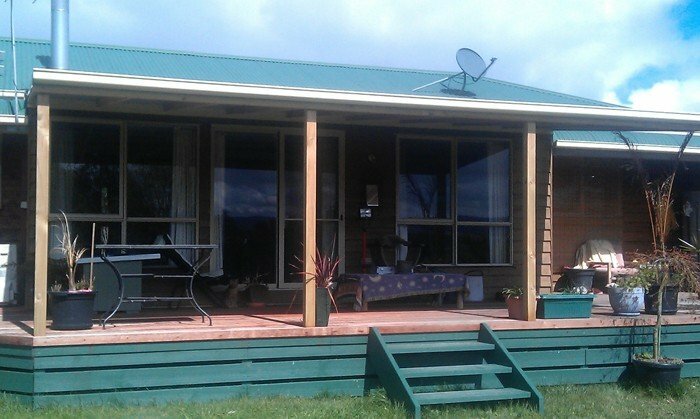 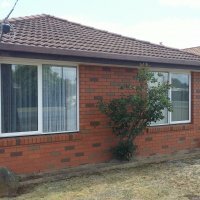 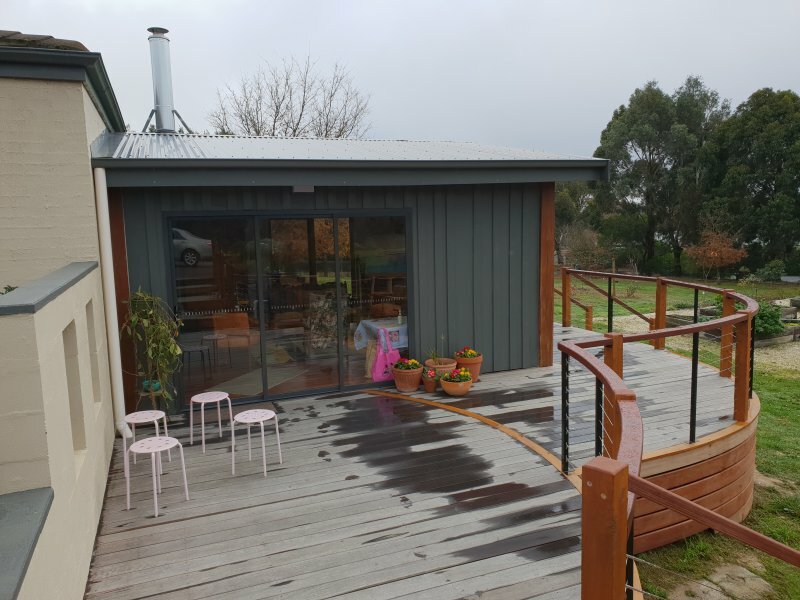 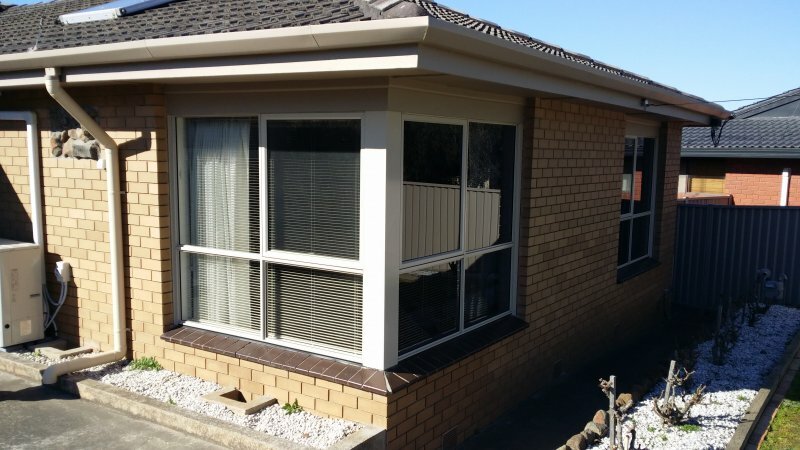 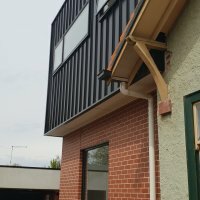 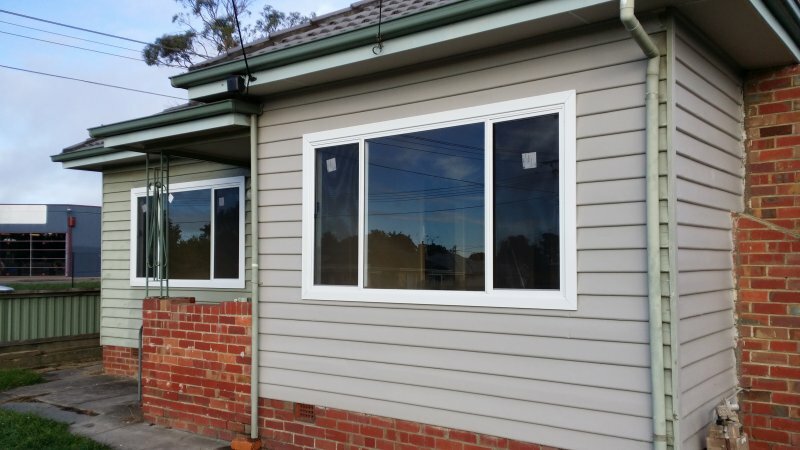 Existing single glazed timber frames were replaced with new Aluminium Double Hung Windows in Ballarat, the new frames greatly enhance the appeal of the home adding value and functionality to the clients home. 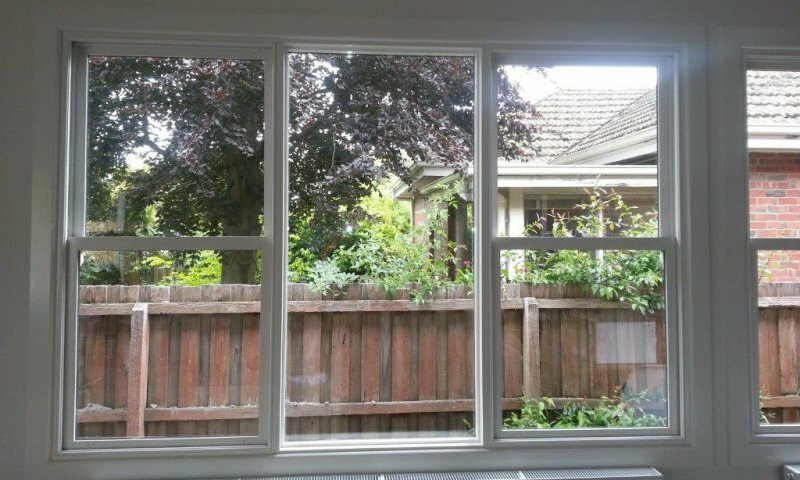 With Alumnium windows you can still maintain the look of your home while not having to maintain the product. 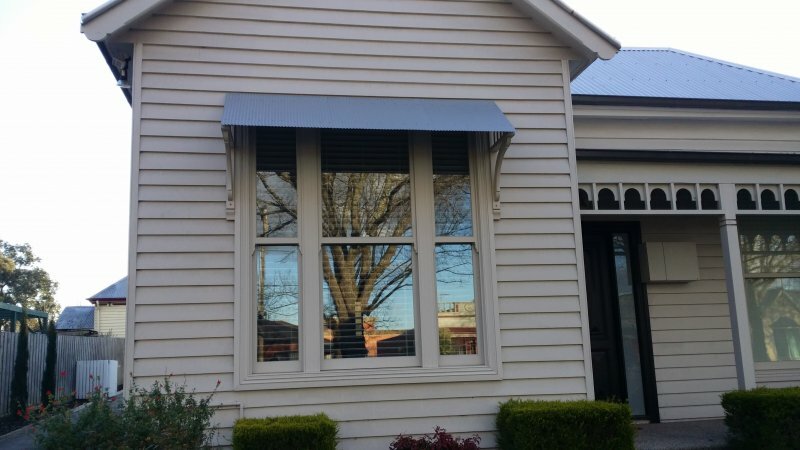 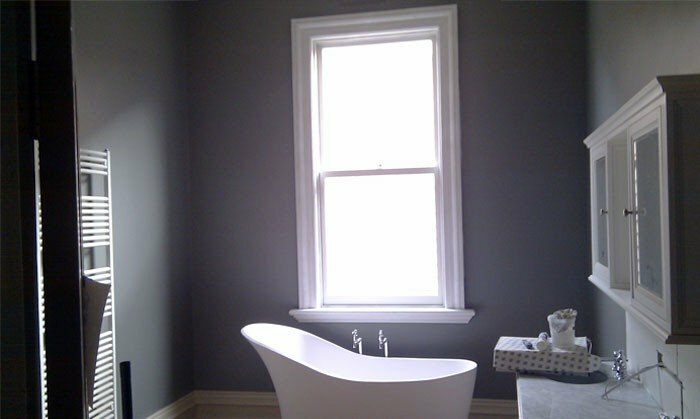 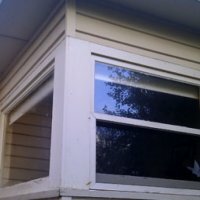 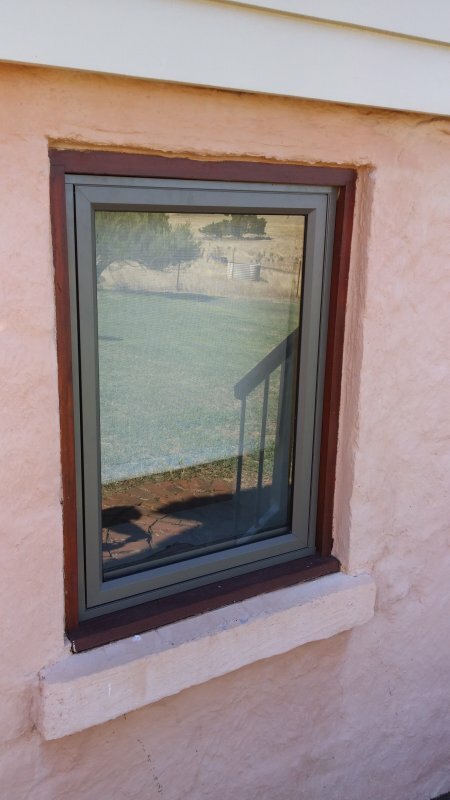 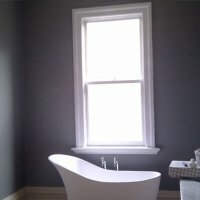 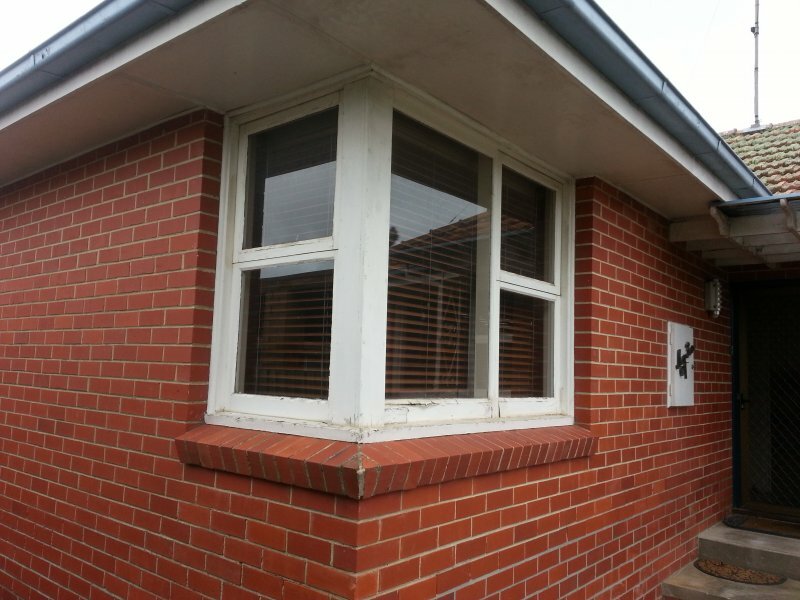 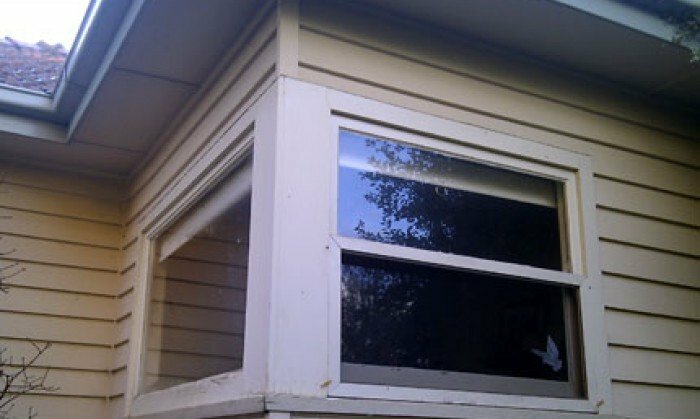 Replacement window corner Ballarat - aluminium architraves were fitted to this project to tie in the original look. 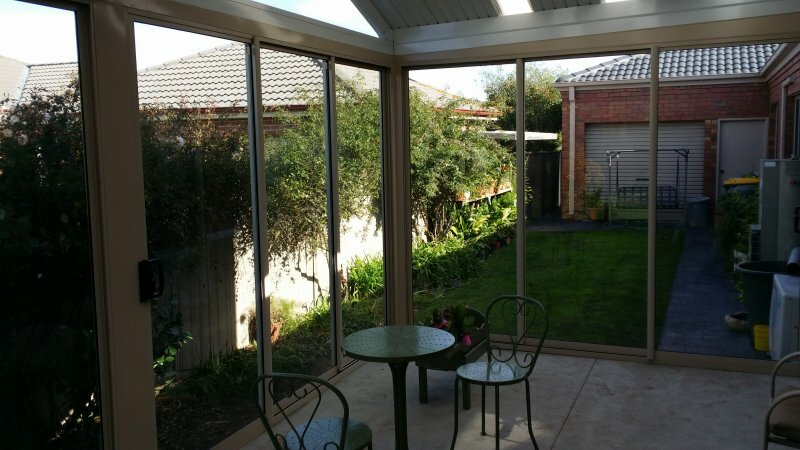 Internal view of a pergola in fill Ballarat. 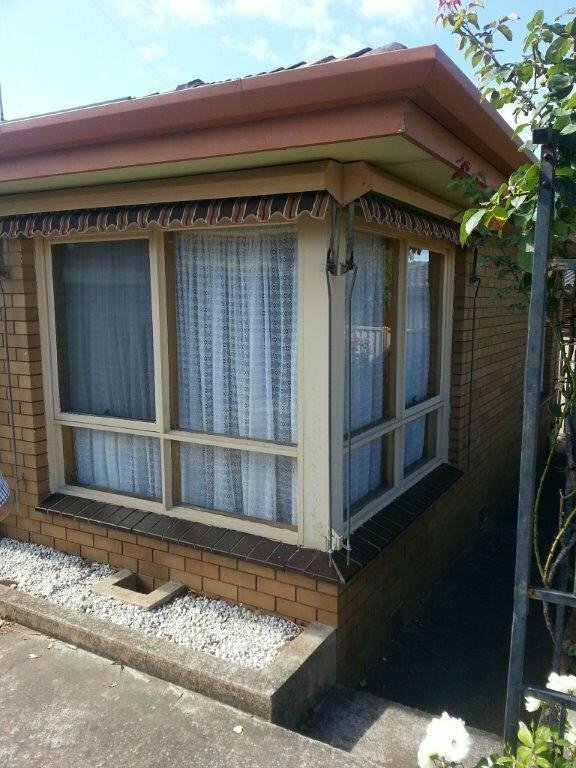 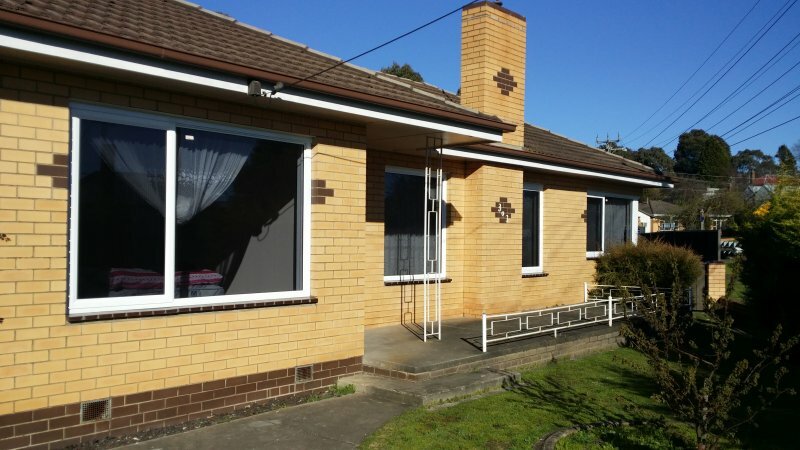 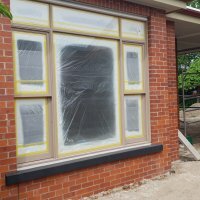 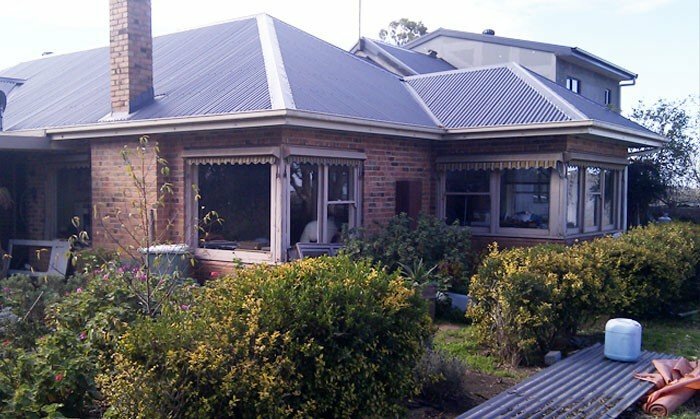 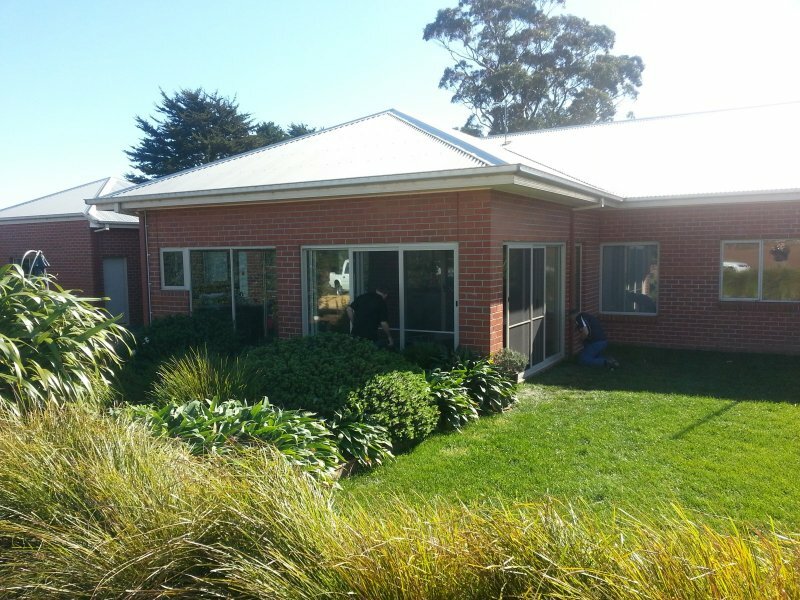 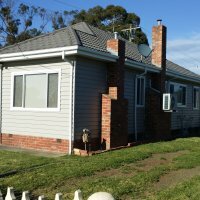 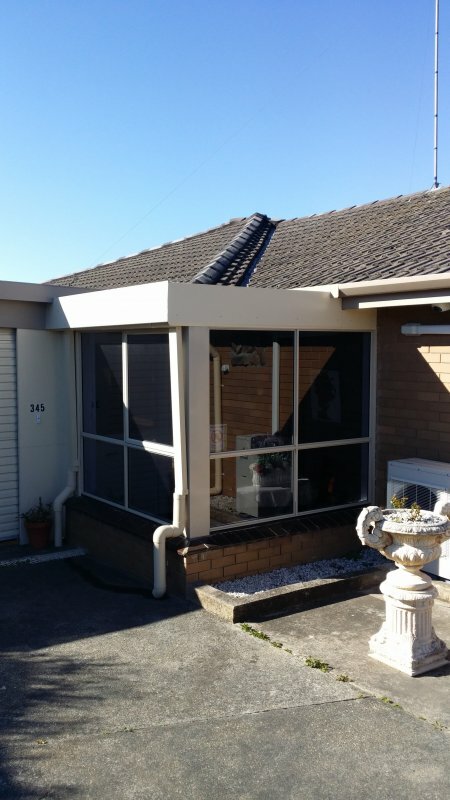 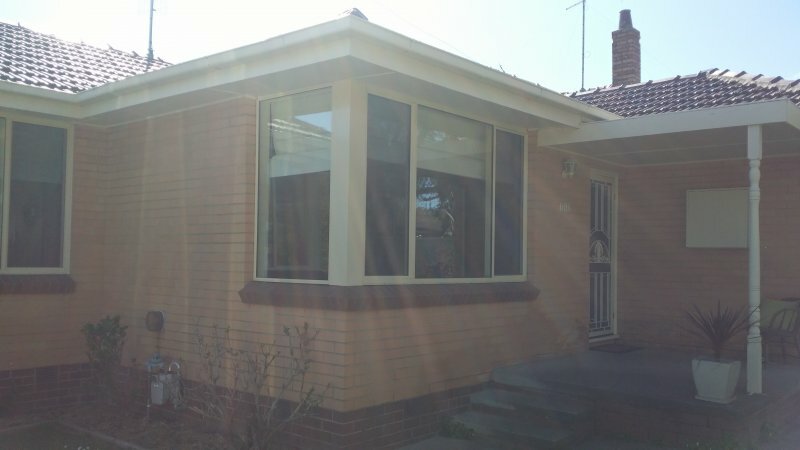 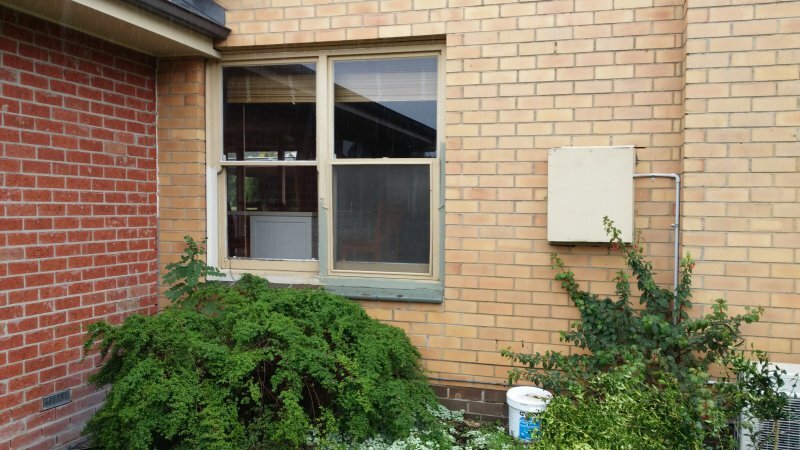 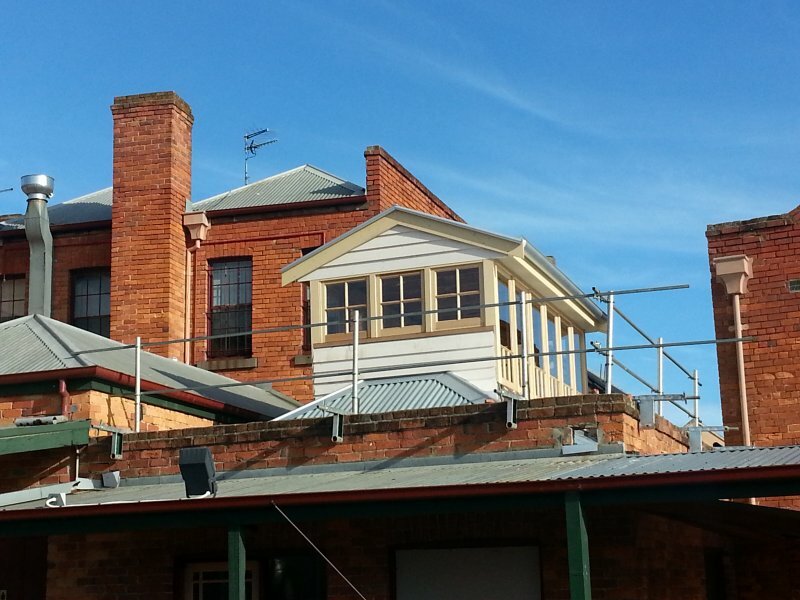 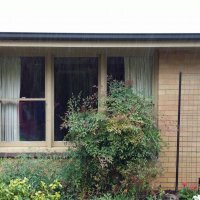 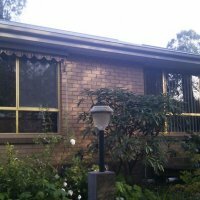 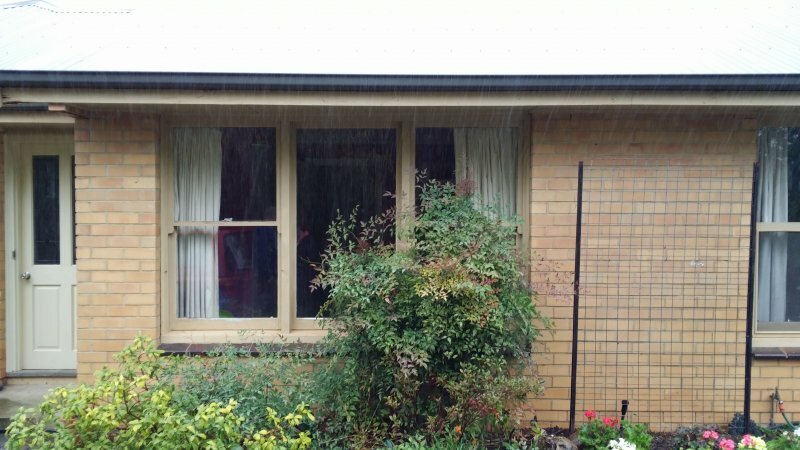 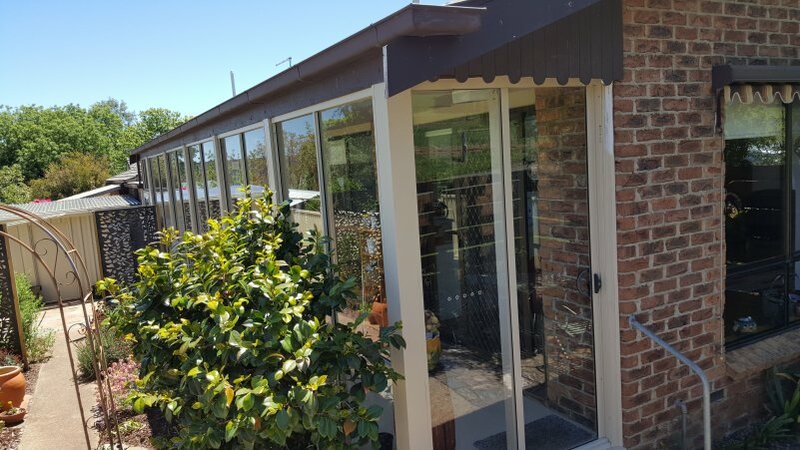 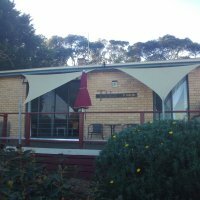 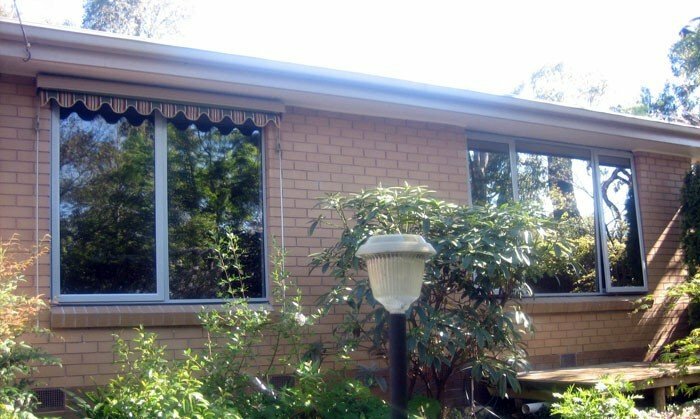 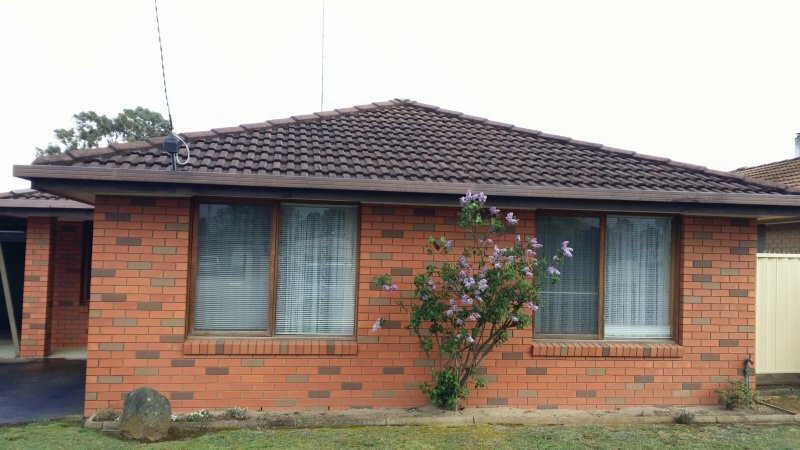 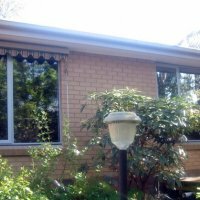 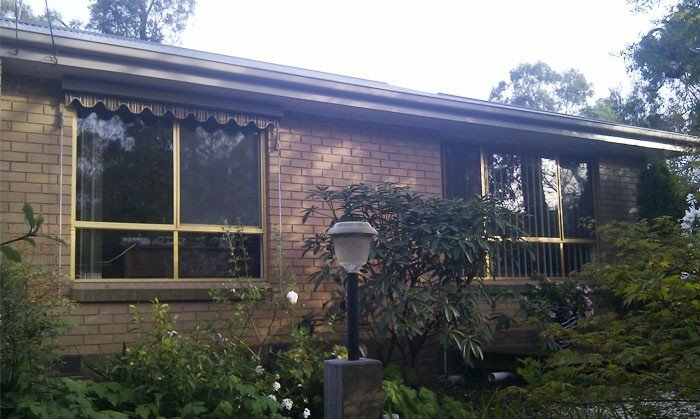 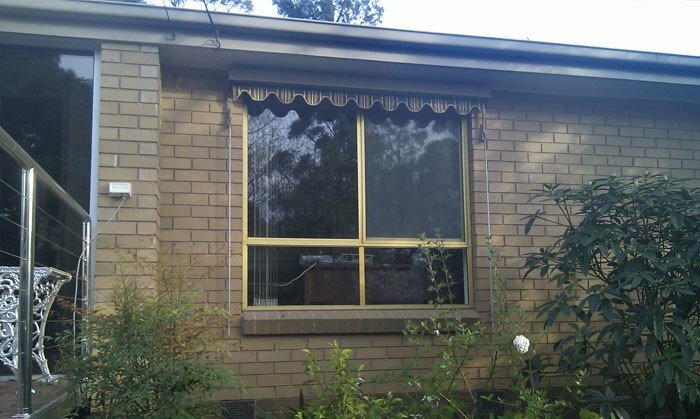 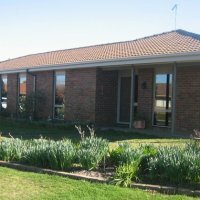 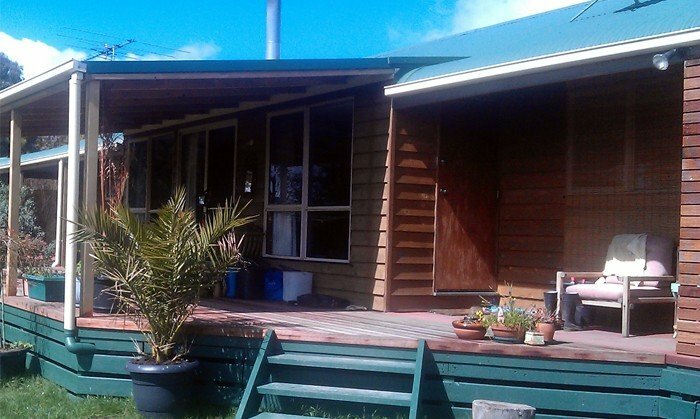 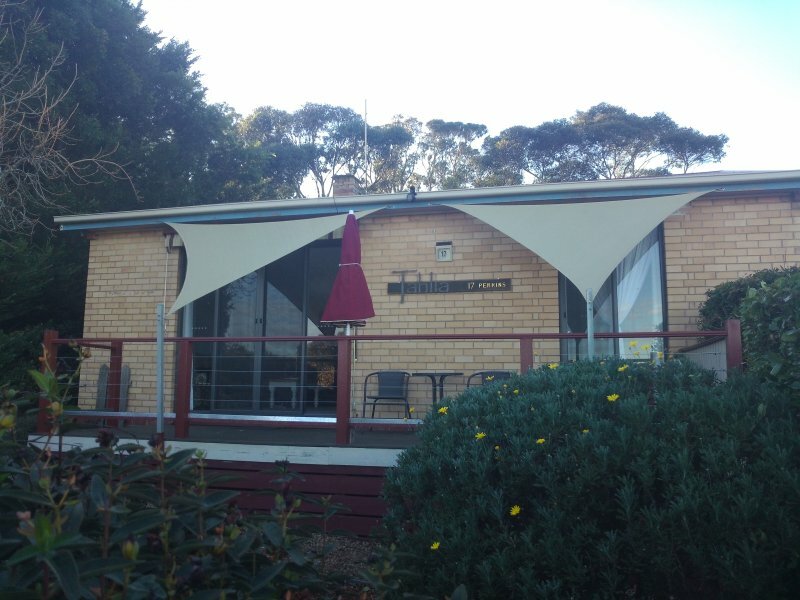 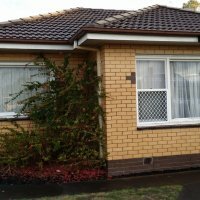 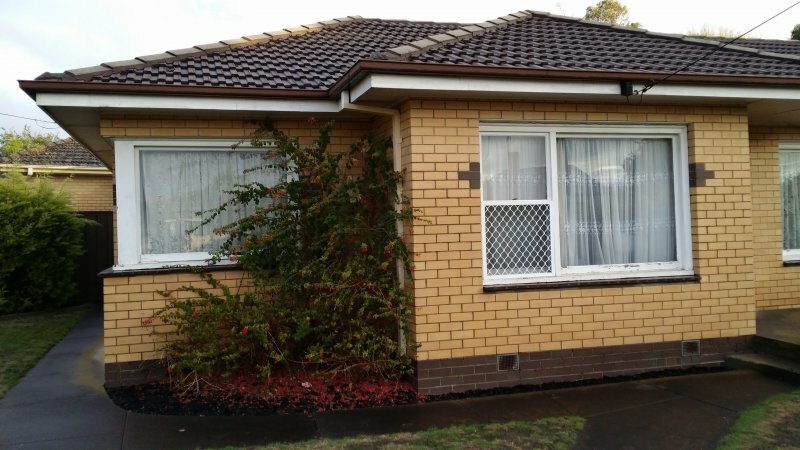 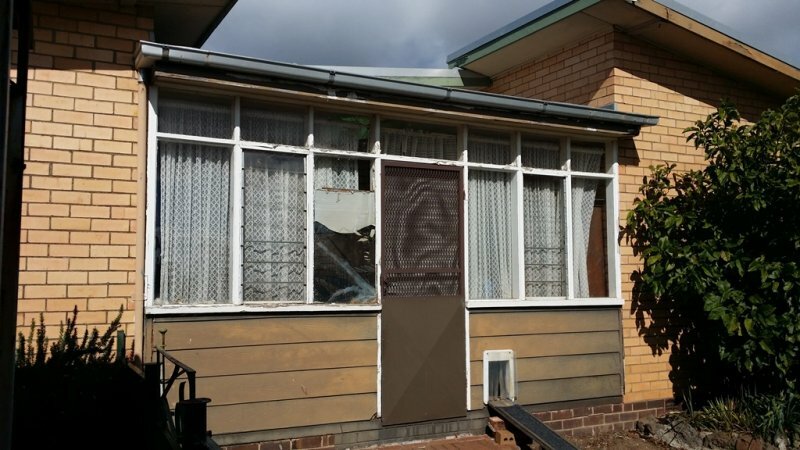 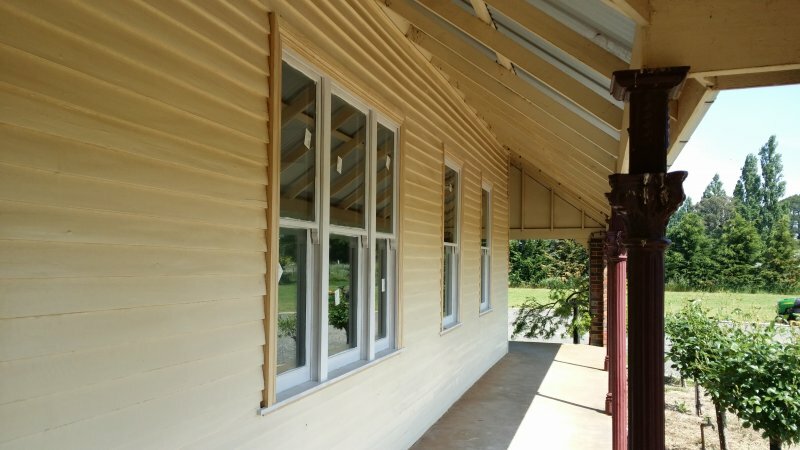 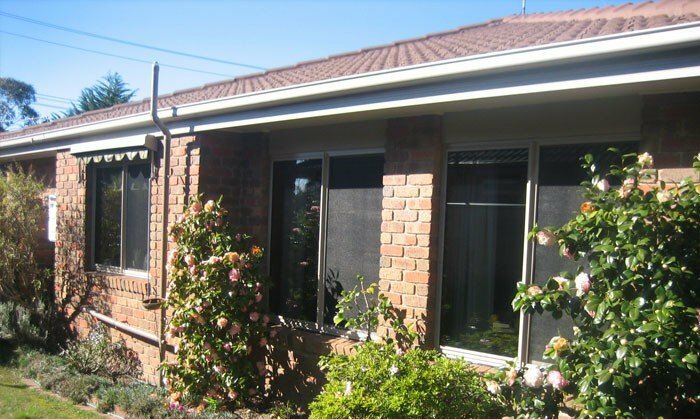 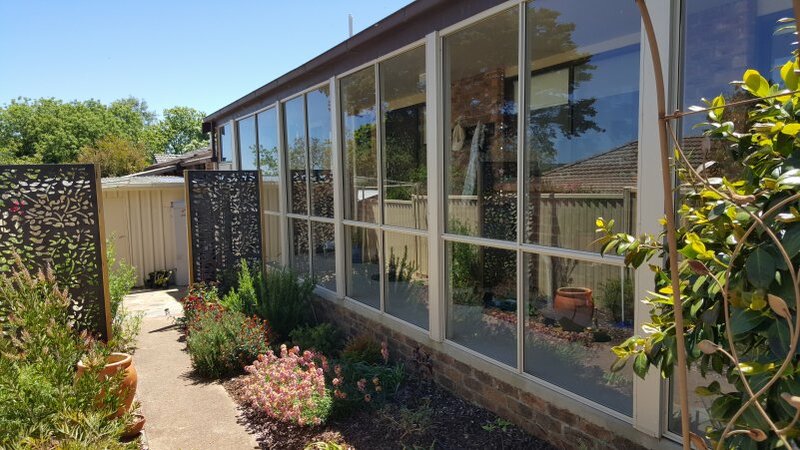 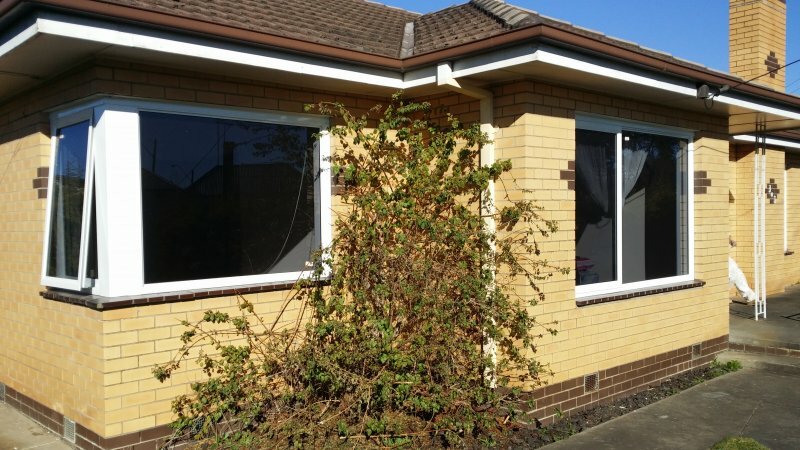 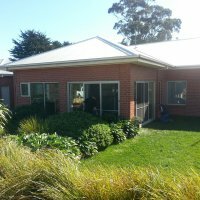 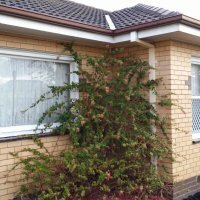 Old timber windows were replaced with new Aluminium Double Glazed Awning Windows, this greatly enhanced the energy efficiency of the home while giving it a far better appearance, Western Victoria Windows reviews continue to be positive. 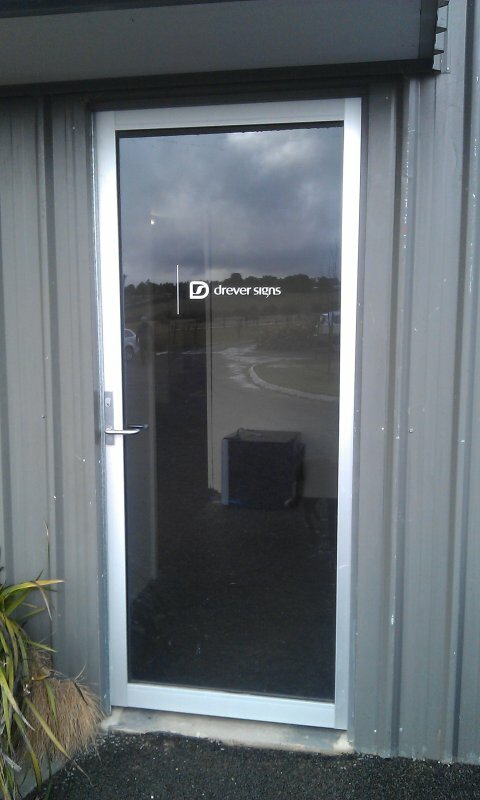 Large commercial stacking door double glazed Ballarat. 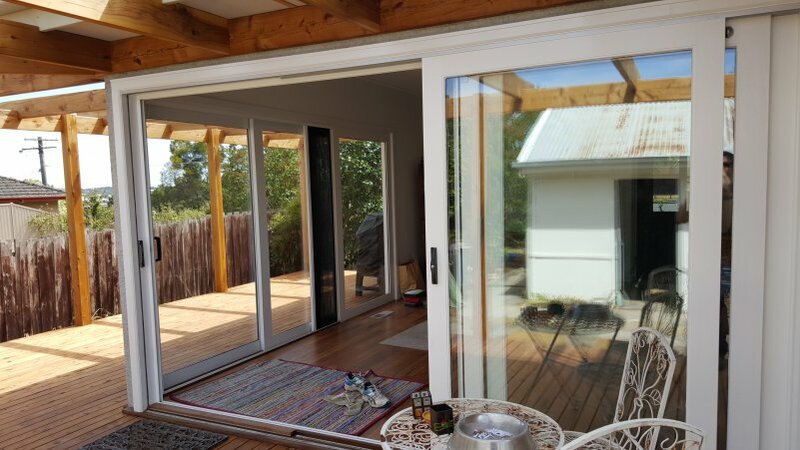 Daylesford window replacement, old timber french doors were replaced with new Aluminium Sliding Doors - this creates a modern look that does not require the up keep of a timber frame. 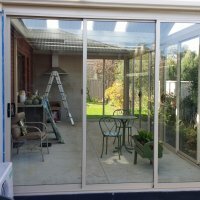 Mid way through a pergola in fill with Bi-Fold Doors Geelong Ballarat. 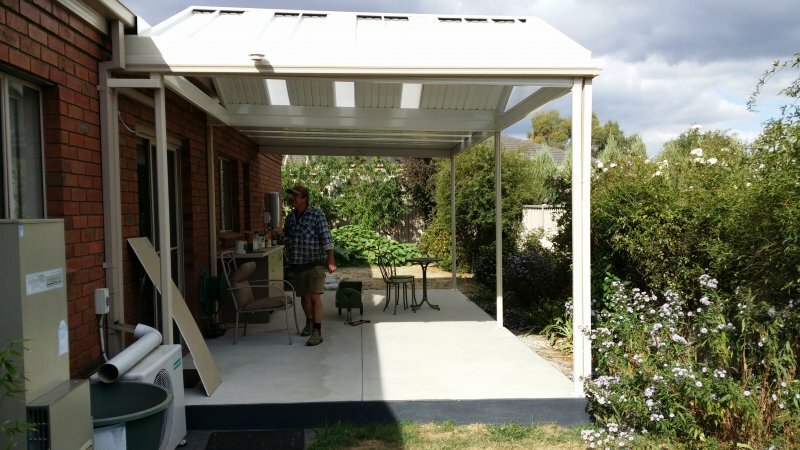 Customer reviews about this style of pergola infill that enables openable options in summer and complete weather protection in winter are well received. 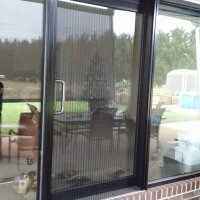 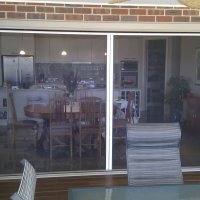 A pull down RETRACTABLE FLYSCREEN Ocean Grove. 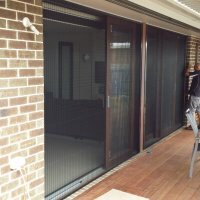 The pull down retractable screen eliminates the need for a bottom track. 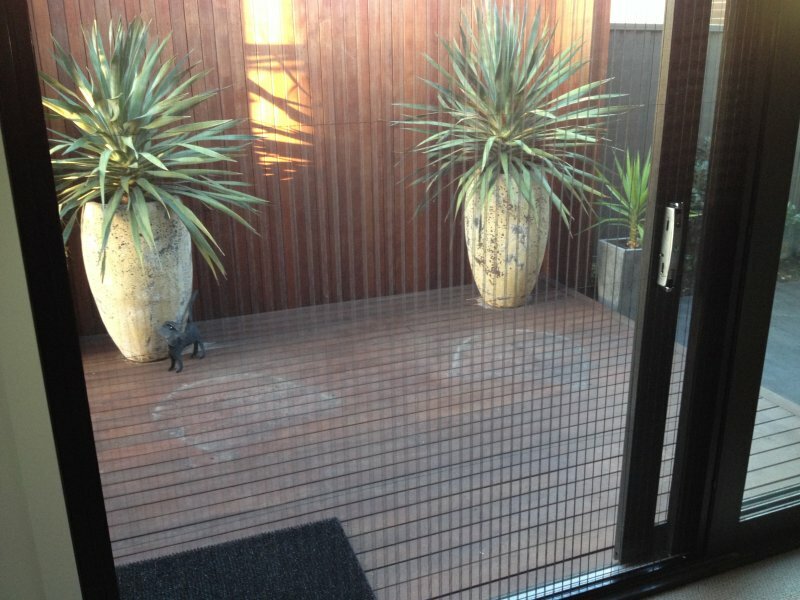 Keeps the insects out and blends in when not in use. 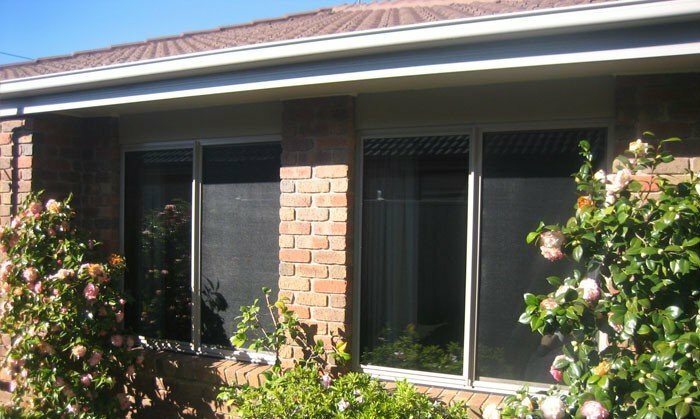 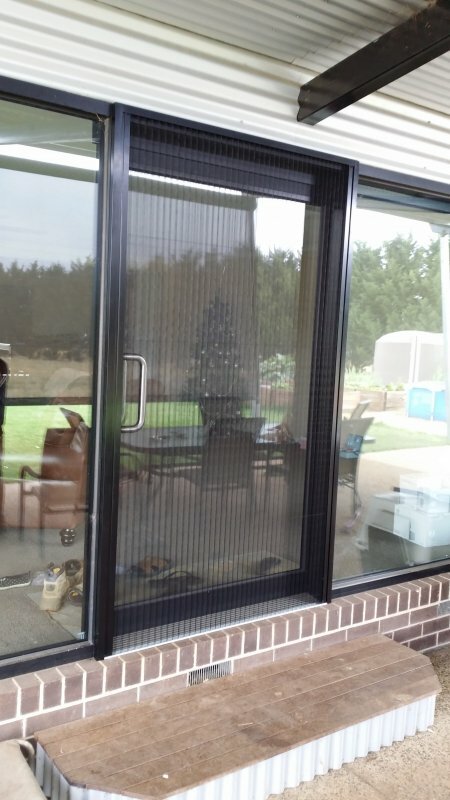 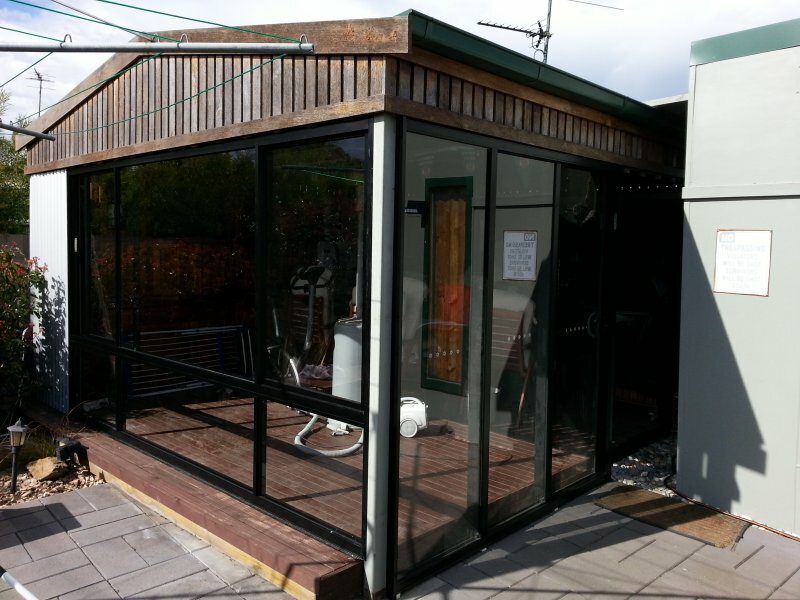 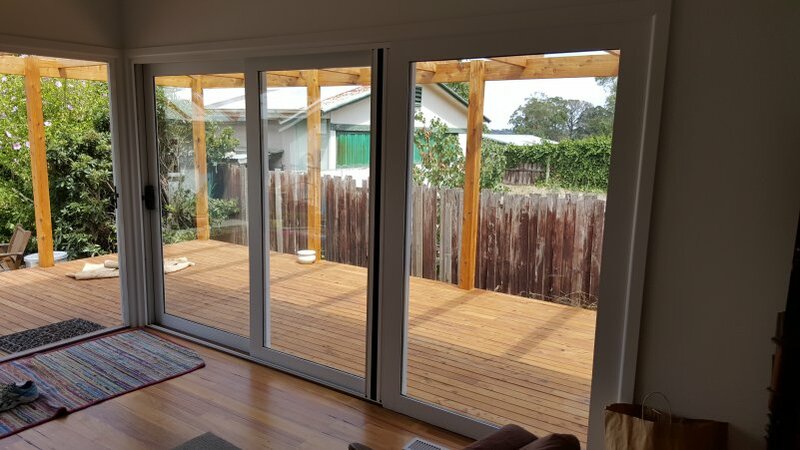 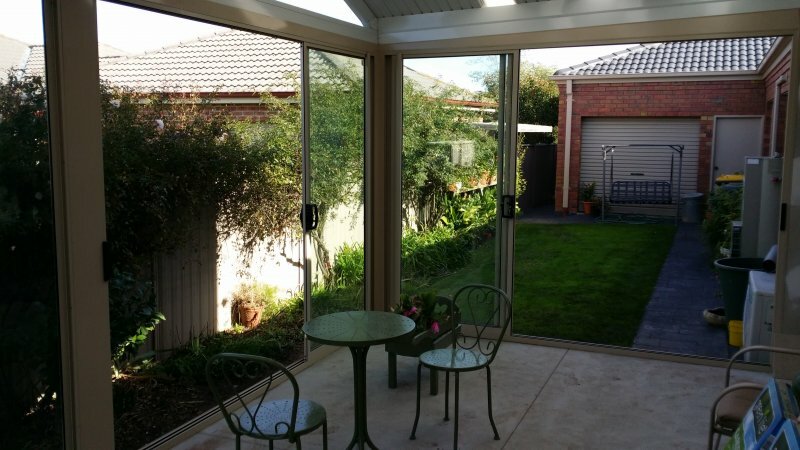 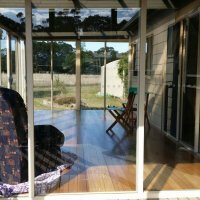 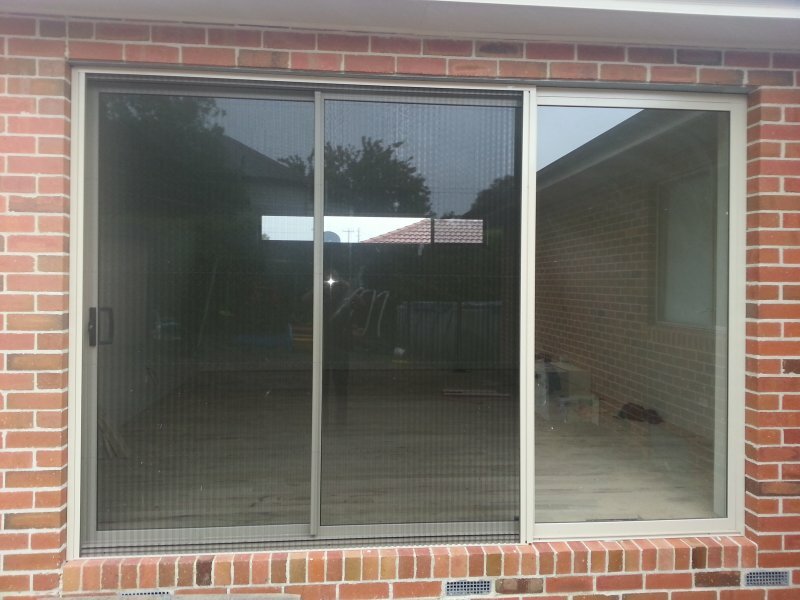 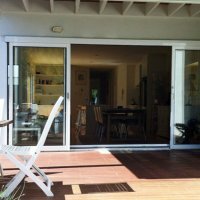 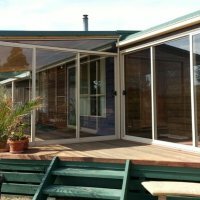 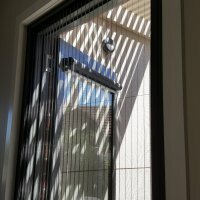 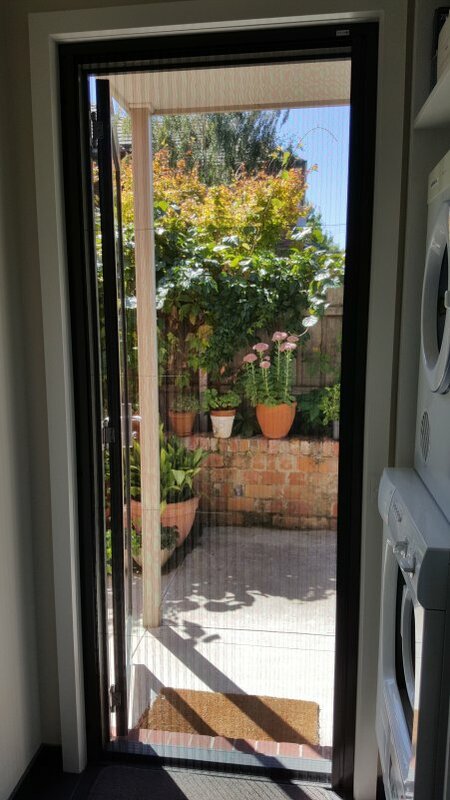 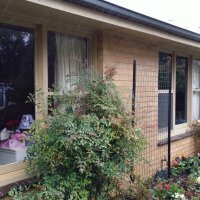 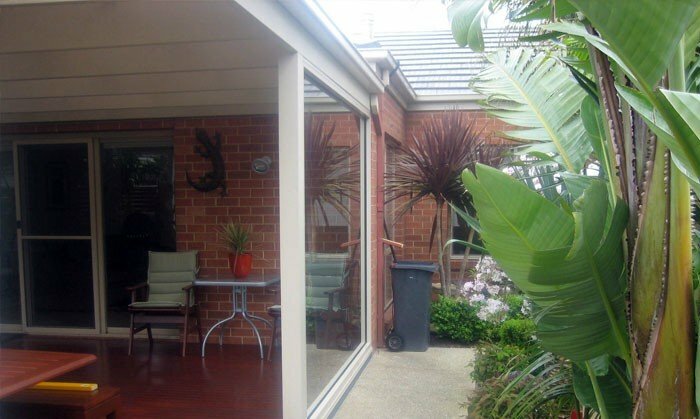 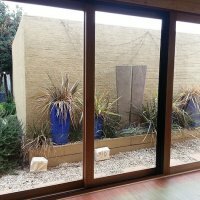 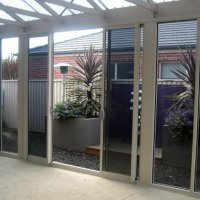 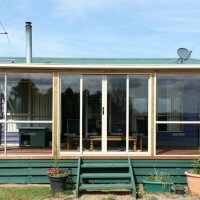 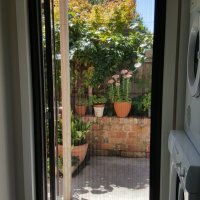 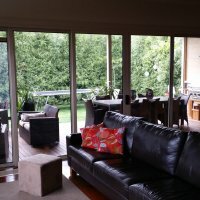 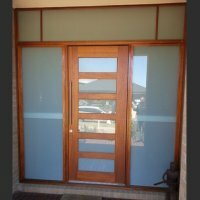 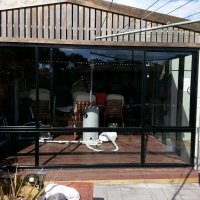 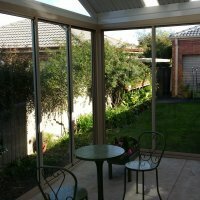 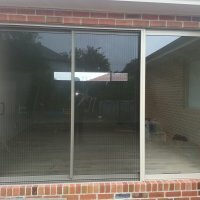 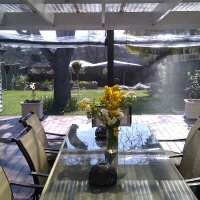 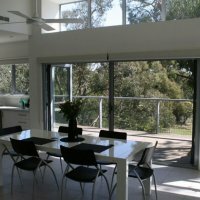 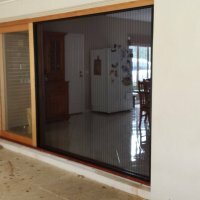 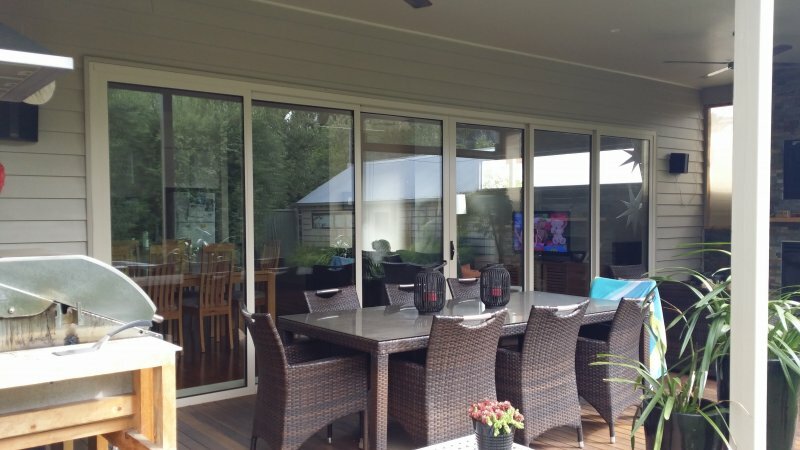 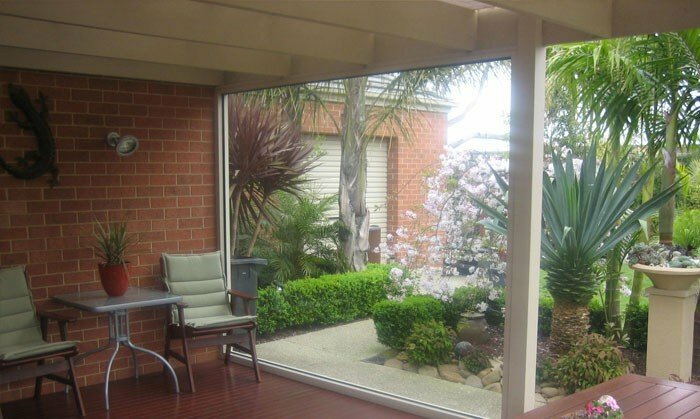 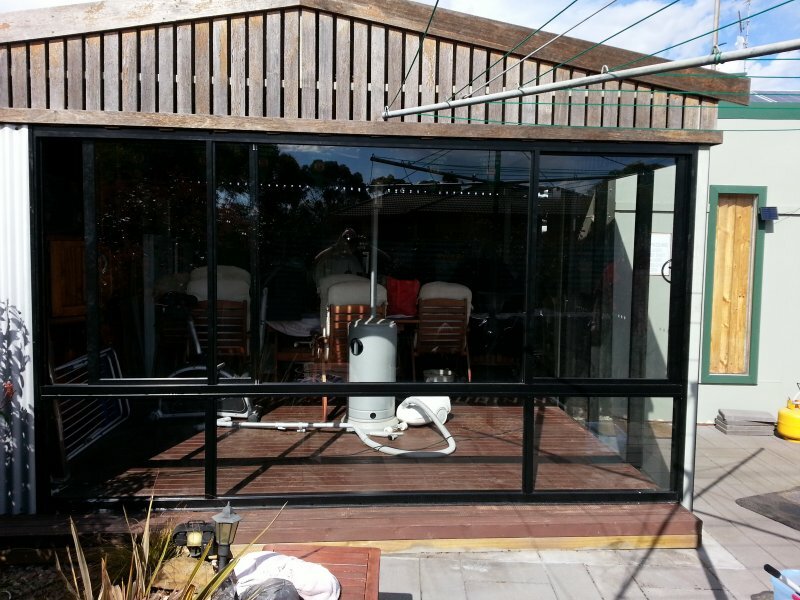 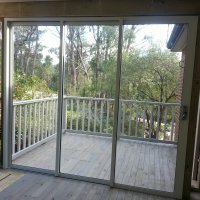 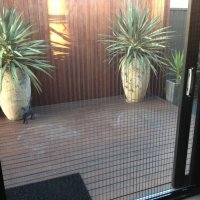 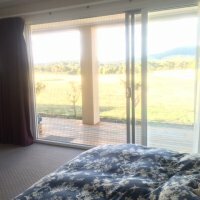 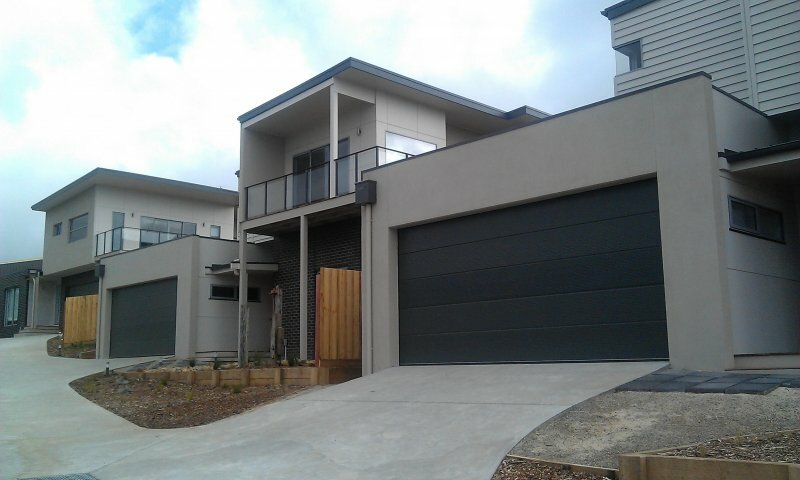 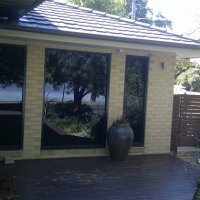 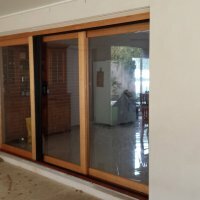 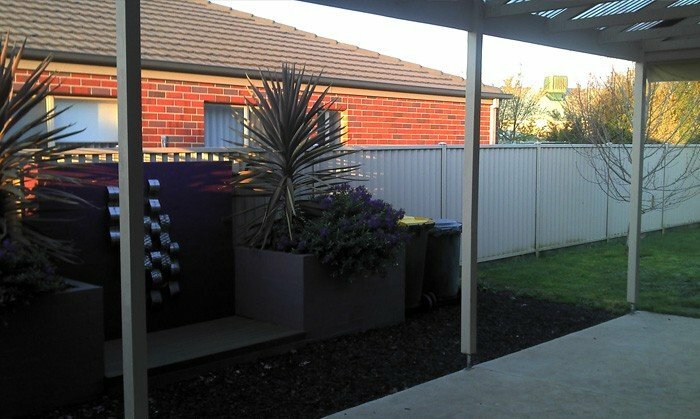 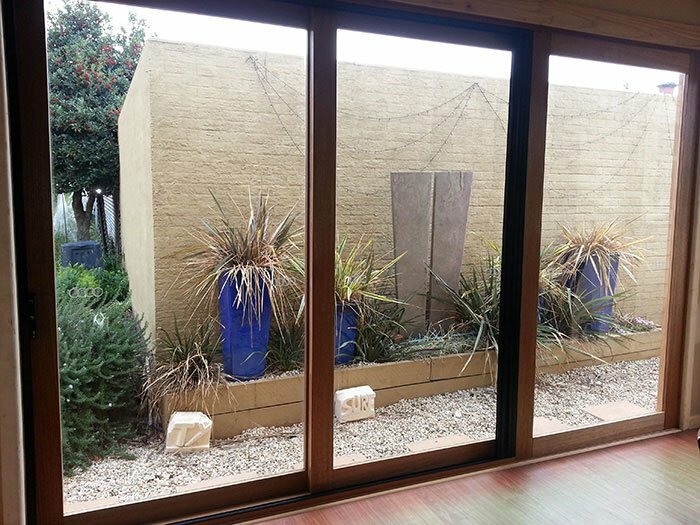 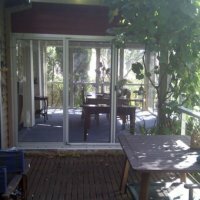 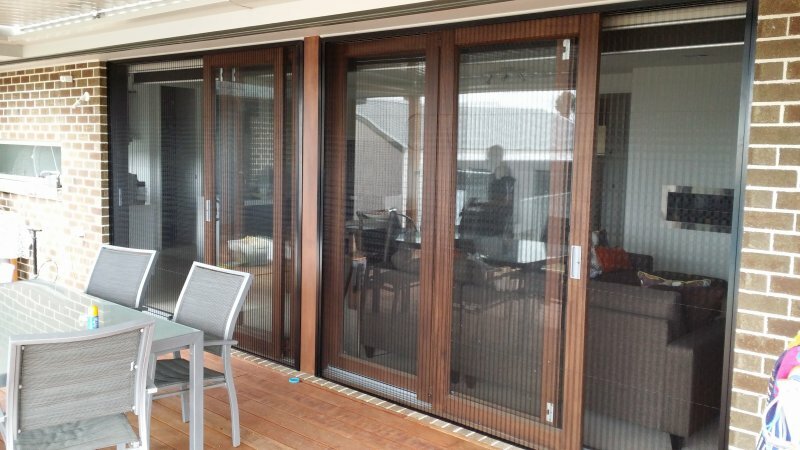 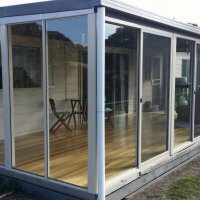 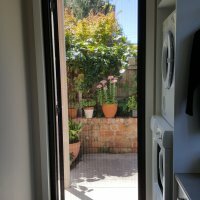 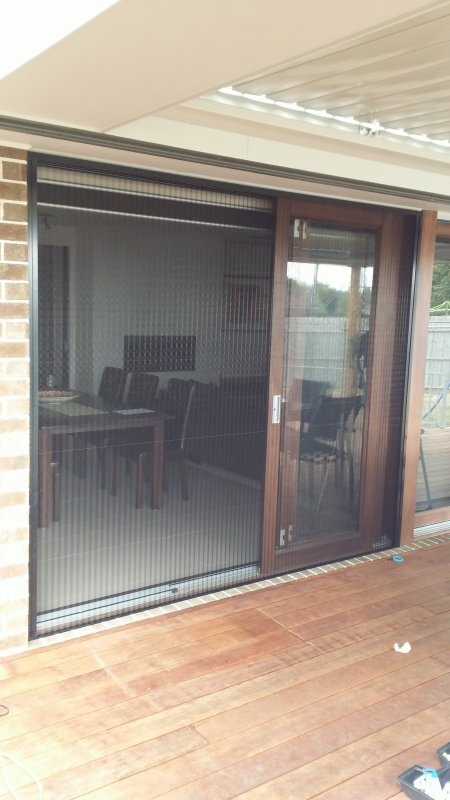 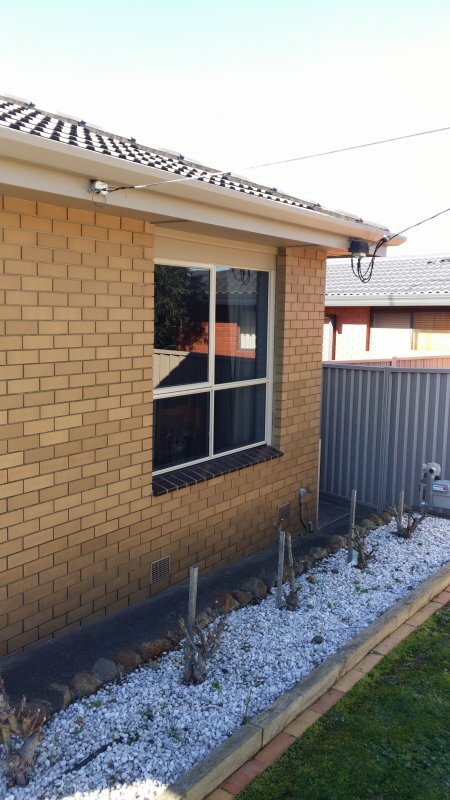 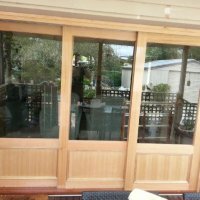 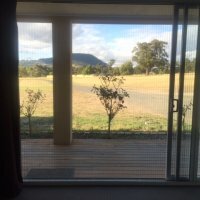 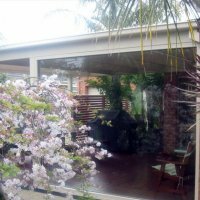 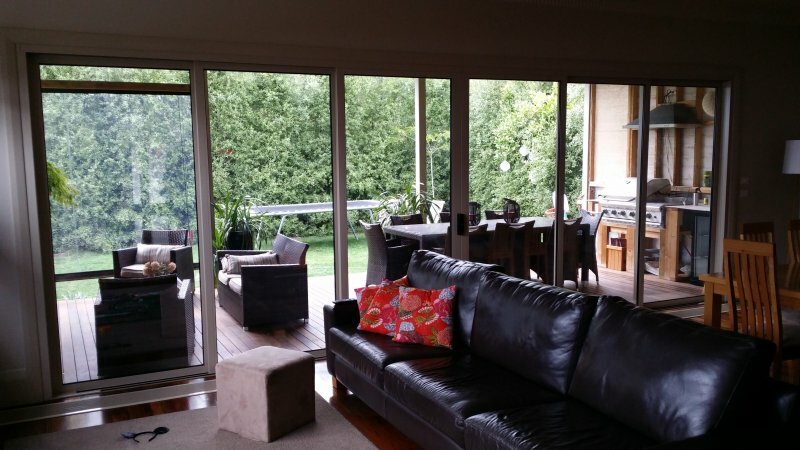 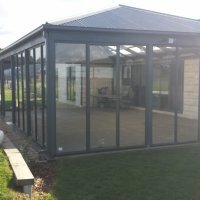 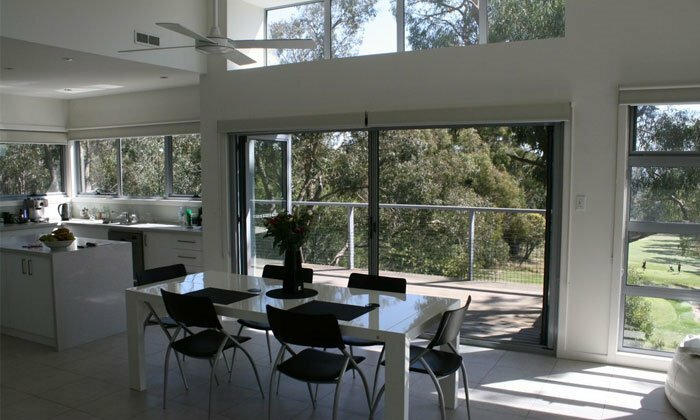 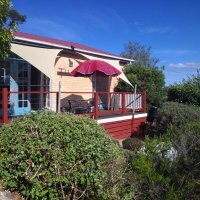 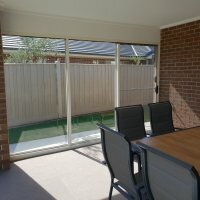 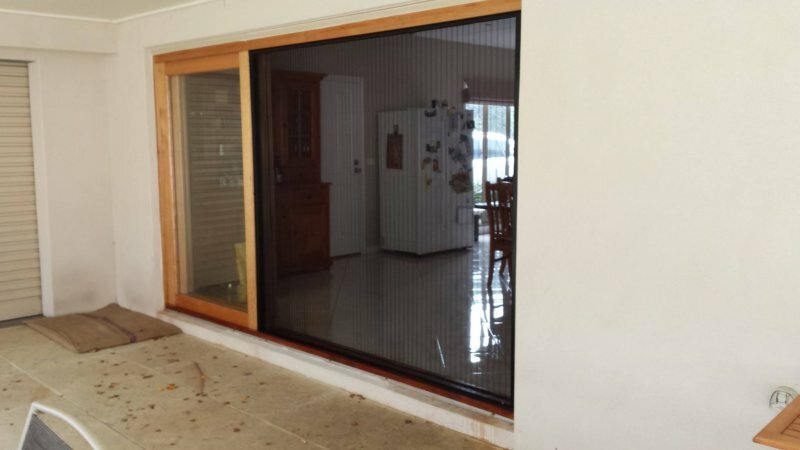 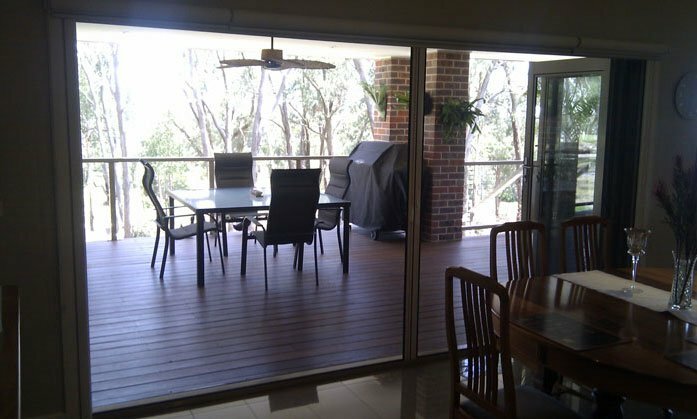 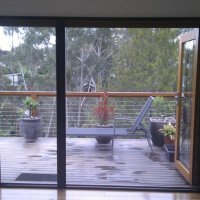 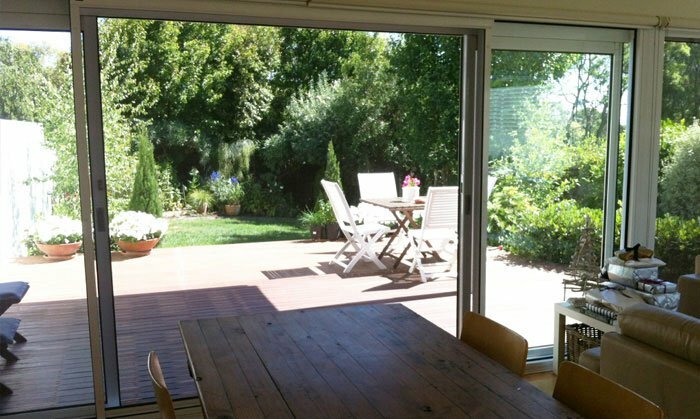 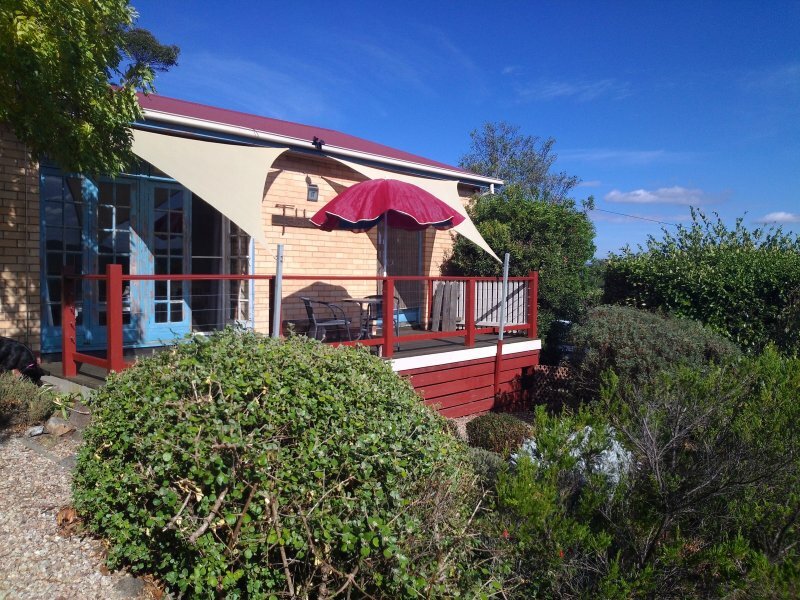 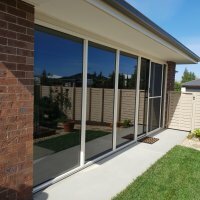 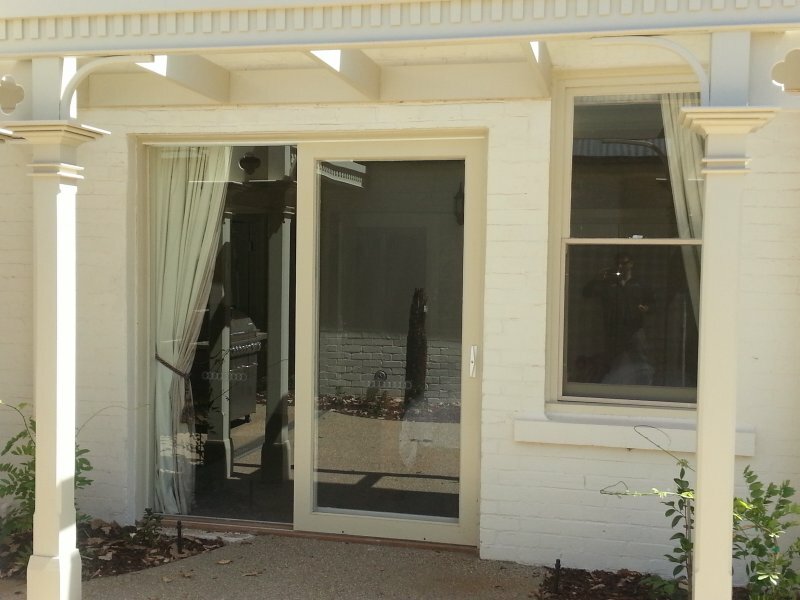 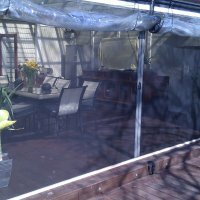 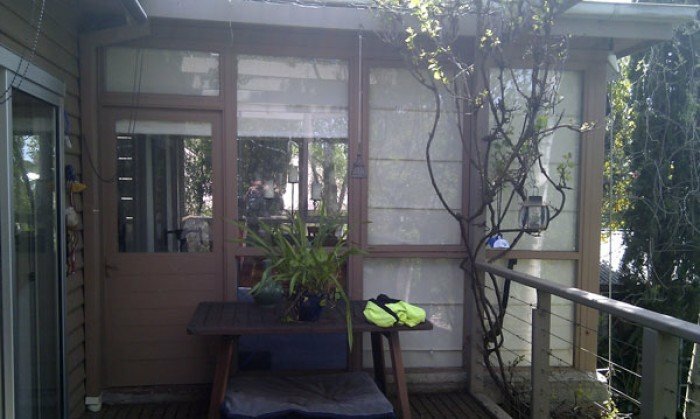 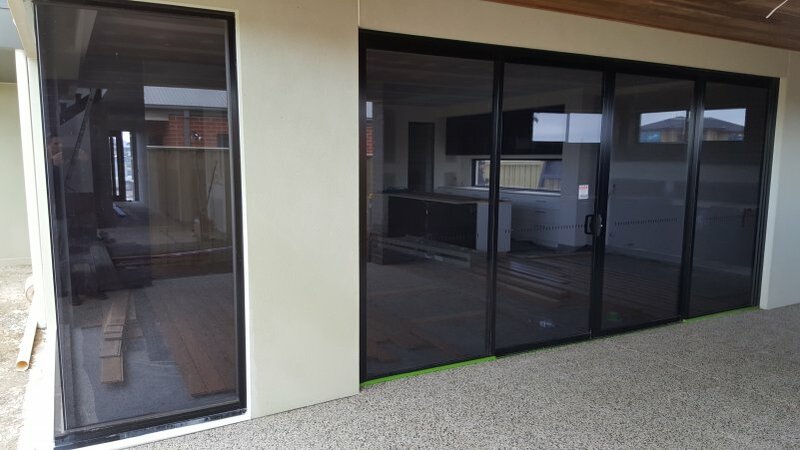 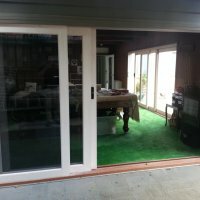 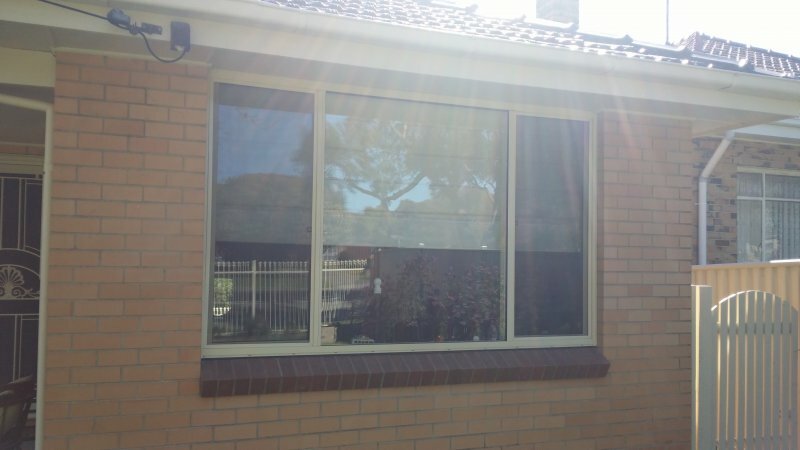 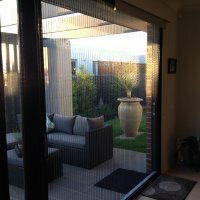 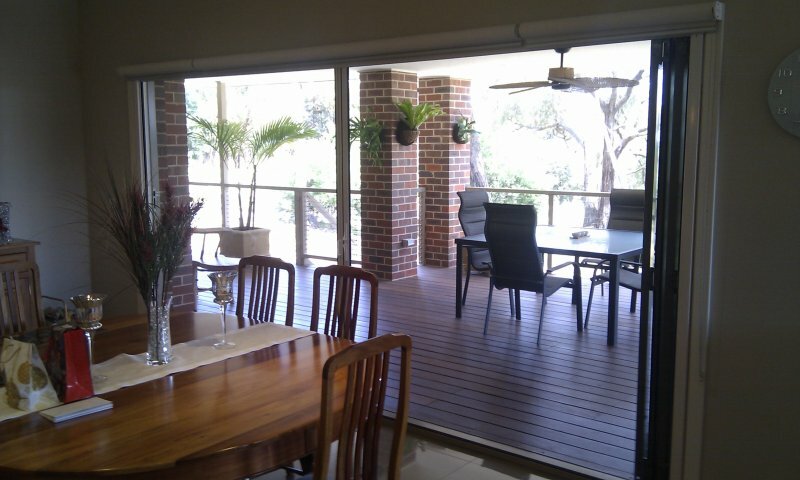 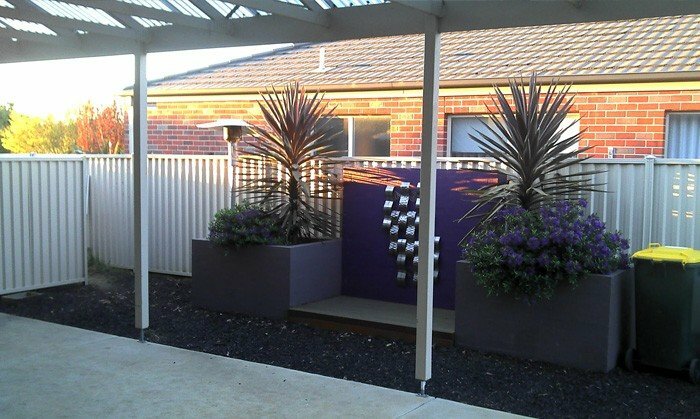 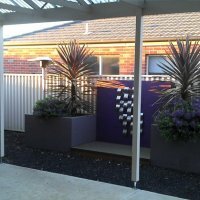 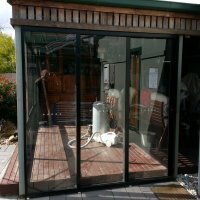 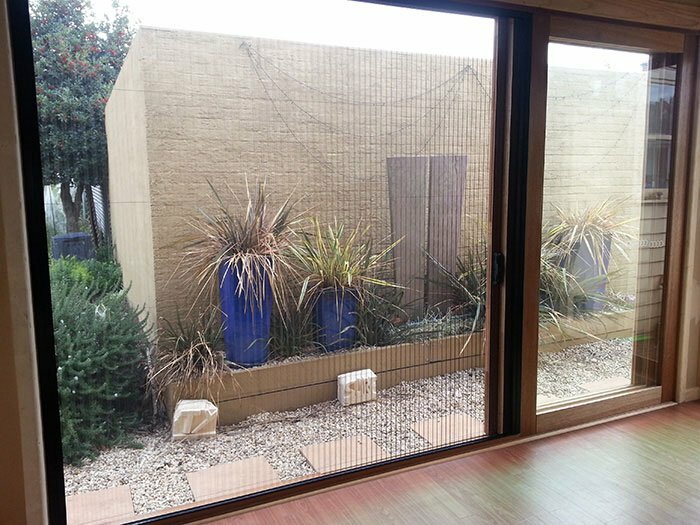 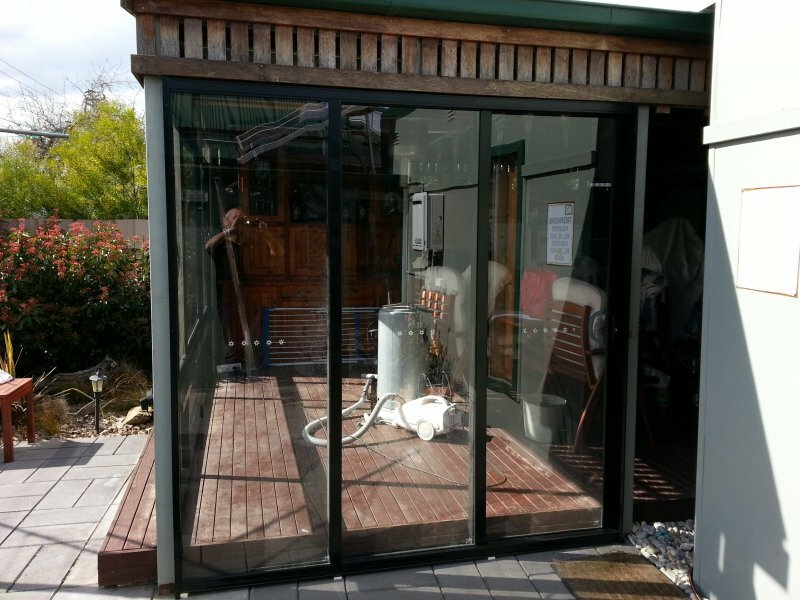 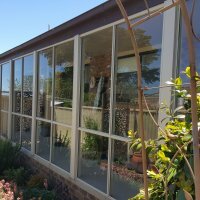 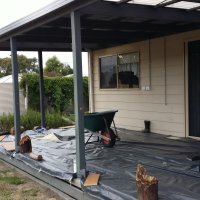 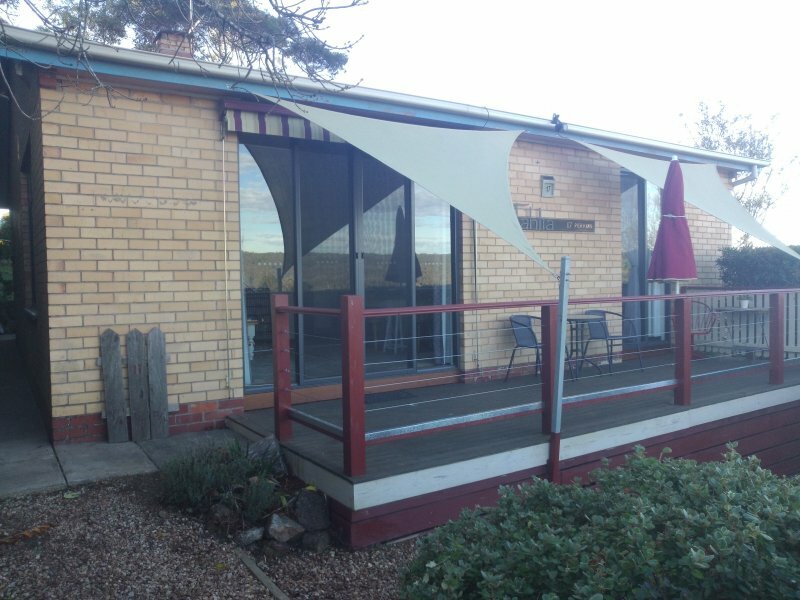 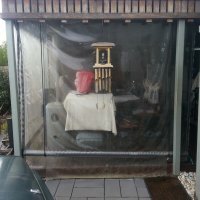 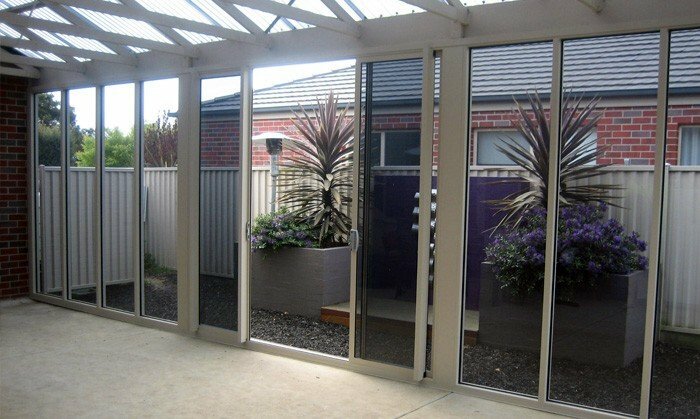 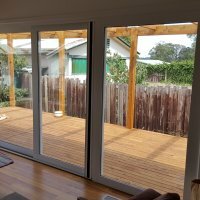 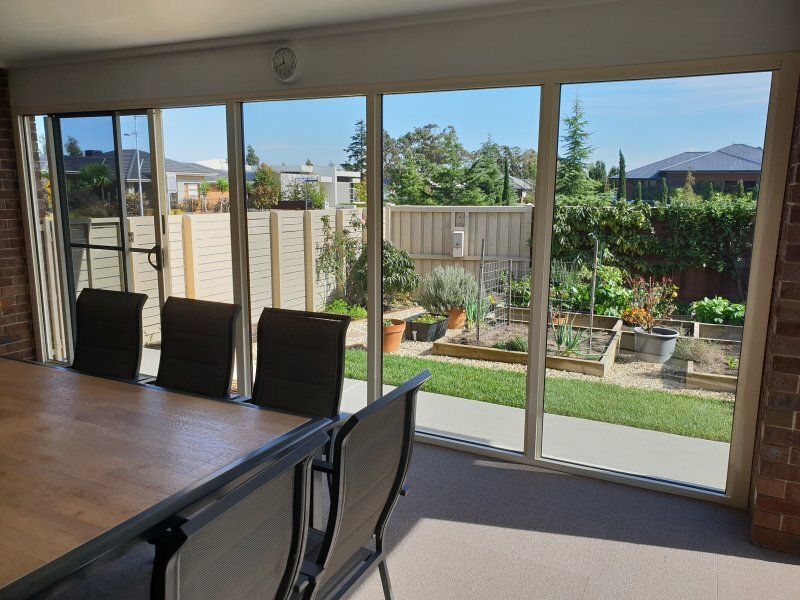 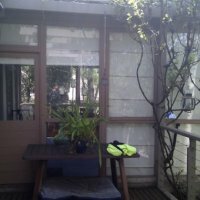 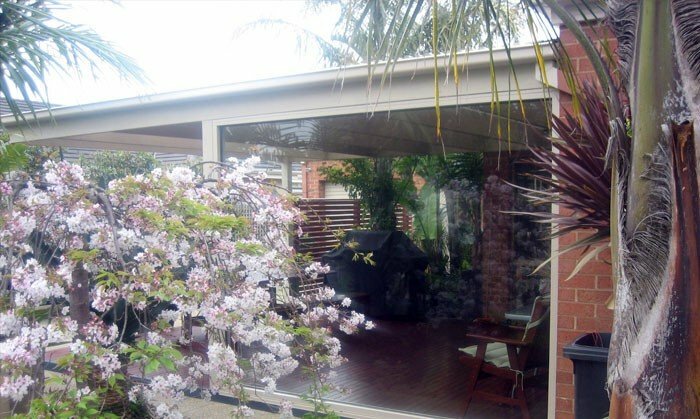 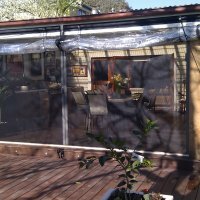 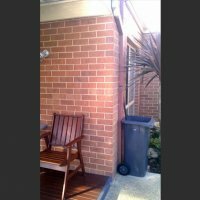 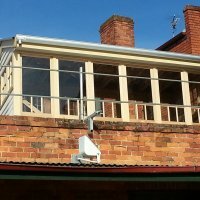 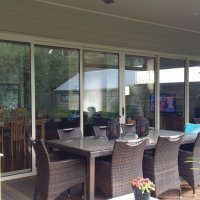 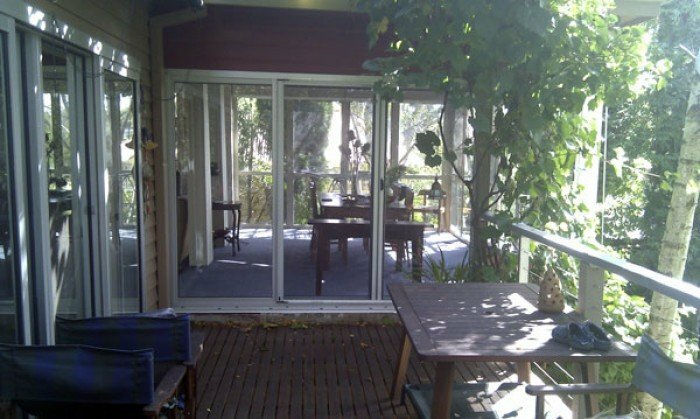 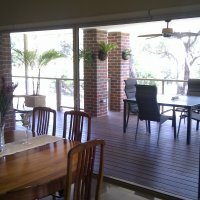 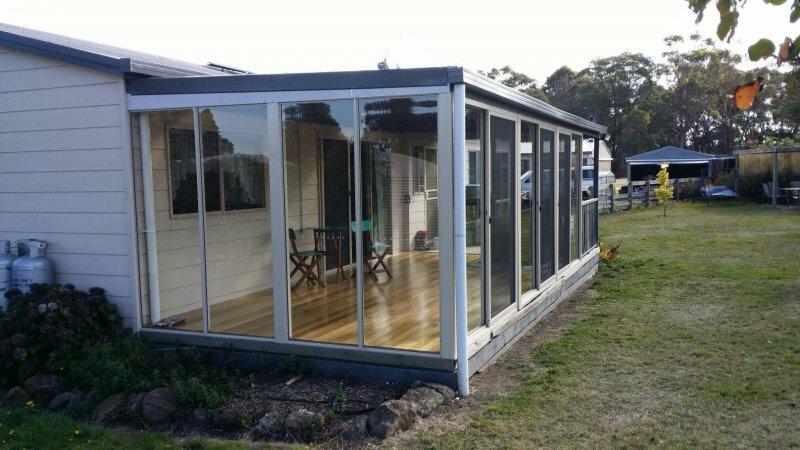 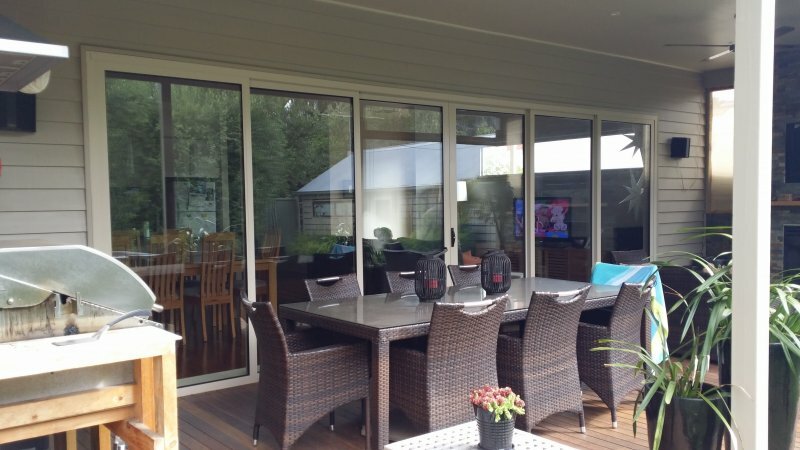 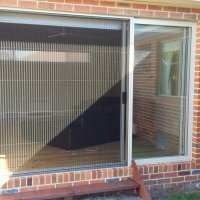 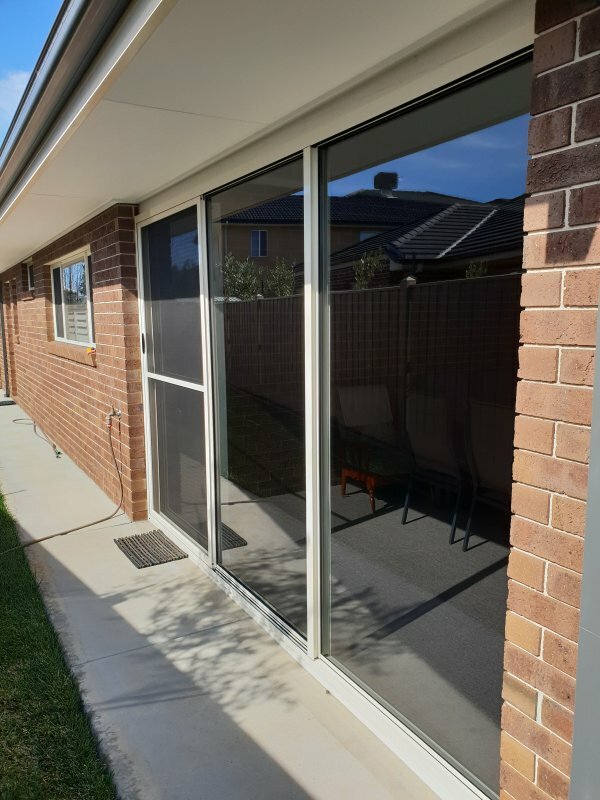 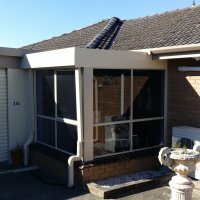 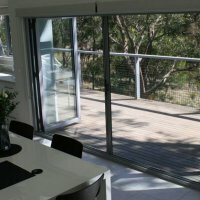 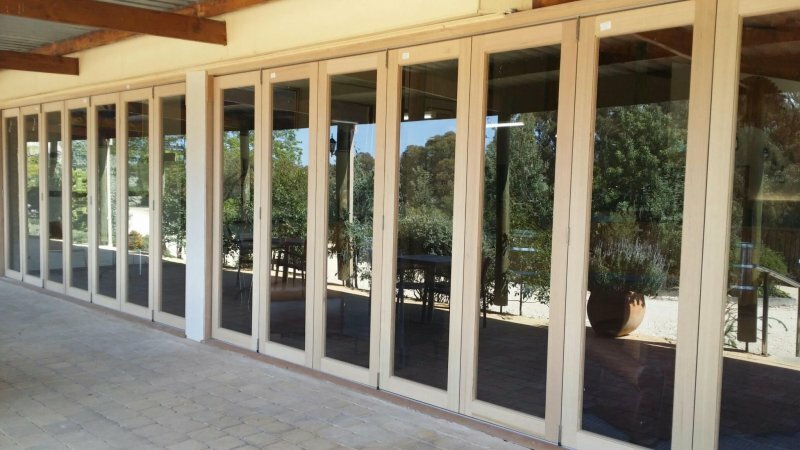 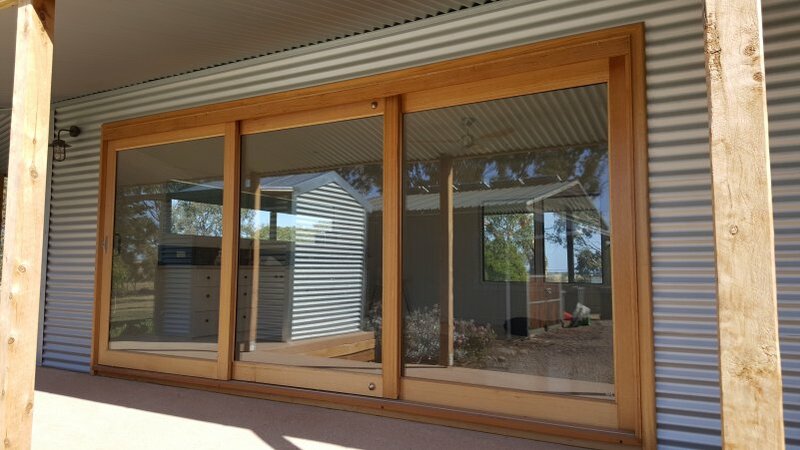 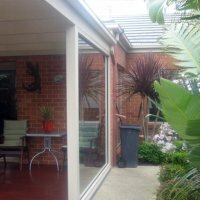 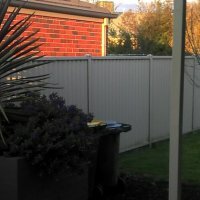 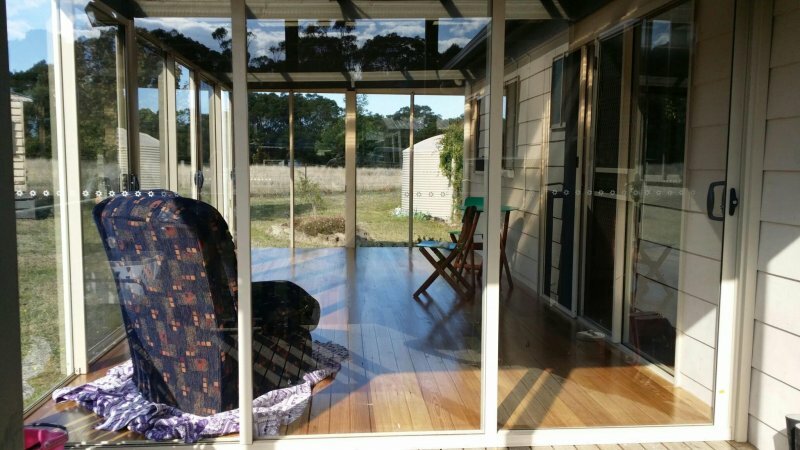 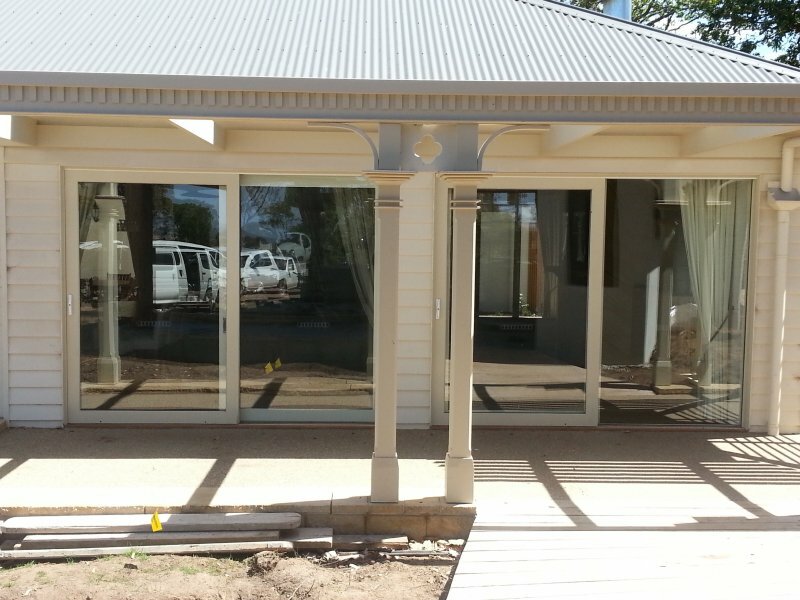 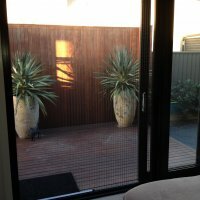 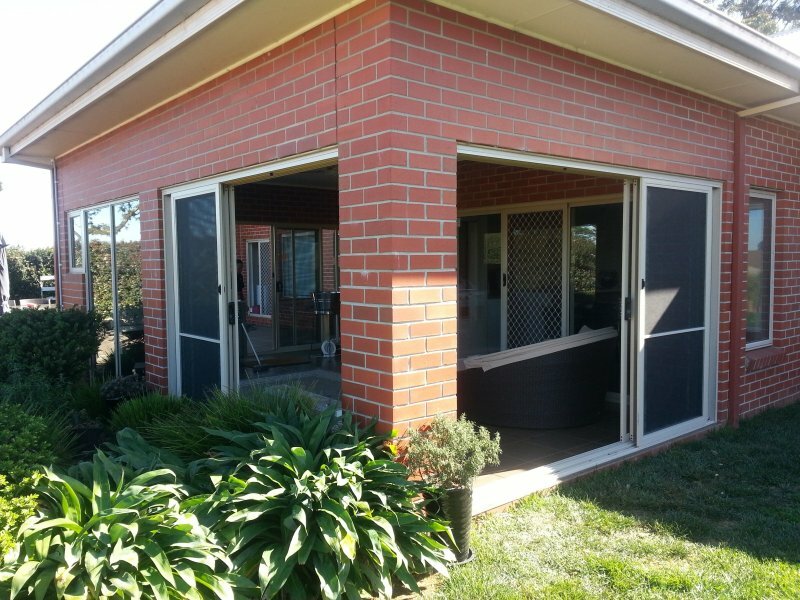 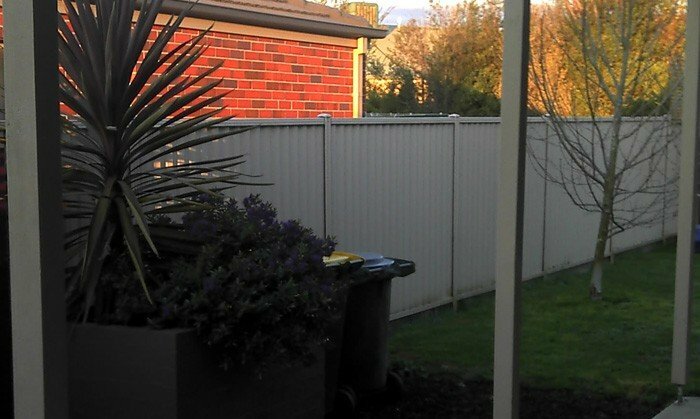 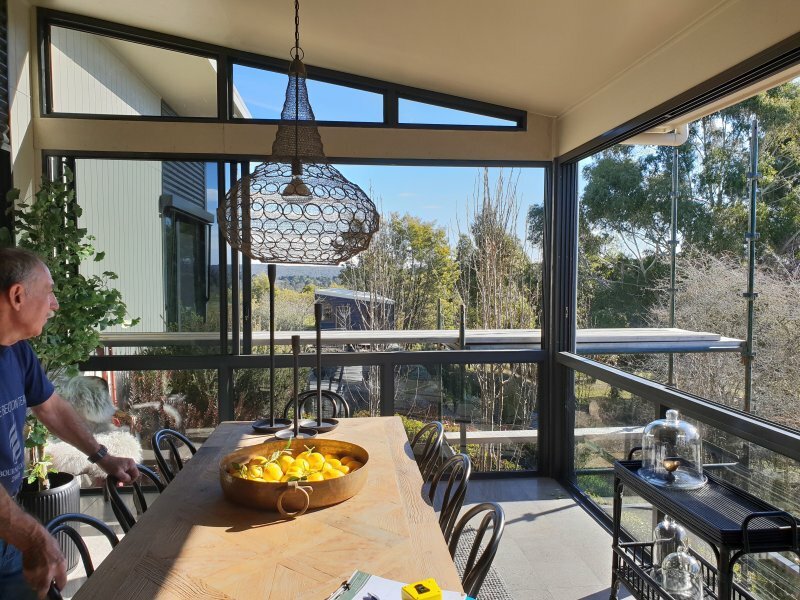 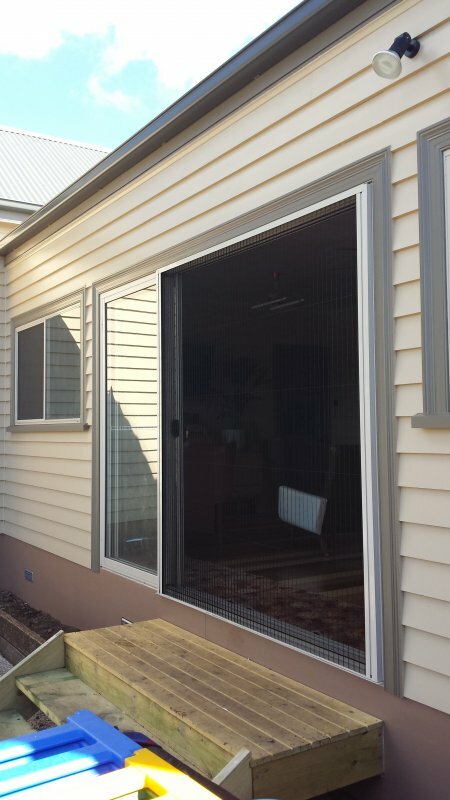 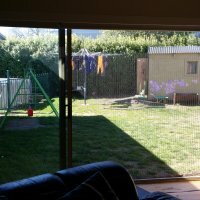 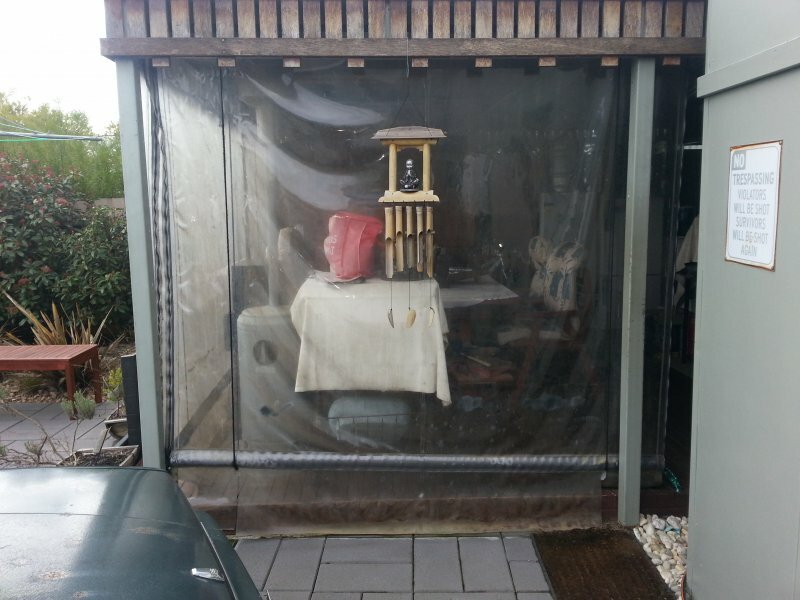 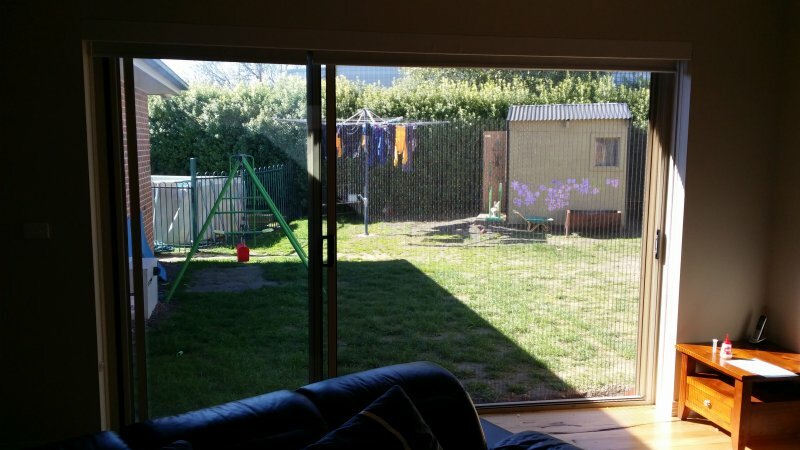 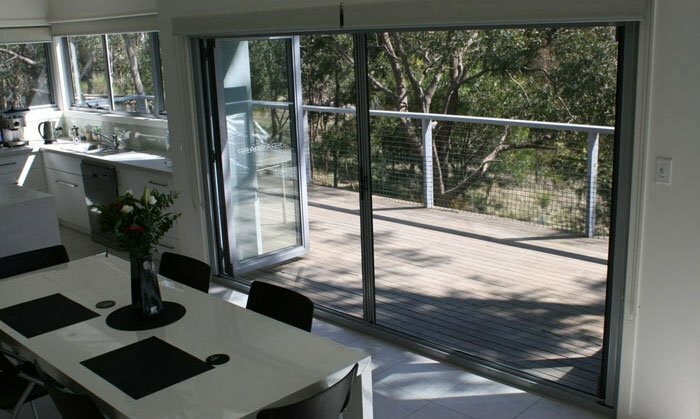 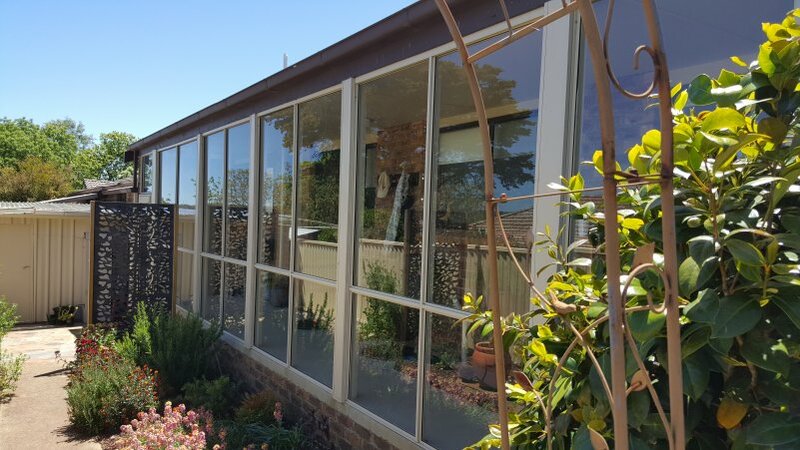 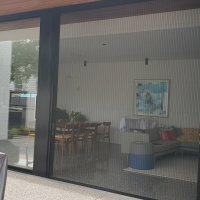 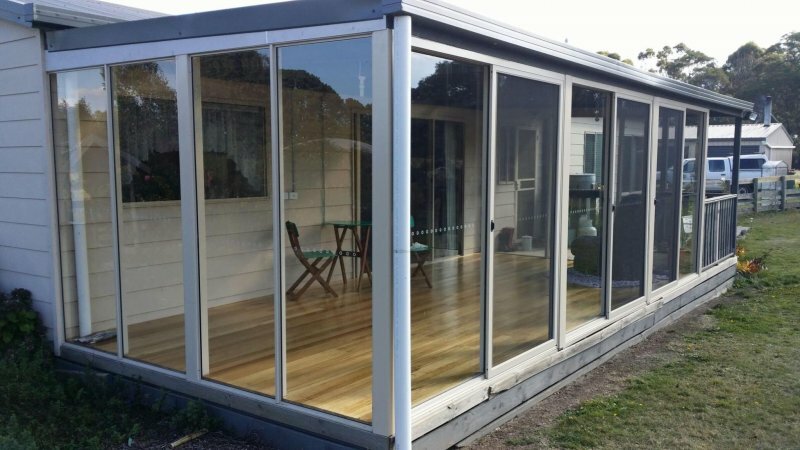 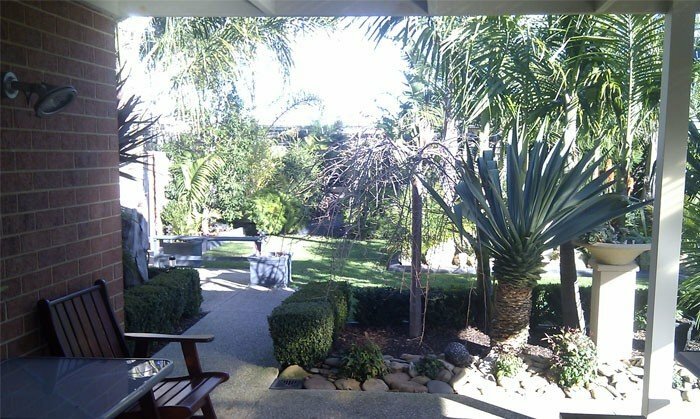 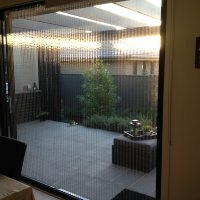 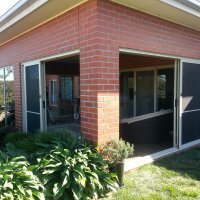 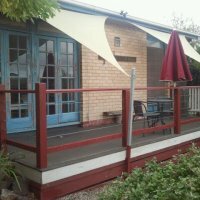 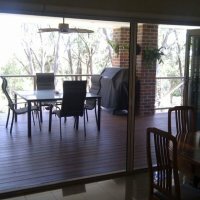 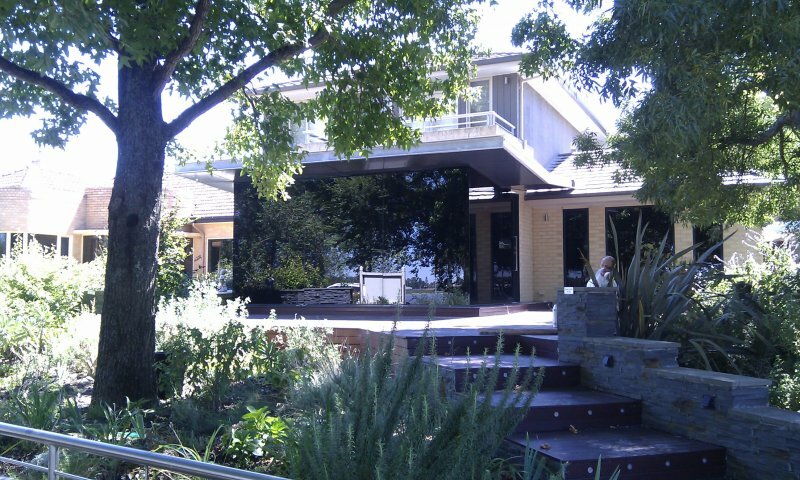 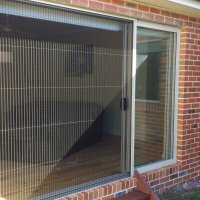 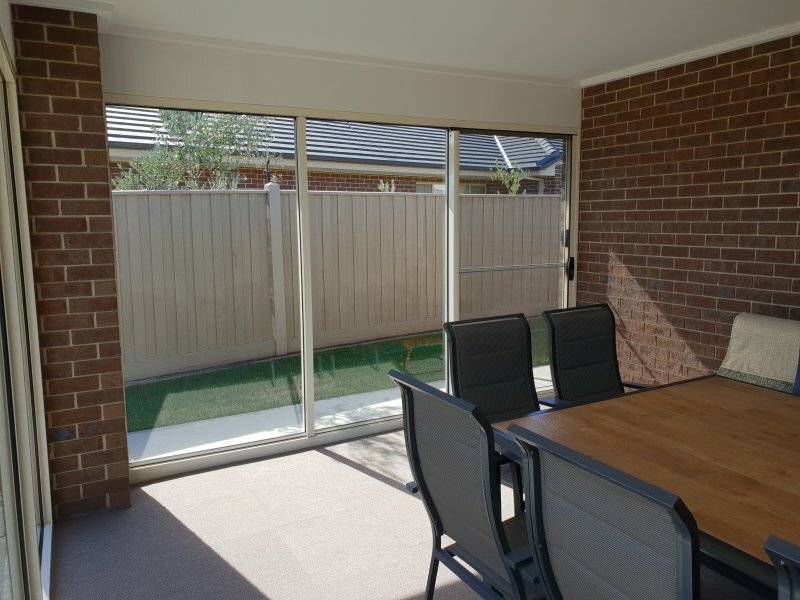 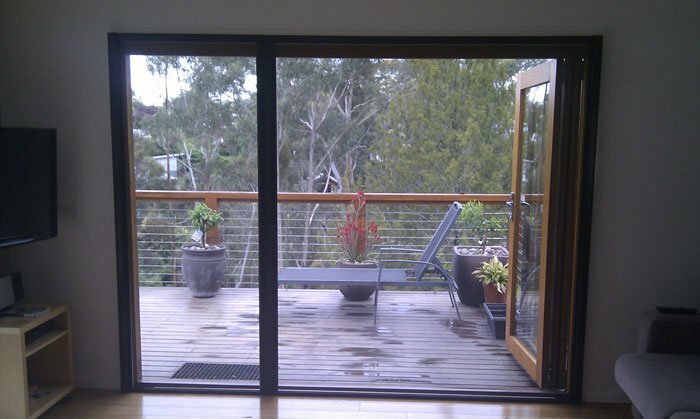 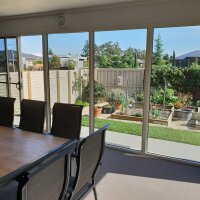 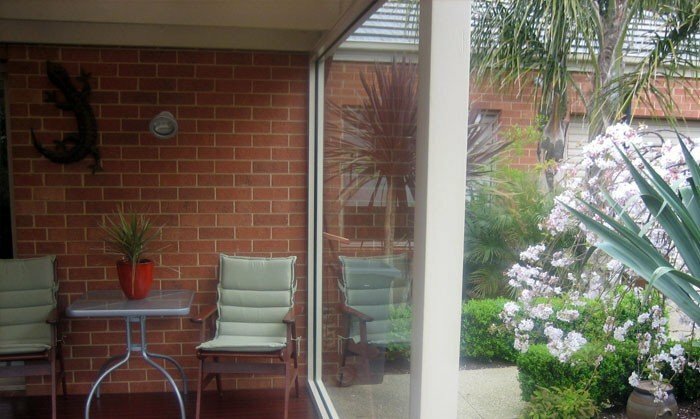 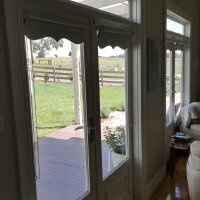 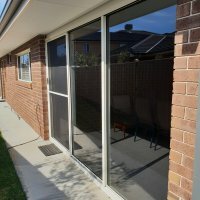 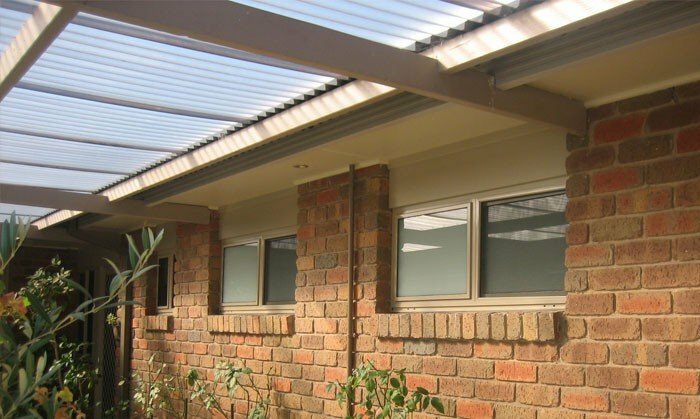 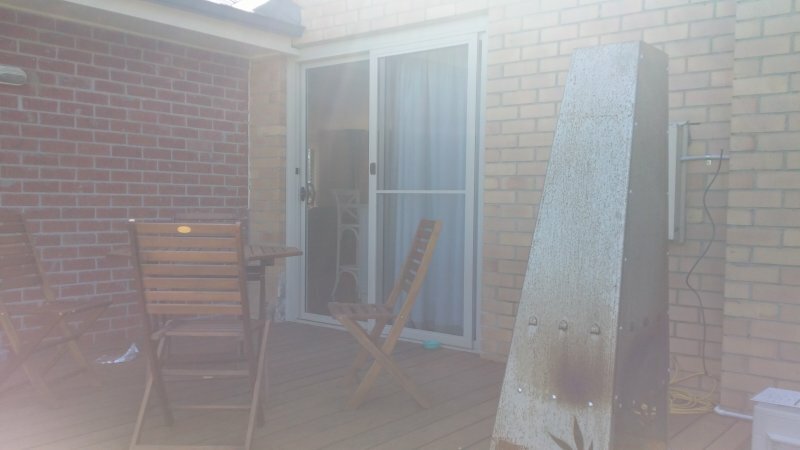 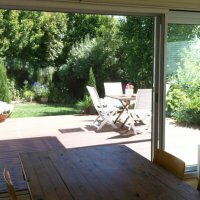 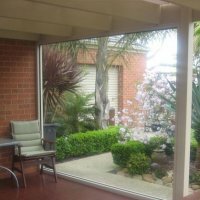 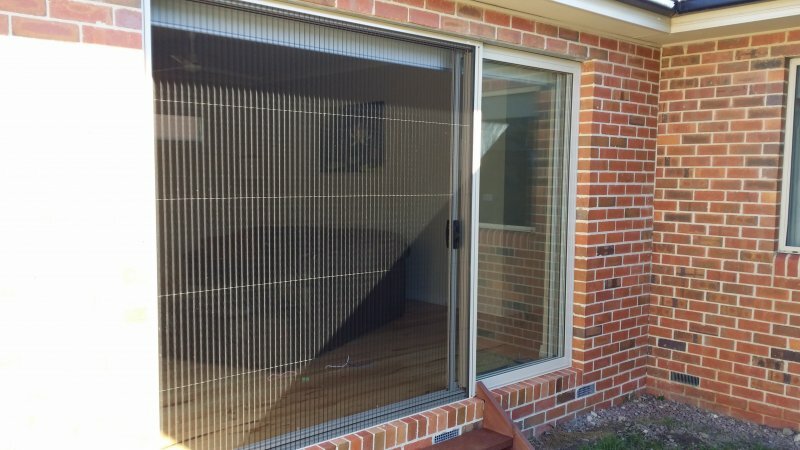 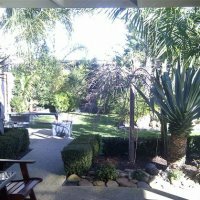 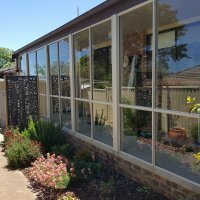 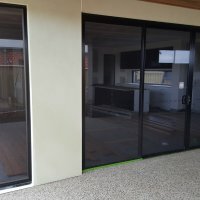 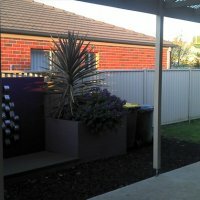 Retractable screen Geelong - The ideal solution for a compact screen that wont dominate the appearance of the house.Neatly out of sight until it is in use. 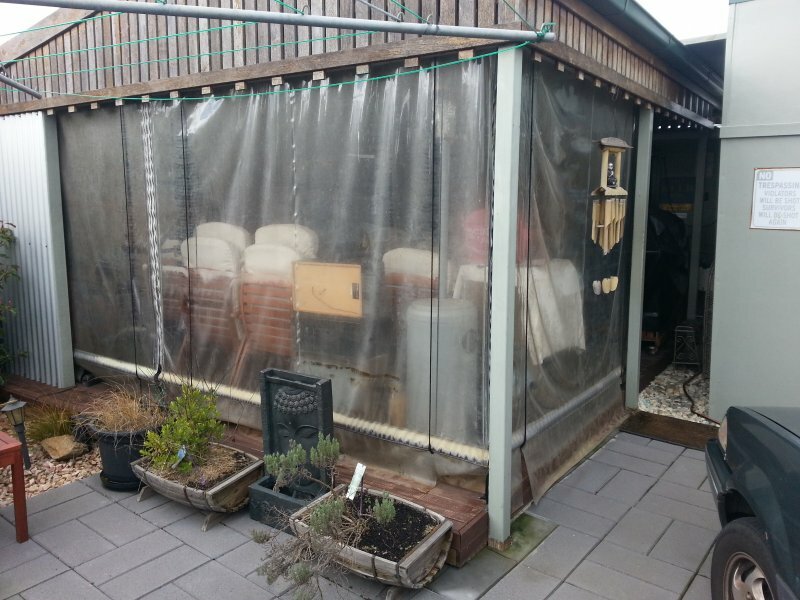 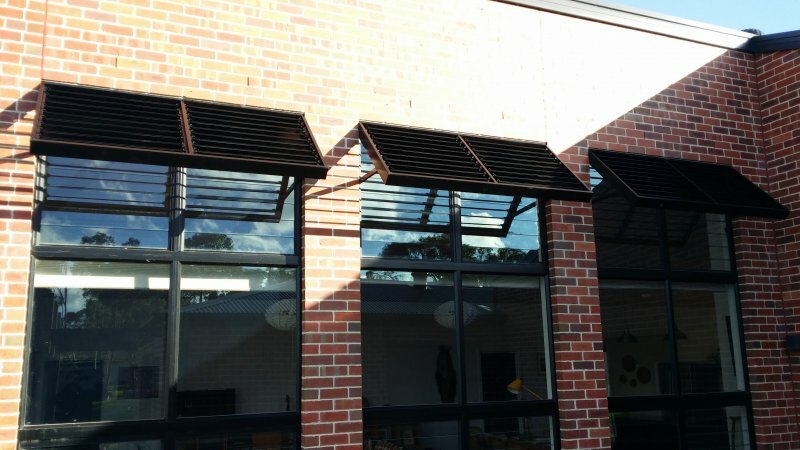 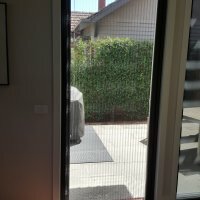 Retractable flydoors / Insect screens are fast becoming the choice for screening solutions throughout Ballarat Geelong and Melbourne. 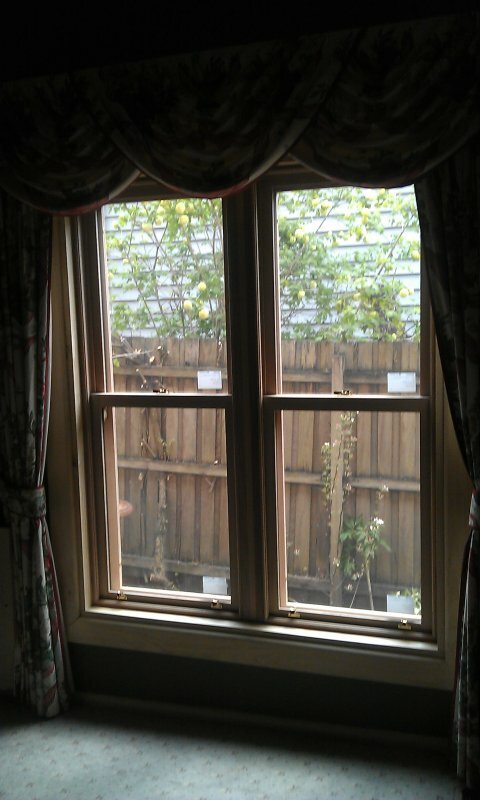 Internal Photo of a new Timber Double Hung installed into an existing opening. 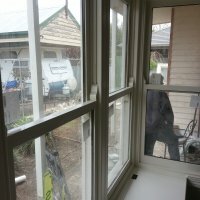 Window Replacement Daylesford. 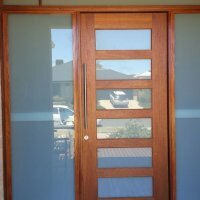 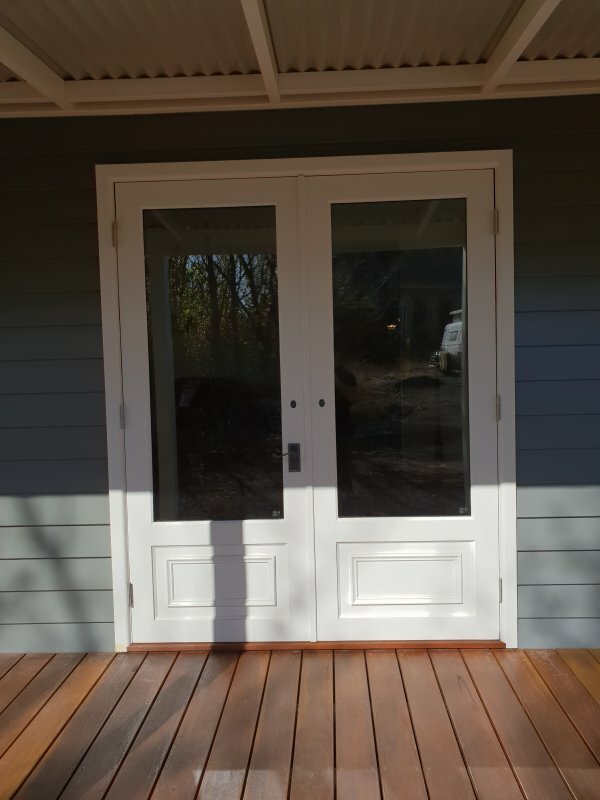 Replacement glass door and jamb Ballarat. 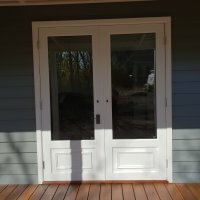 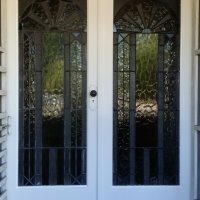 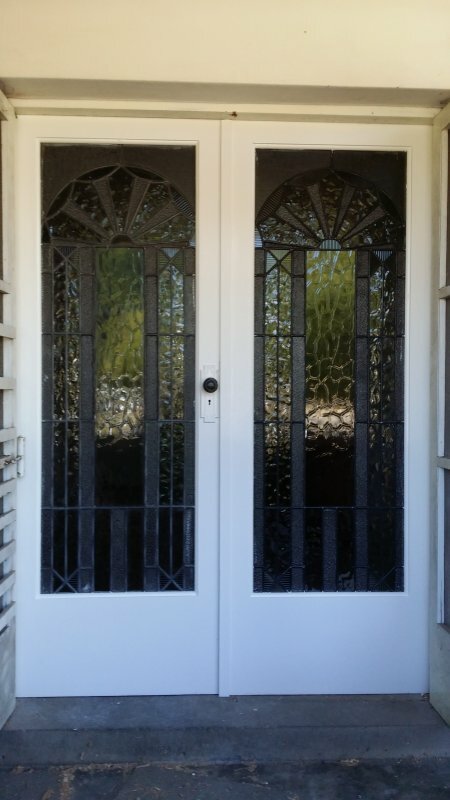 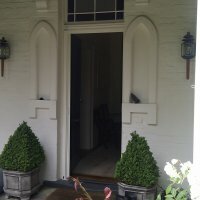 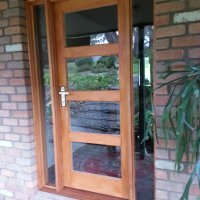 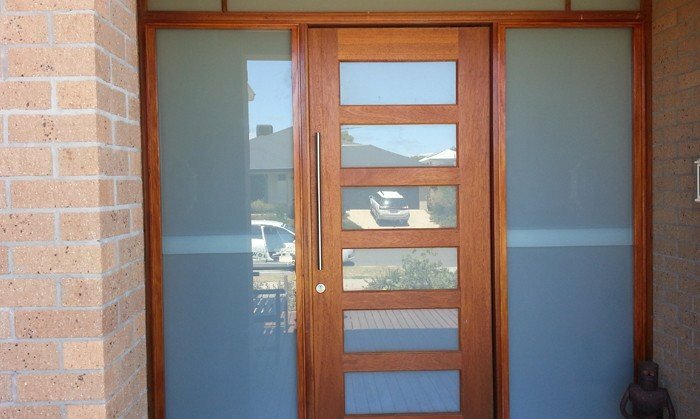 Period doors manufactured to take existing stain glass - Ballarat. 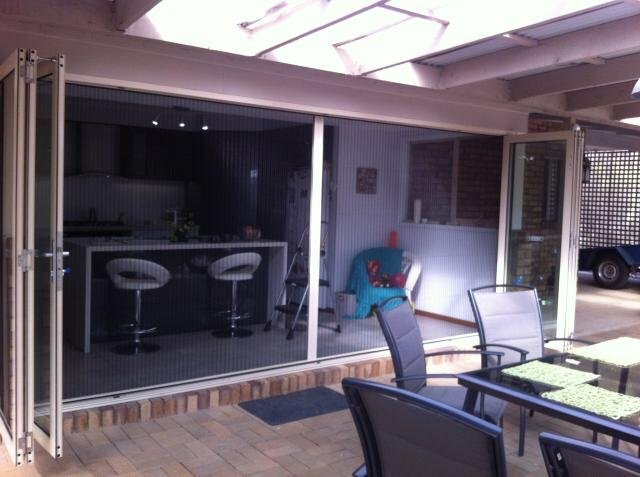 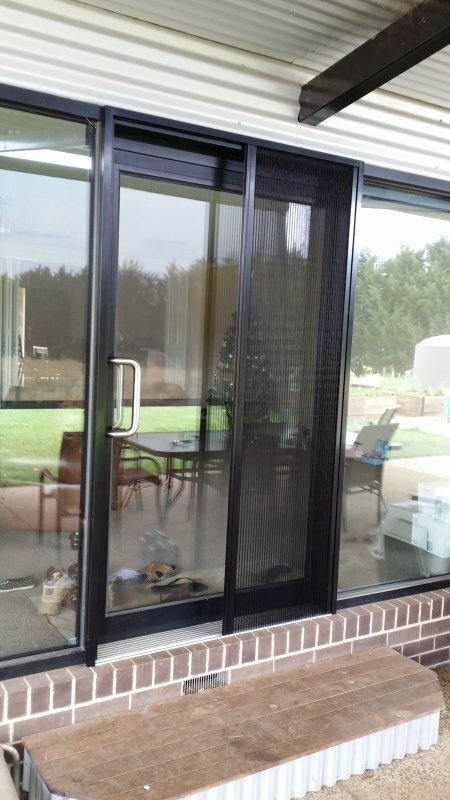 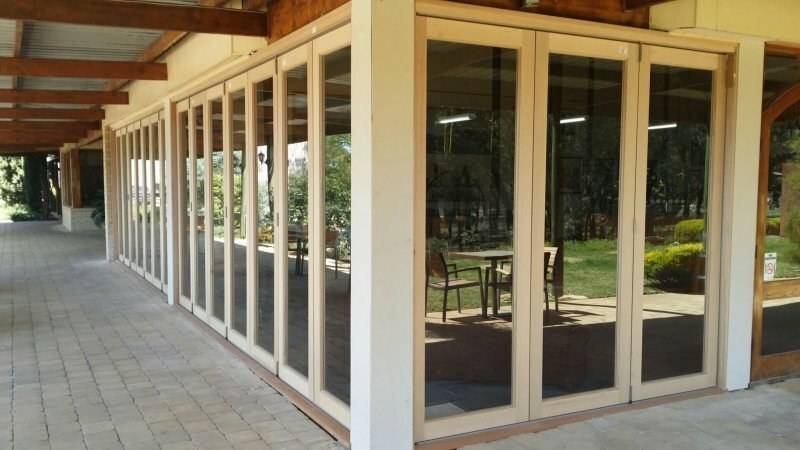 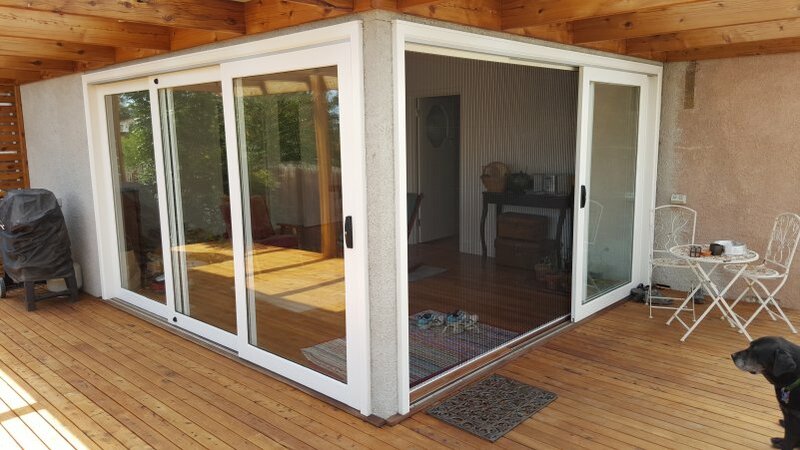 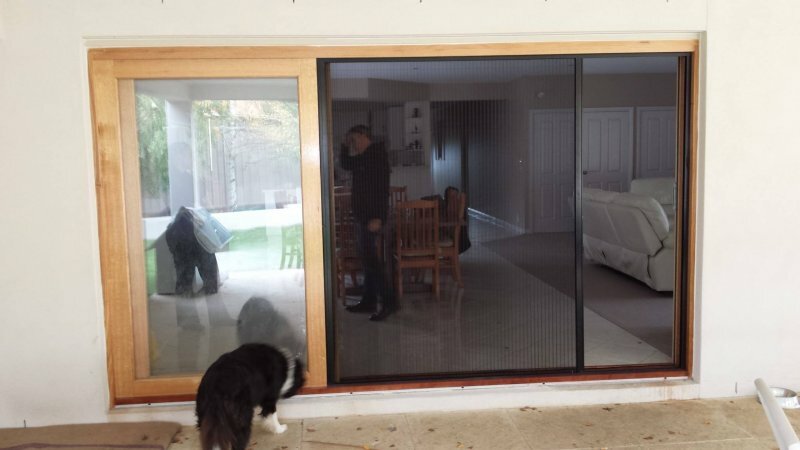 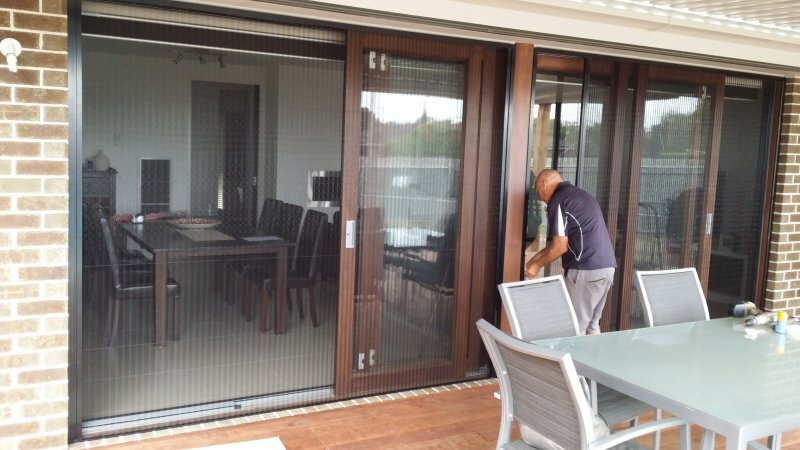 A large Bi-fold Door with a tight fit RETRACTABLE INSECT SCREEN, these clients are now able to utilize there indoor/outdoor area without concern of insects flooding in when cooking or entertaining. 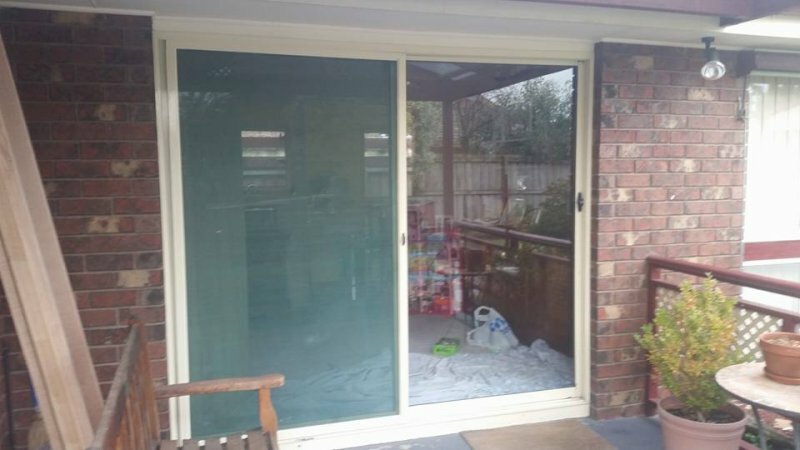 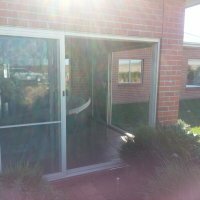 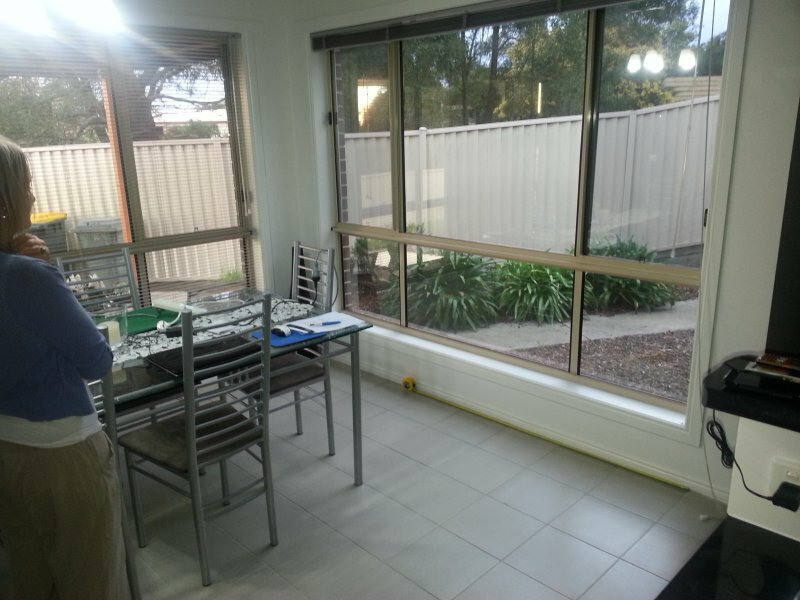 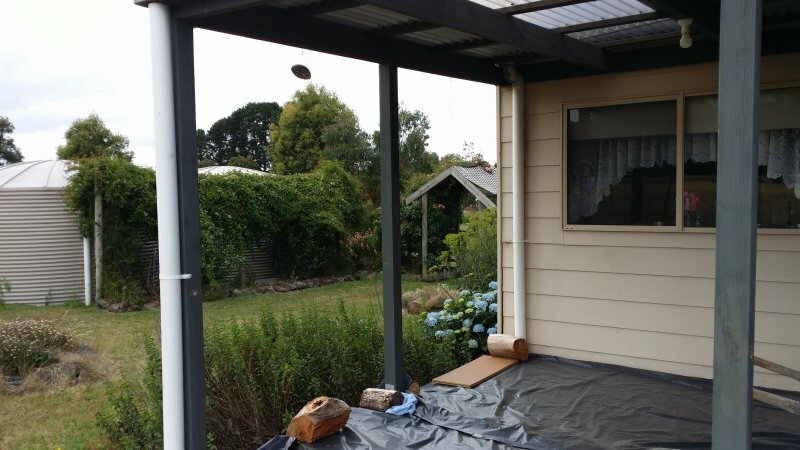 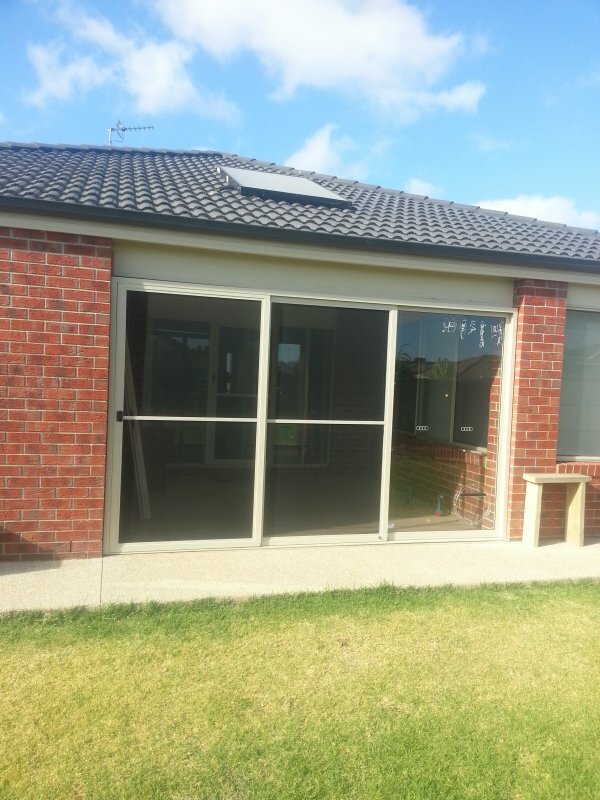 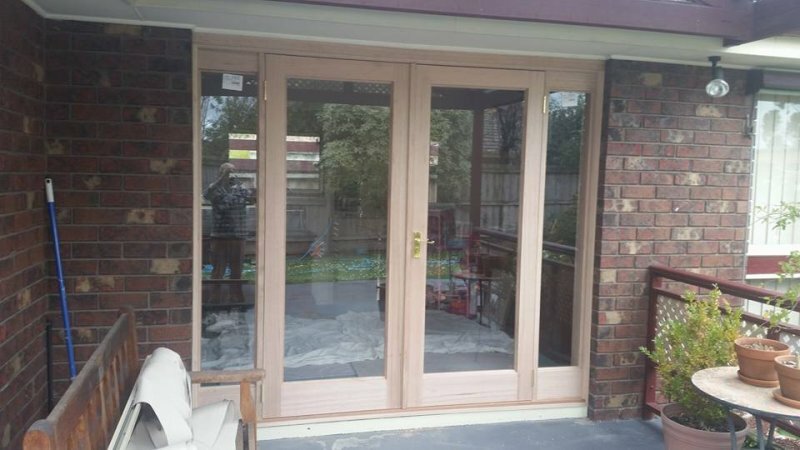 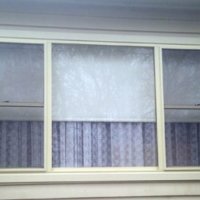 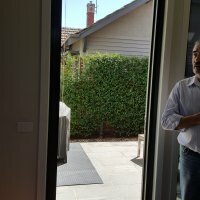 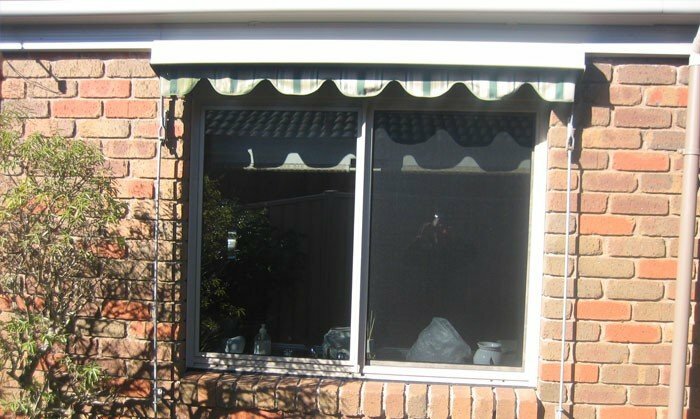 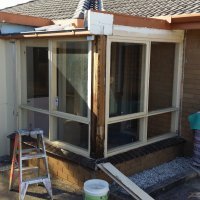 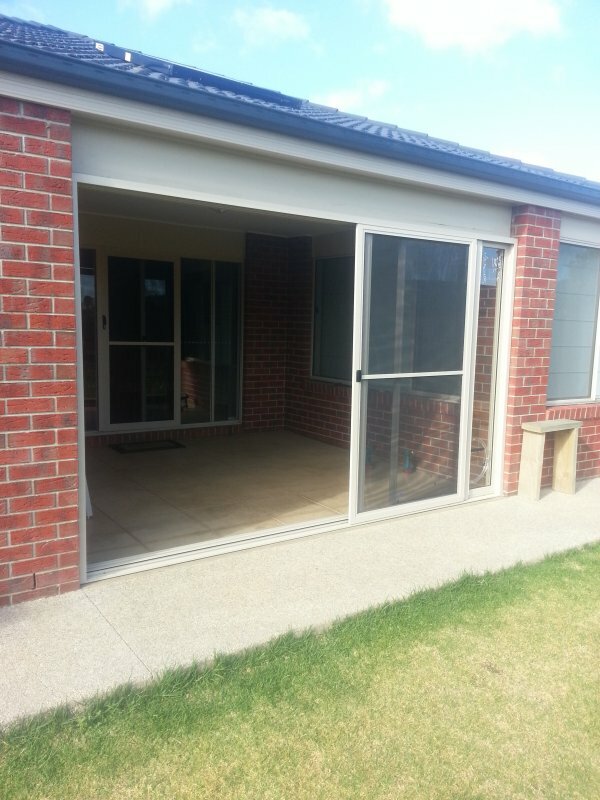 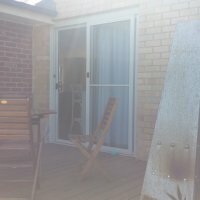 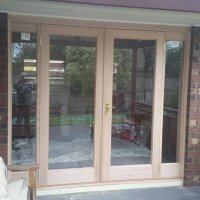 Replacement windows Ballarat- this job involved cutting bricks and making openings to suit new french doors - all french doors were fitted with our Retractable insect screens Ballarat. 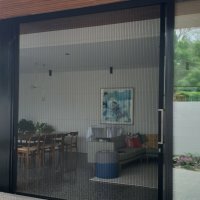 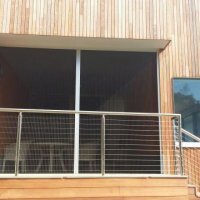 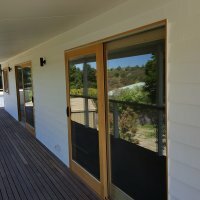 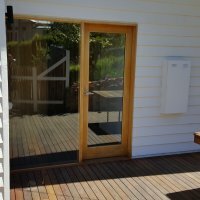 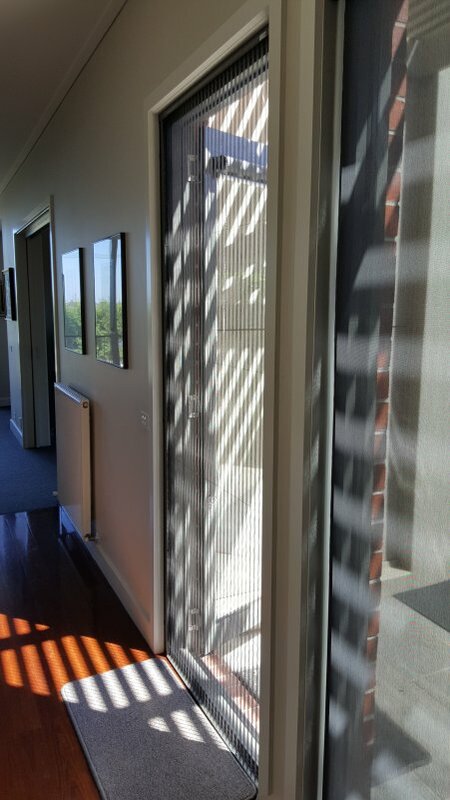 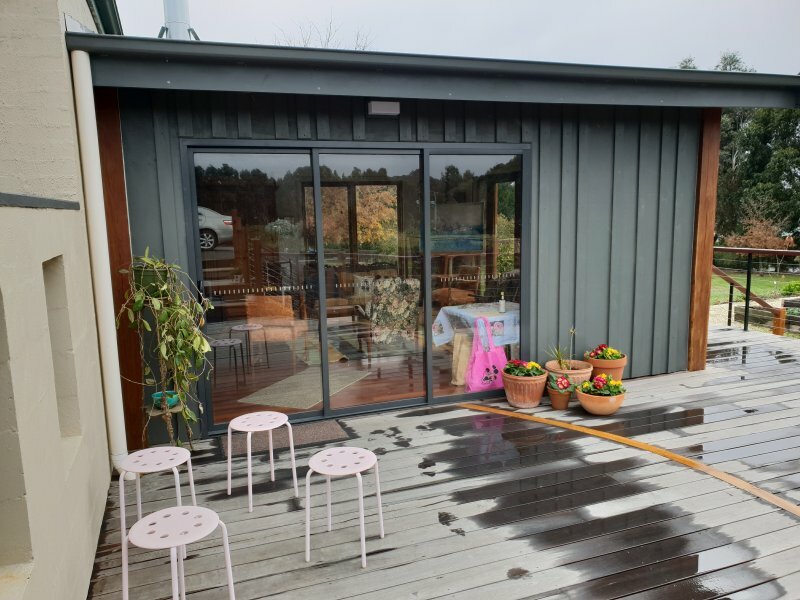 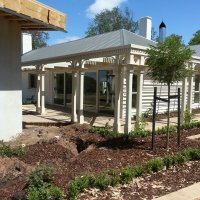 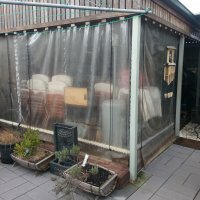 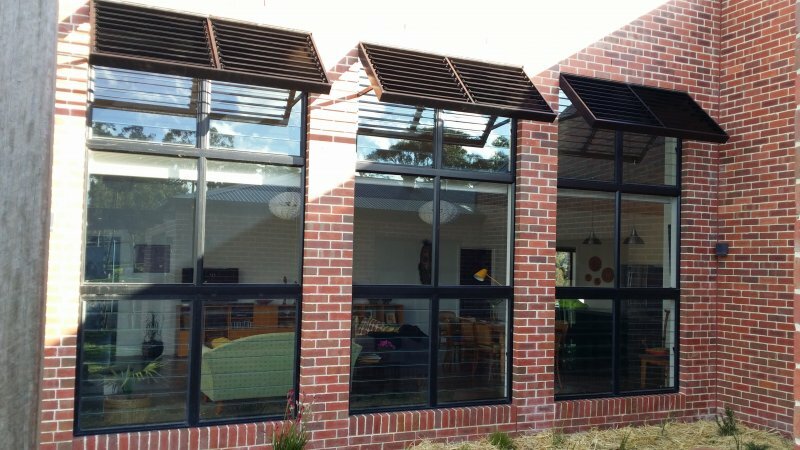 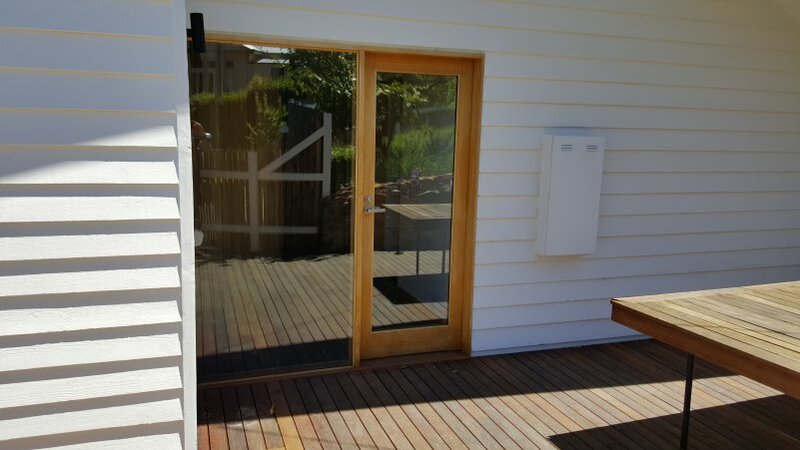 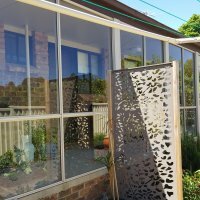 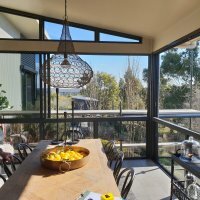 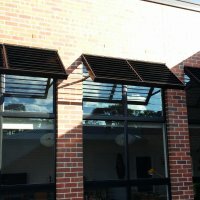 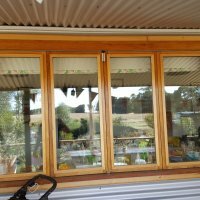 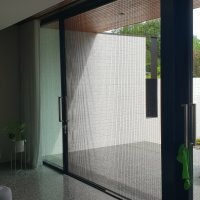 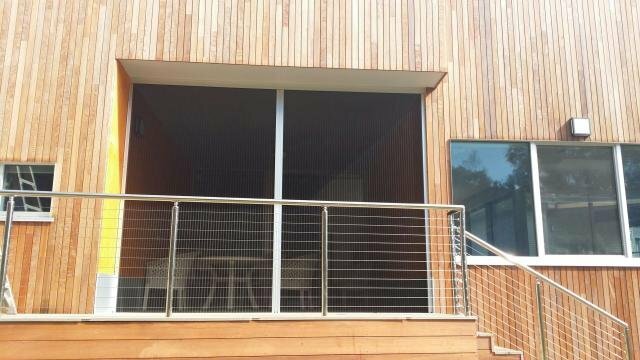 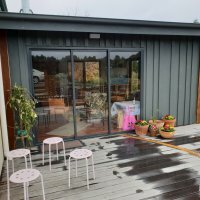 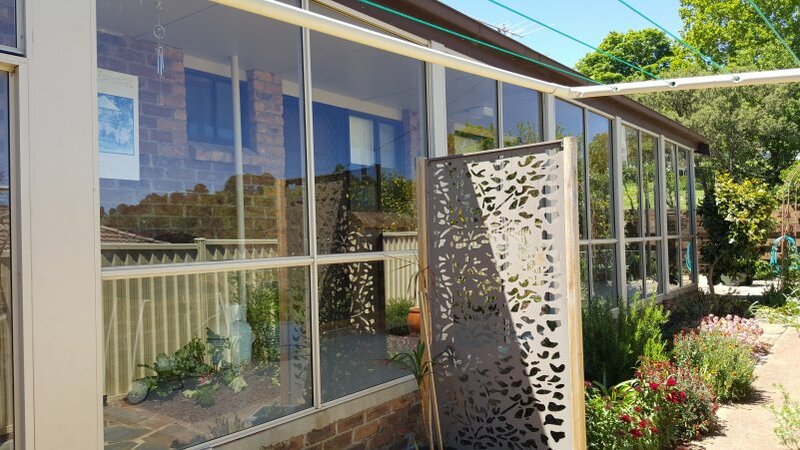 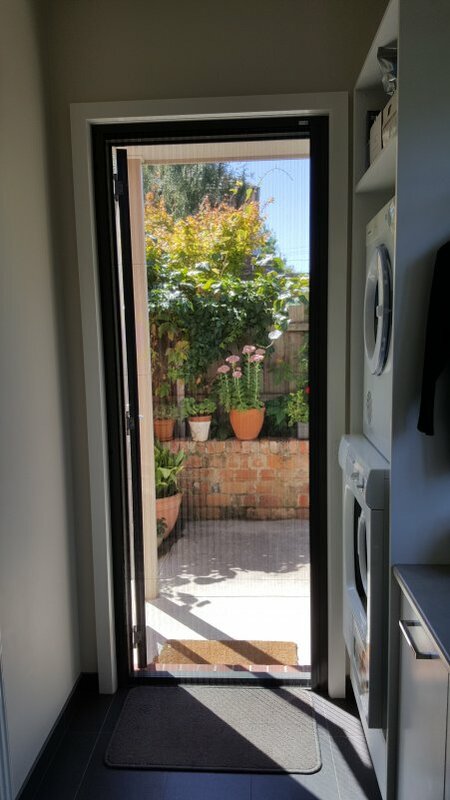 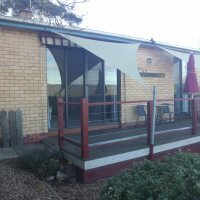 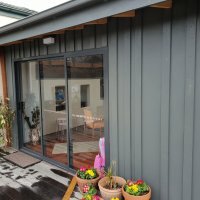 Retractable insect screen Daylesford – This off-set screen allows one door to be used as an access door more easily than the traditional retractable flyscreens that are divided in the middle. 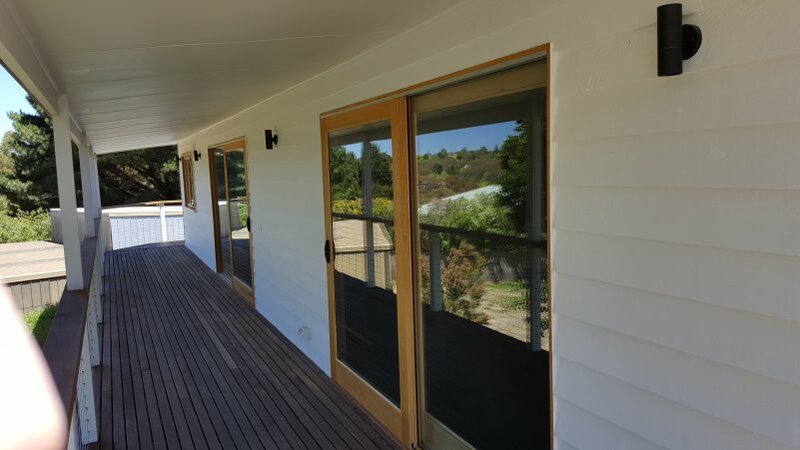 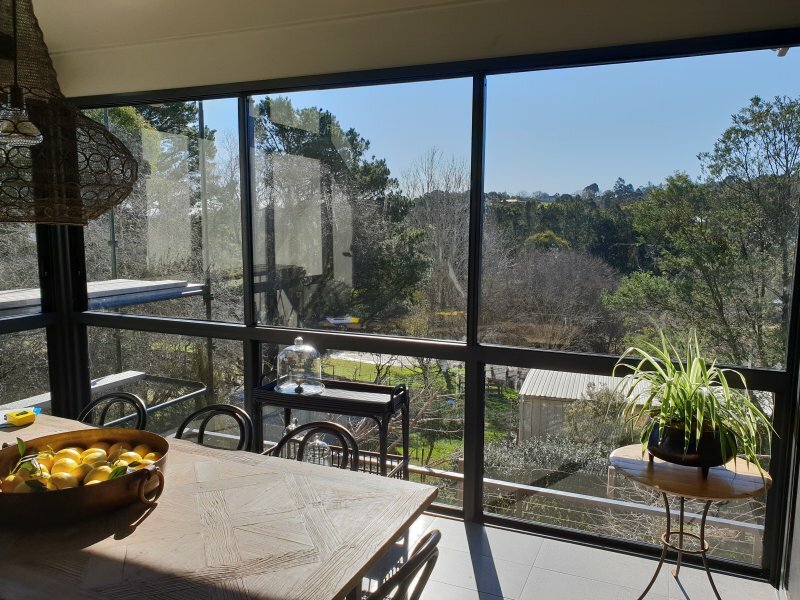 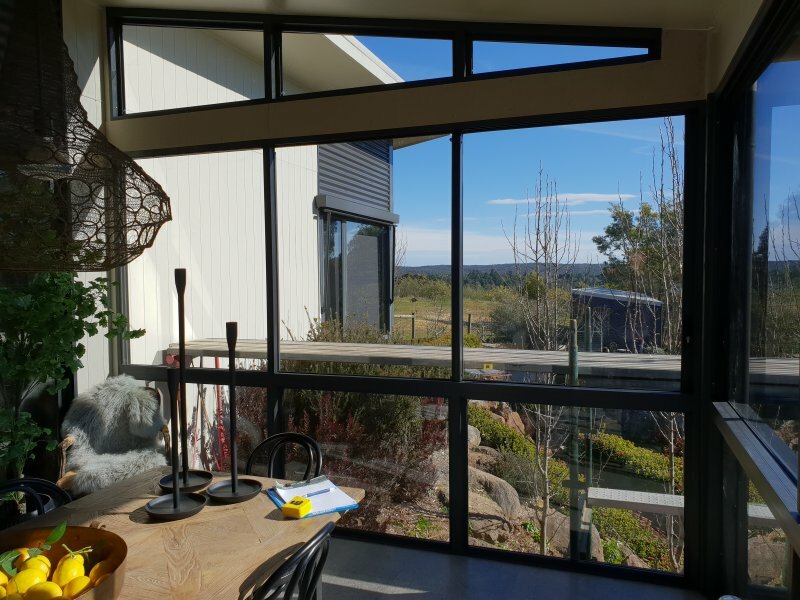 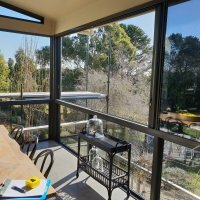 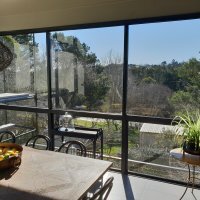 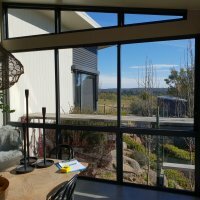 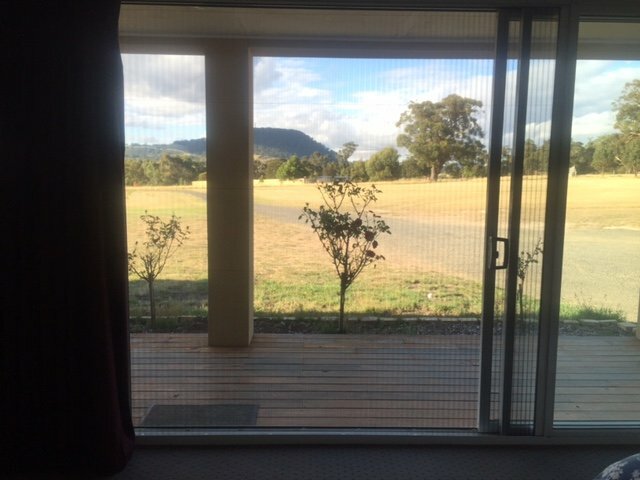 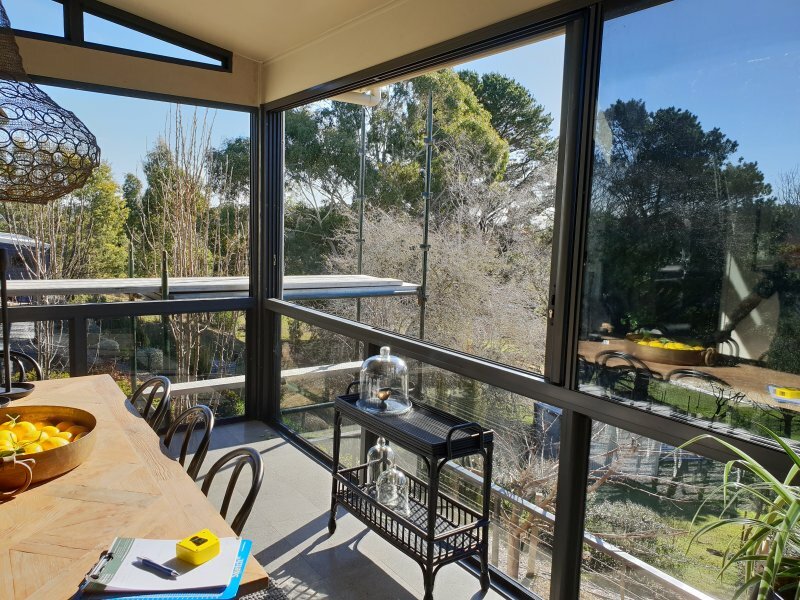 This screen fitted in Daylesford was perfect for capitalizing on the breeze as they were high up and still capture the bushland view without the annoyance of insects and bugs coming inside – tight fit mesh retractable insect screen used. 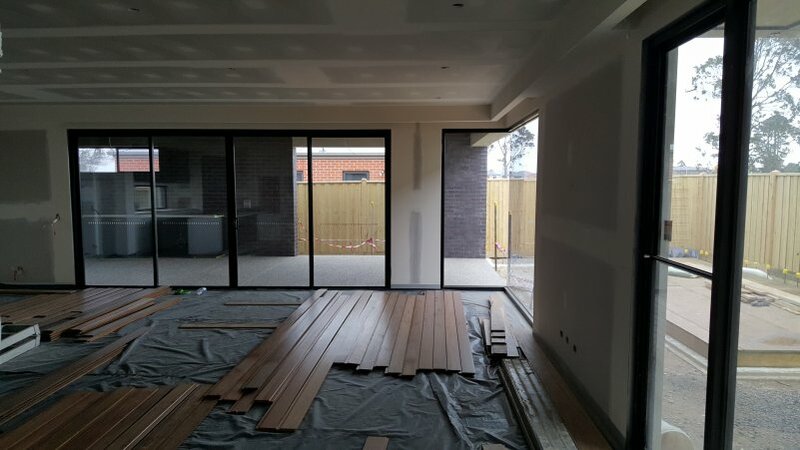 Colour black which seems to blend well with stained timber. 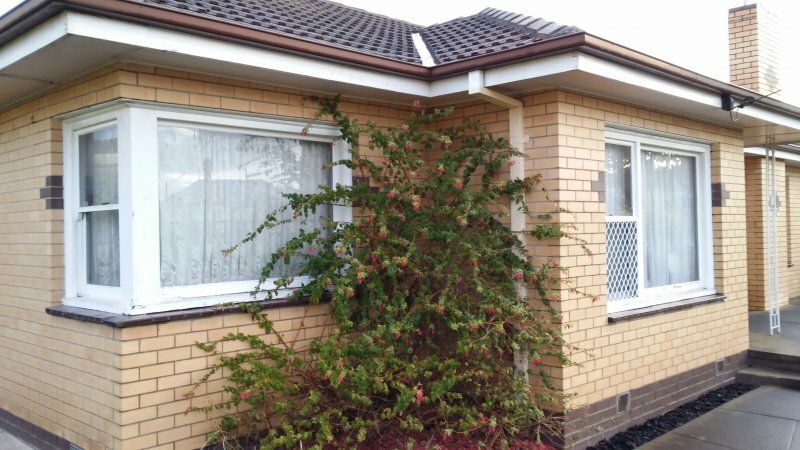 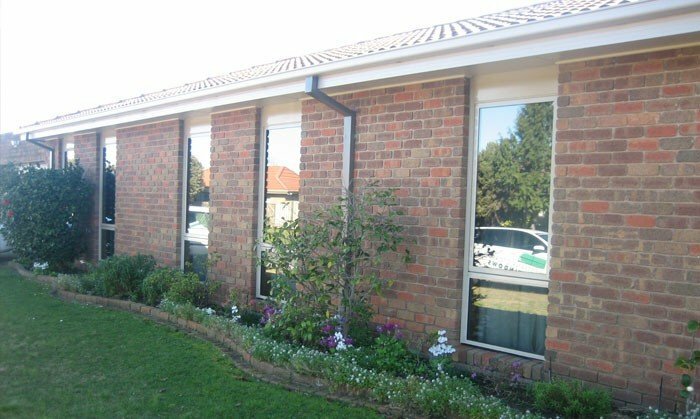 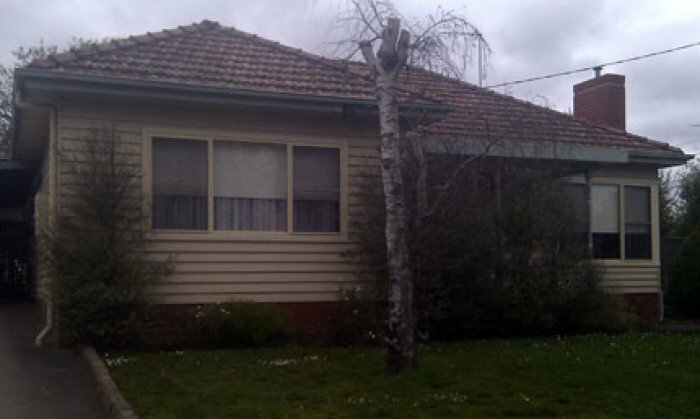 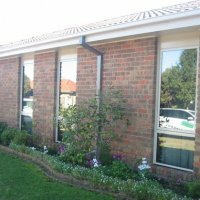 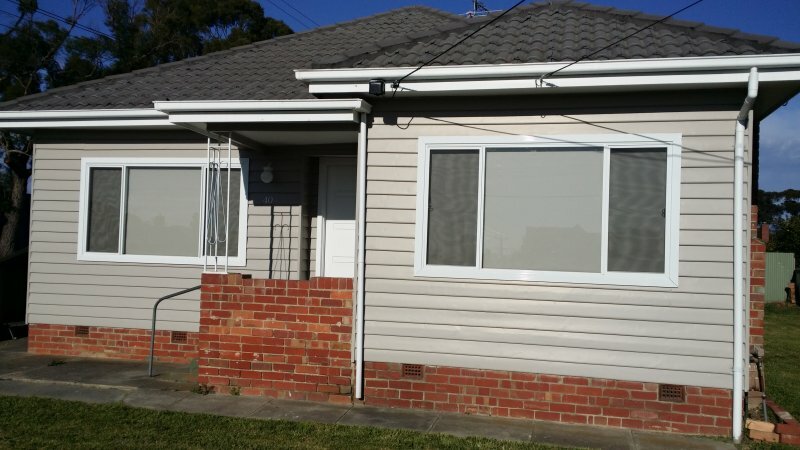 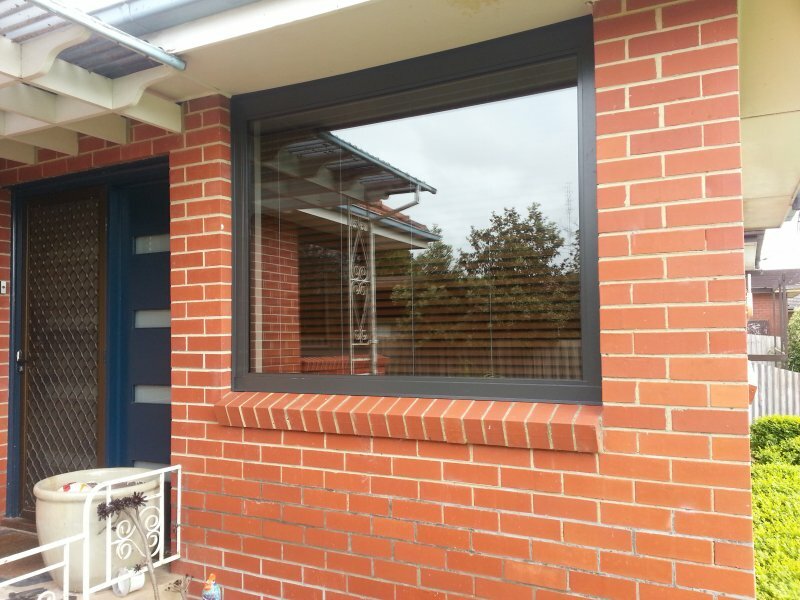 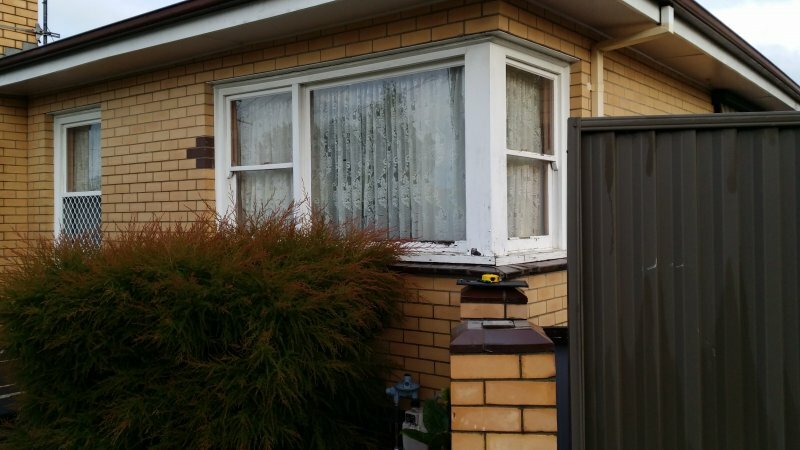 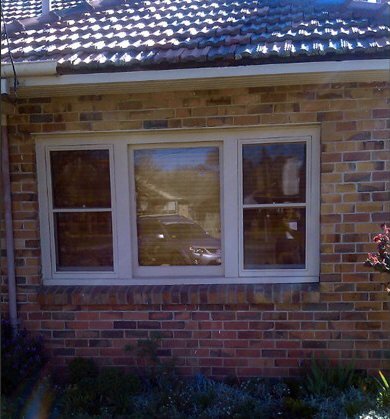 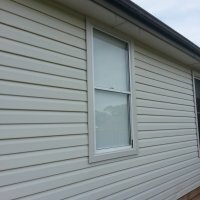 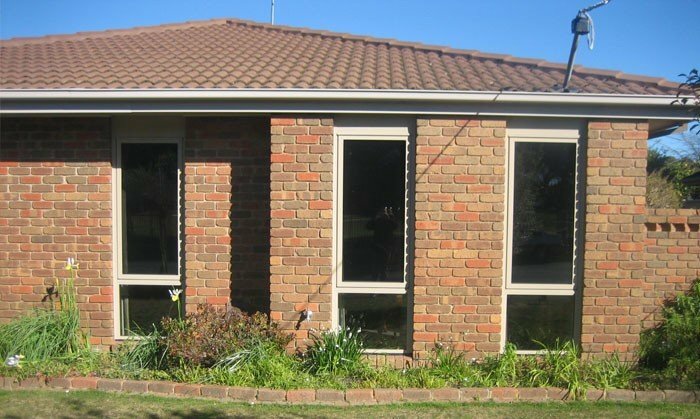 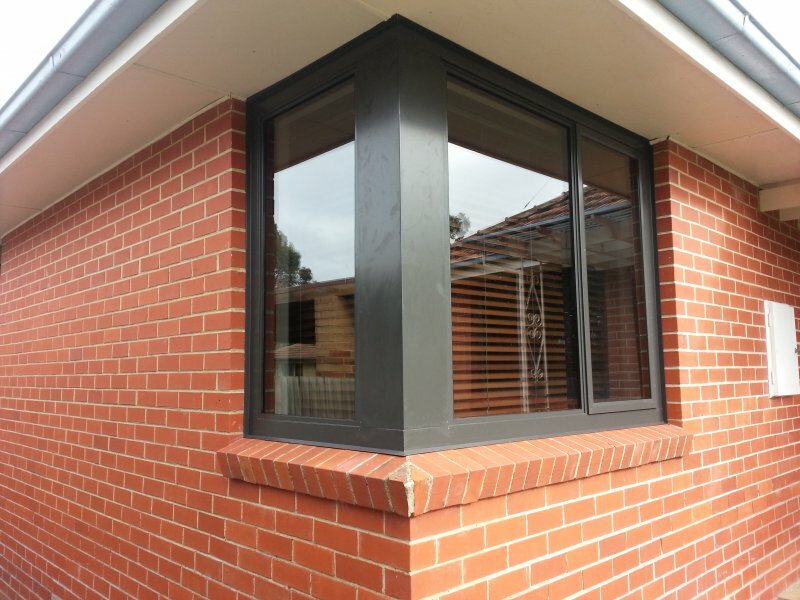 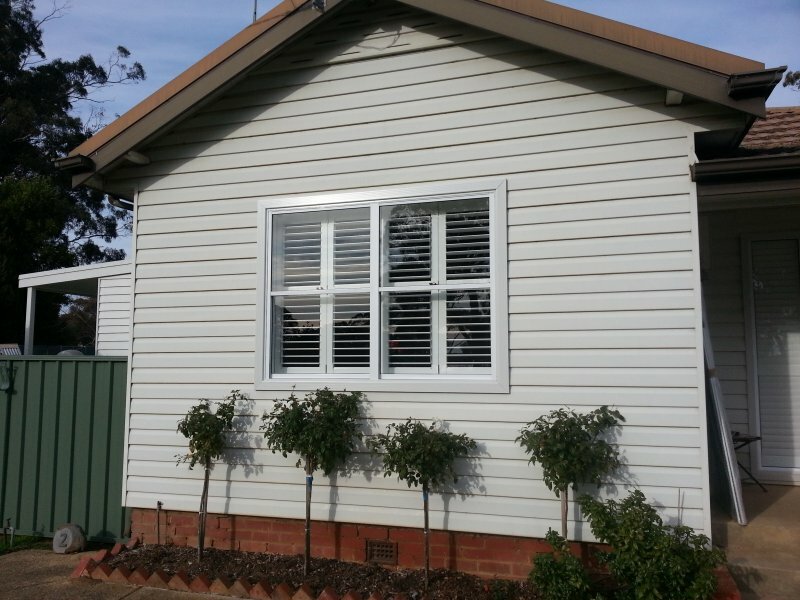 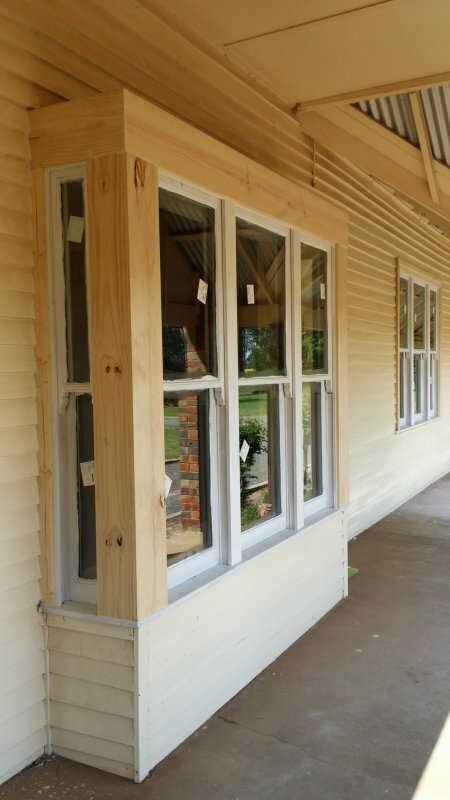 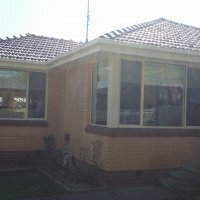 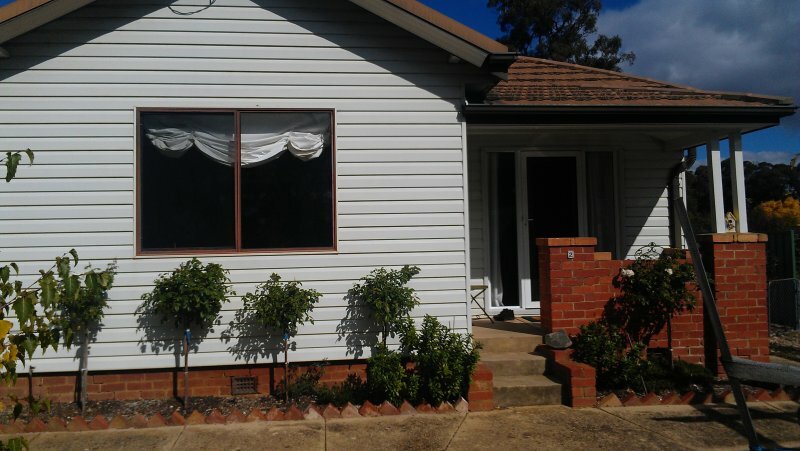 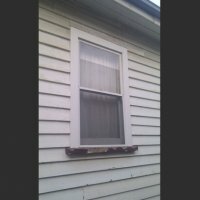 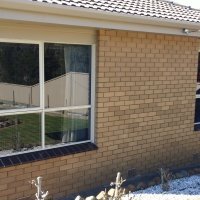 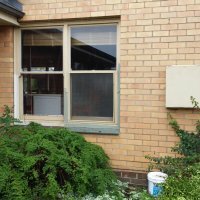 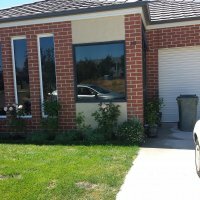 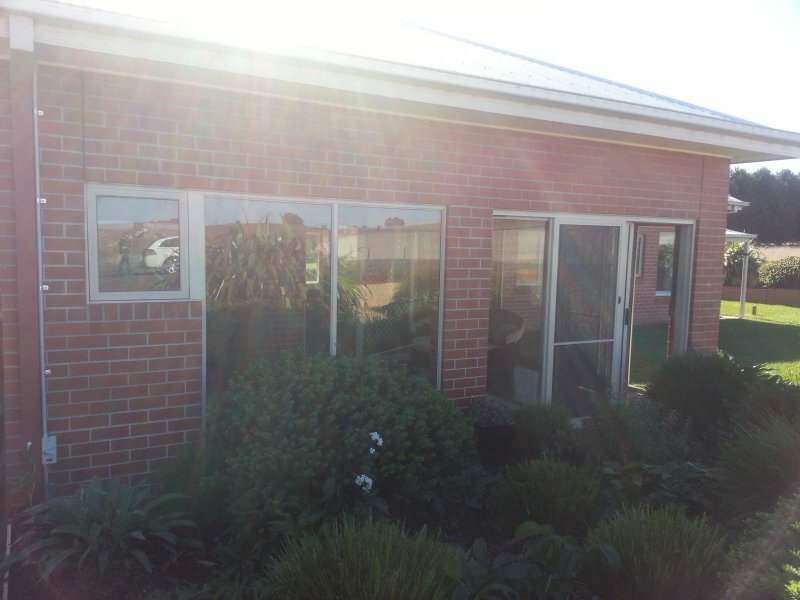 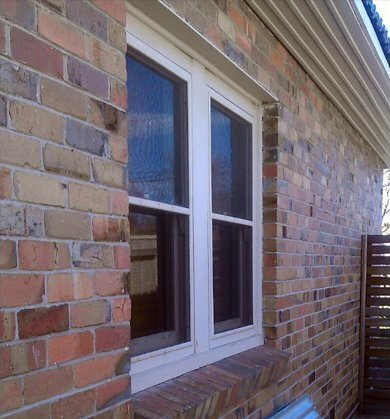 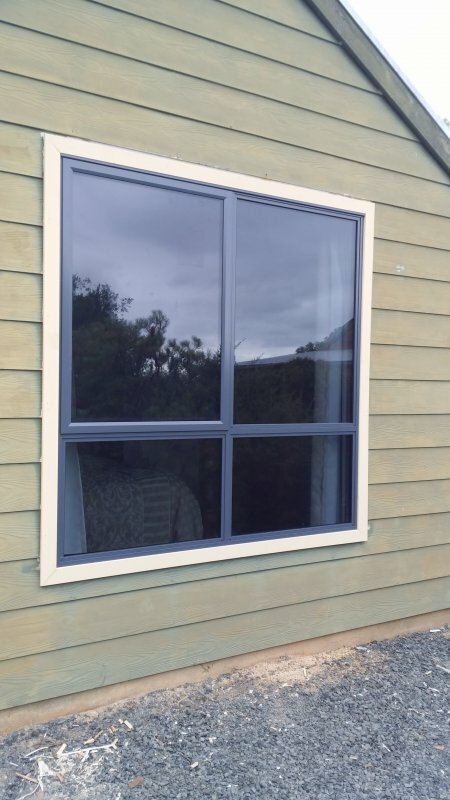 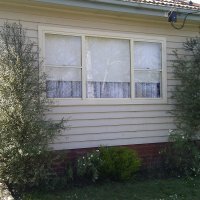 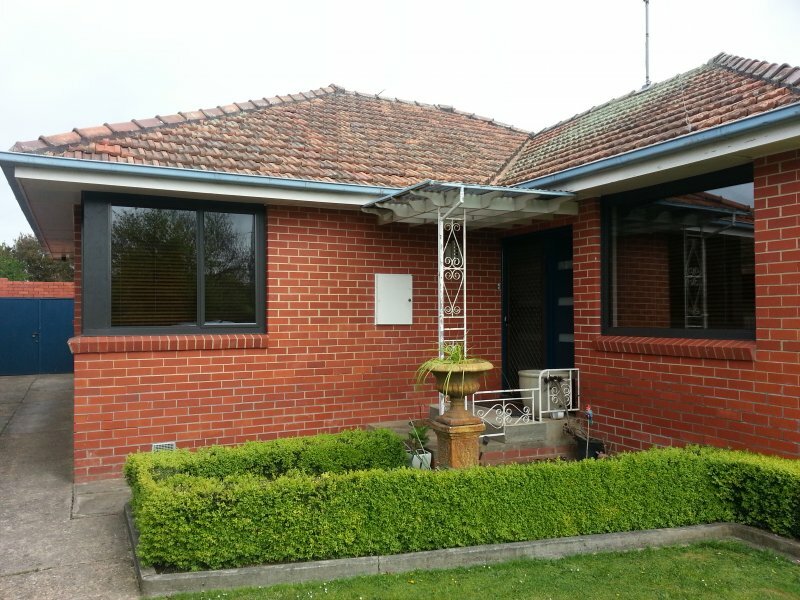 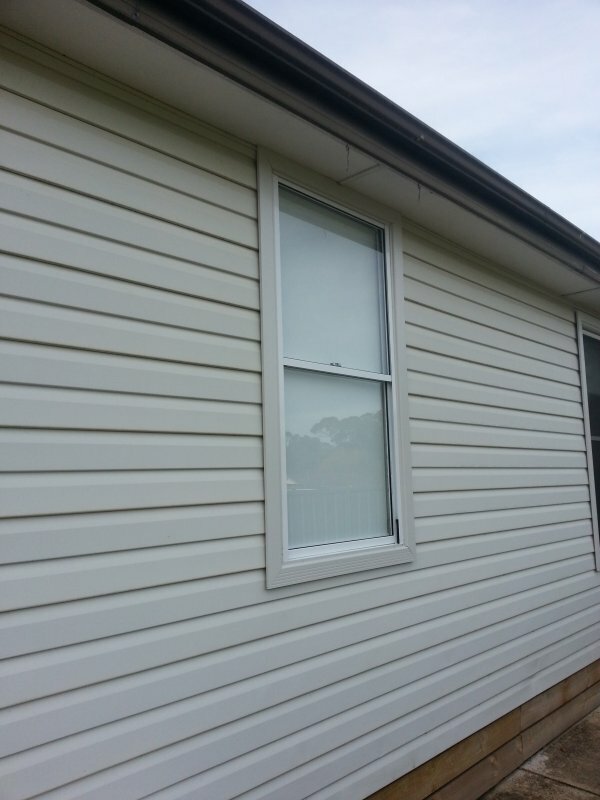 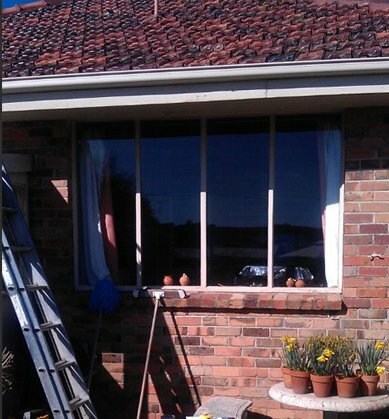 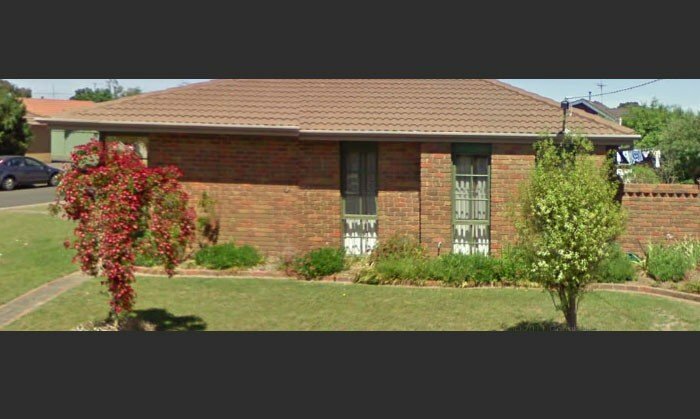 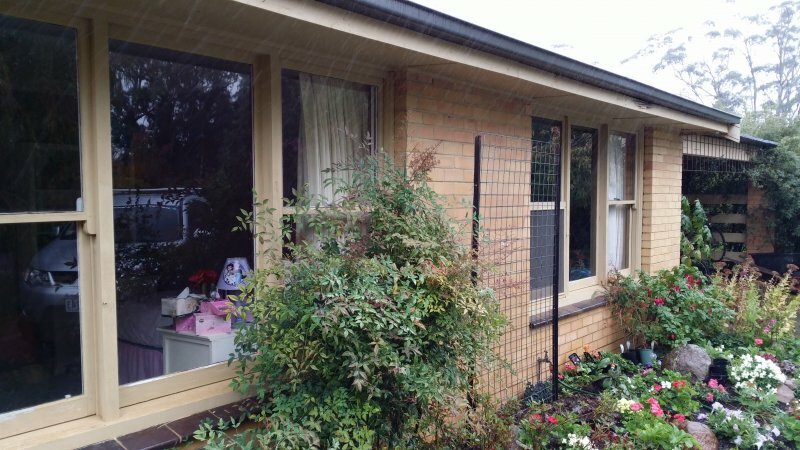 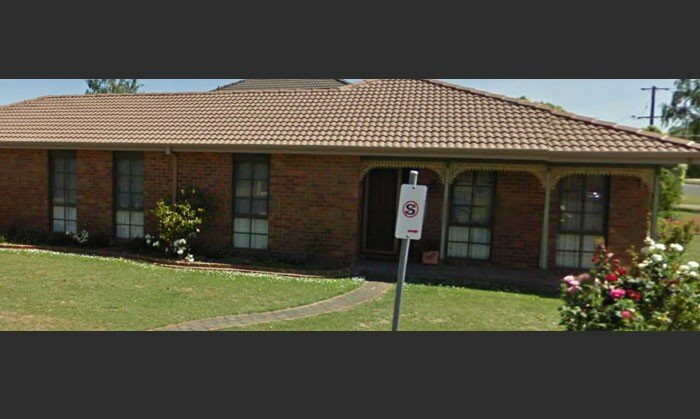 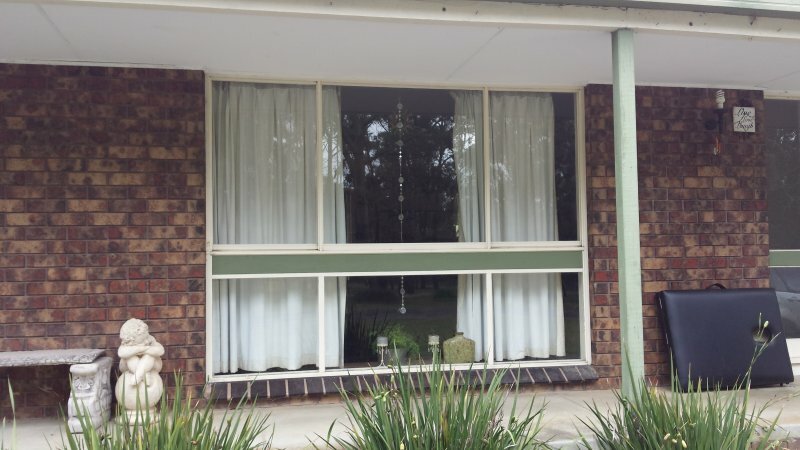 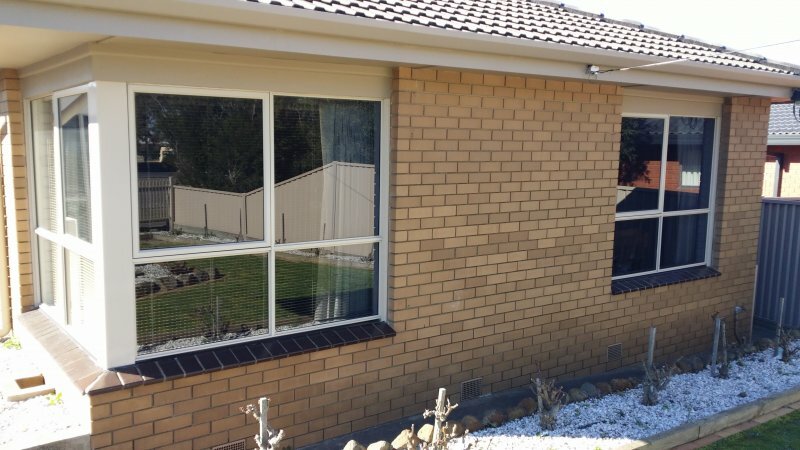 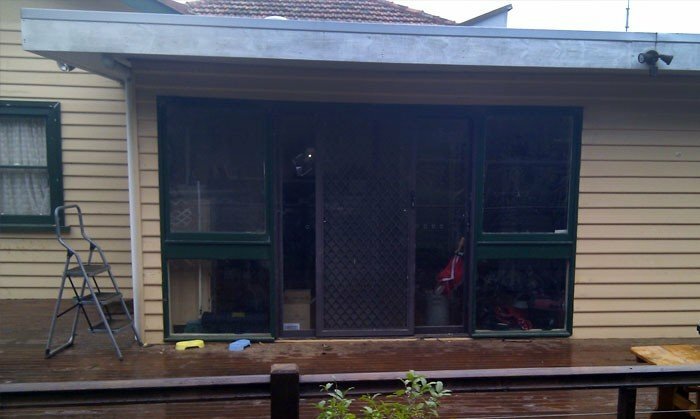 Window replacement Ballarat - Aluminium Double Hung Windows with External Architrave. 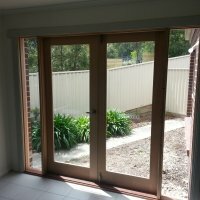 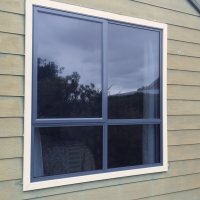 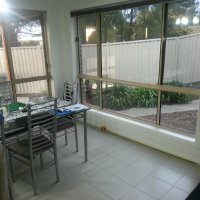 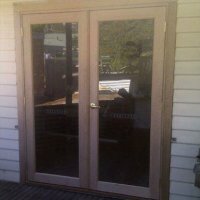 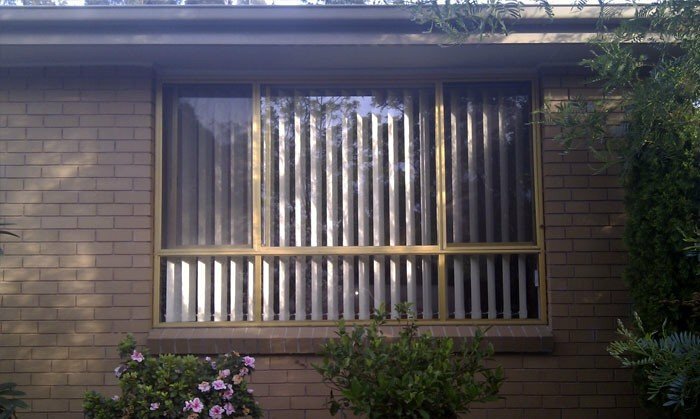 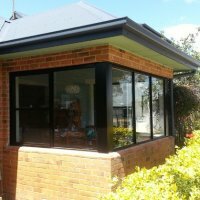 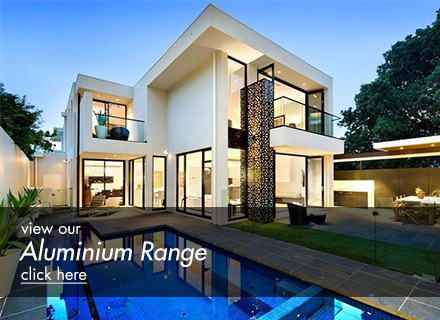 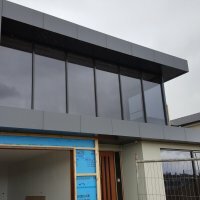 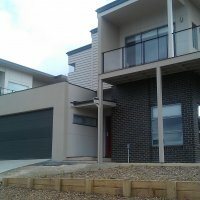 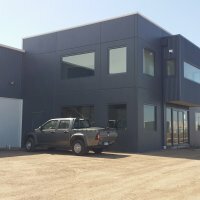 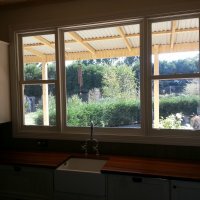 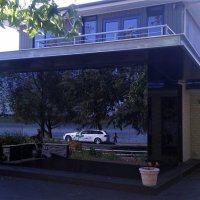 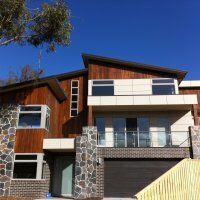 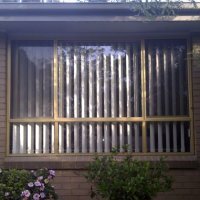 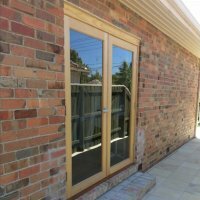 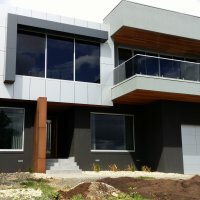 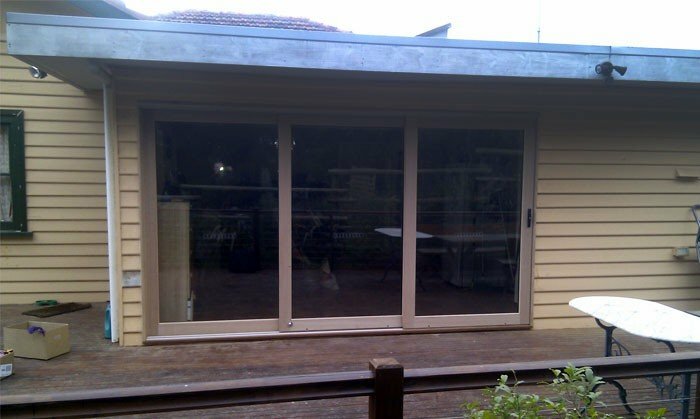 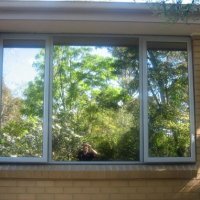 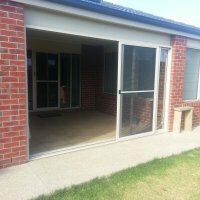 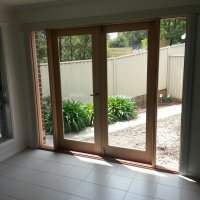 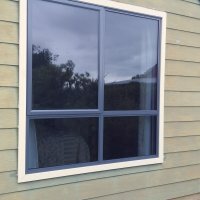 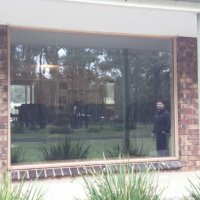 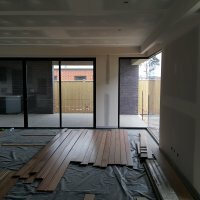 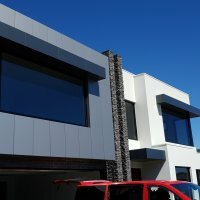 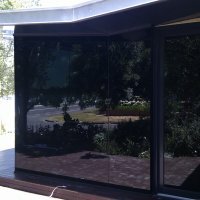 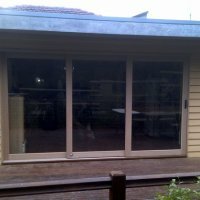 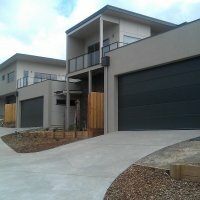 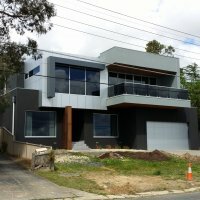 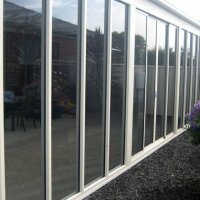 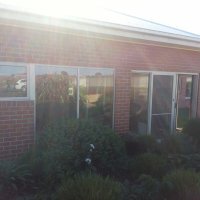 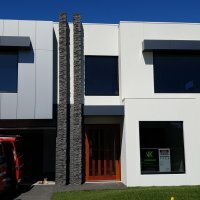 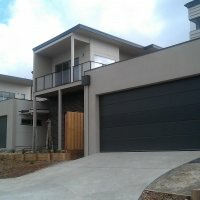 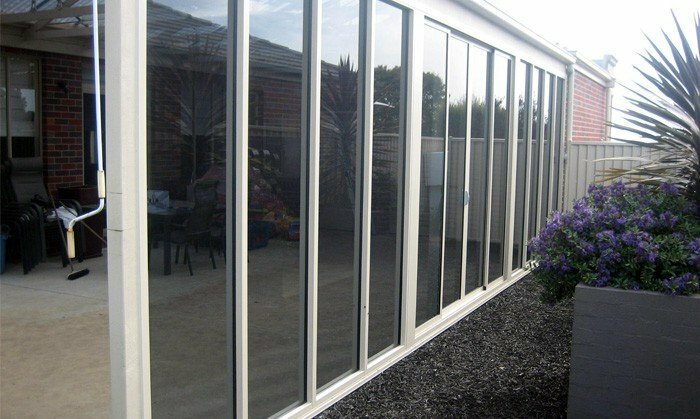 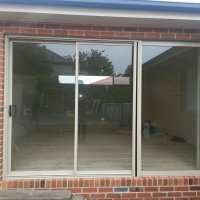 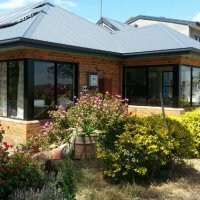 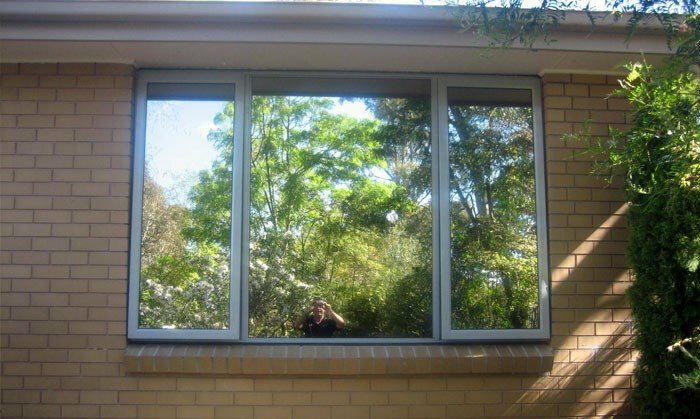 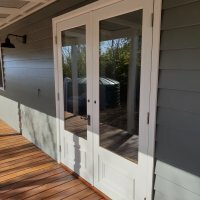 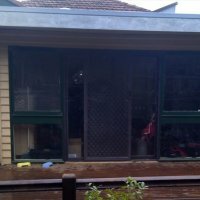 Aluminium Windows and Doors in Geelong. 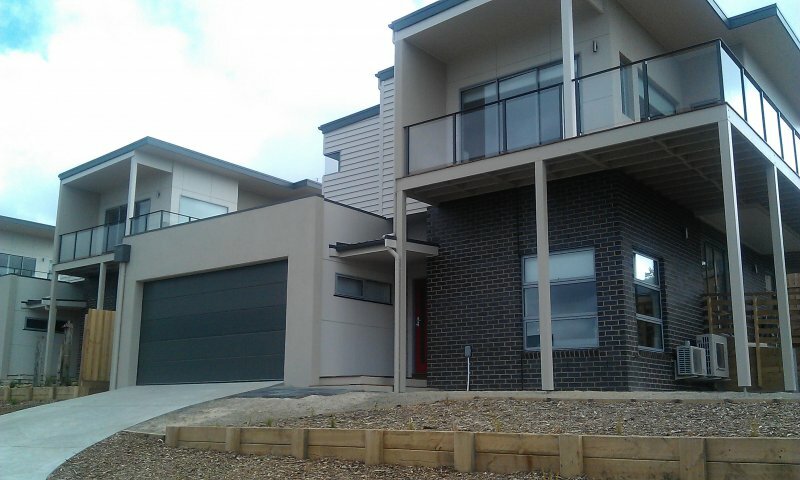 Townhouse Development. 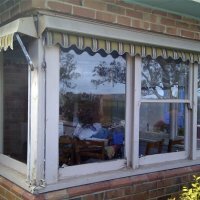 Servicing every week Kyneton Woodend Daylesford Avoca Creswick Daylesford Clunes Gisborne Bacchus Marsh Colac Maryborough Ararat Beaufort.